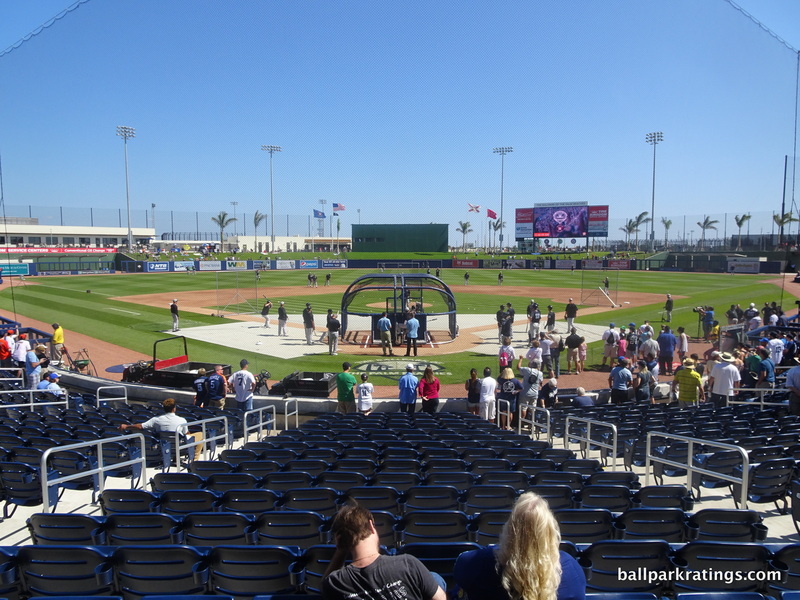 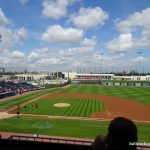 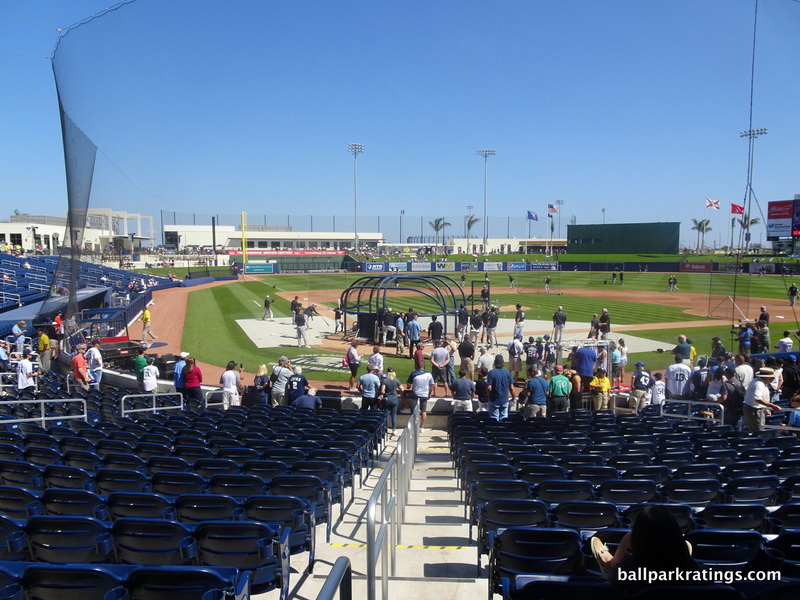 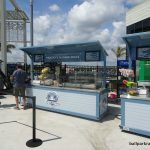 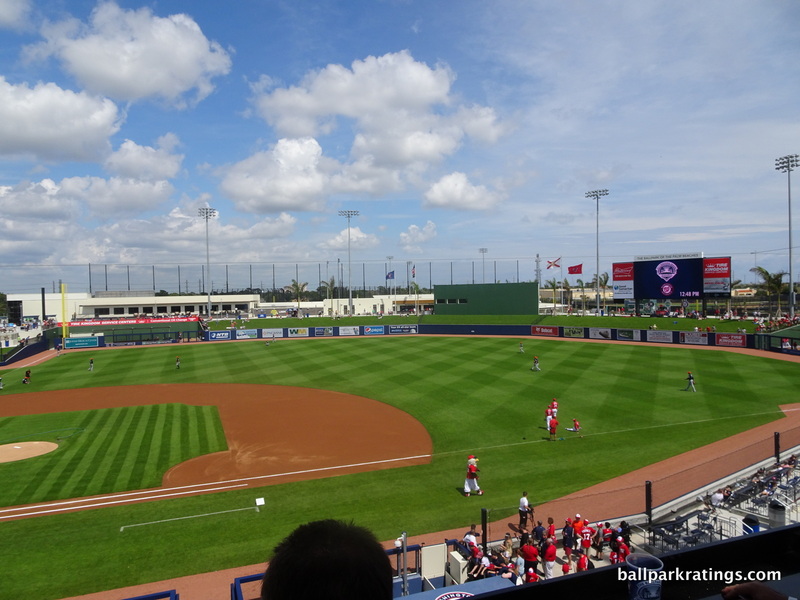 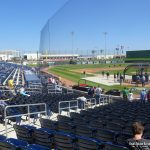 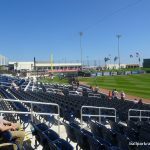 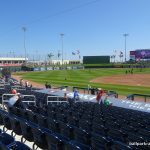 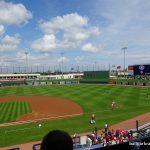 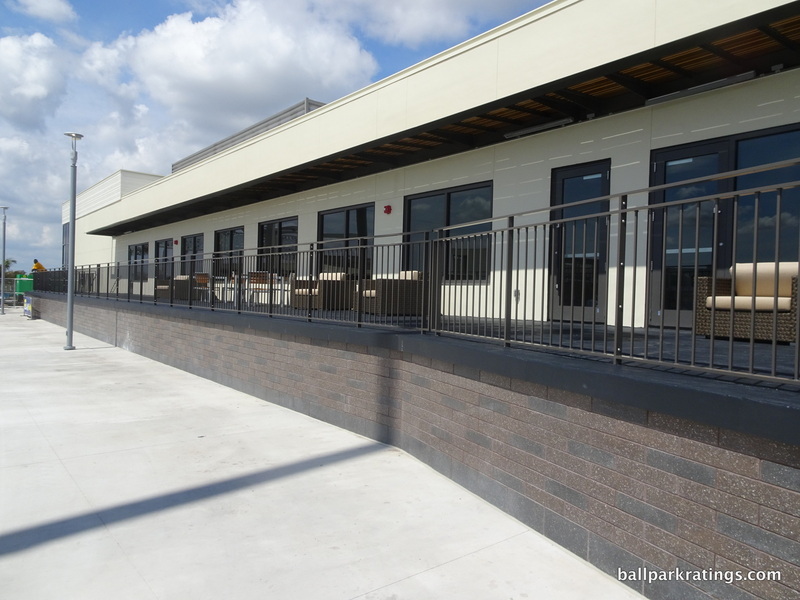 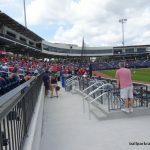 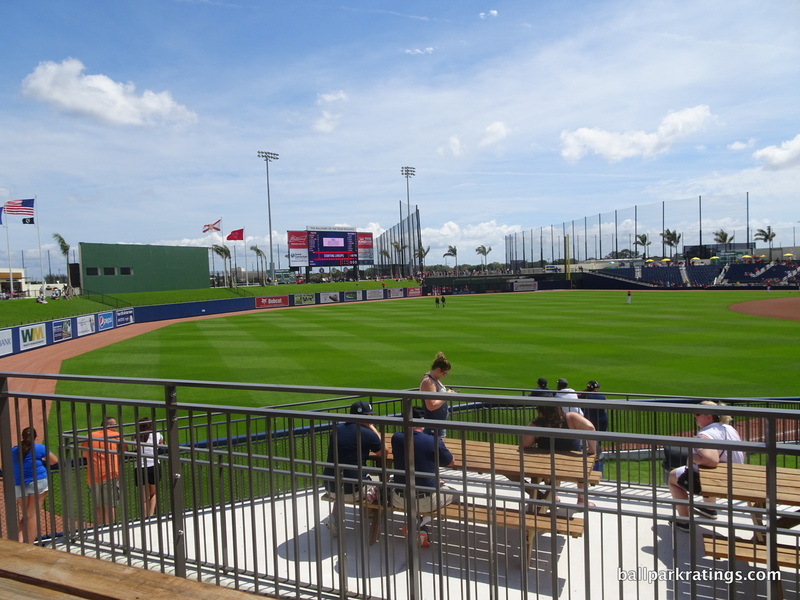 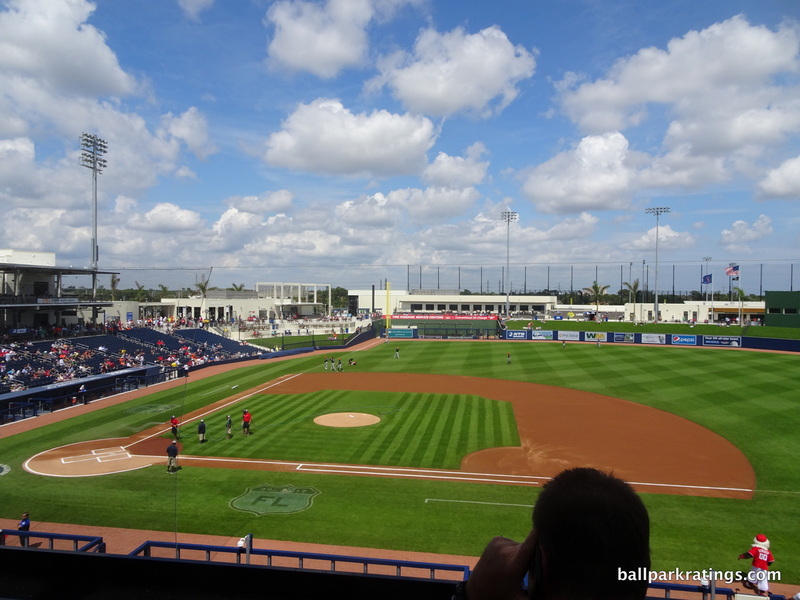 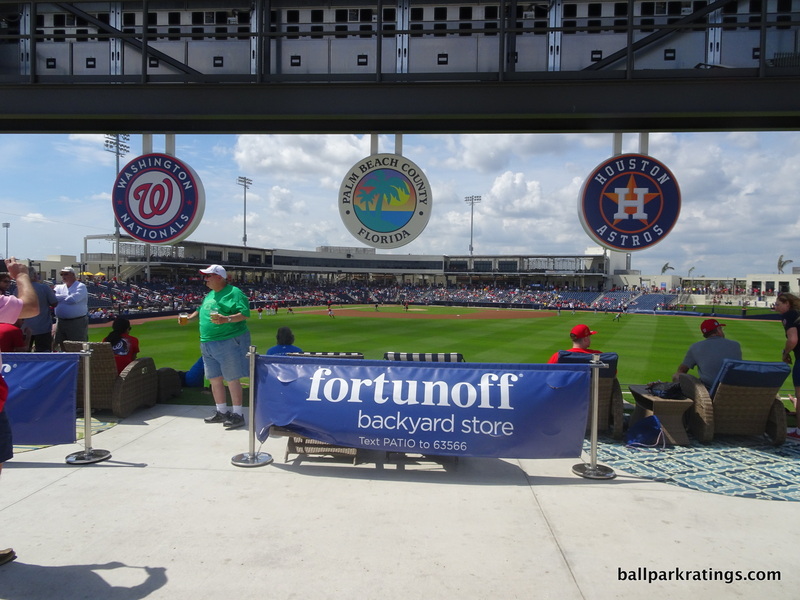 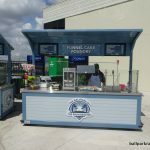 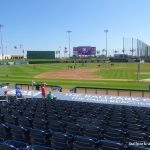 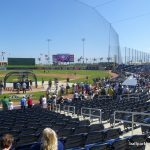 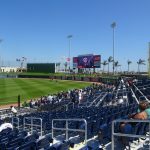 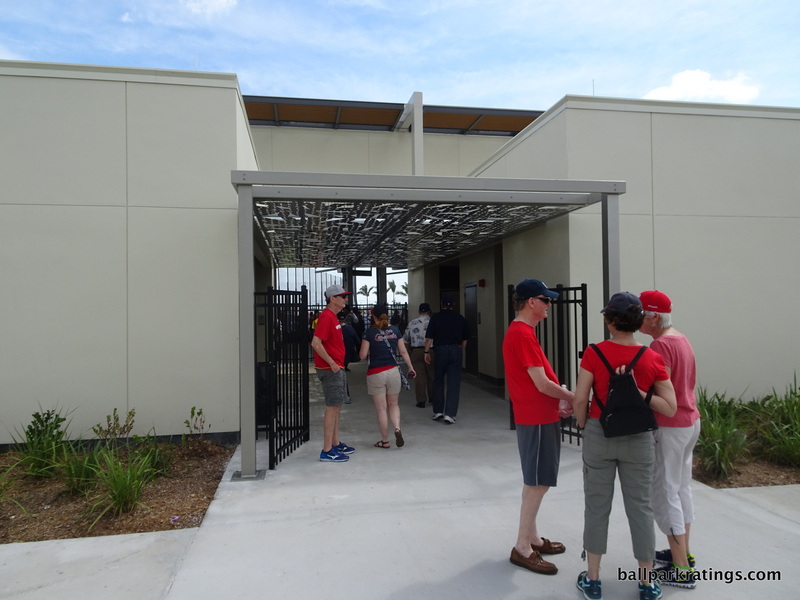 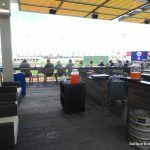 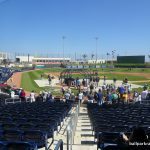 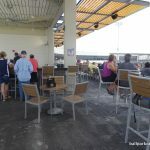 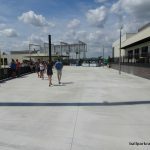 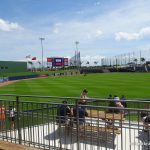 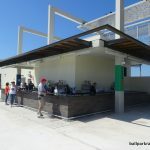 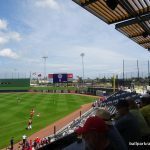 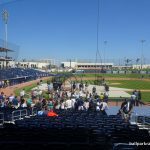 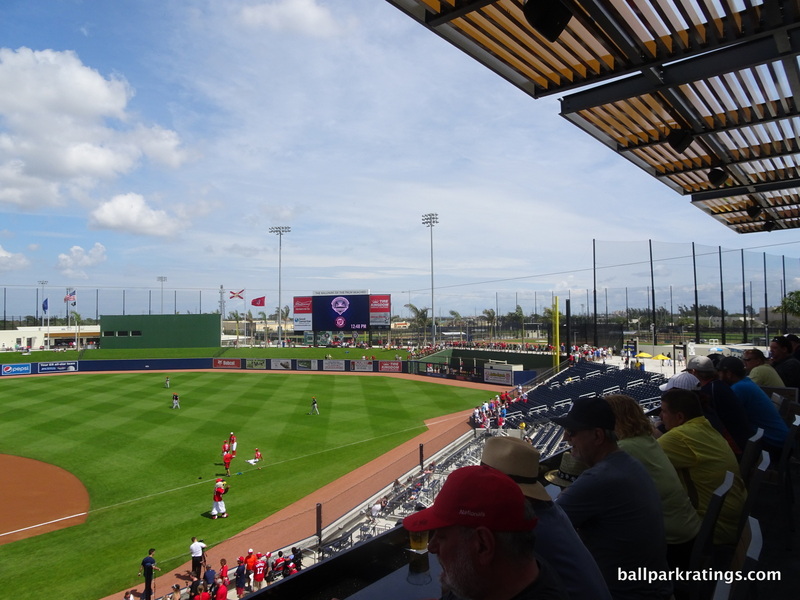 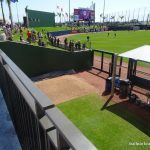 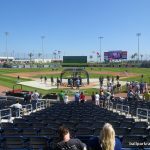 Opening on the heels of two new industry leading ballparks in Arizona and a handful of sparkling renovation projects in Florida, not to mention the impressive new Fenway Park junior in Ft. Myers, the Ballpark of the Palm Beaches was sky-high in my expectations. 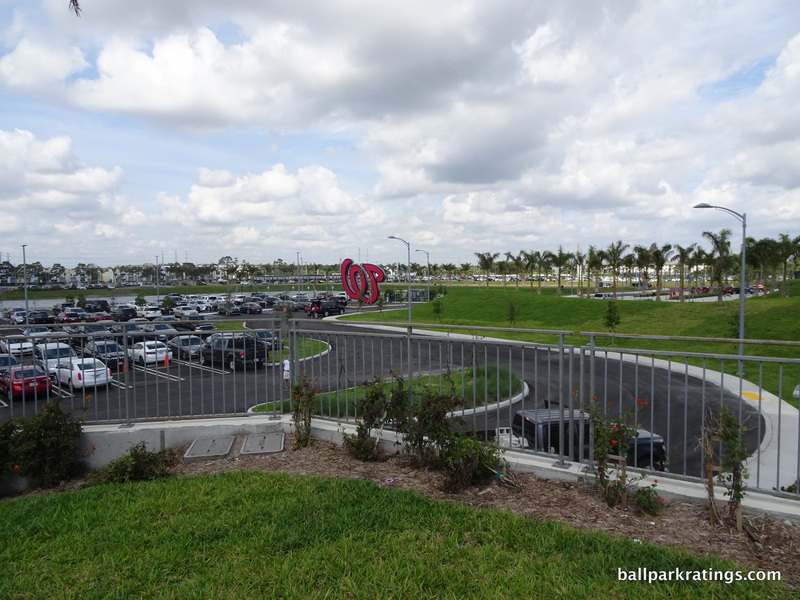 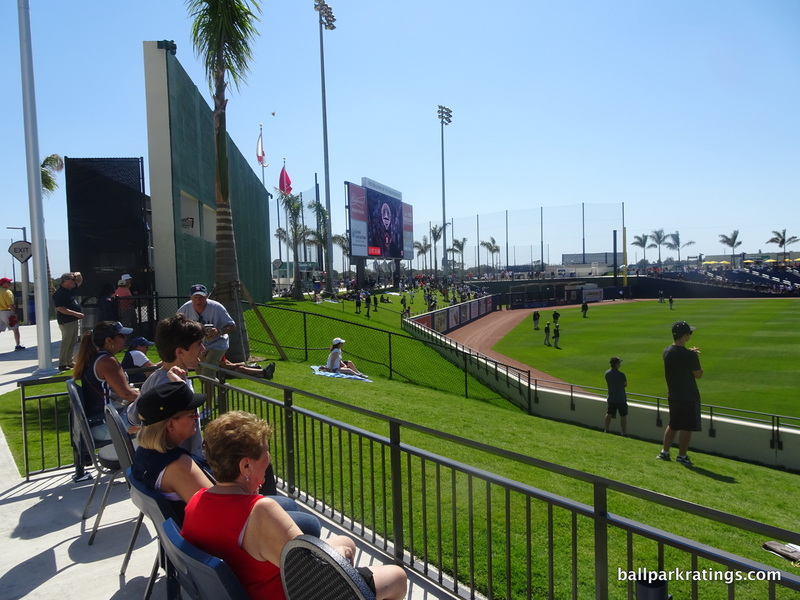 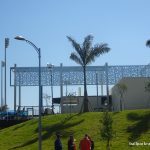 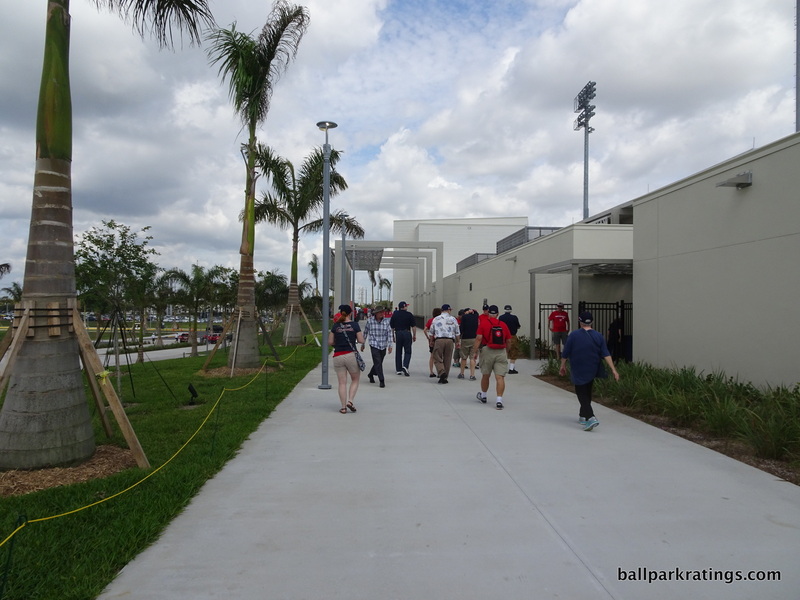 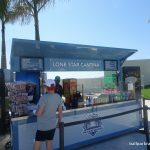 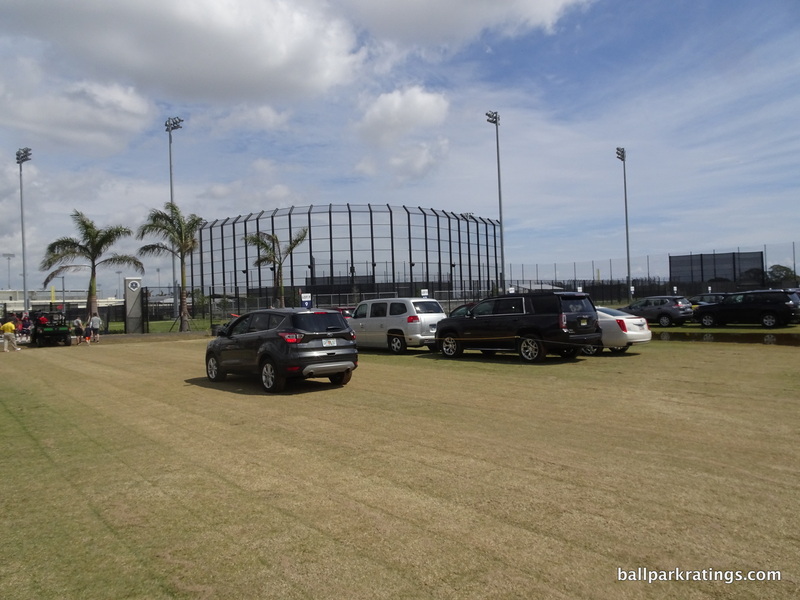 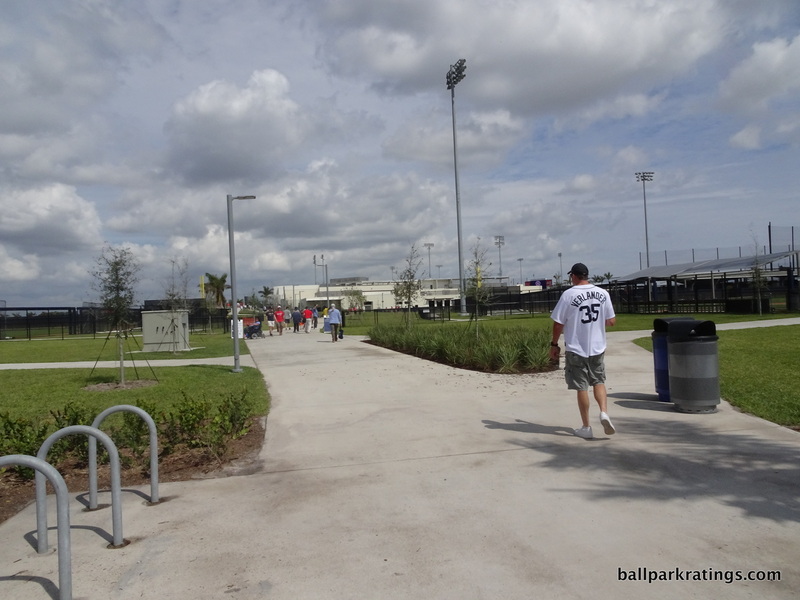 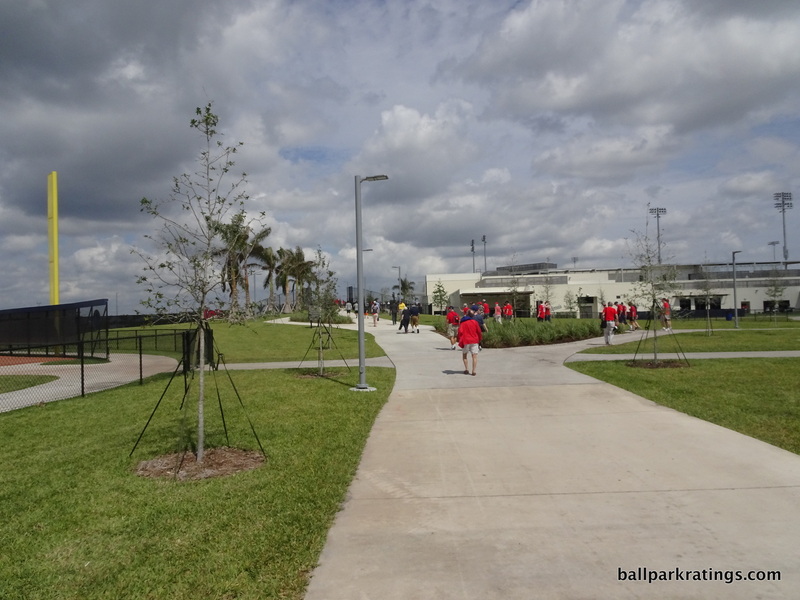 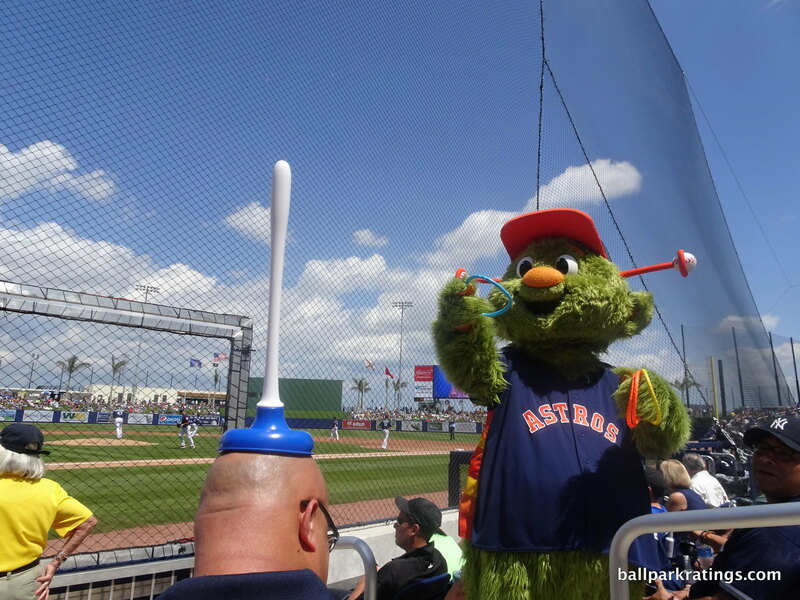 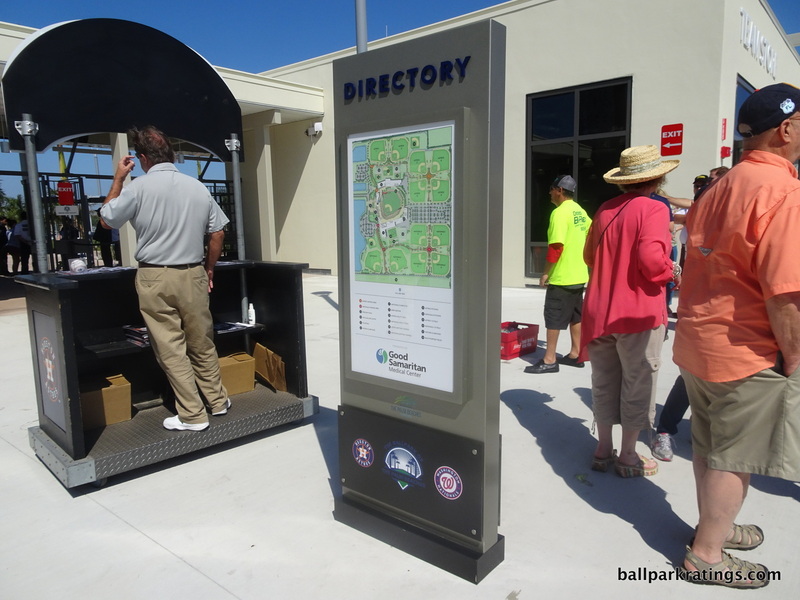 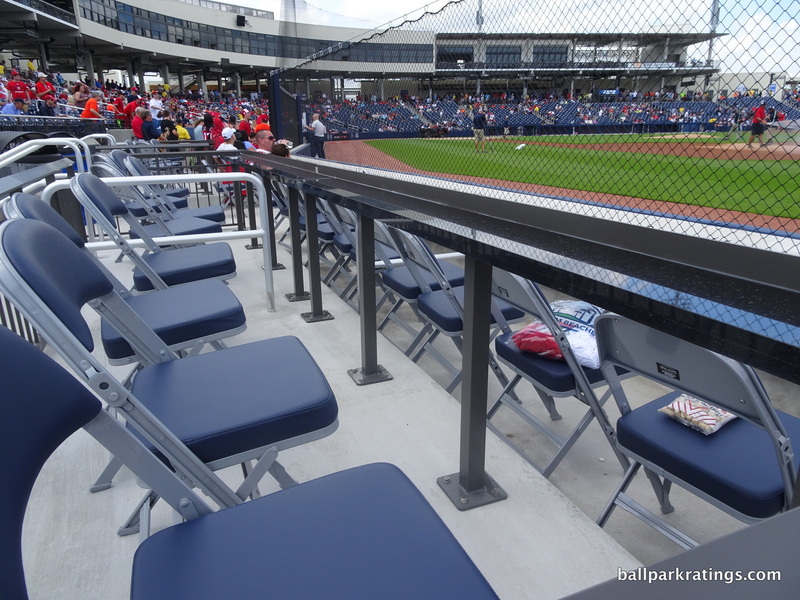 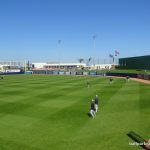 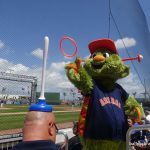 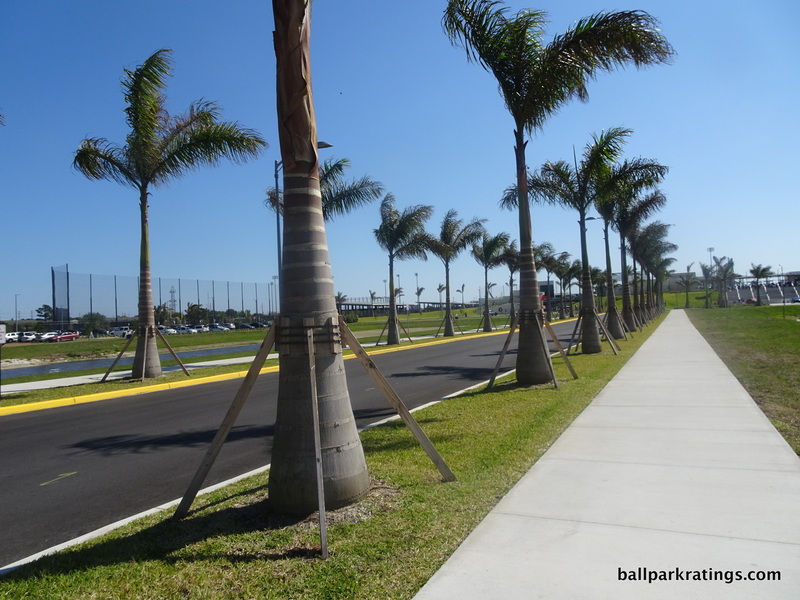 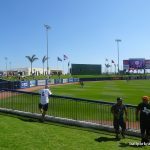 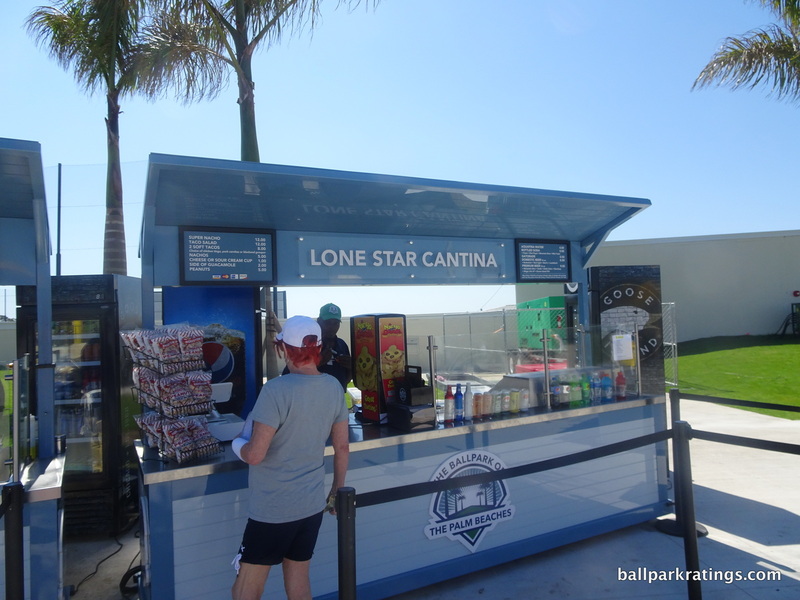 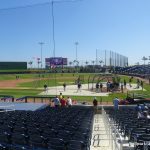 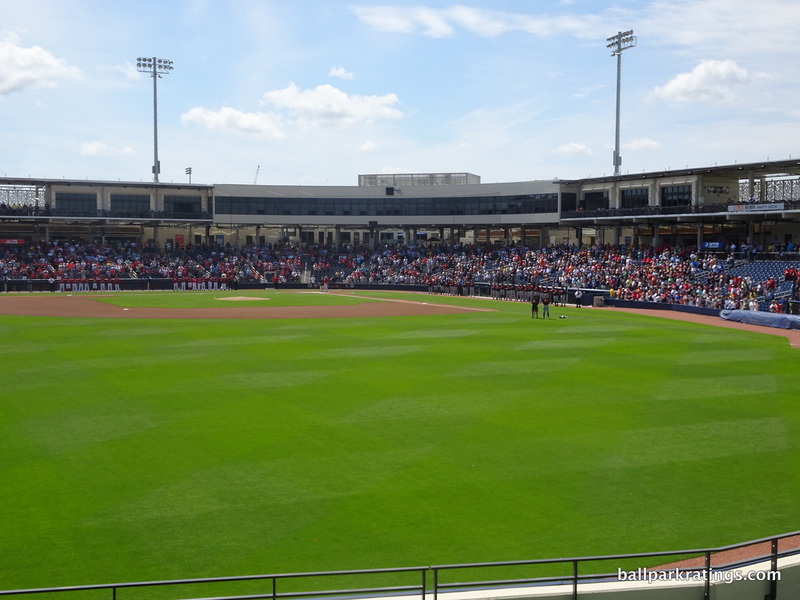 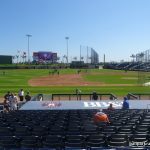 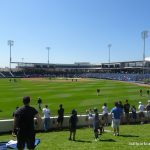 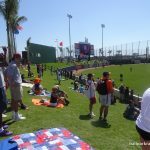 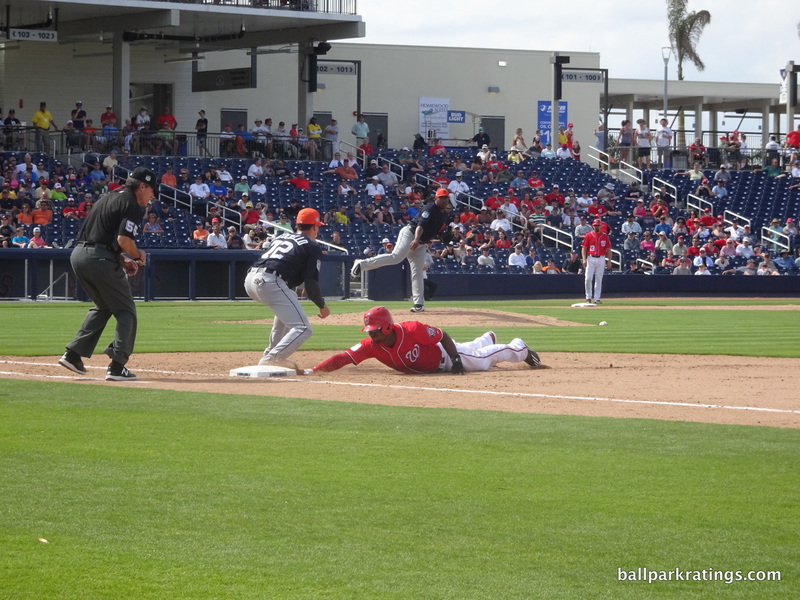 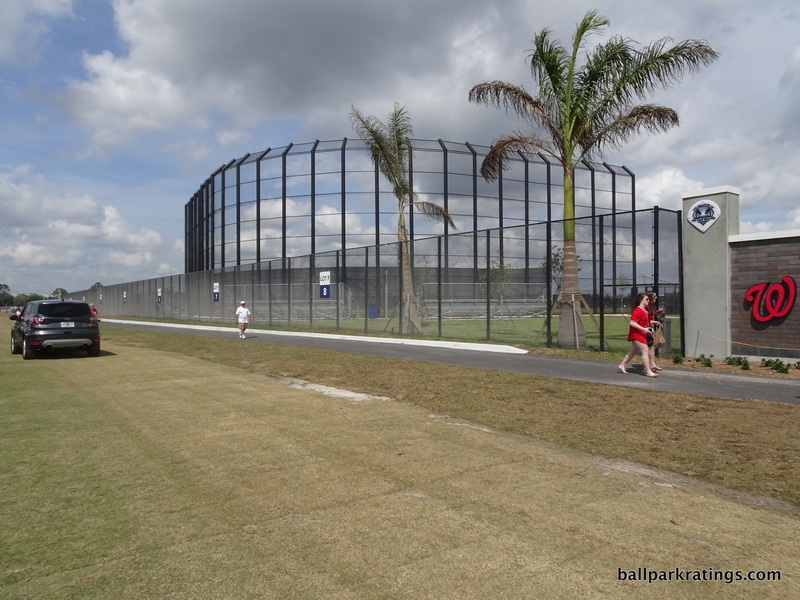 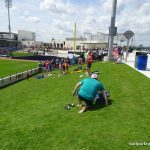 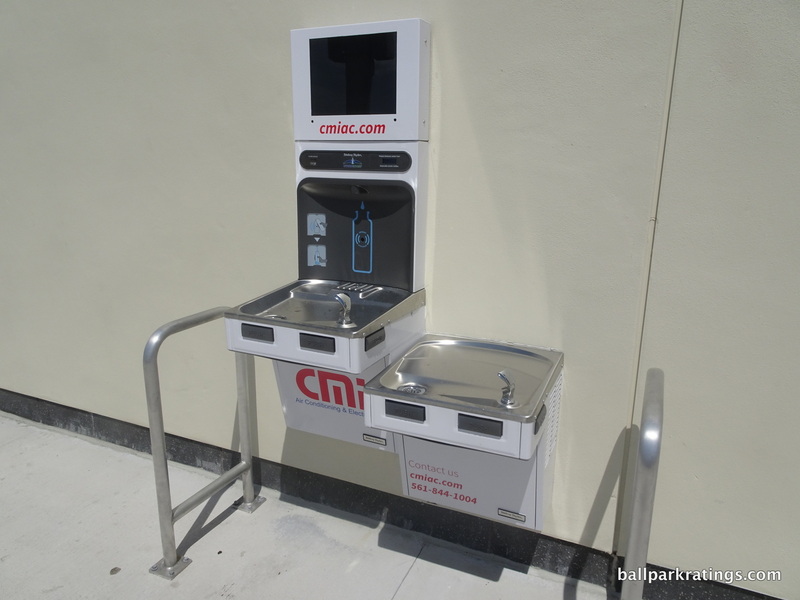 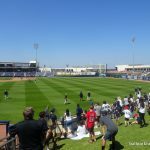 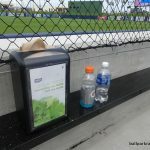 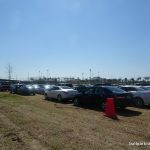 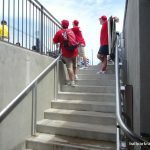 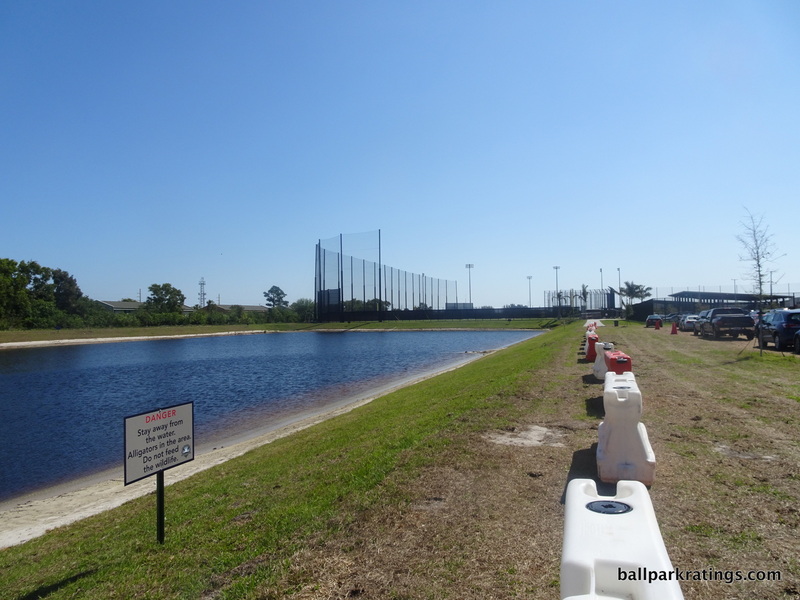 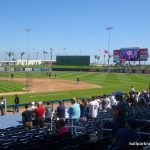 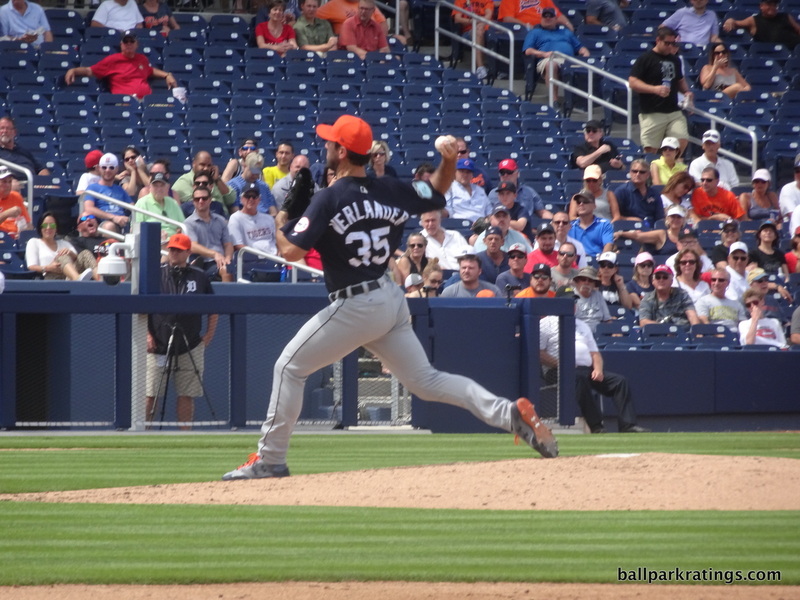 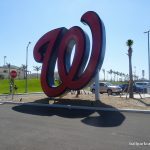 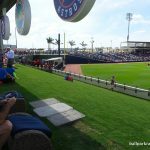 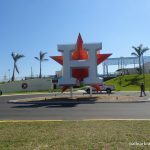 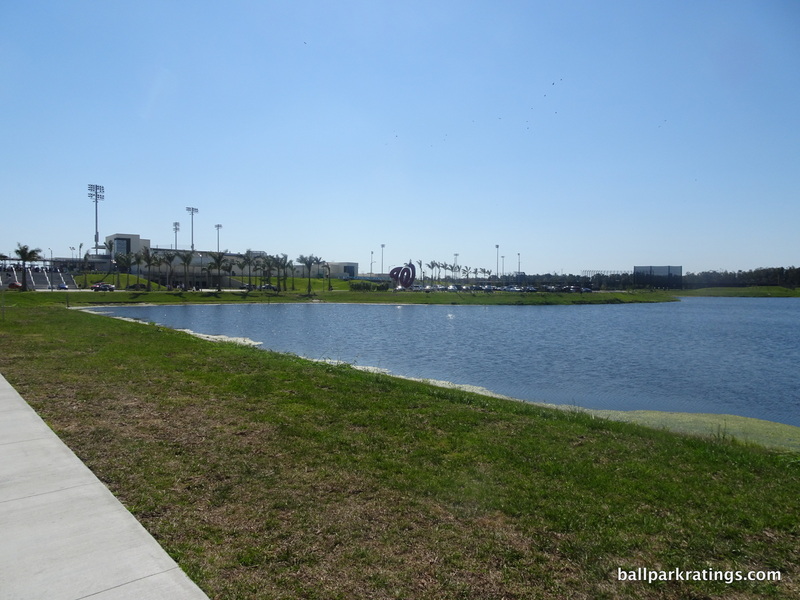 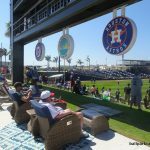 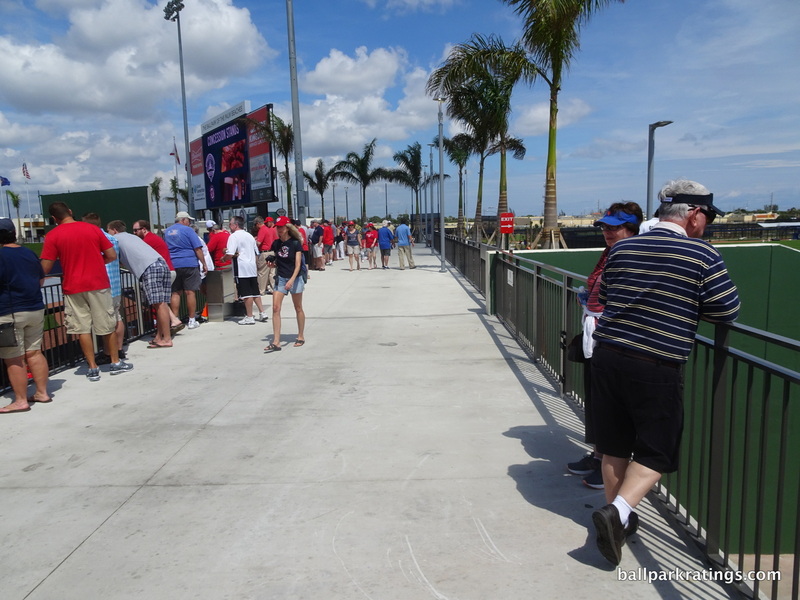 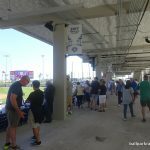 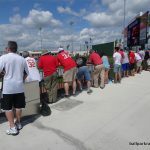 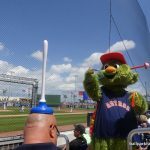 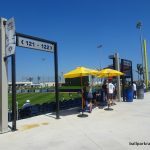 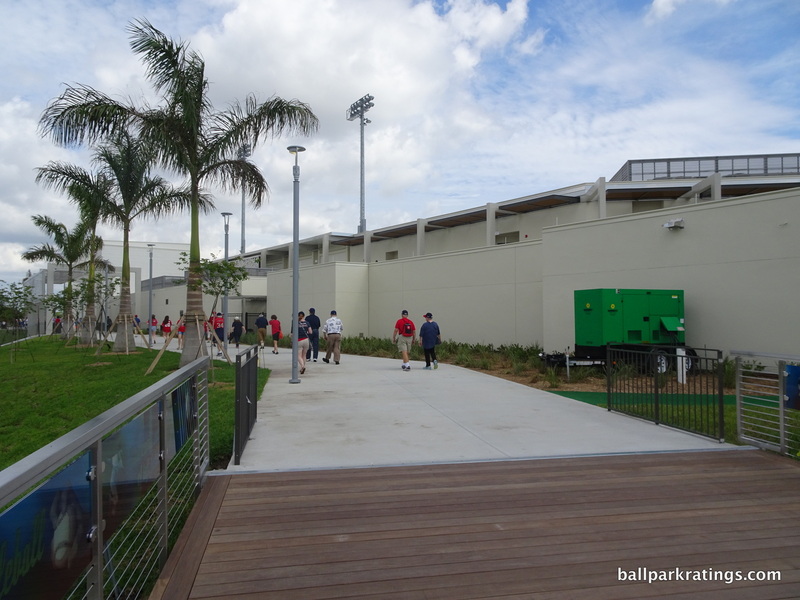 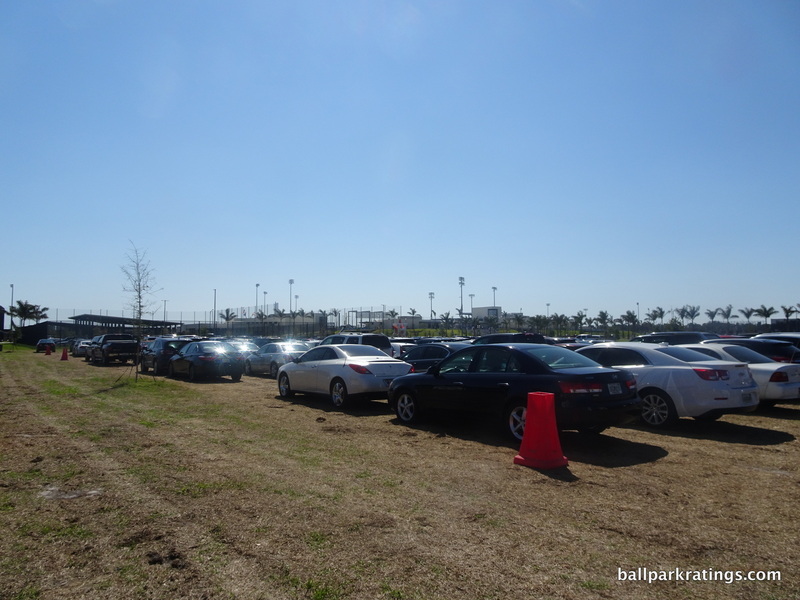 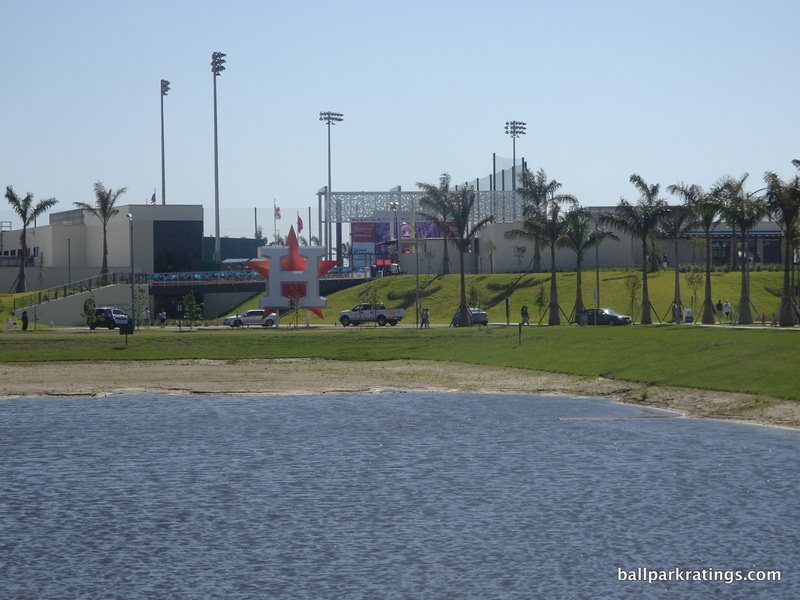 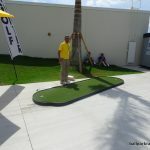 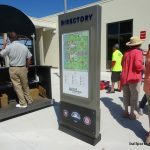 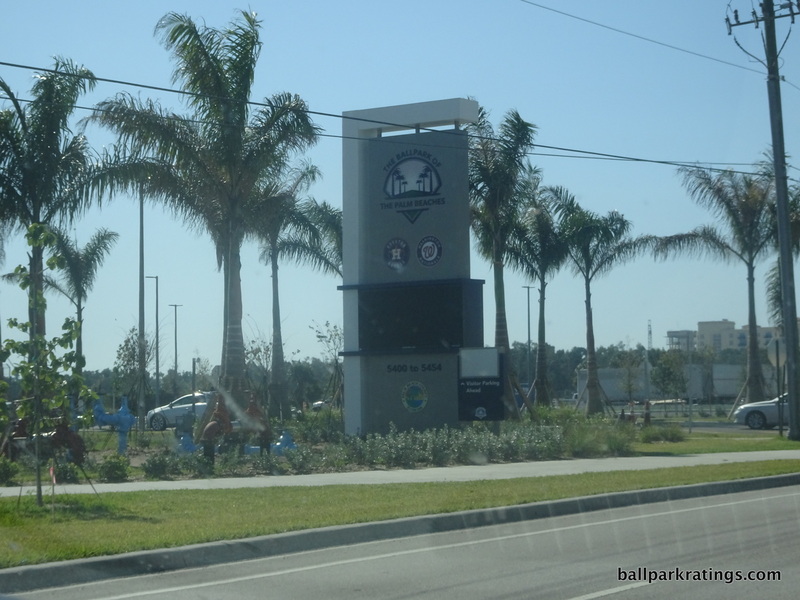 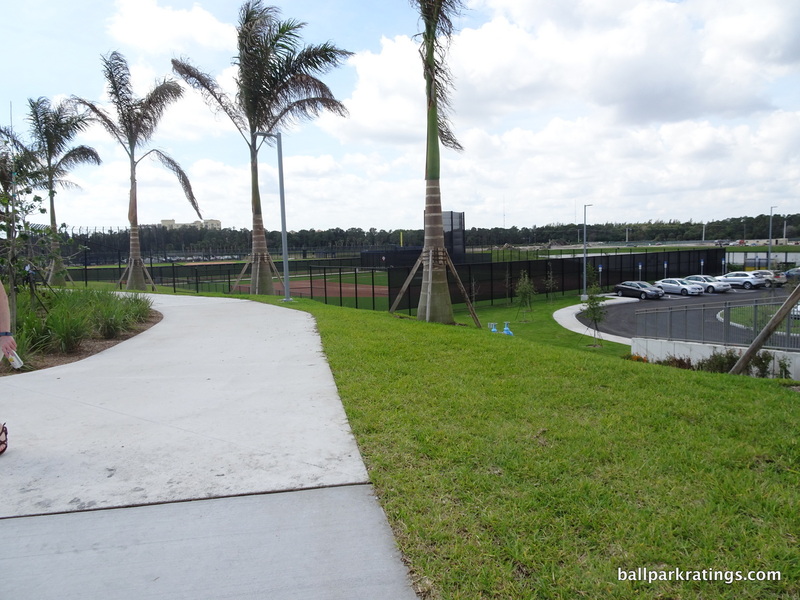 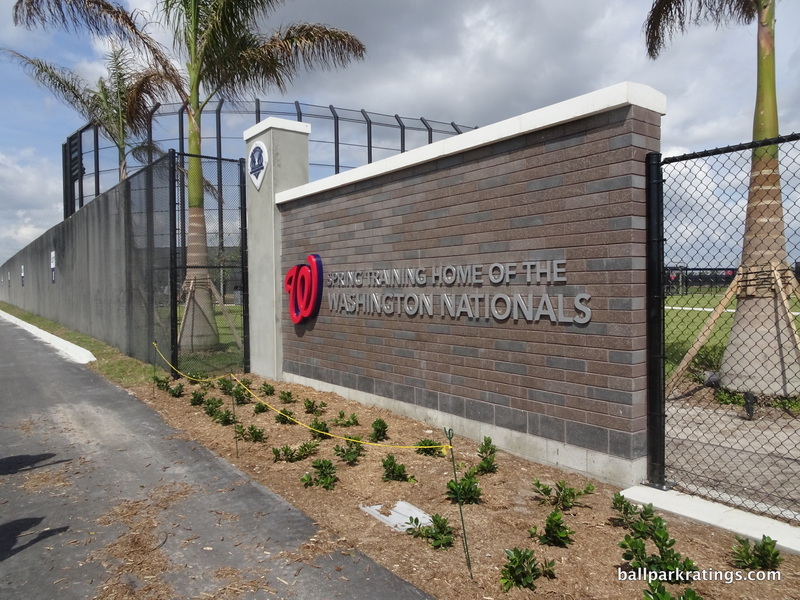 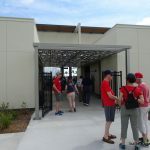 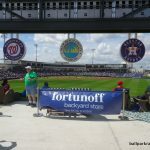 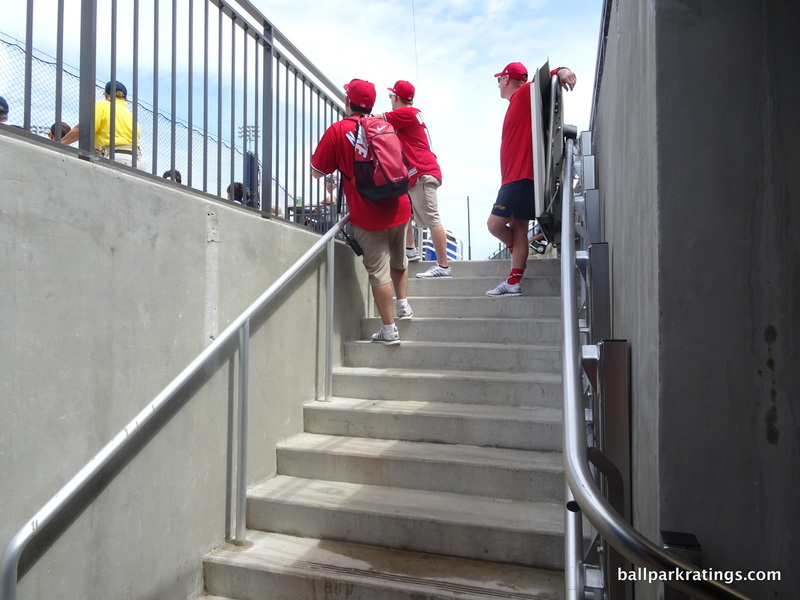 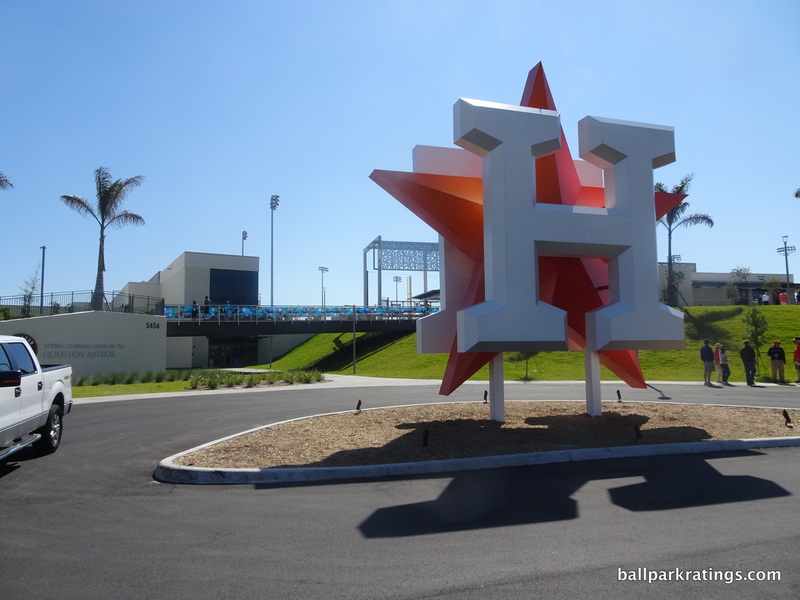 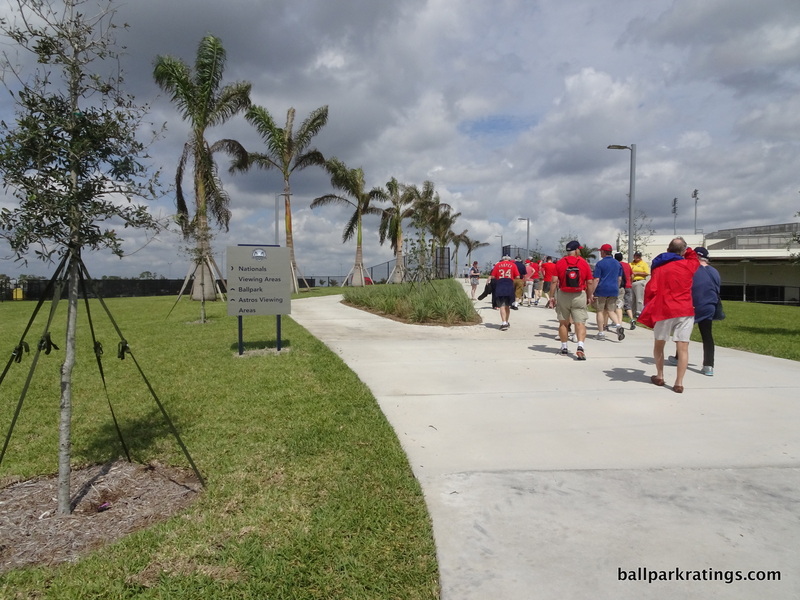 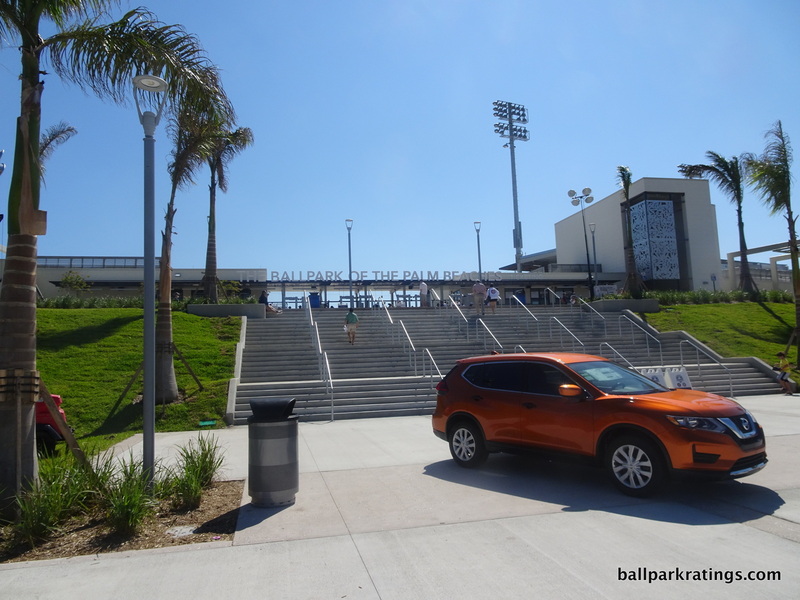 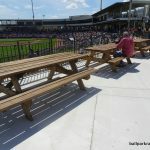 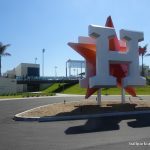 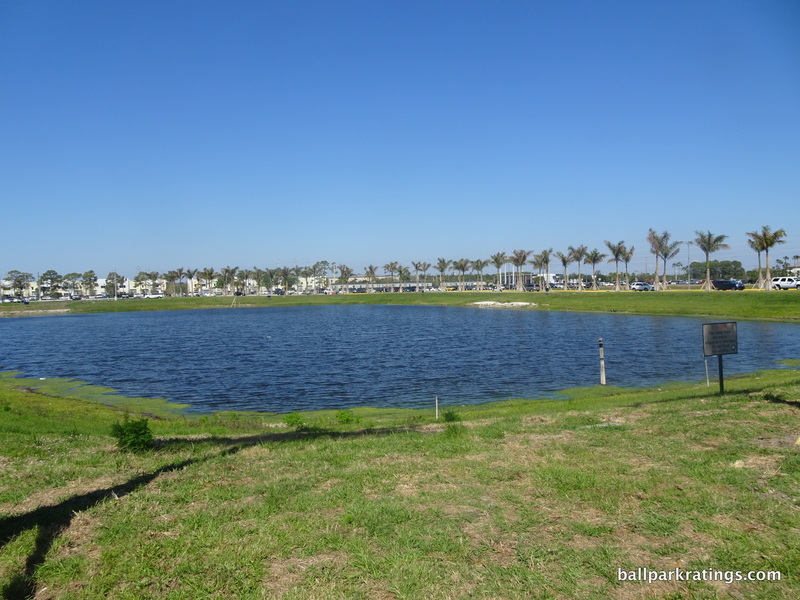 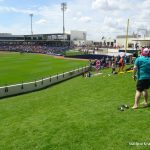 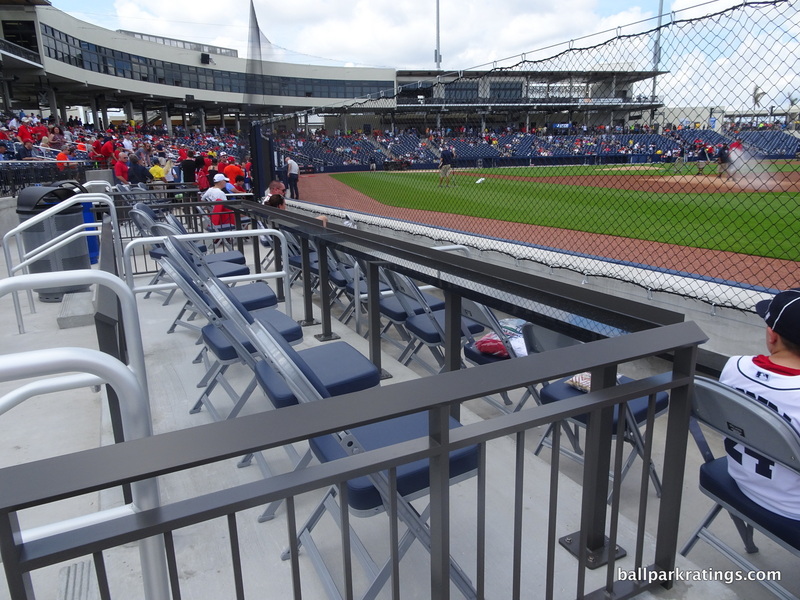 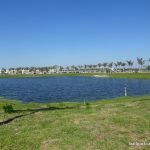 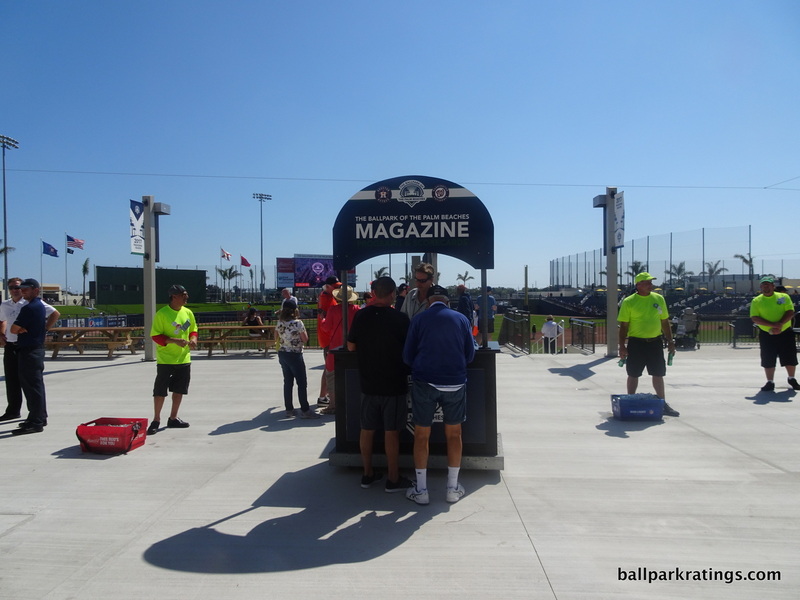 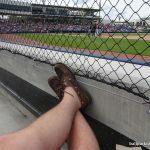 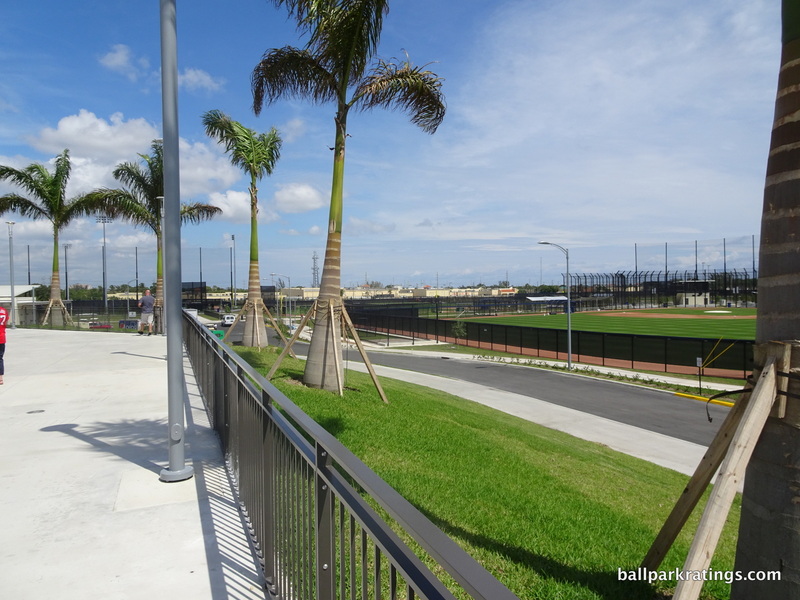 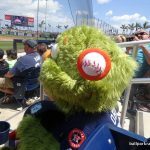 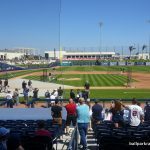 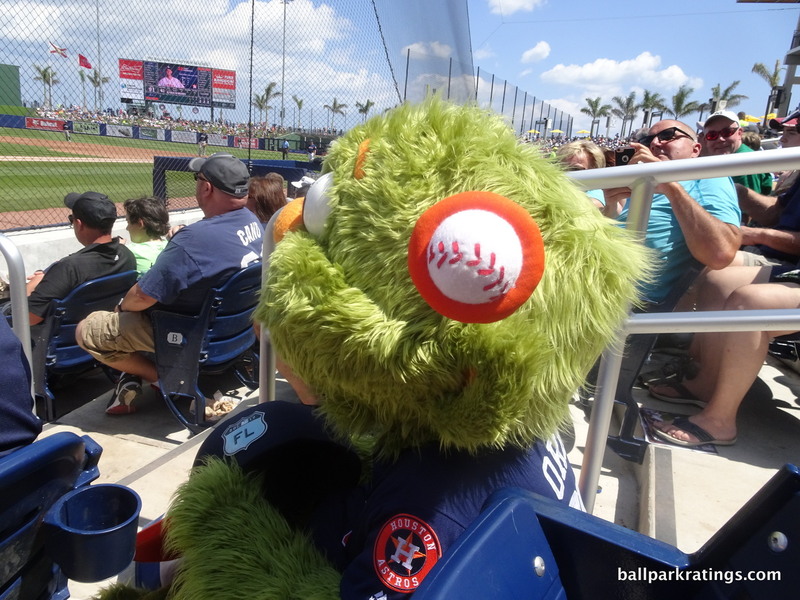 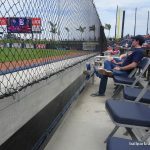 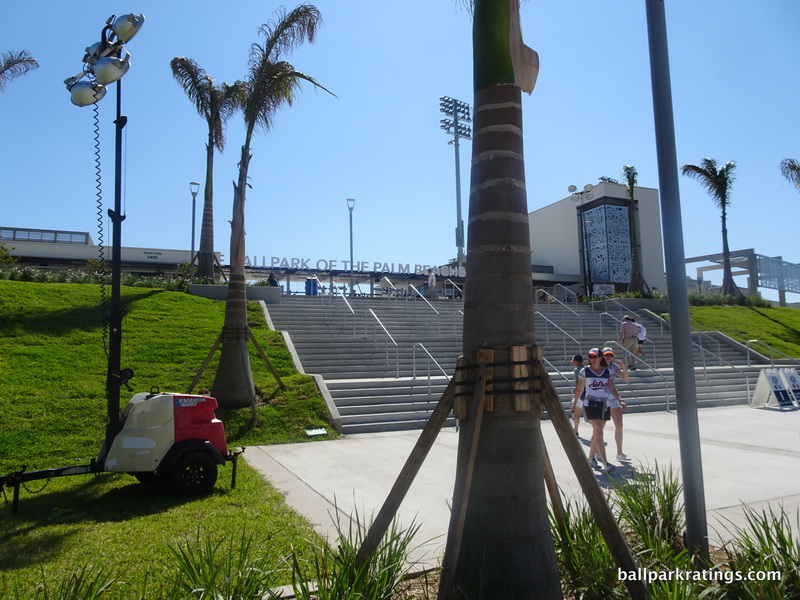 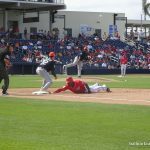 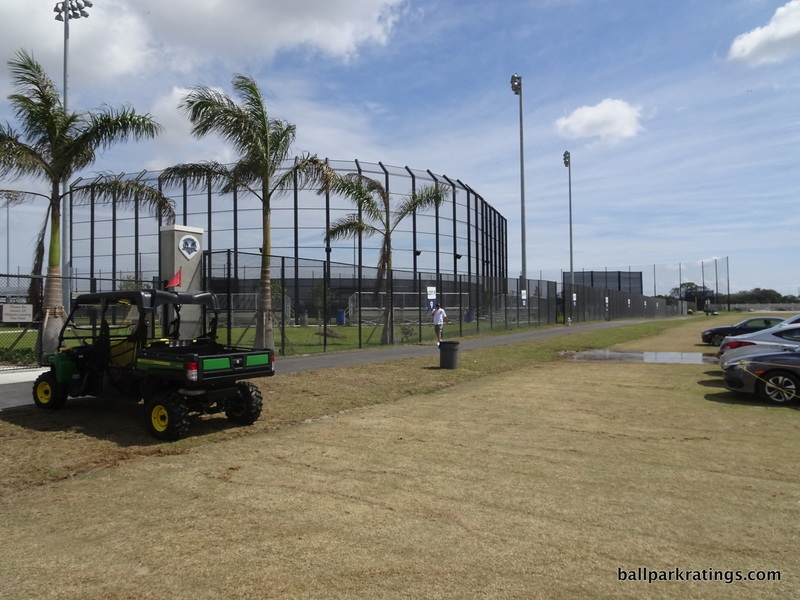 For nearly three decades now, it seems as if each and every spring training park tries to outdo the preceding ones, continually raising the bar for what fans should expect. 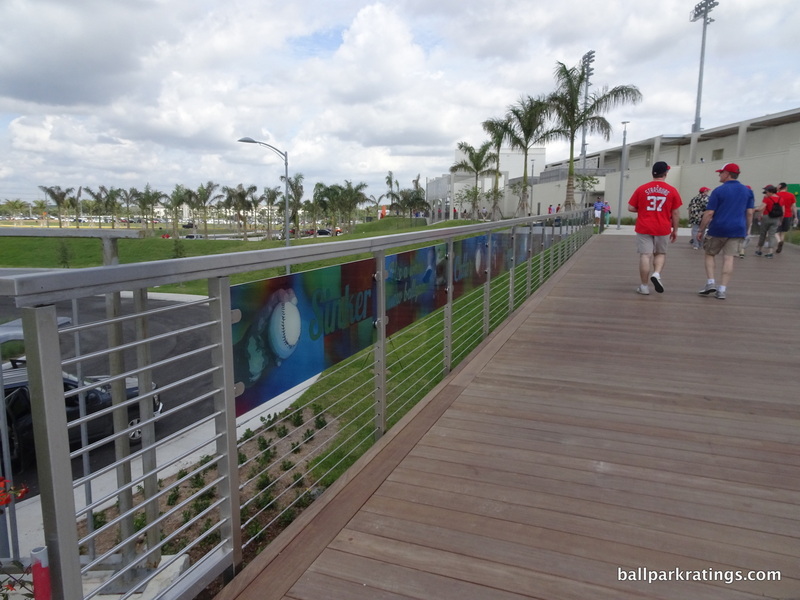 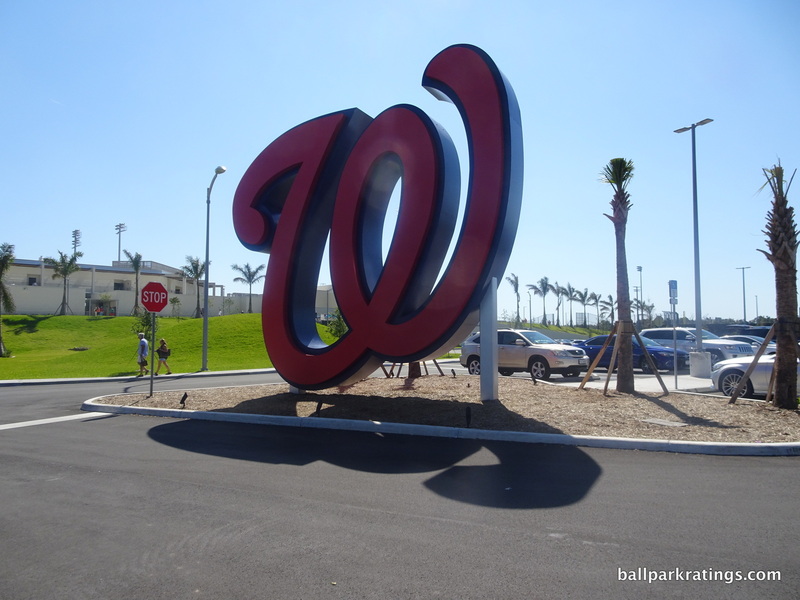 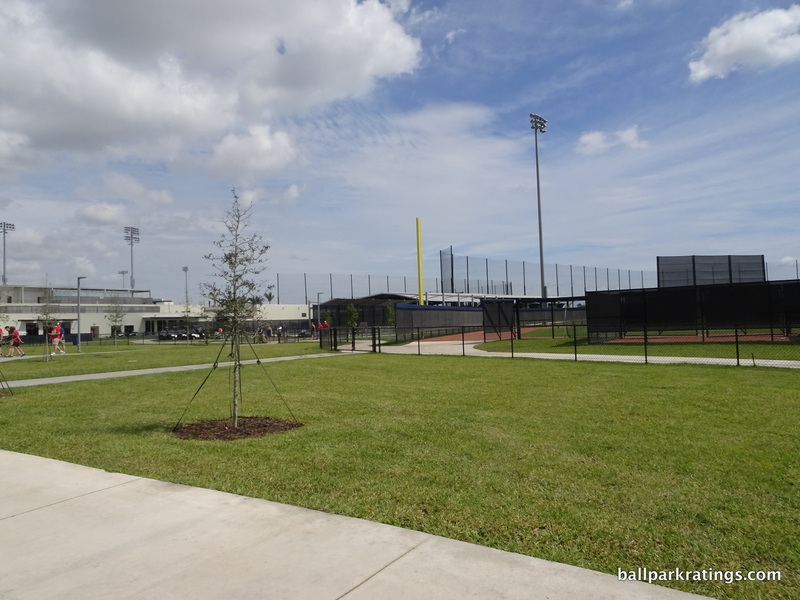 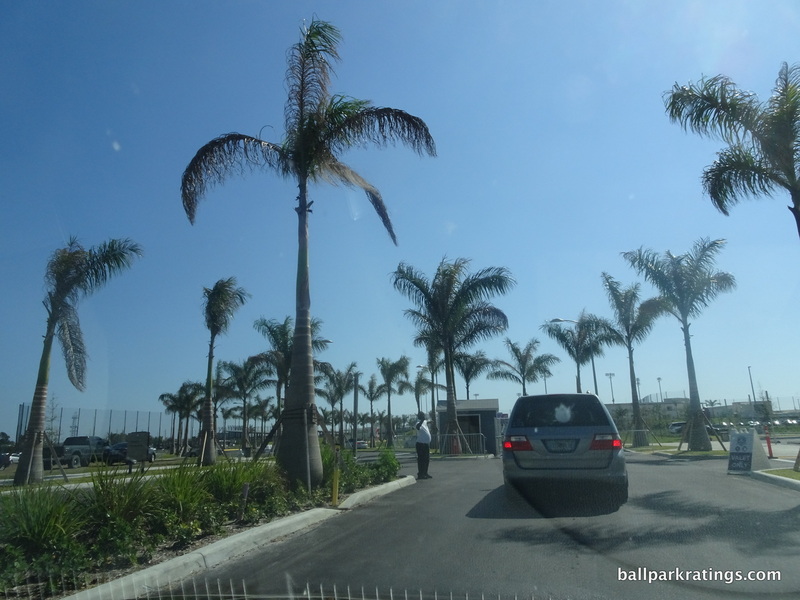 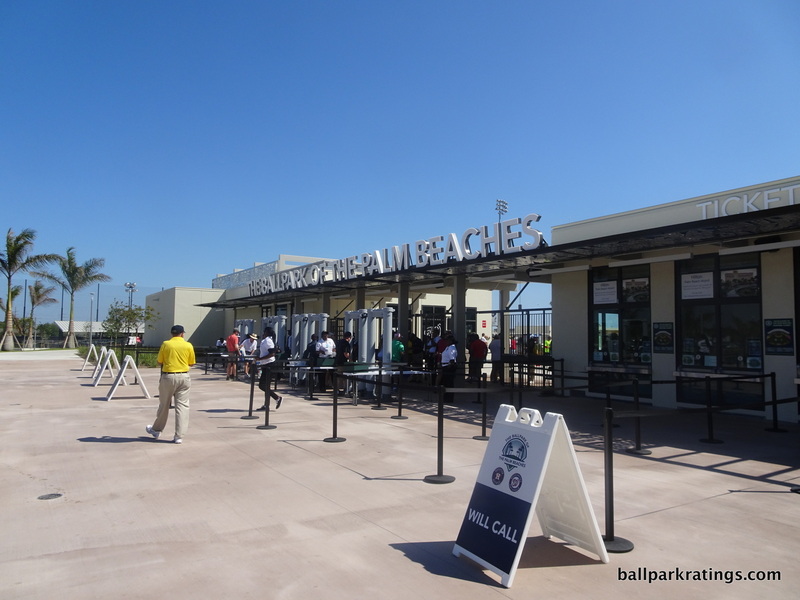 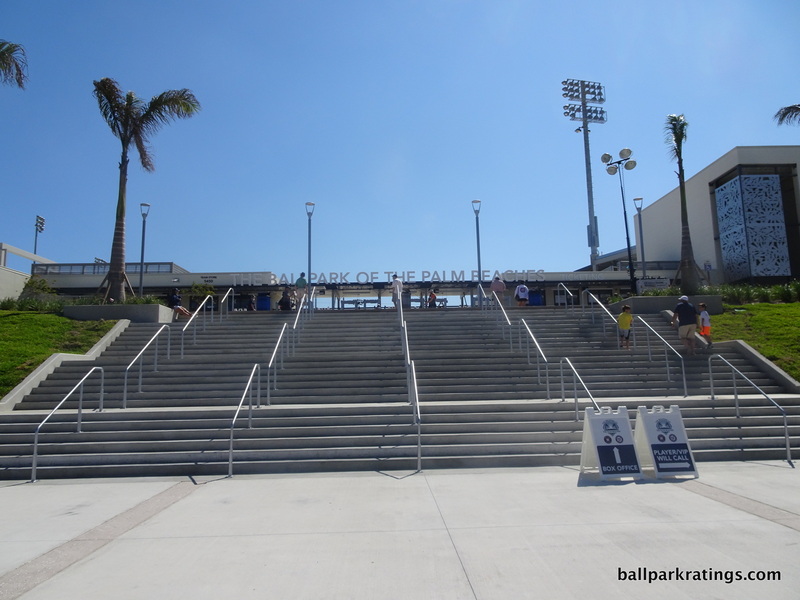 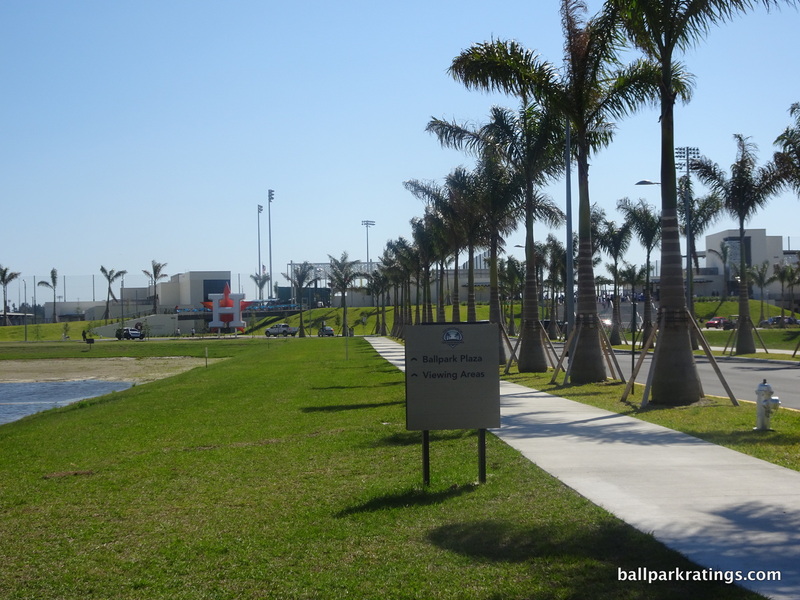 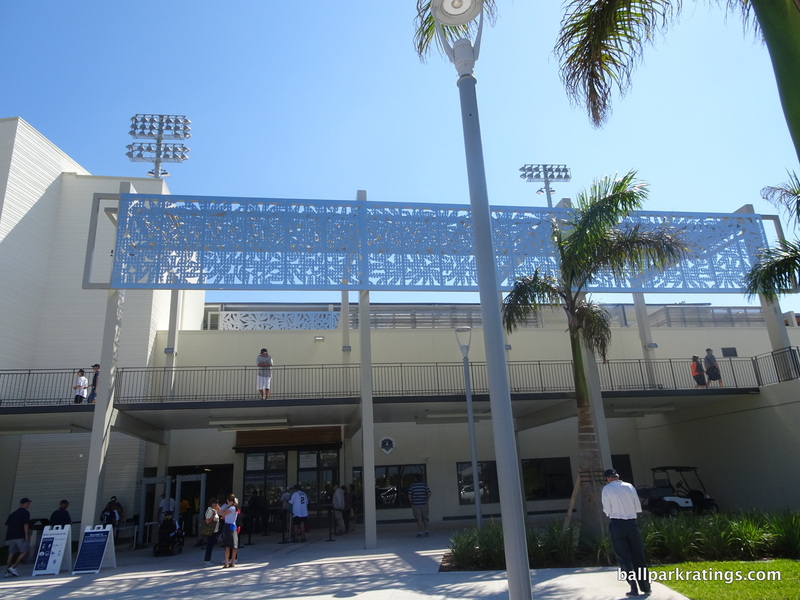 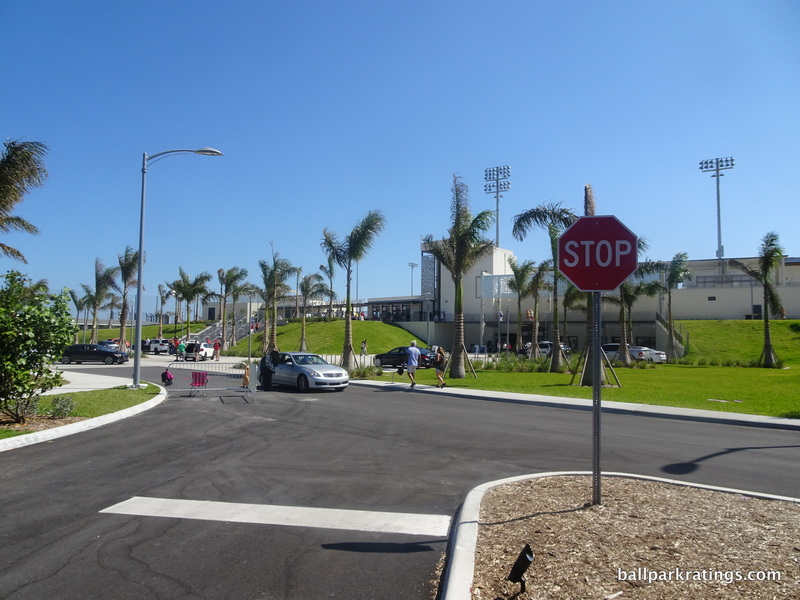 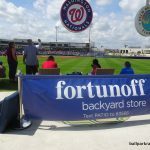 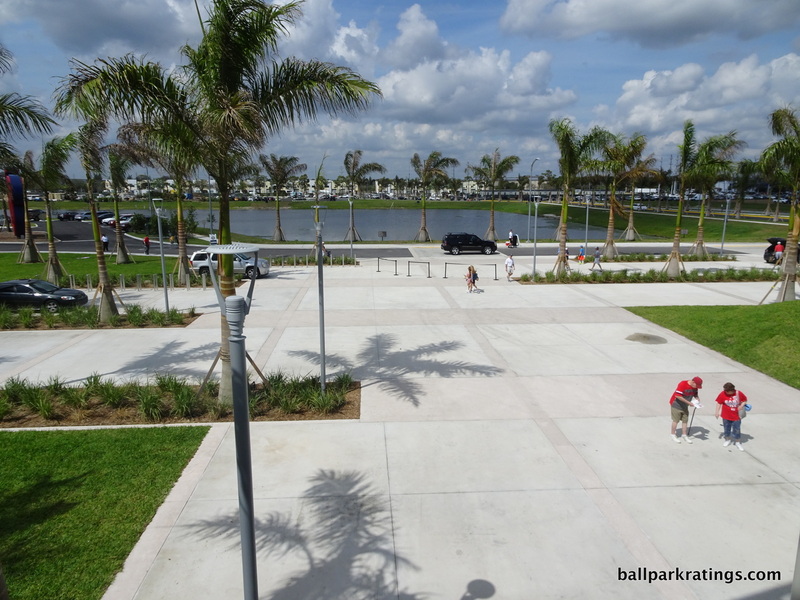 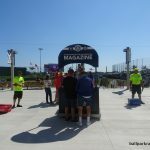 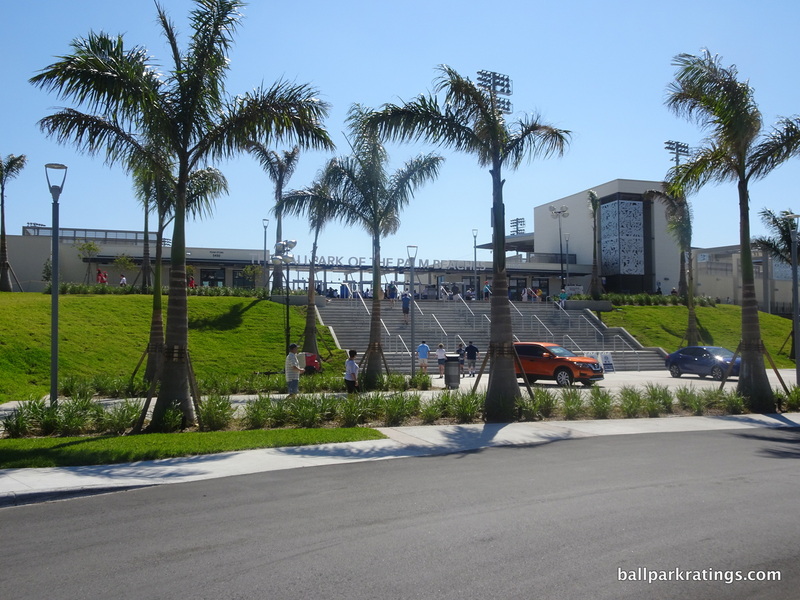 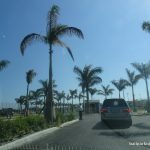 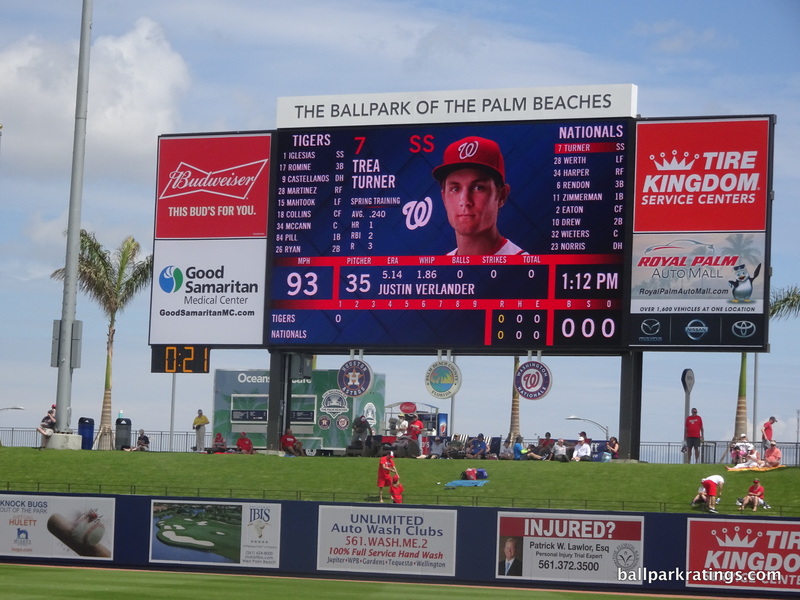 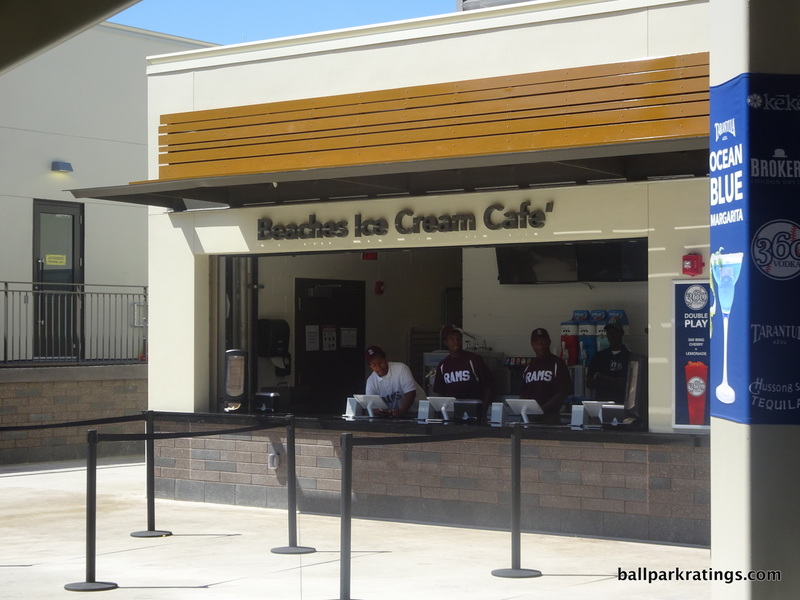 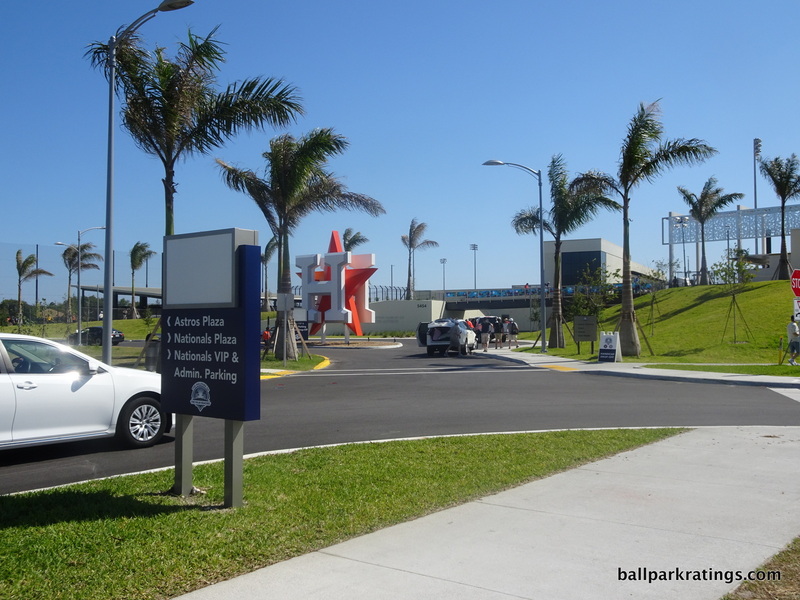 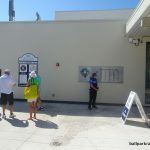 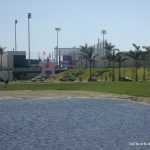 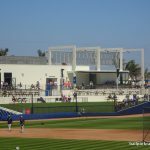 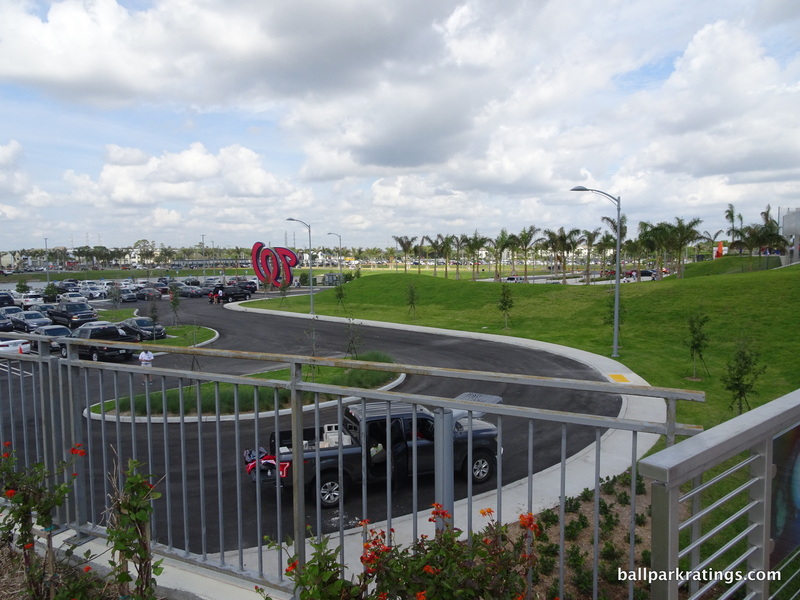 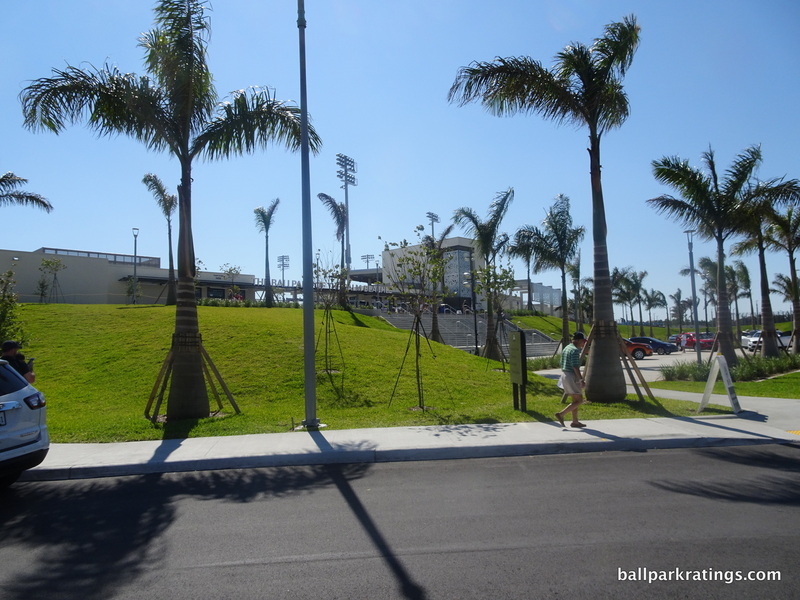 Clocking in at $148 million, I expected nothing less than the best from the new Palm Beach ballpark with the dream name. 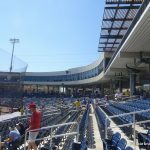 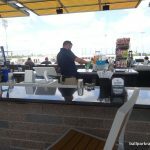 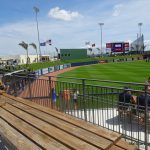 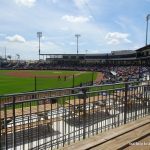 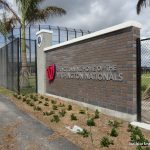 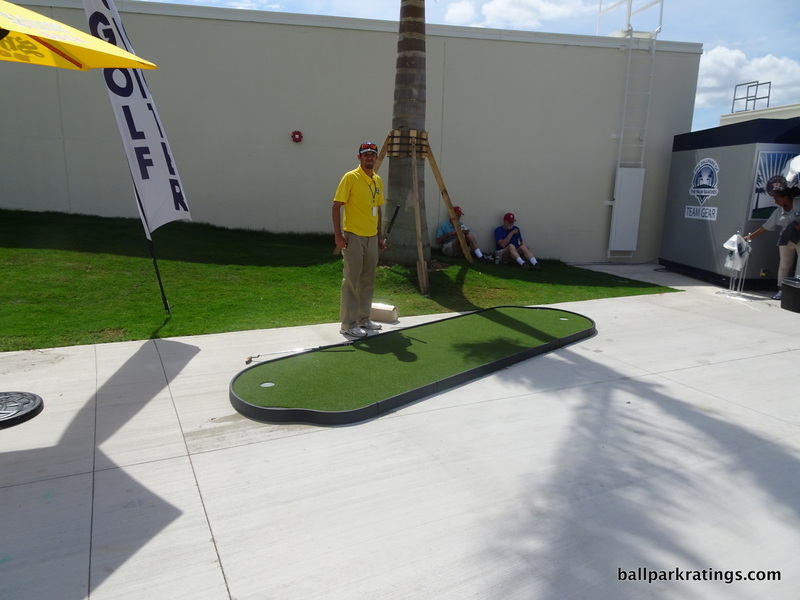 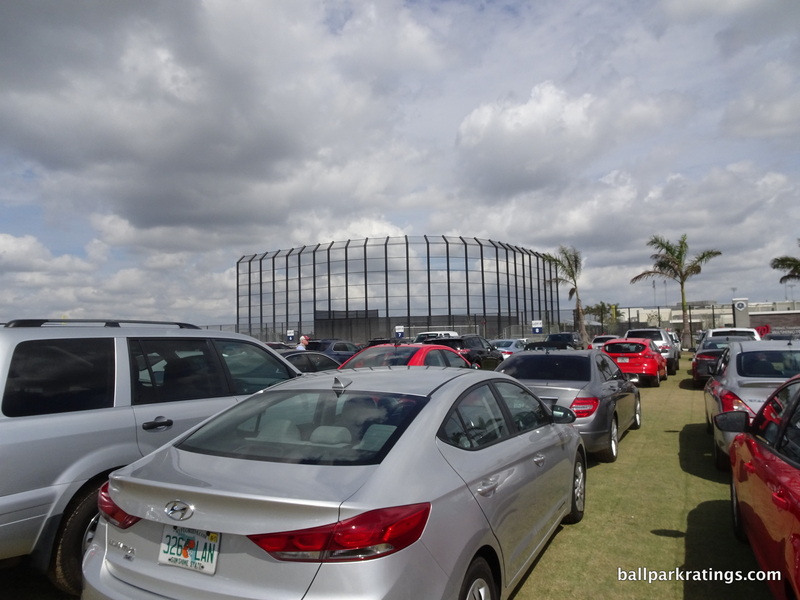 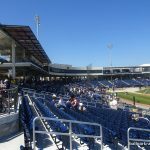 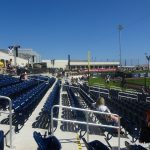 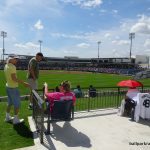 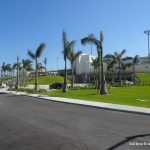 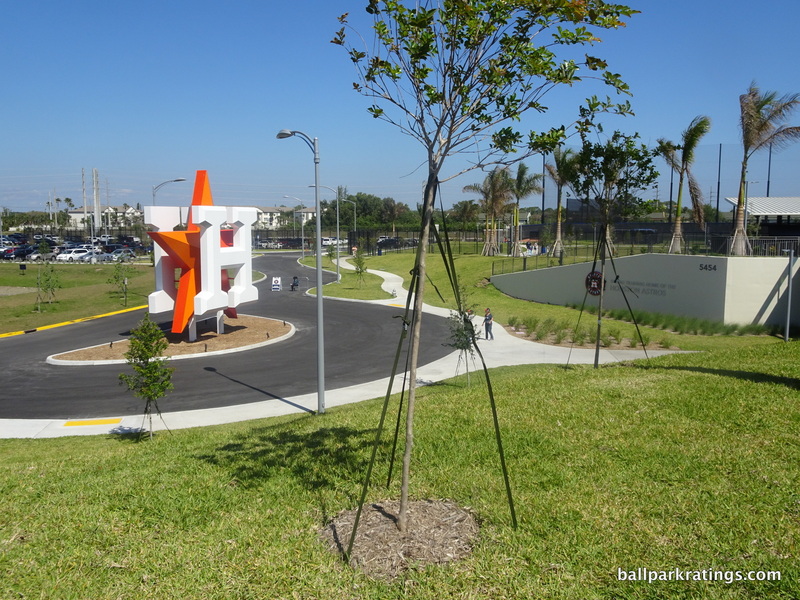 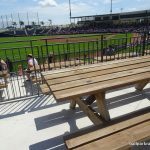 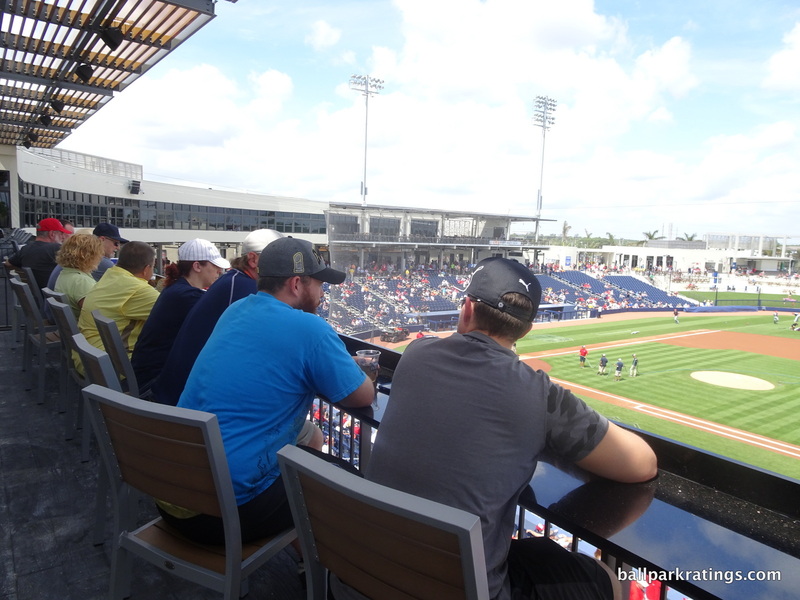 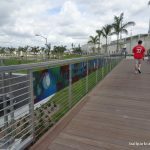 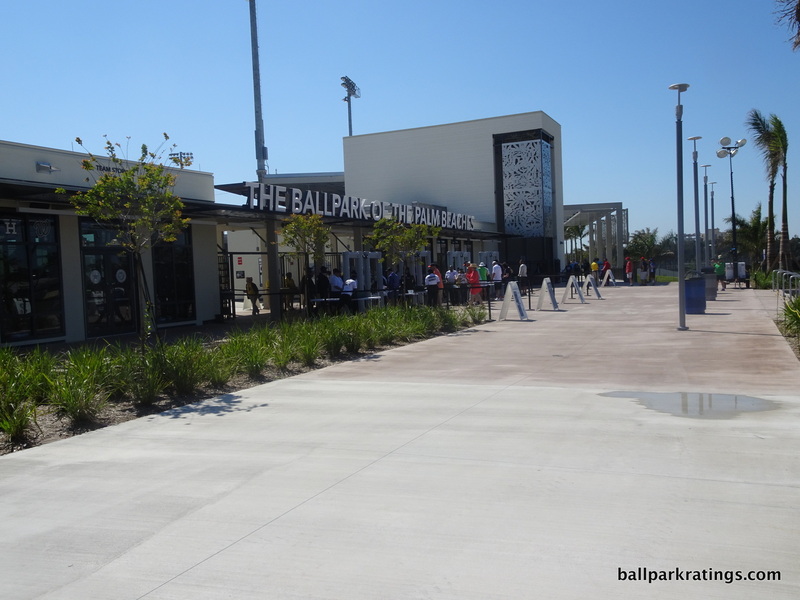 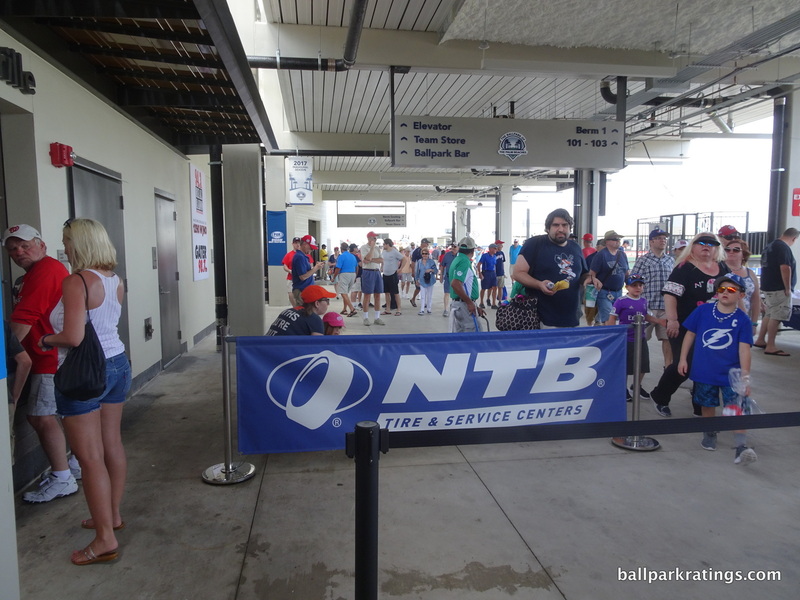 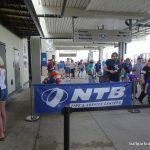 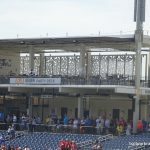 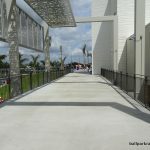 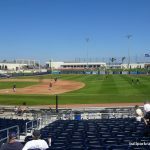 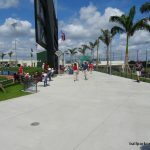 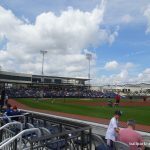 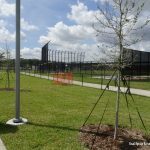 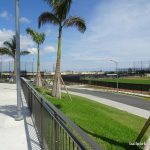 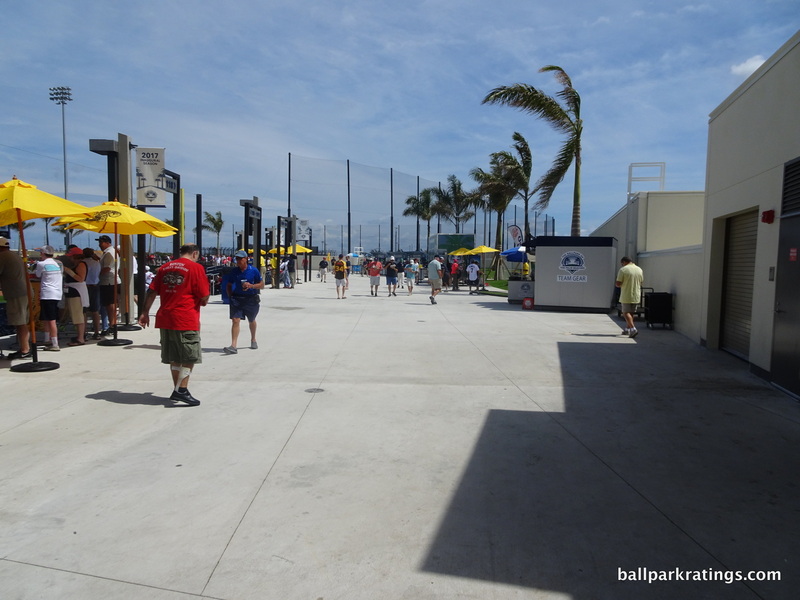 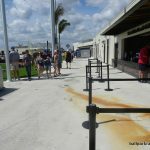 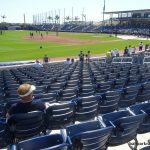 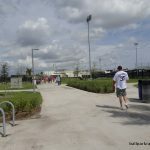 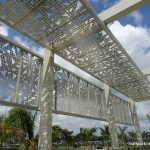 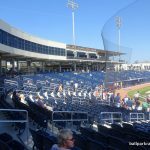 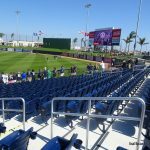 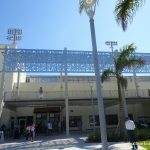 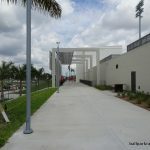 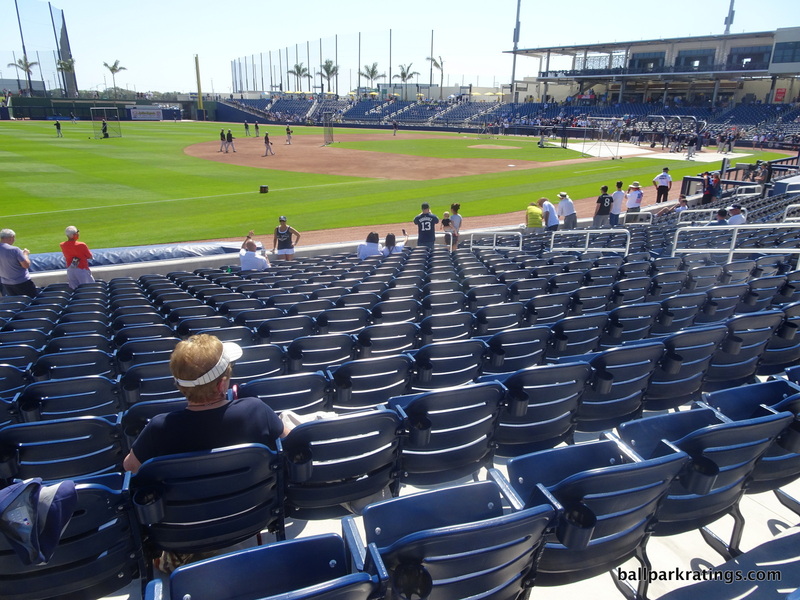 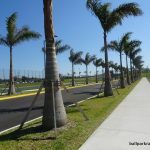 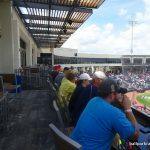 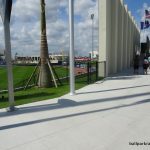 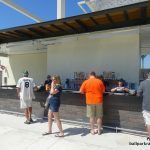 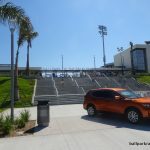 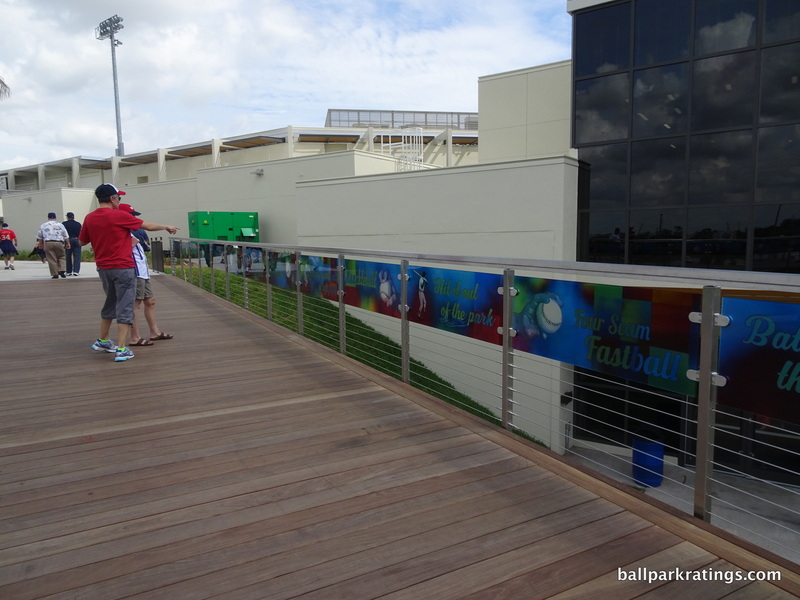 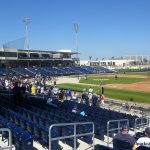 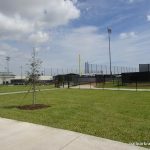 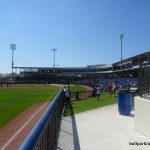 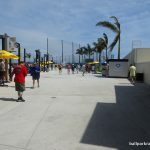 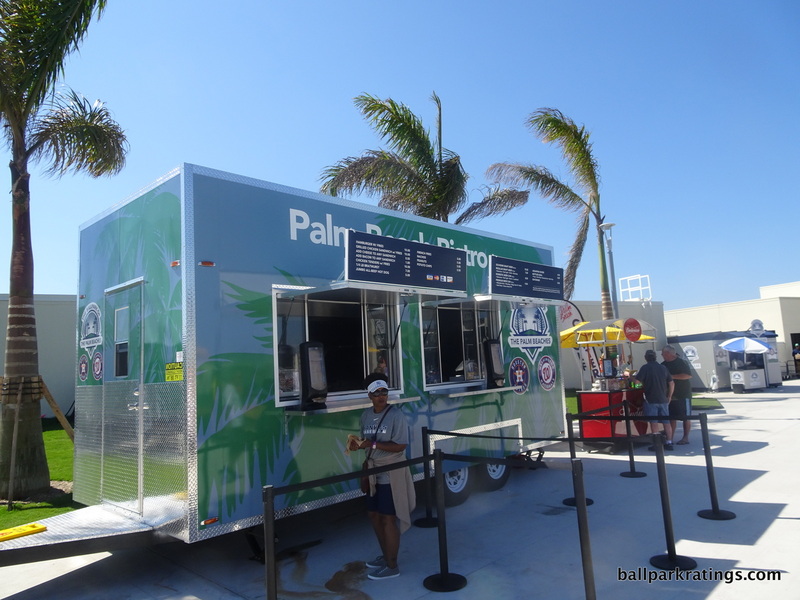 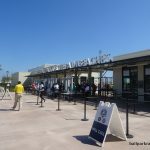 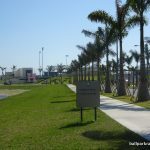 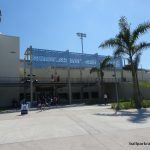 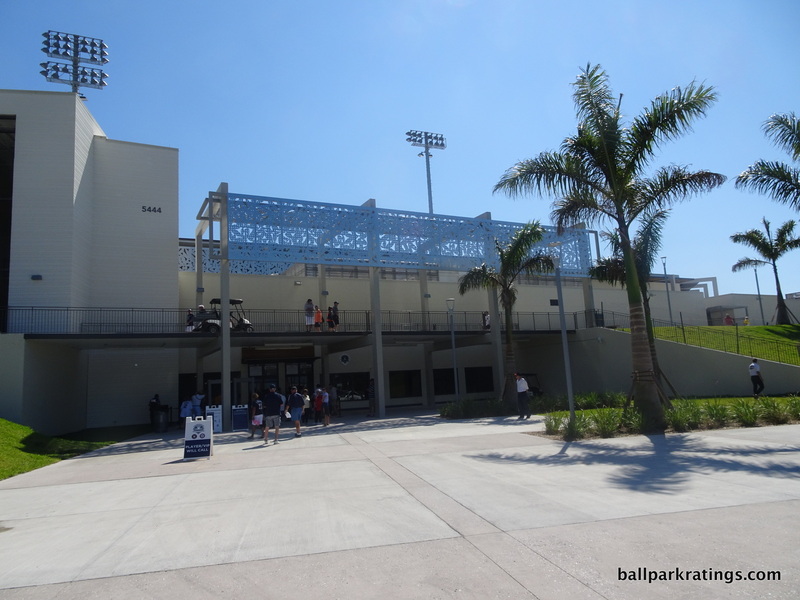 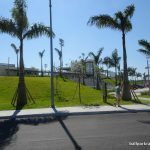 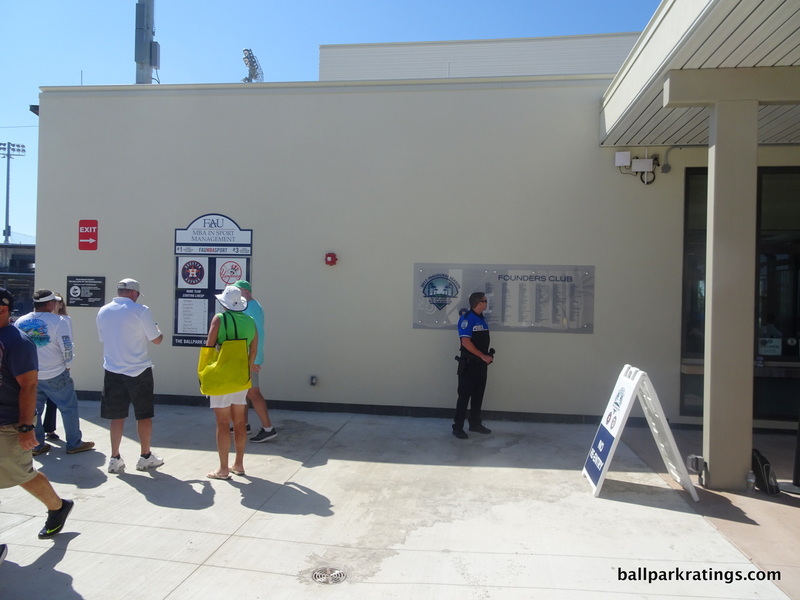 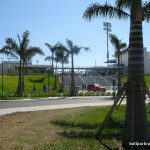 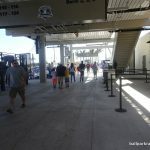 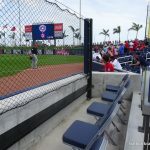 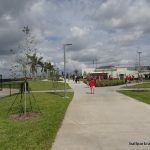 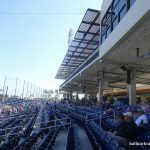 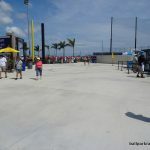 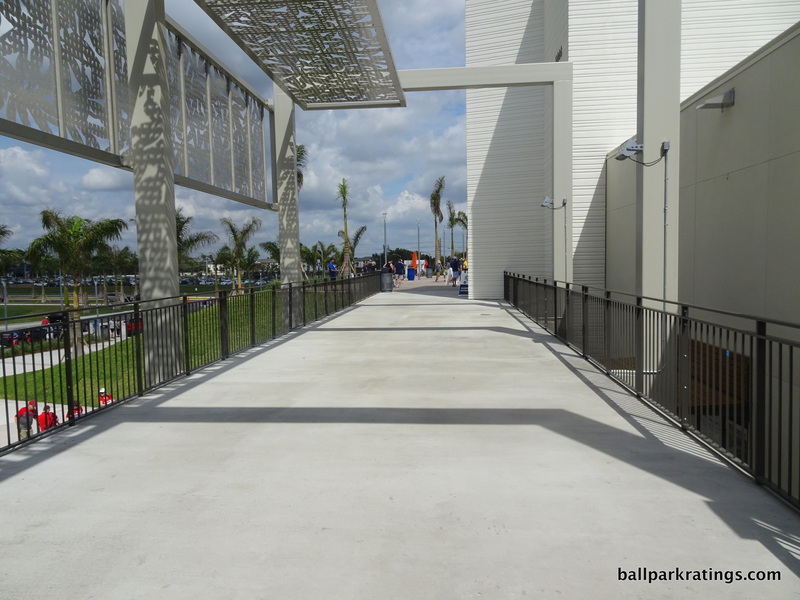 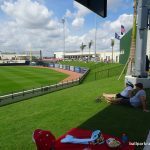 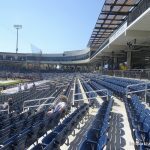 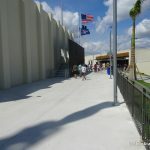 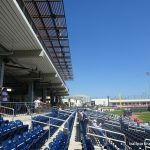 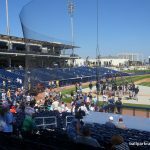 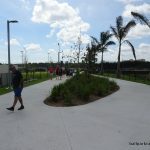 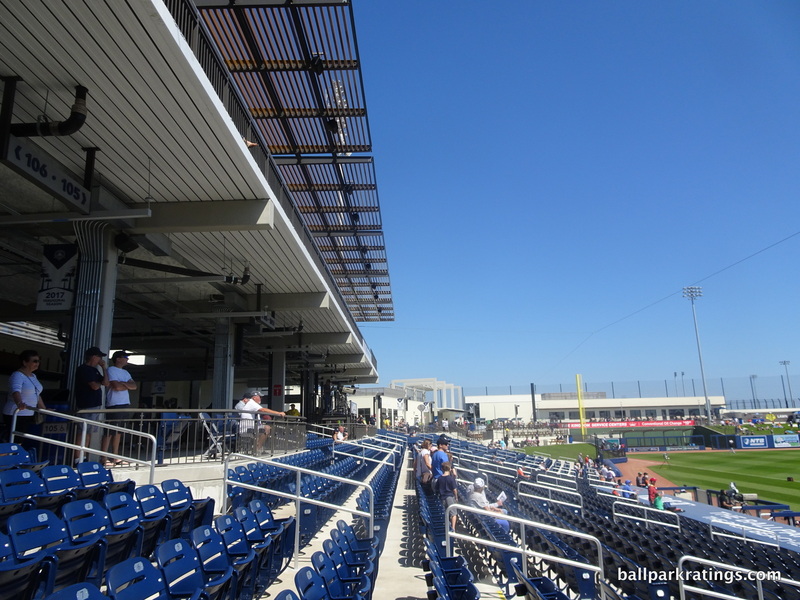 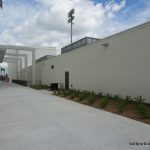 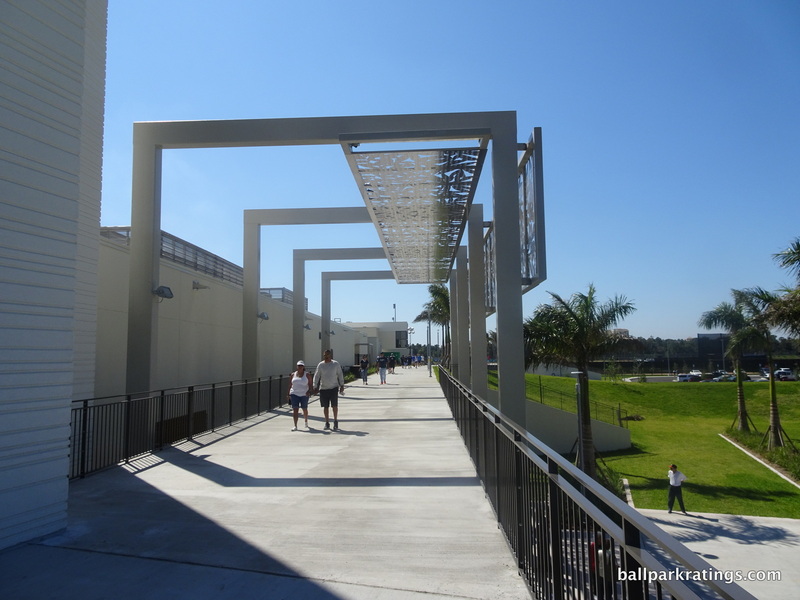 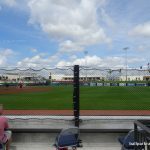 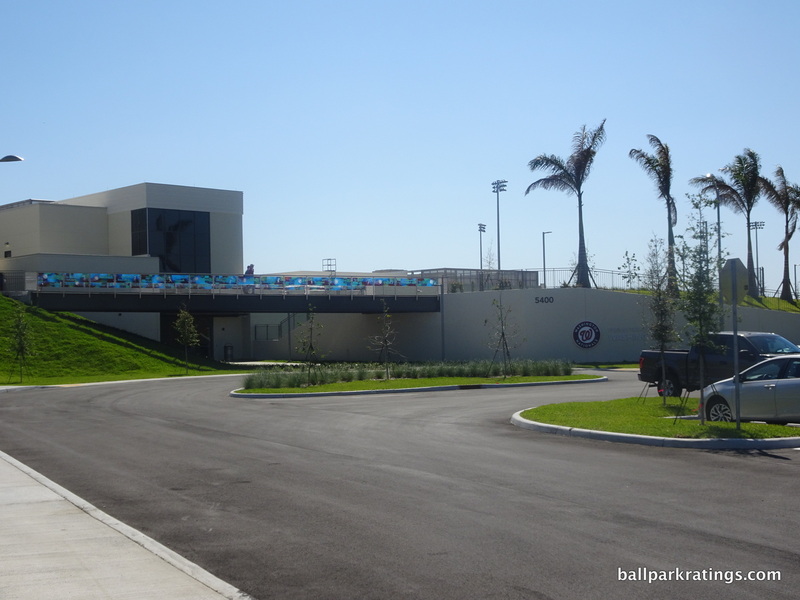 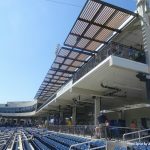 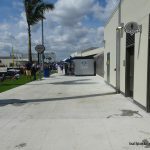 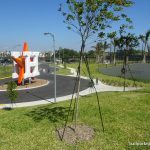 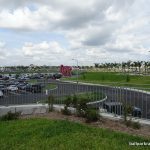 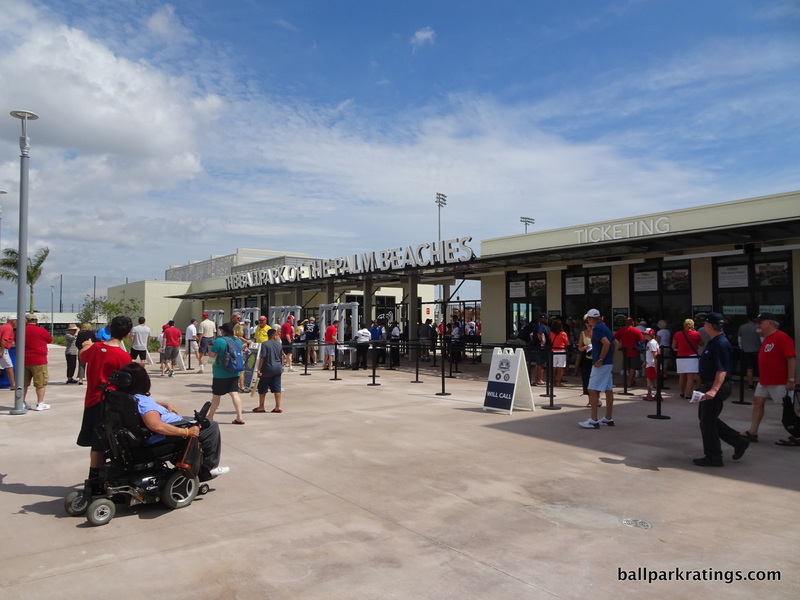 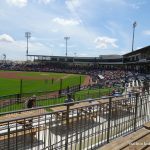 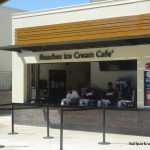 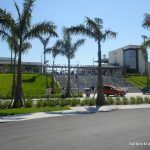 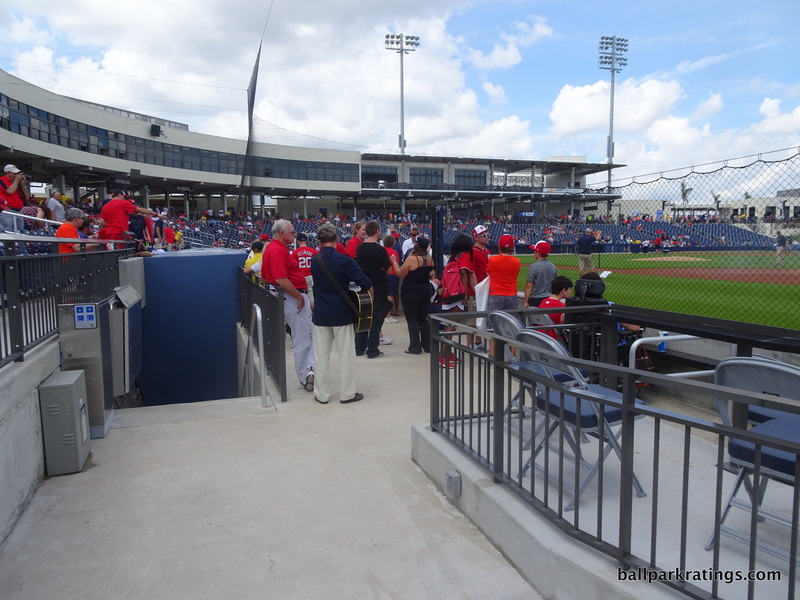 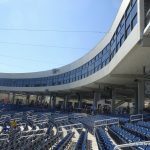 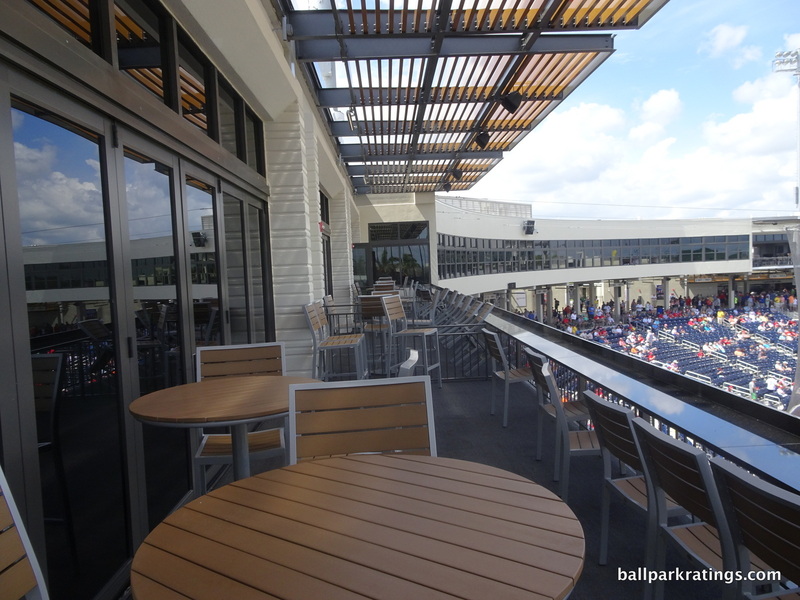 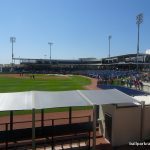 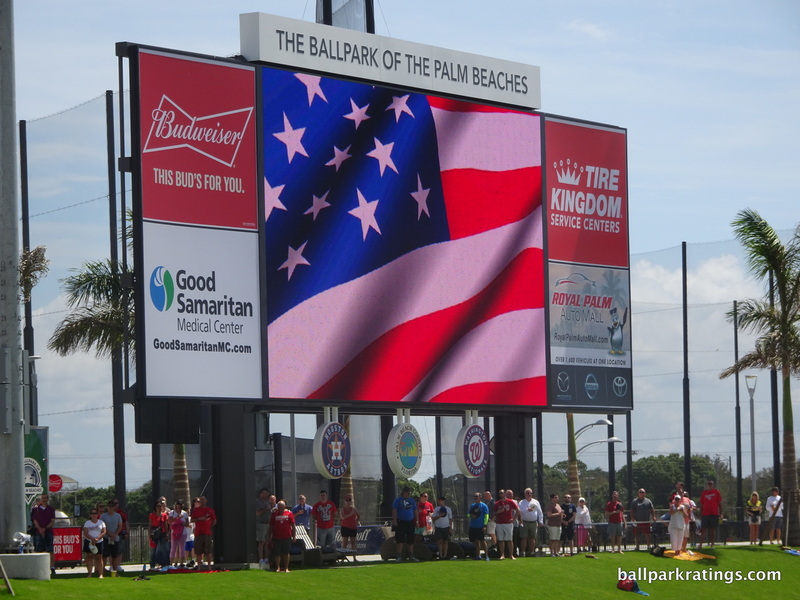 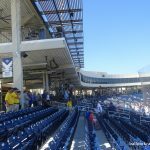 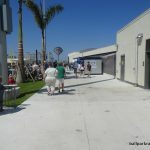 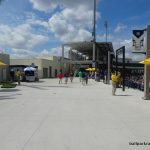 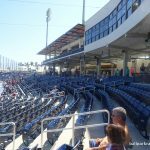 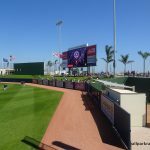 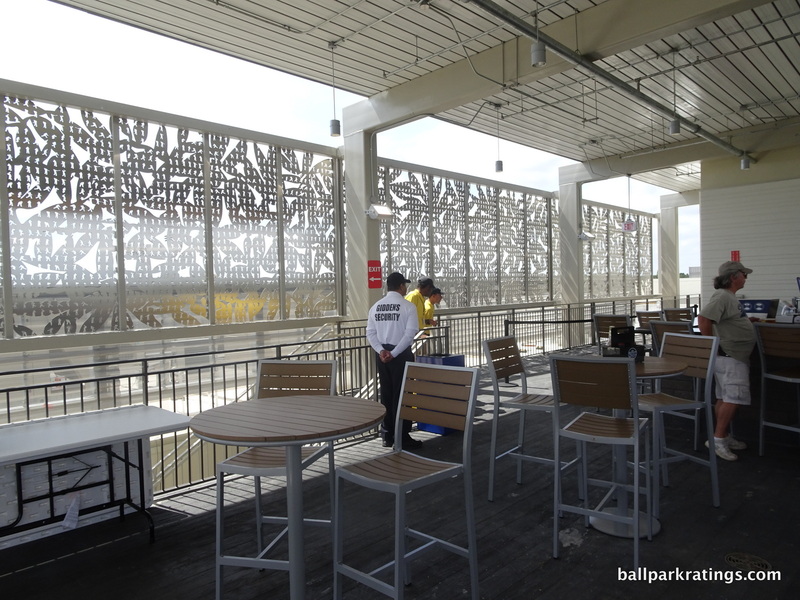 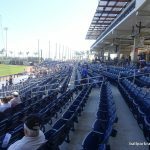 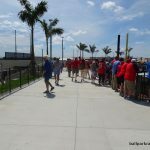 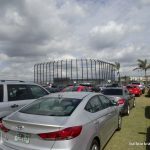 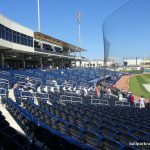 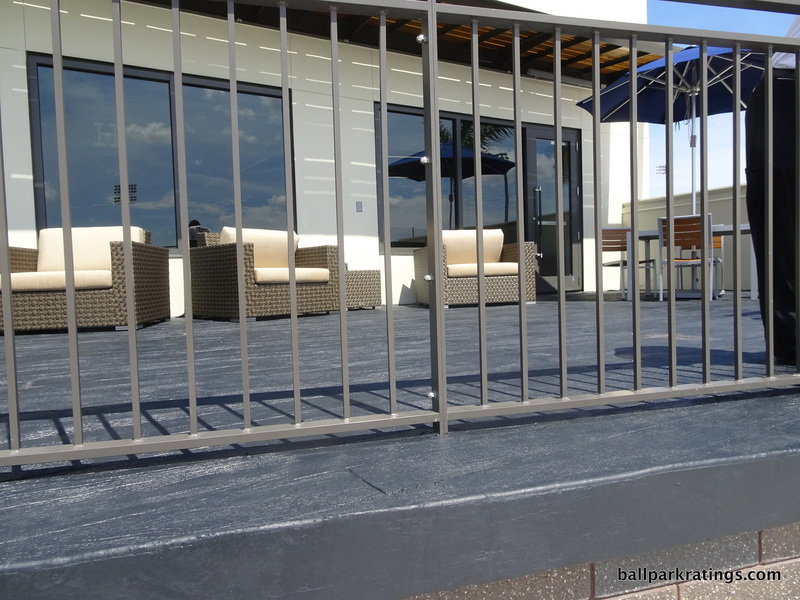 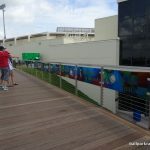 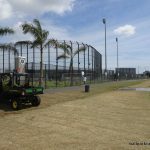 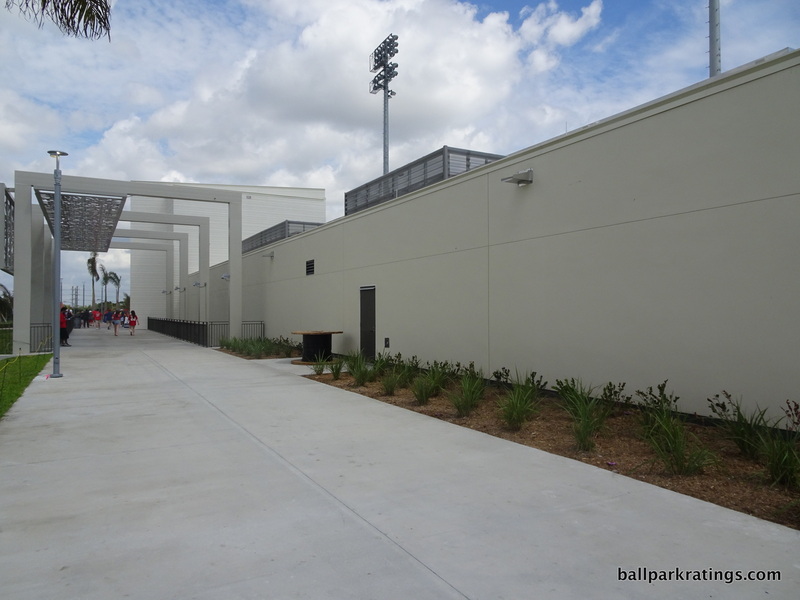 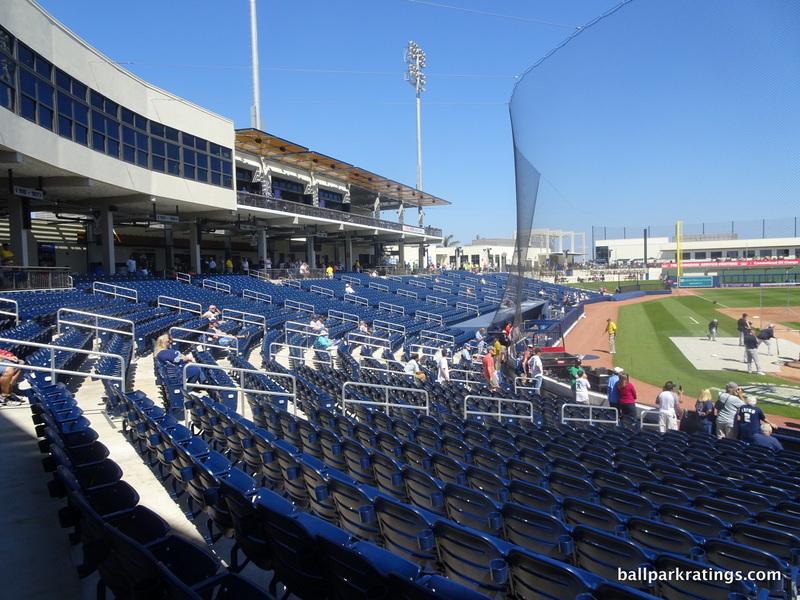 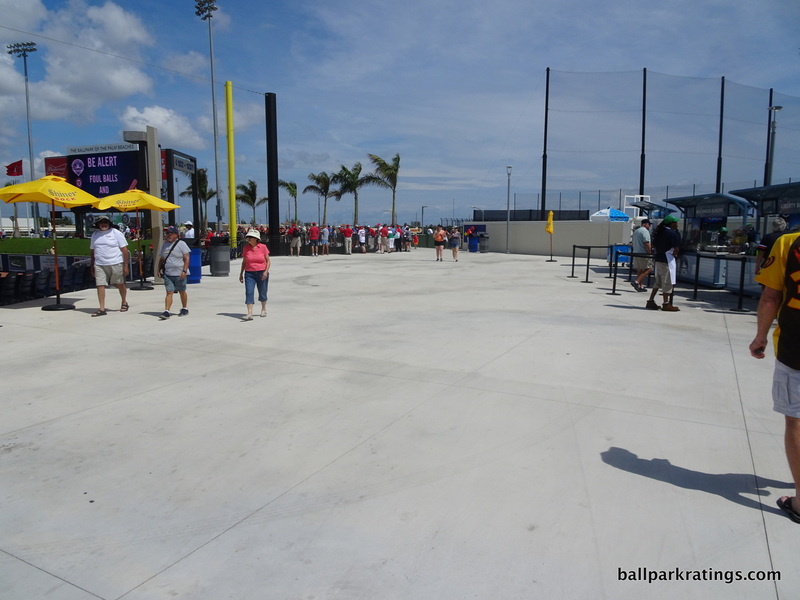 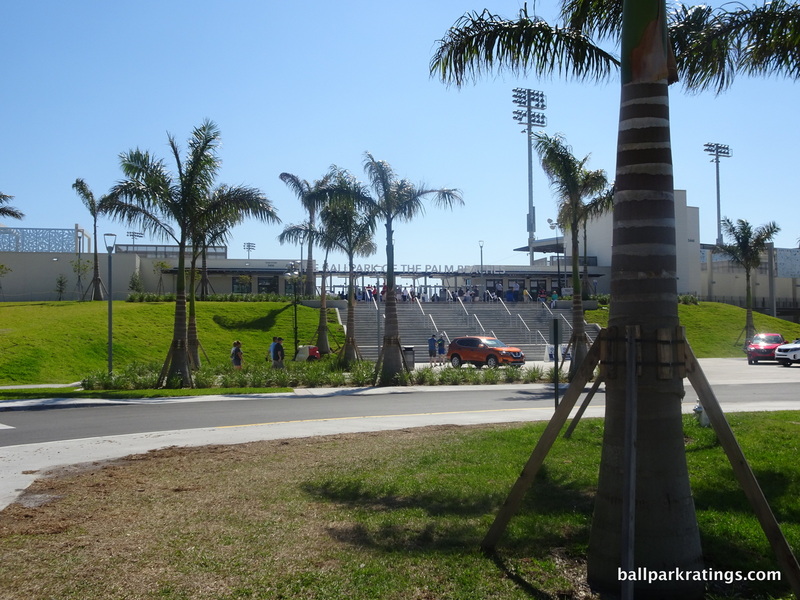 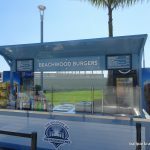 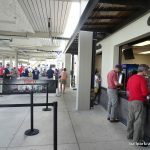 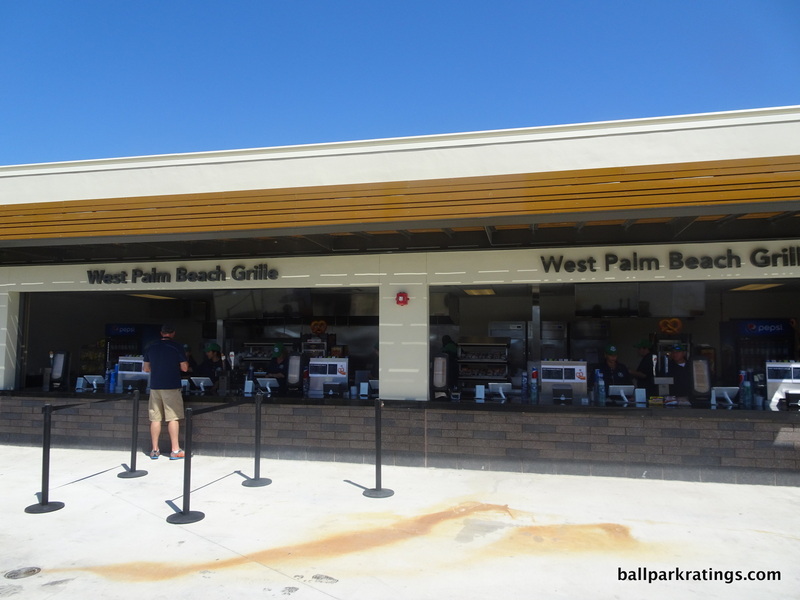 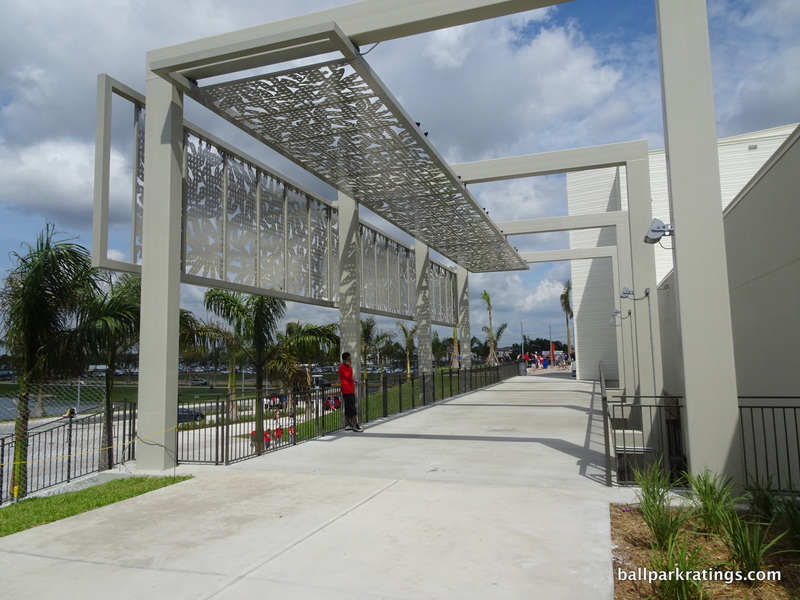 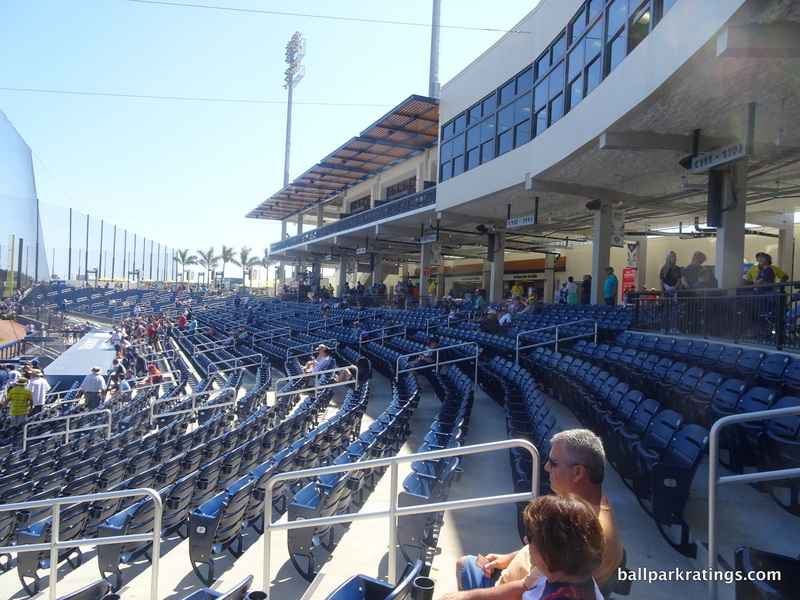 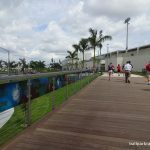 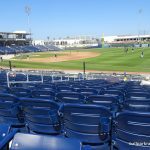 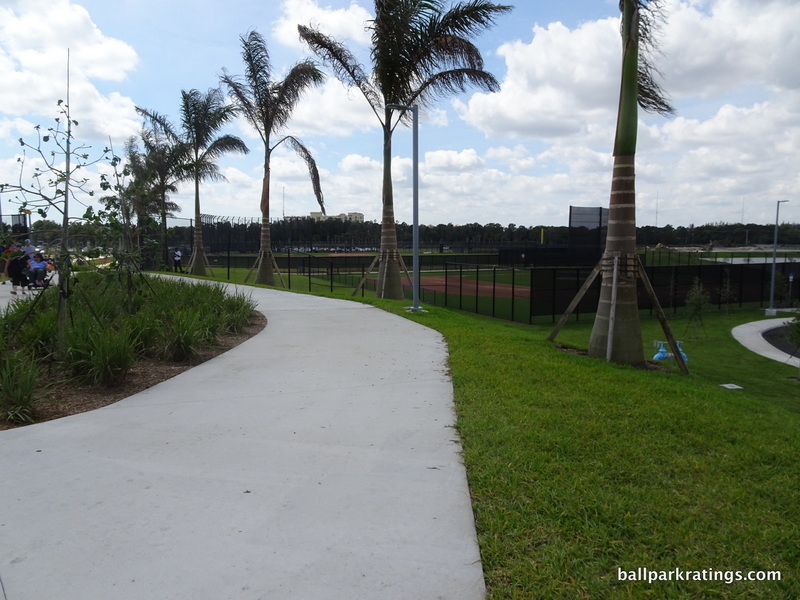 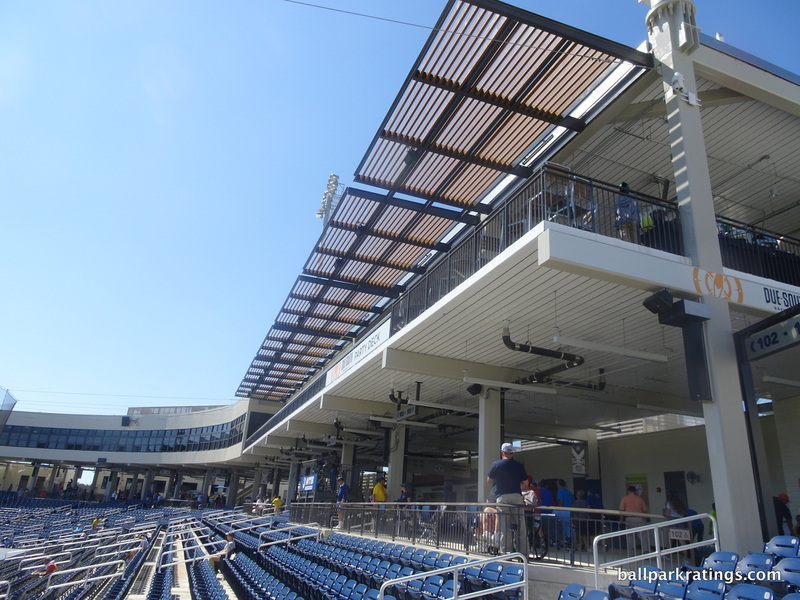 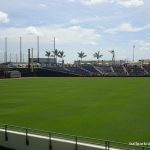 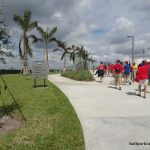 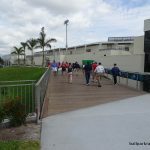 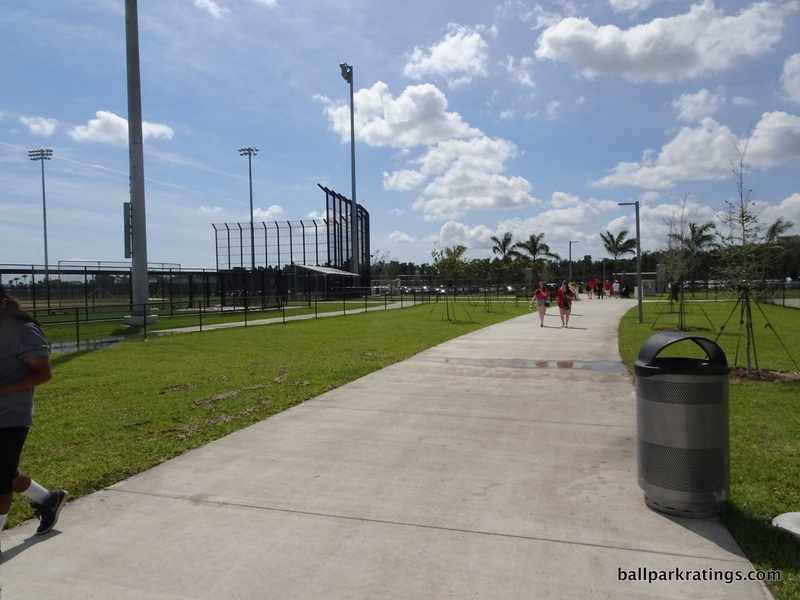 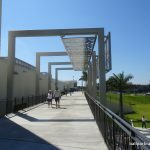 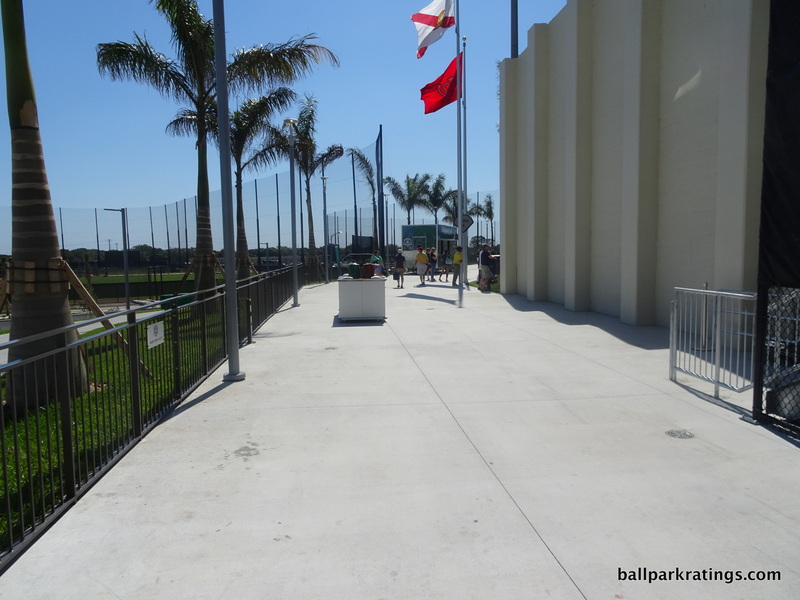 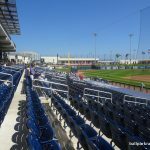 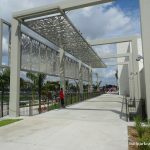 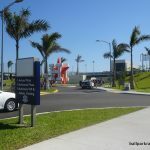 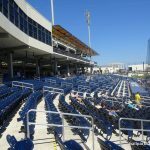 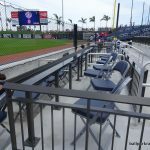 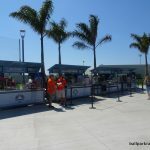 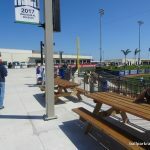 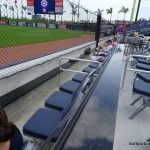 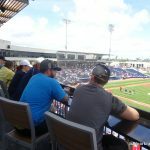 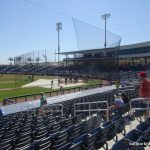 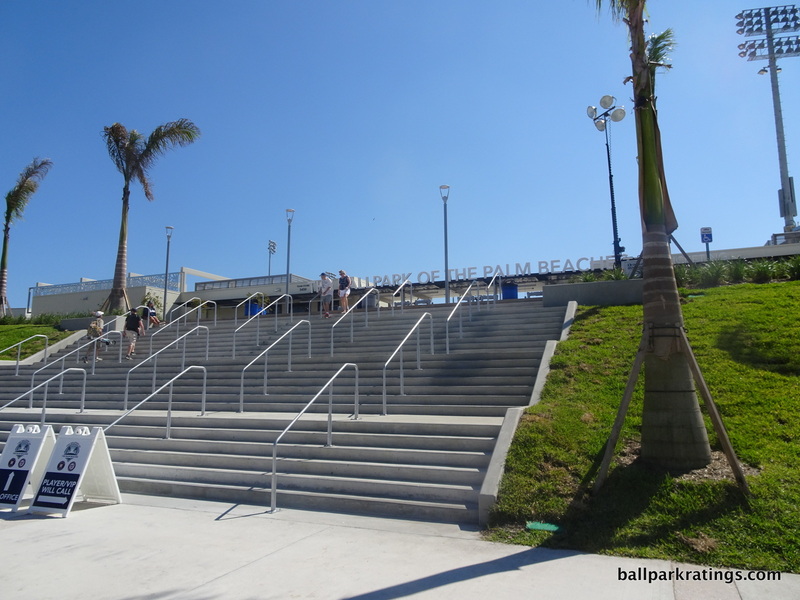 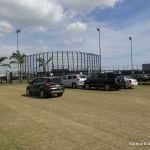 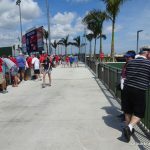 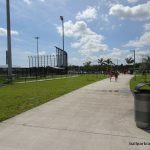 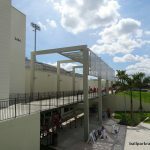 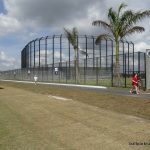 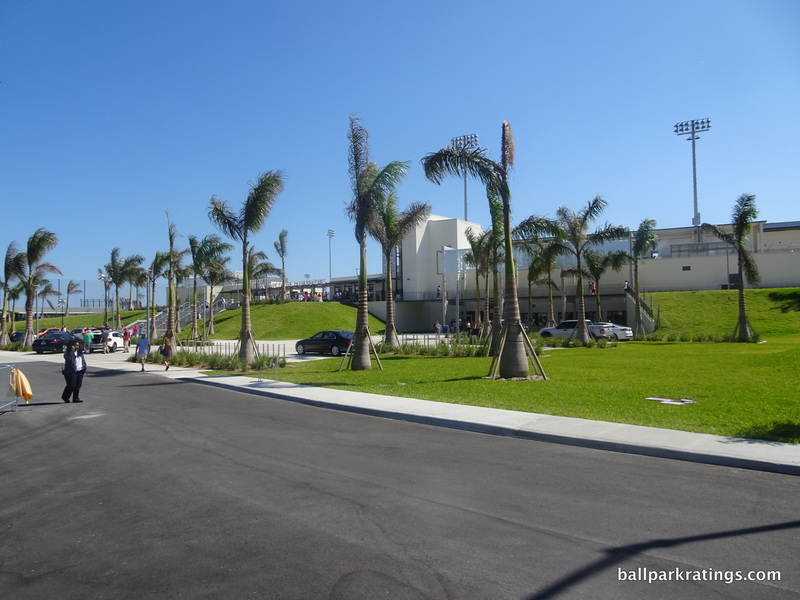 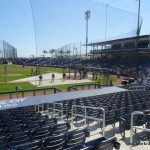 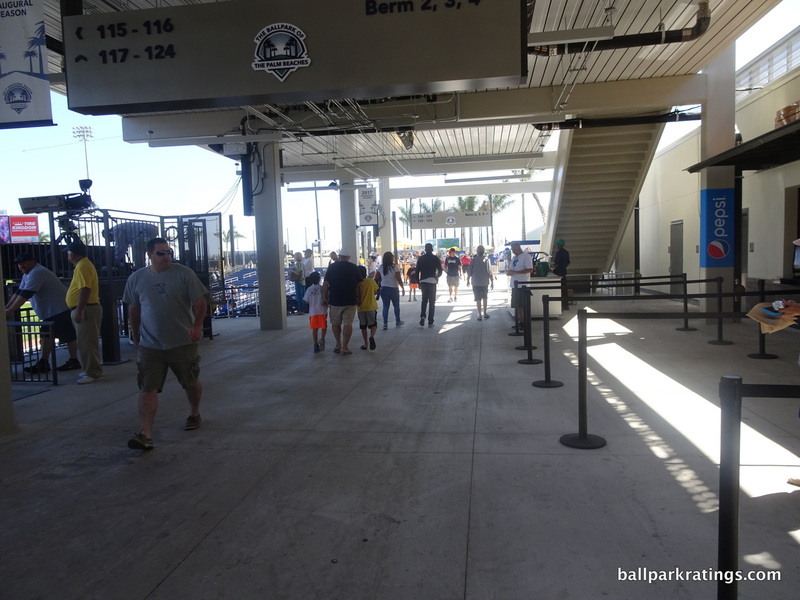 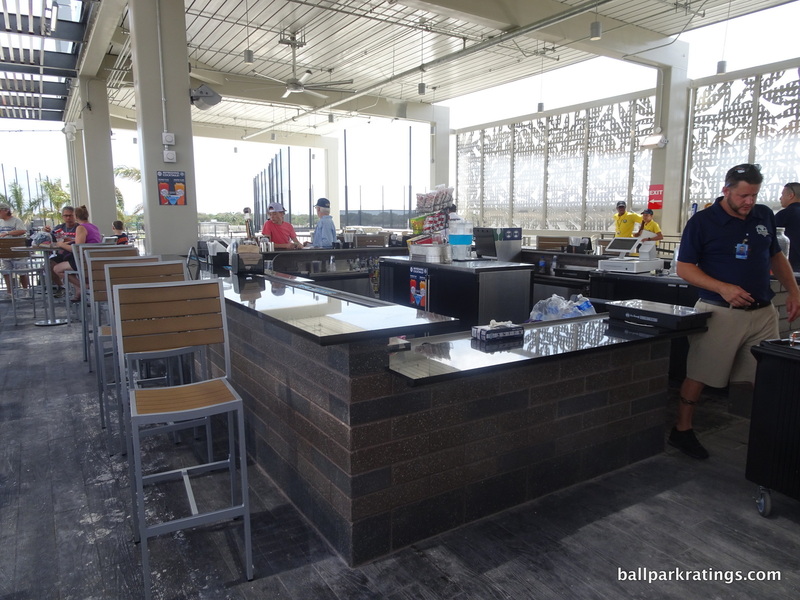 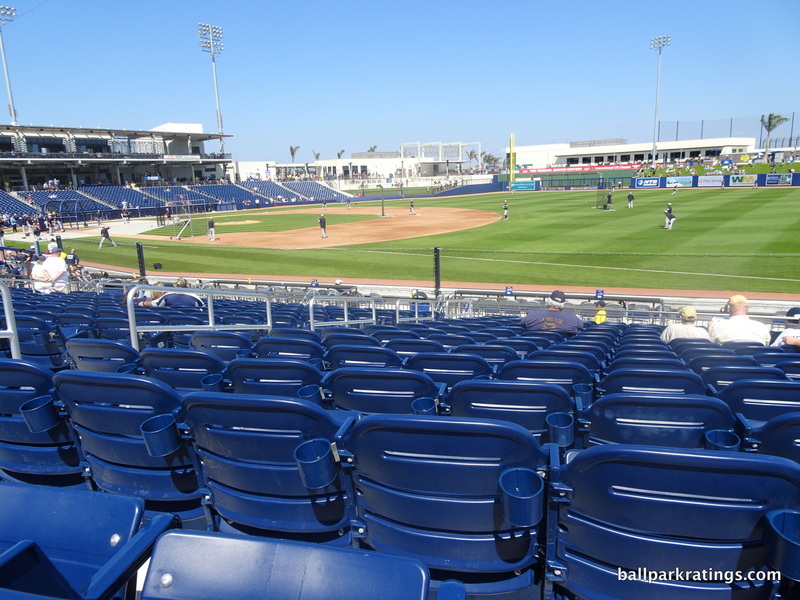 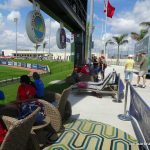 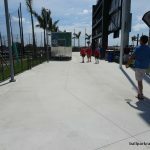 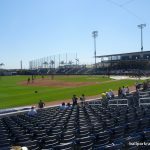 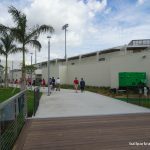 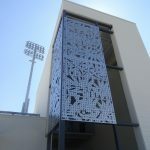 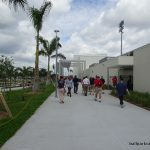 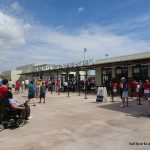 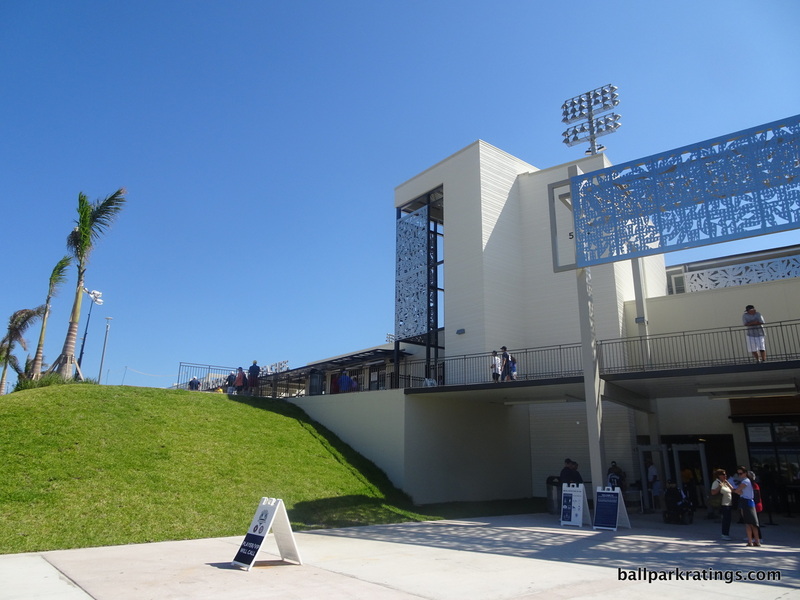 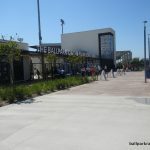 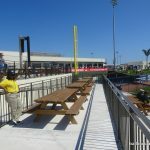 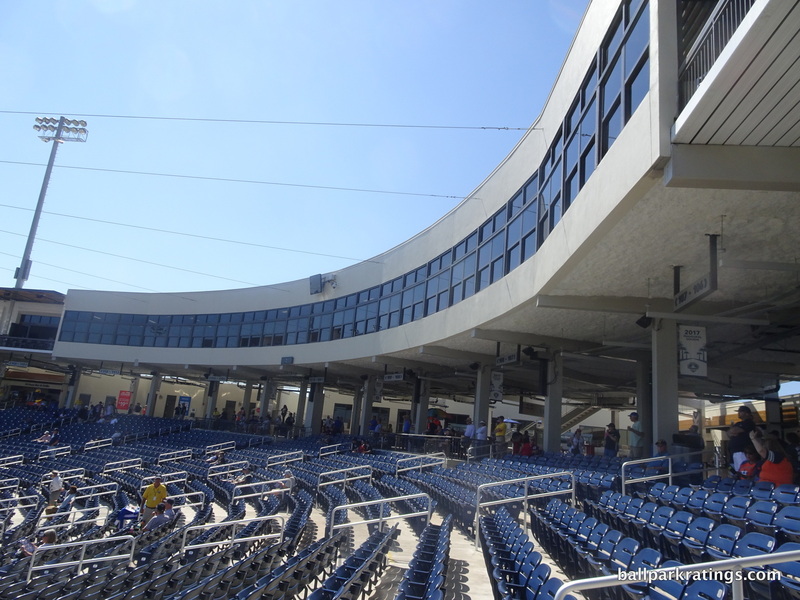 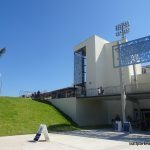 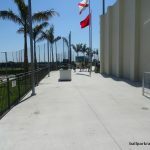 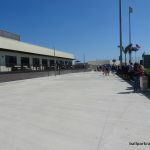 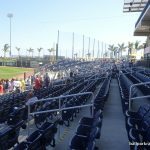 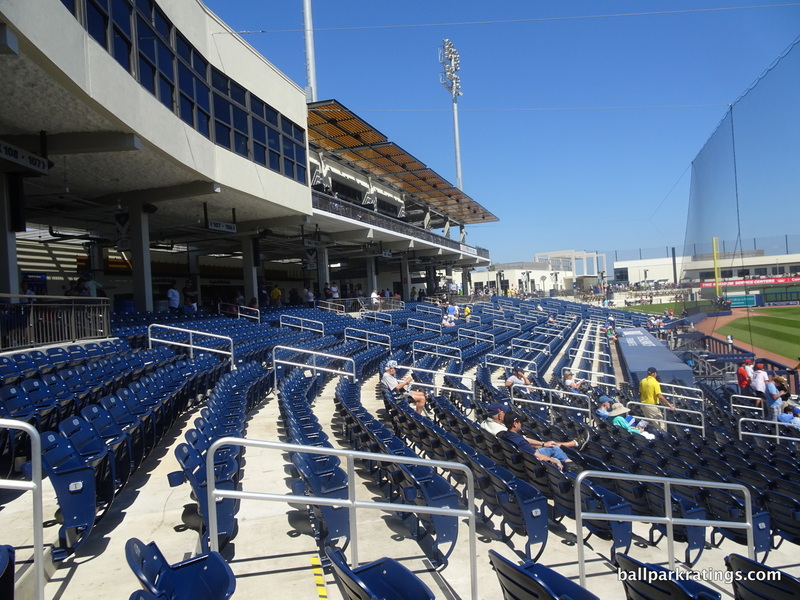 As only the second two-team complex in Florida, and only the second in the state with a 360-degree concourse open to the field, the Ballpark of the Palm Beaches (BPB) is state-of-the-art, but only in a functional sense. 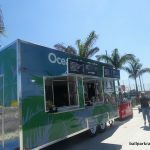 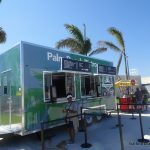 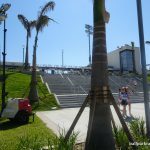 Mostly, it looks like Palm Beach took the bare minimum of what constitutes a successful 21stcentury venue without incorporating any thoughtful touches or fan-friendly features of its own. 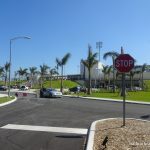 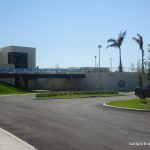 In other words, BPB looks like a template, a generic starting point that wasn’t developed to full fruition, as aesthetic flourishes are minimal, amenities are considerably downscaled, and the atmosphere is as generic as it gets. 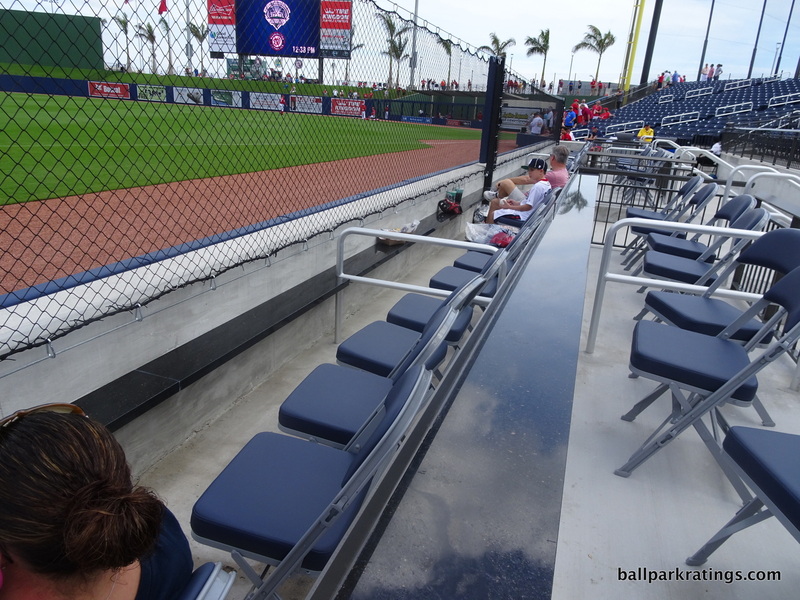 Overall, the park scores fine because of functionality that laps the field and a lingering impression of newness, but this is the biggest ballpark disappointment in recent memory for me. 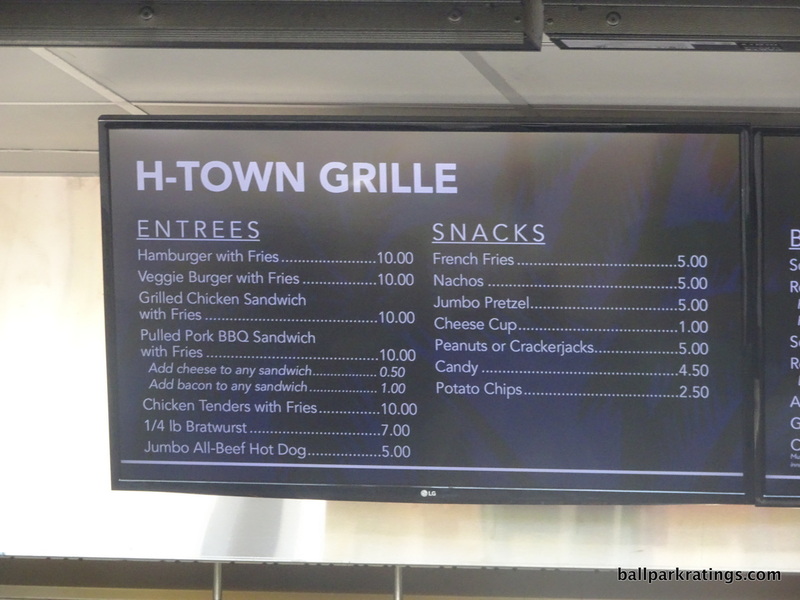 On paper, BPB did some things right, but it’s lacking so much. 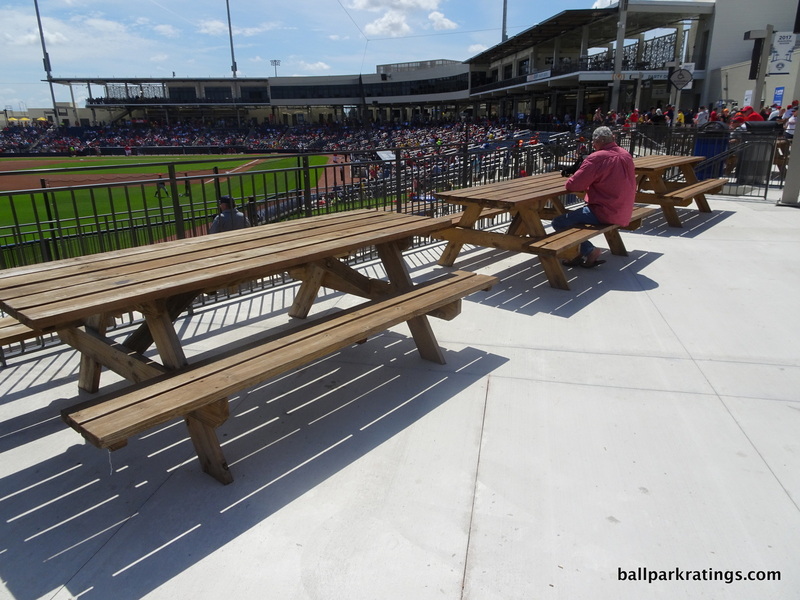 Other than those truly forward-thinking projects in Arizona, I’m starting to wonder whether the inherent constraints that come with renovating a park lend themselves to more innovation and creativity. 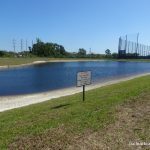 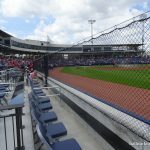 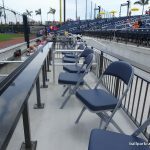 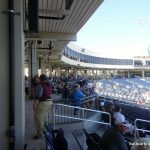 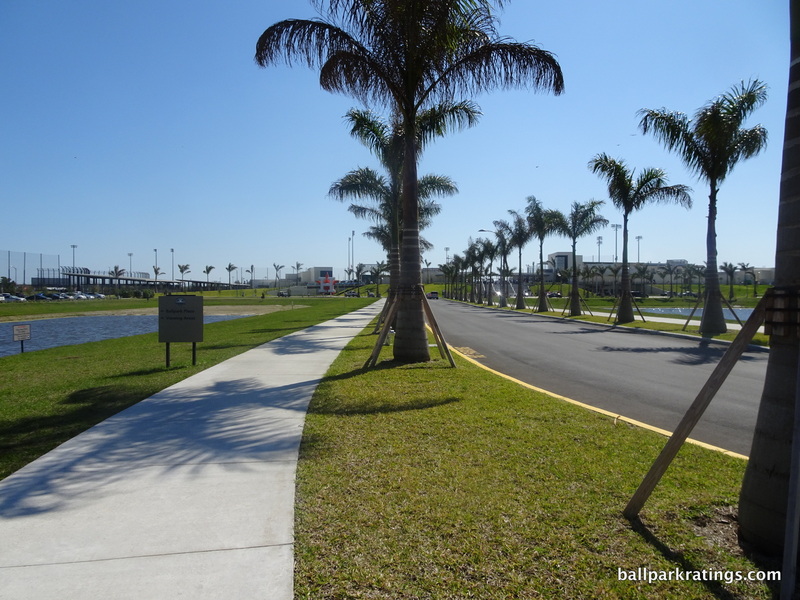 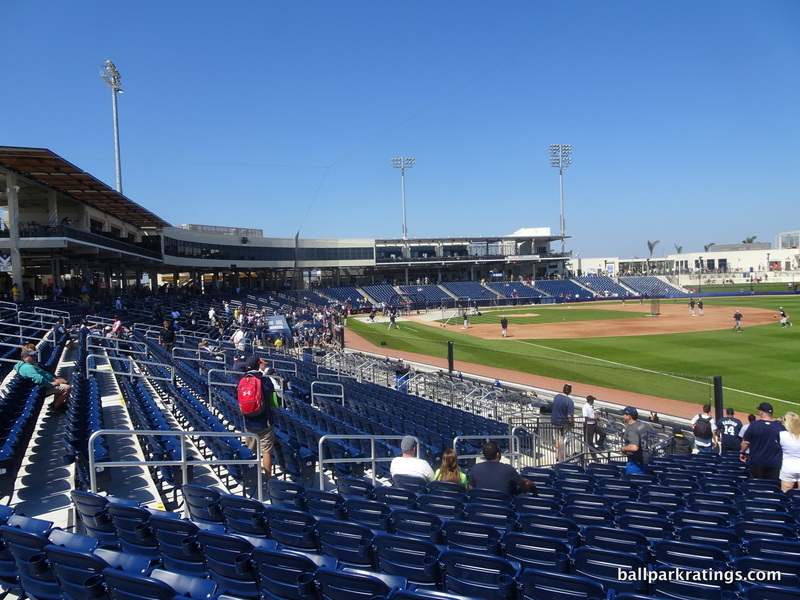 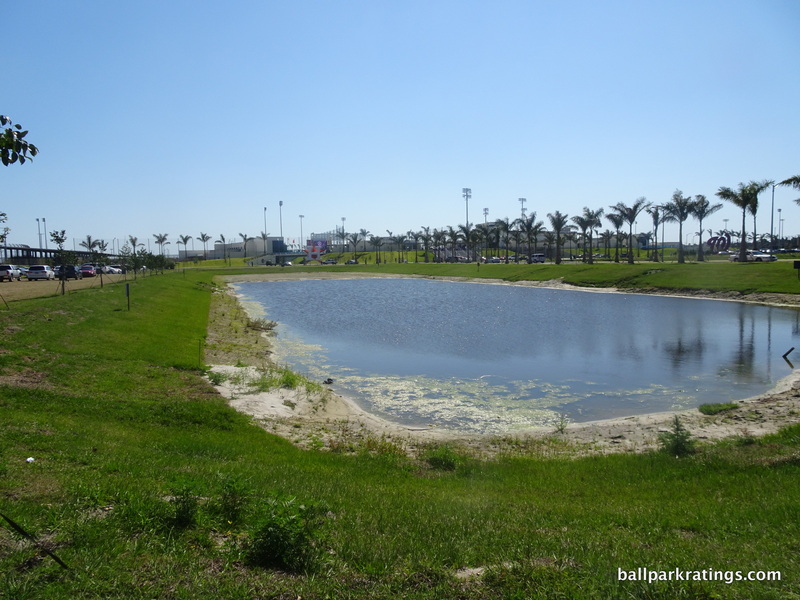 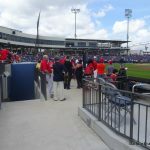 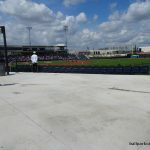 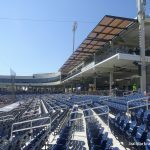 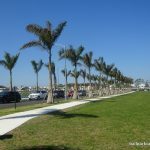 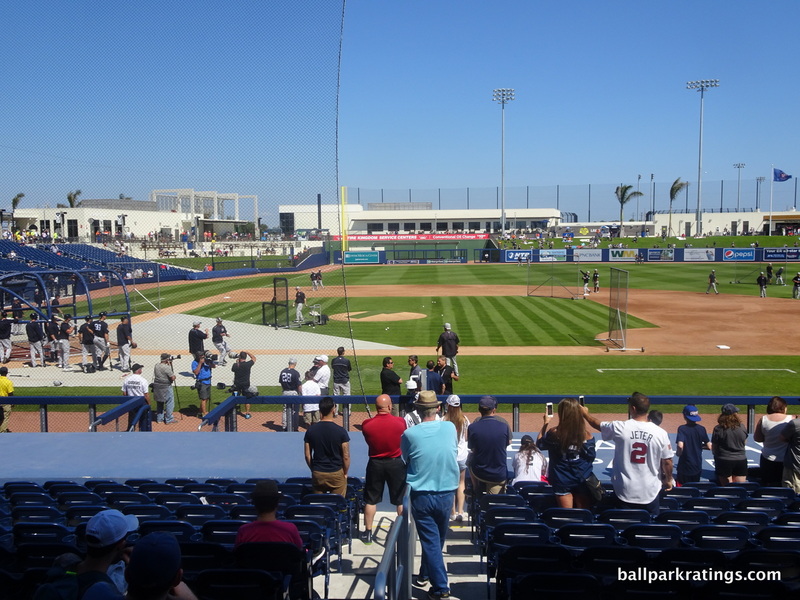 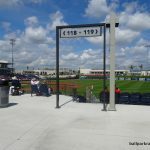 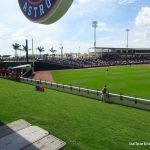 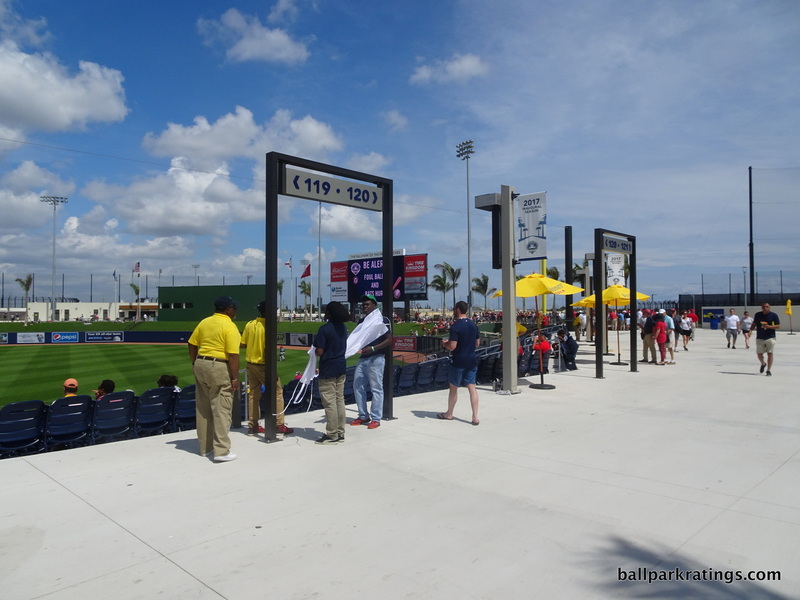 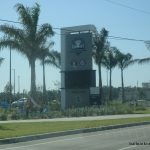 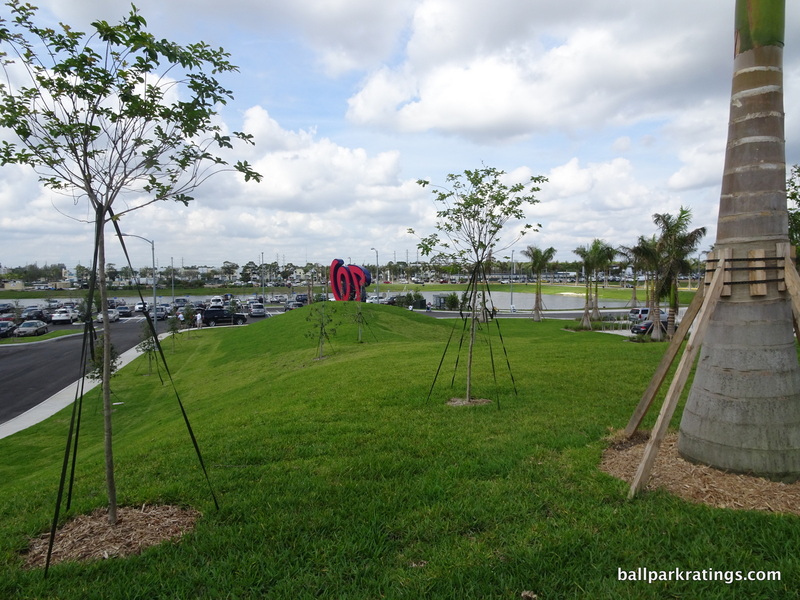 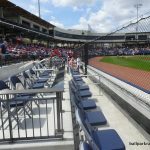 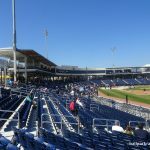 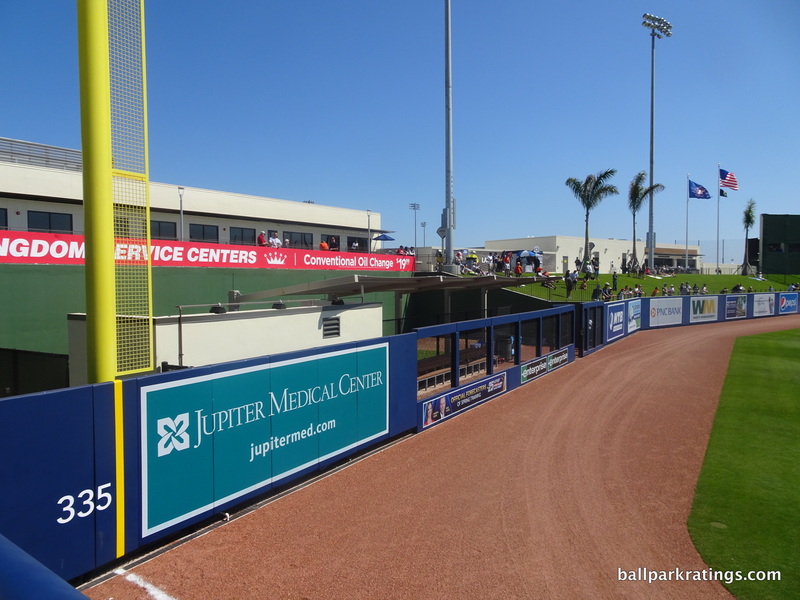 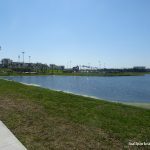 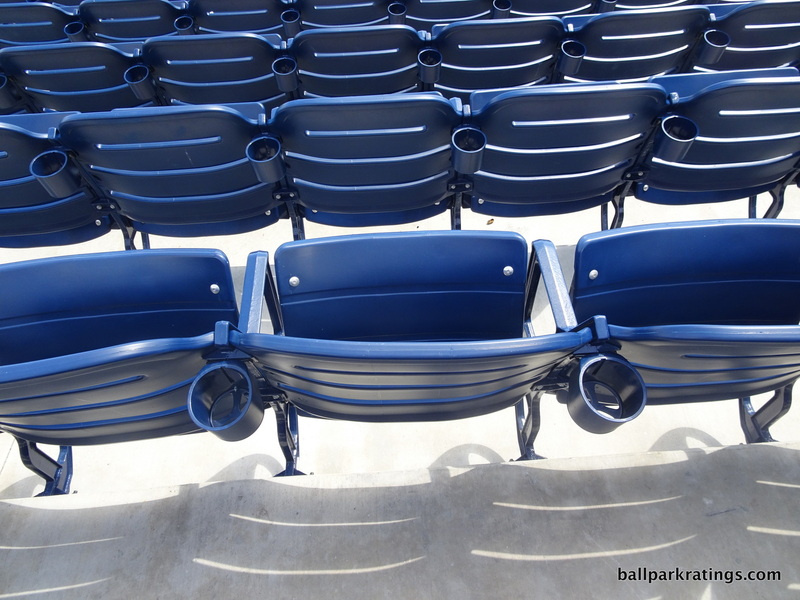 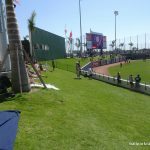 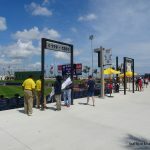 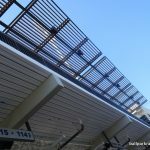 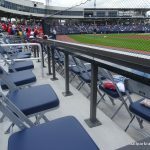 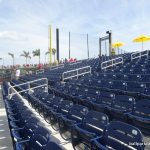 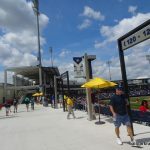 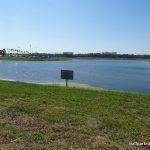 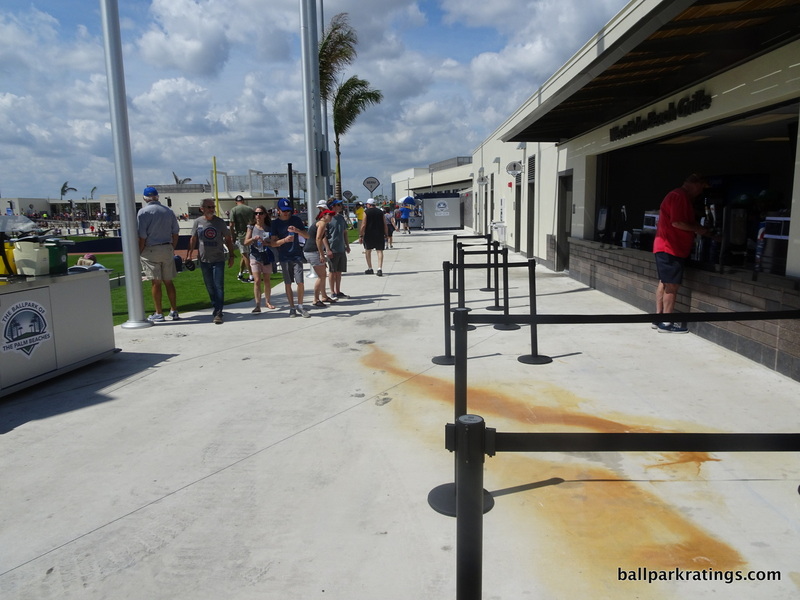 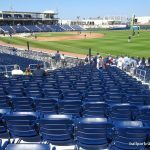 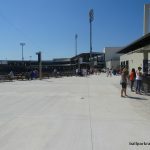 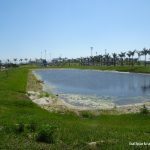 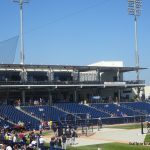 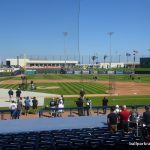 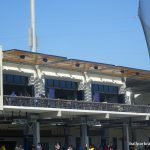 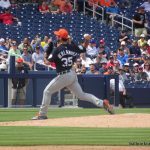 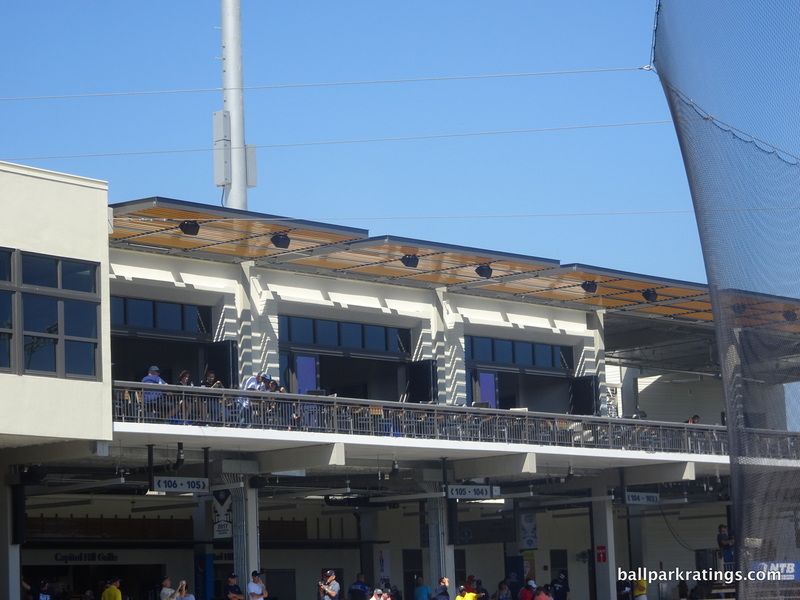 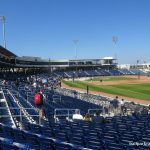 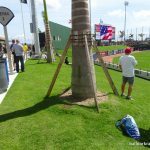 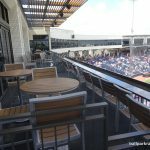 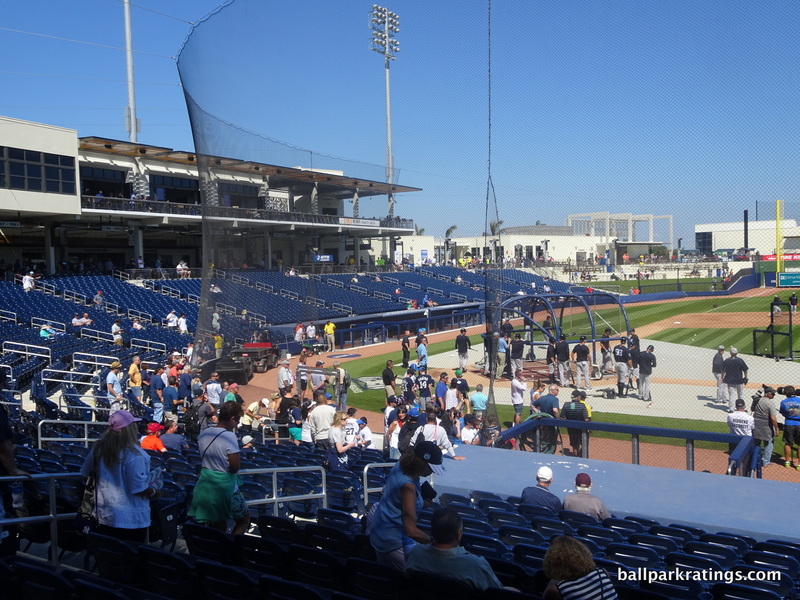 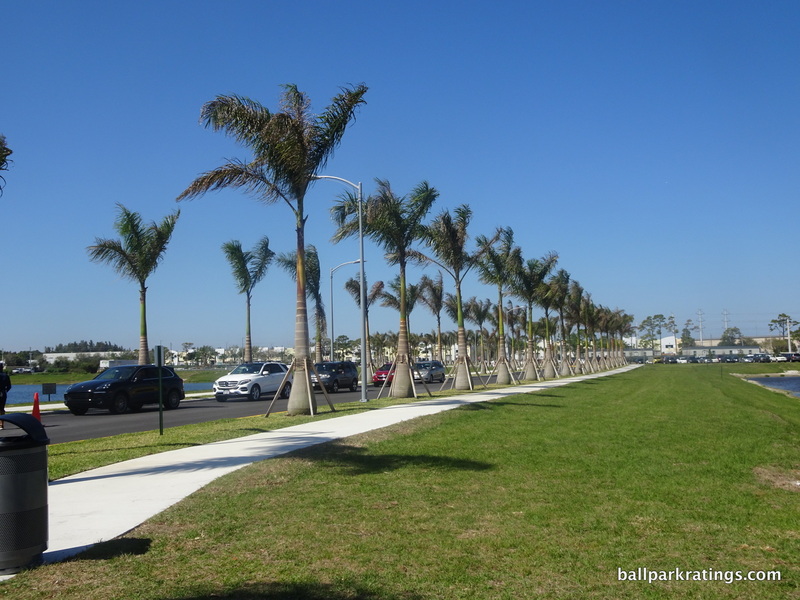 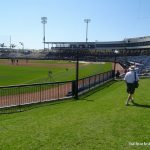 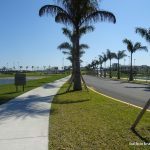 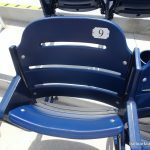 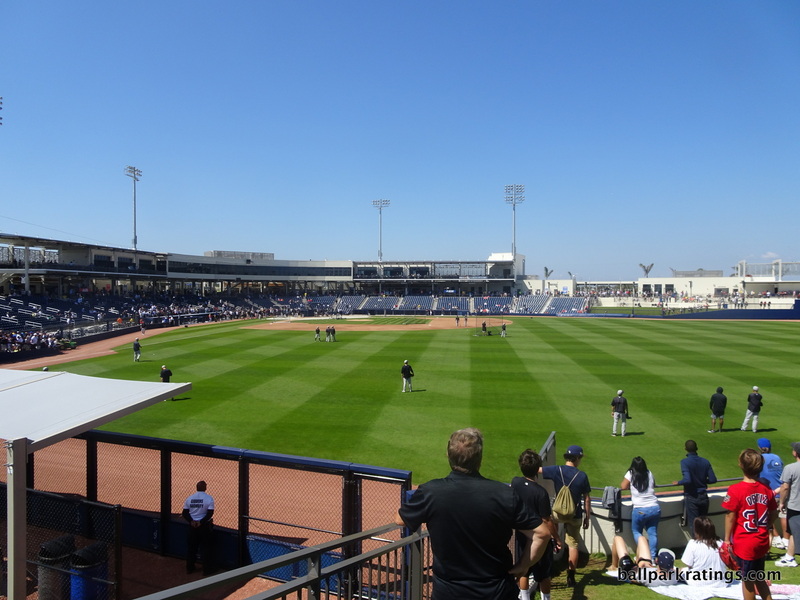 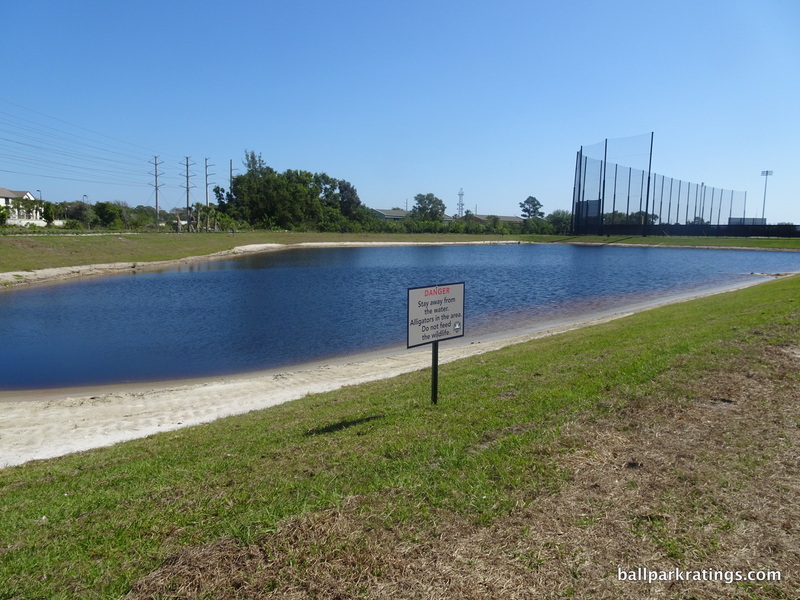 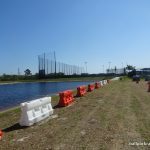 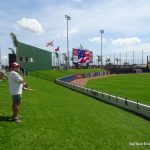 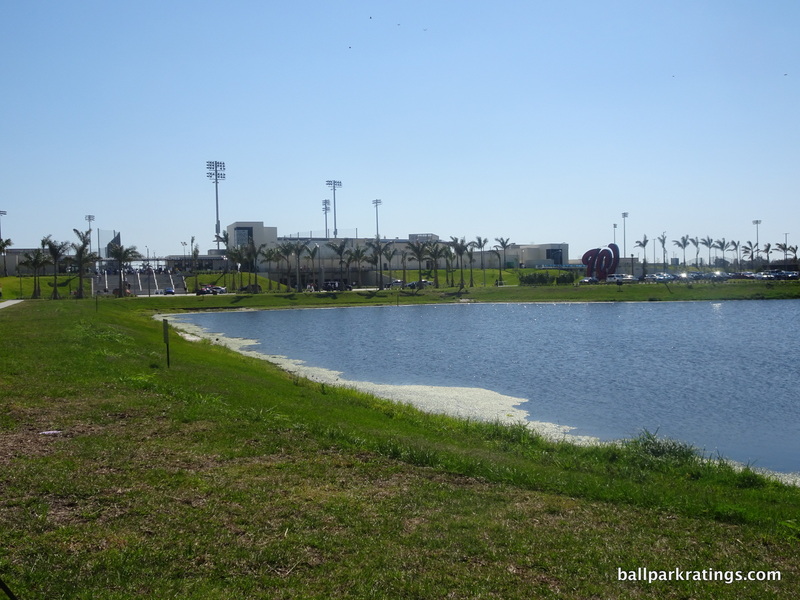 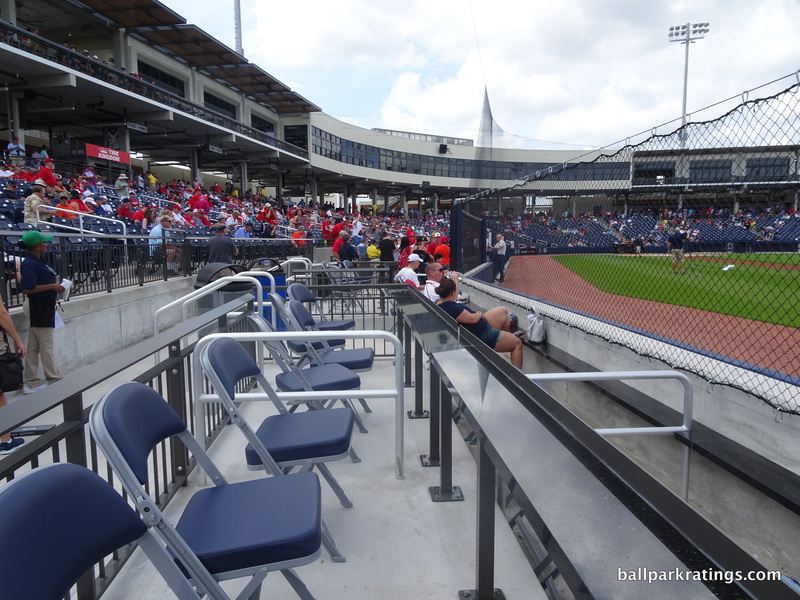 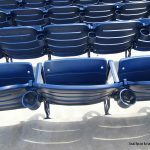 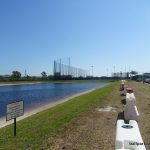 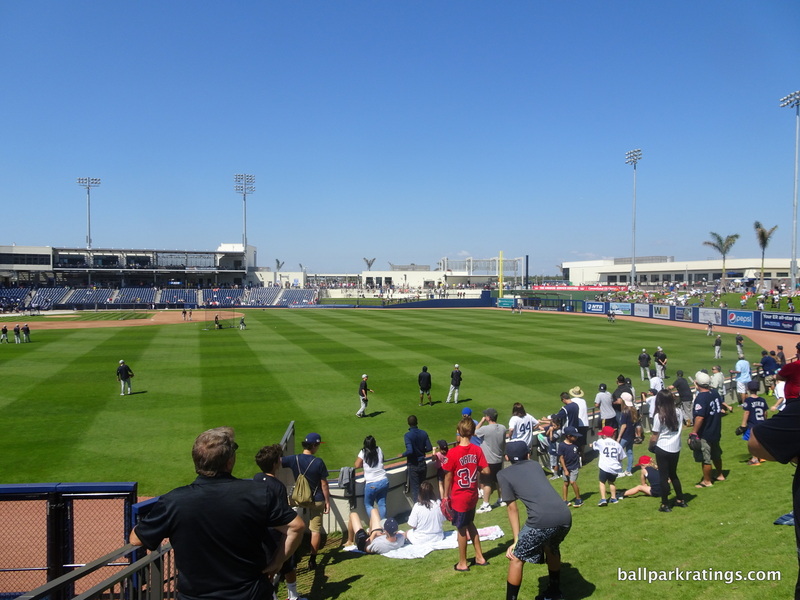 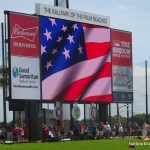 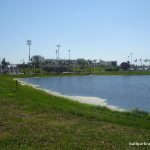 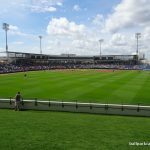 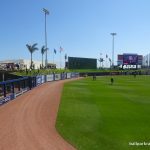 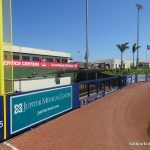 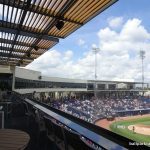 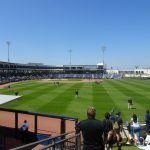 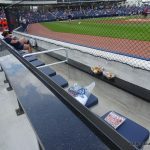 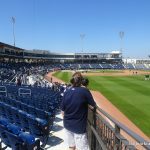 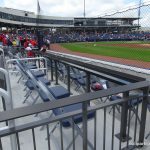 BPB’s deficits were readily apparent compared to the two newly renovated projects in Florida in 2017: Publix Field at Joker Marchant Stadium (Tigers) and Steinbrenner Field (Yankees). 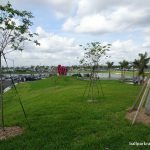 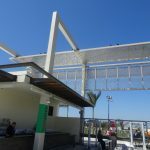 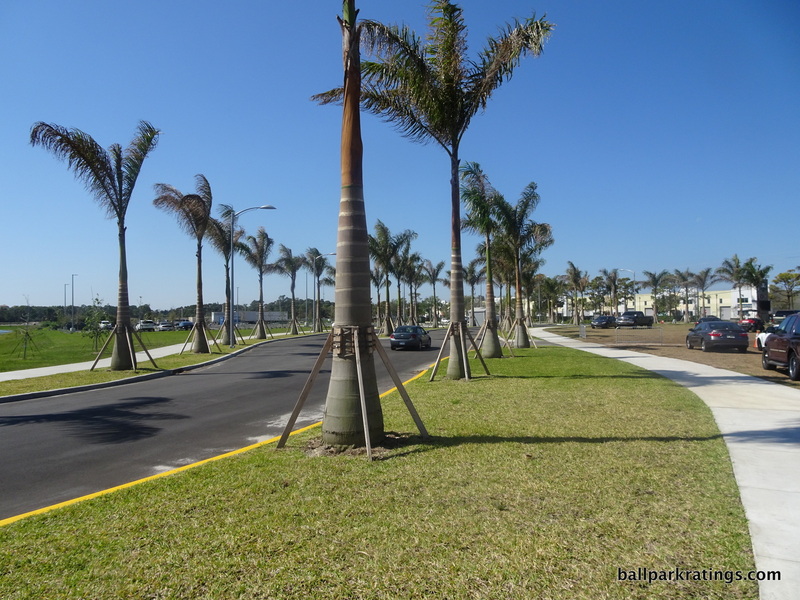 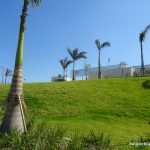 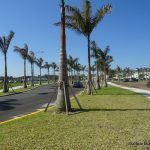 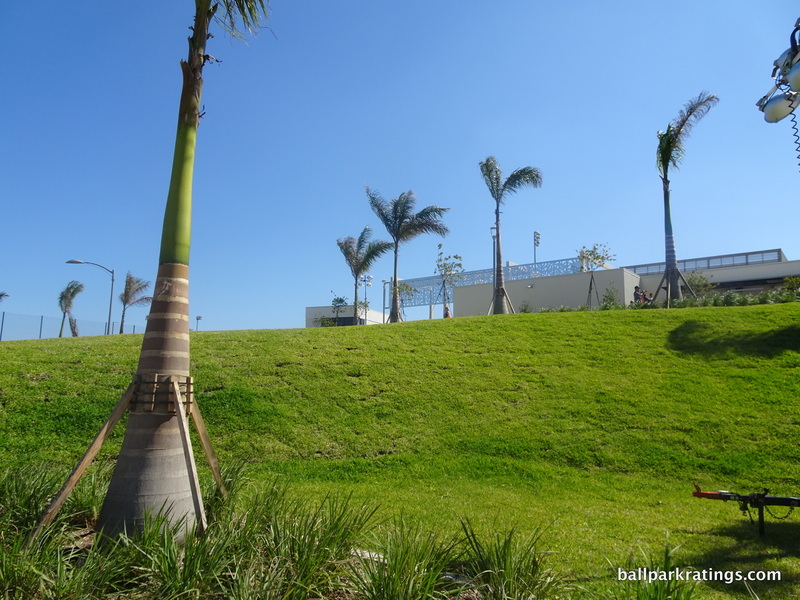 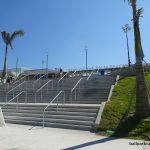 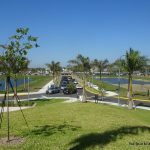 BPB doesn’t have anything like the expansive berm bars, destination social spaces, climate-controlled eateries, upscale clubs, thoughtful premium seating options, tasty concessions, or even the kids’ areas of those two parks. 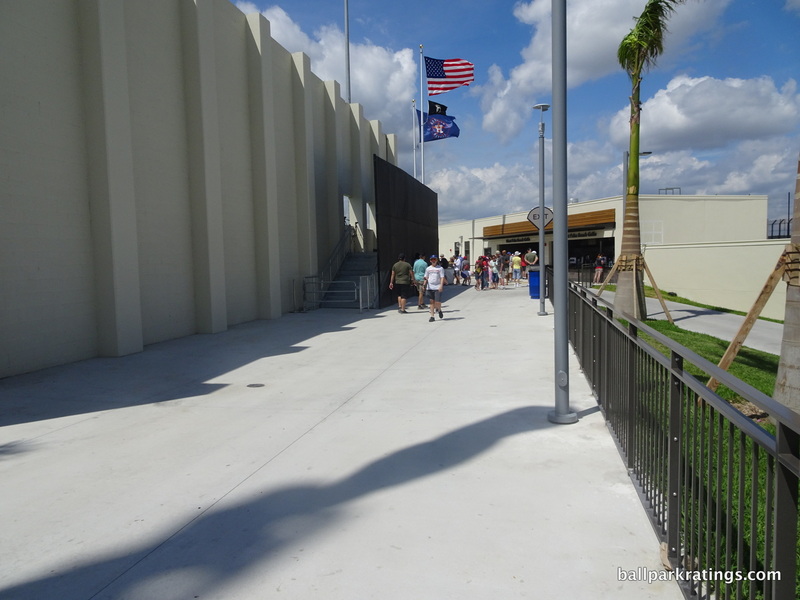 The lack of amenities at BPB is the most glaring disappointment of all. 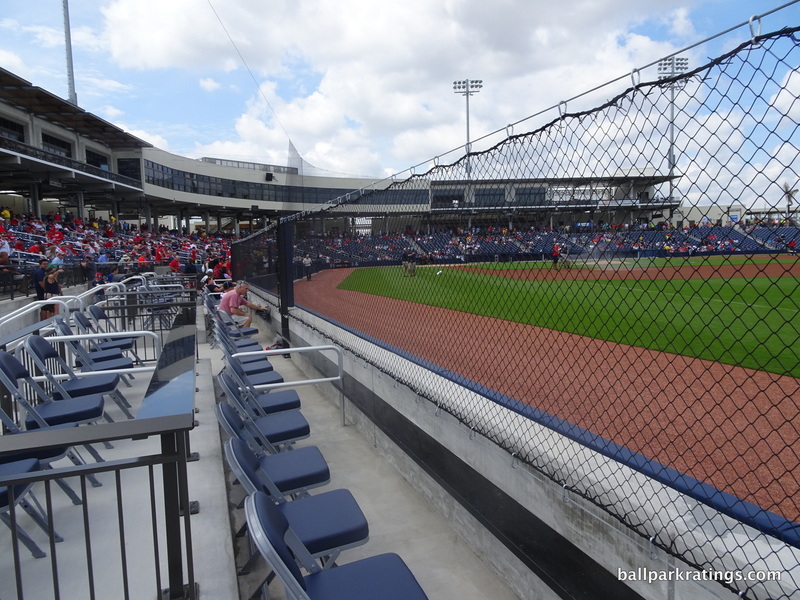 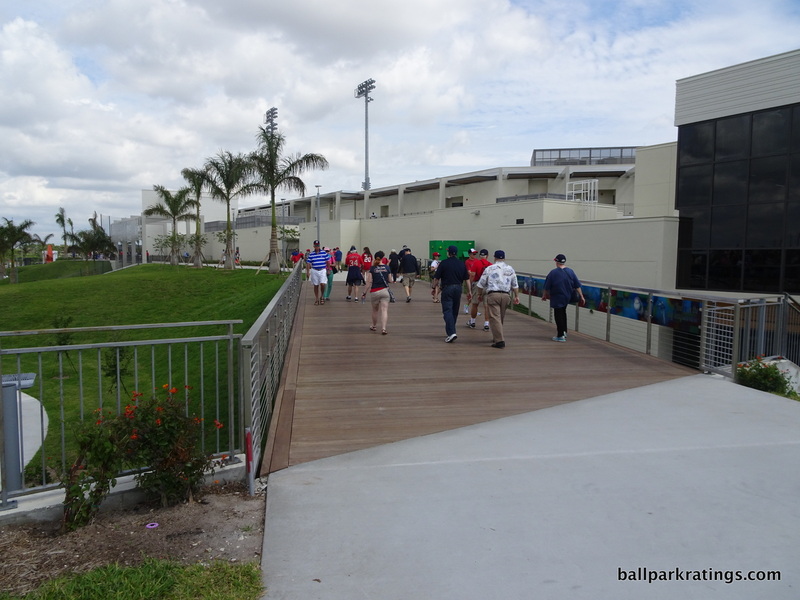 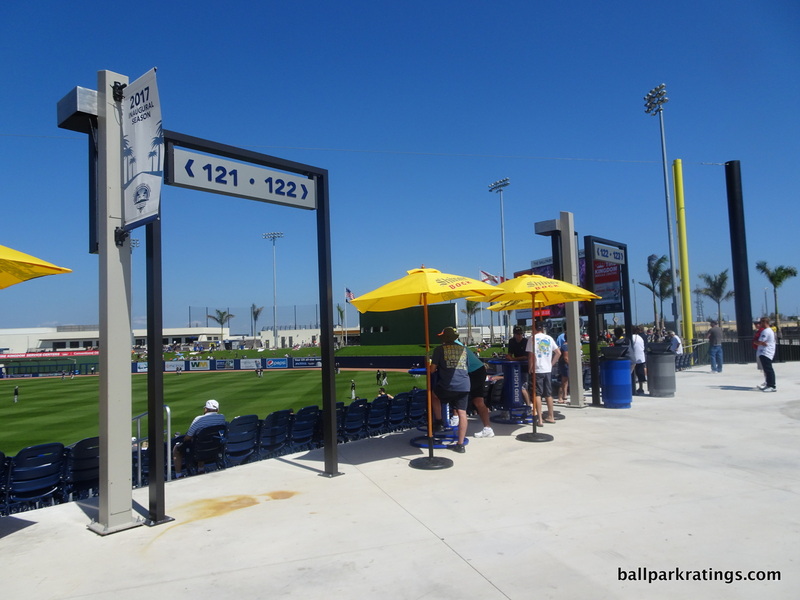 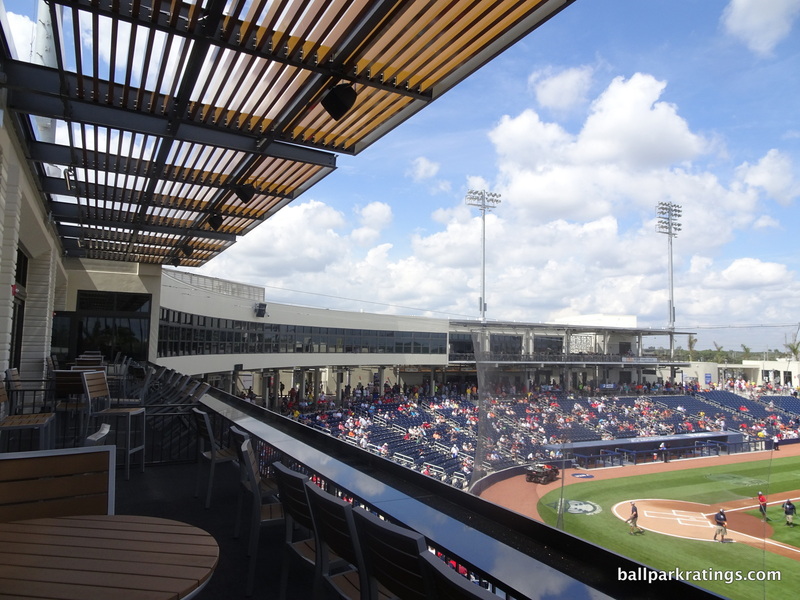 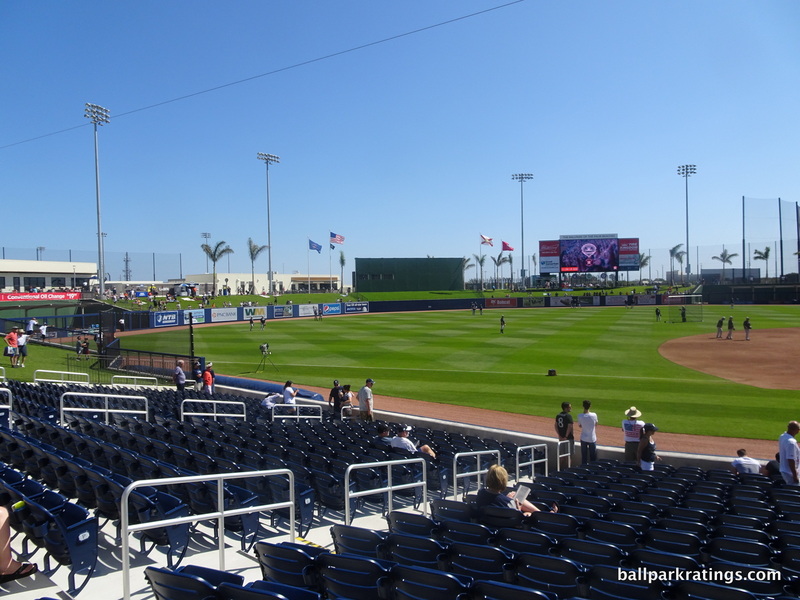 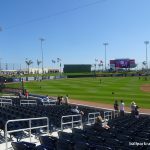 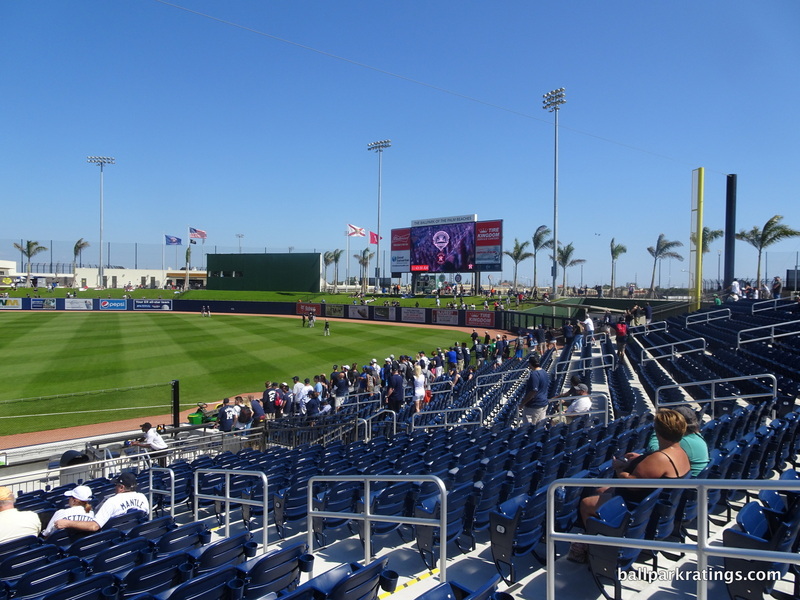 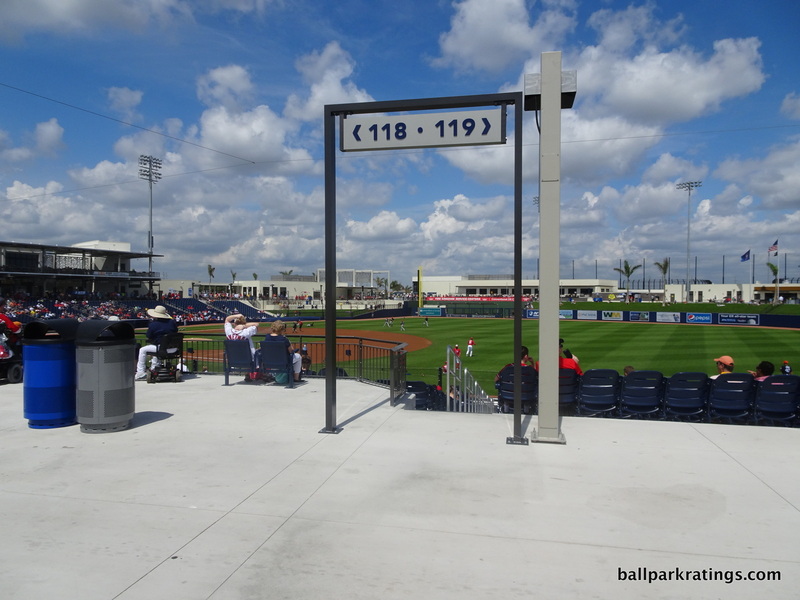 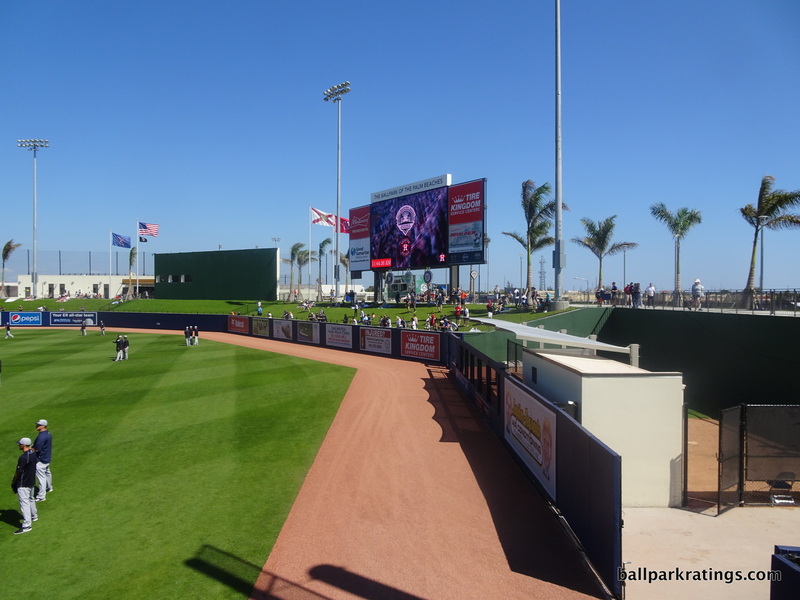 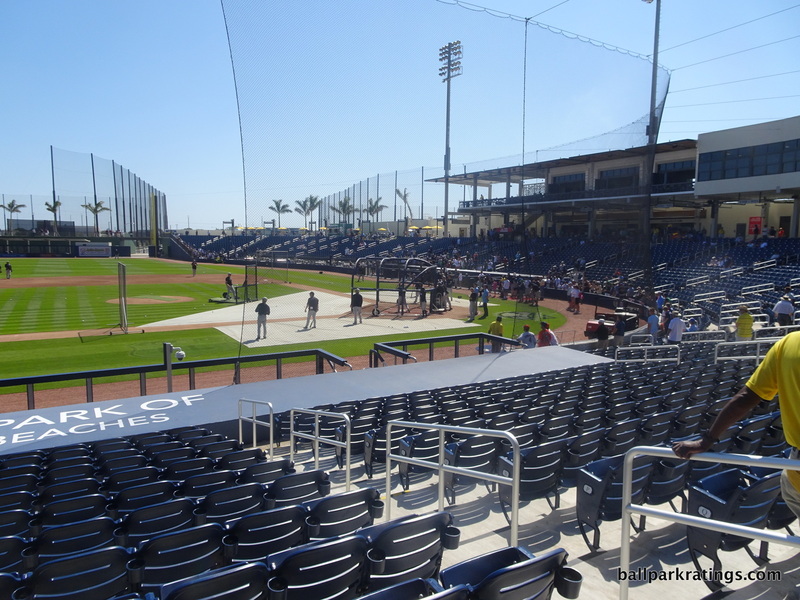 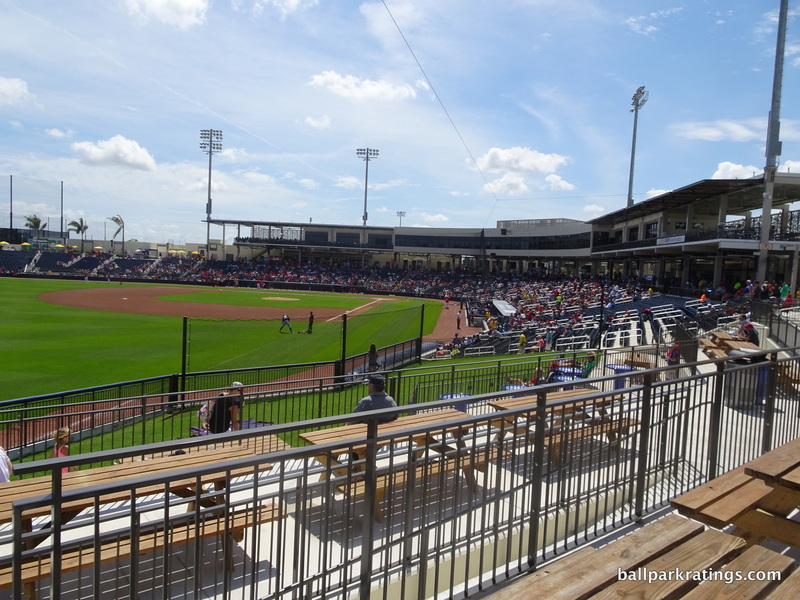 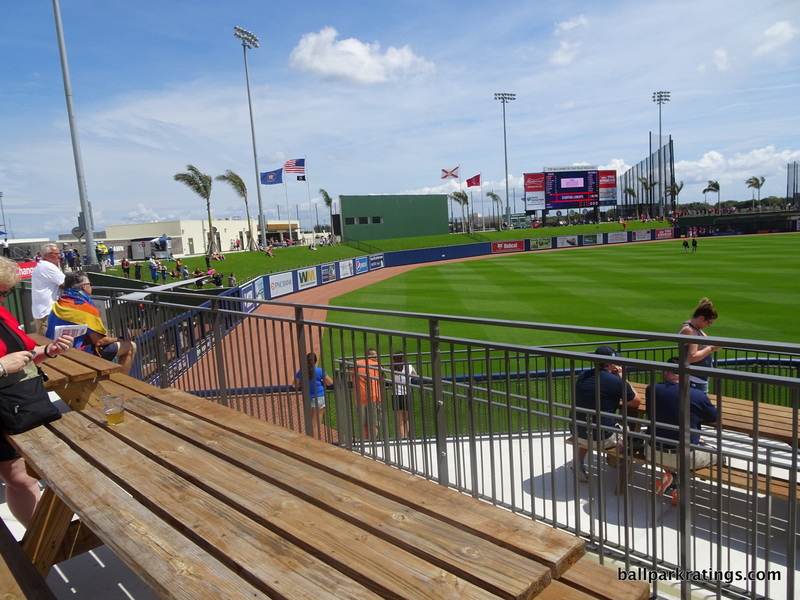 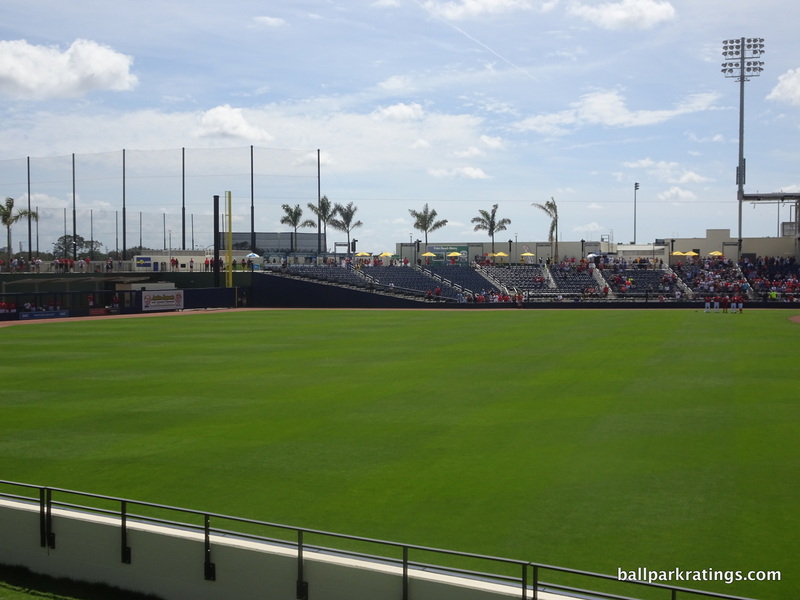 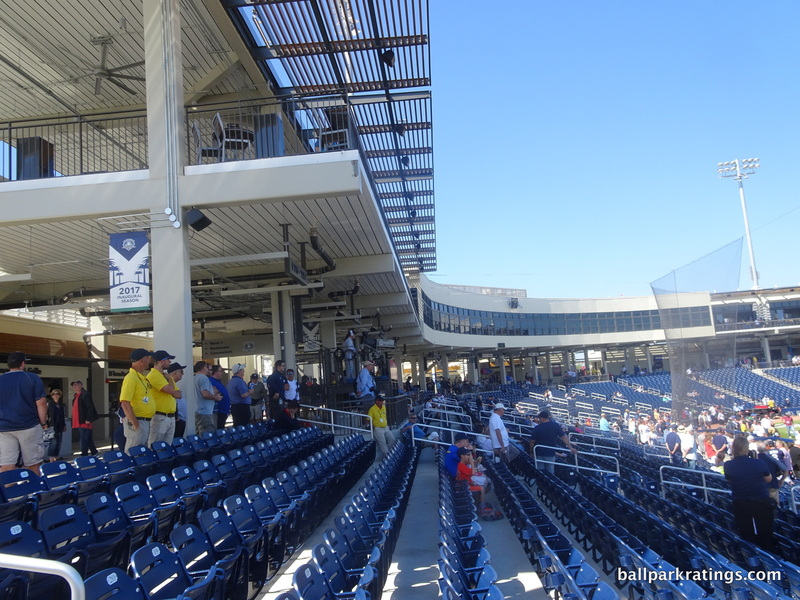 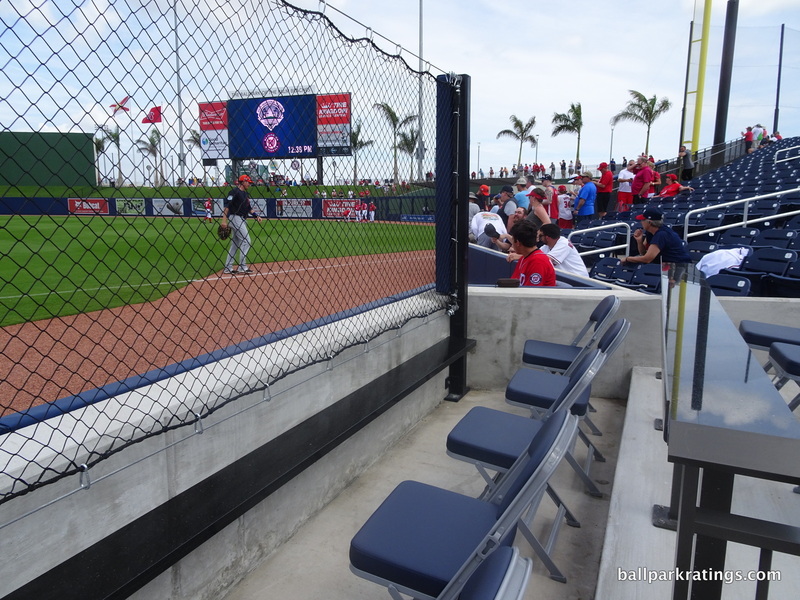 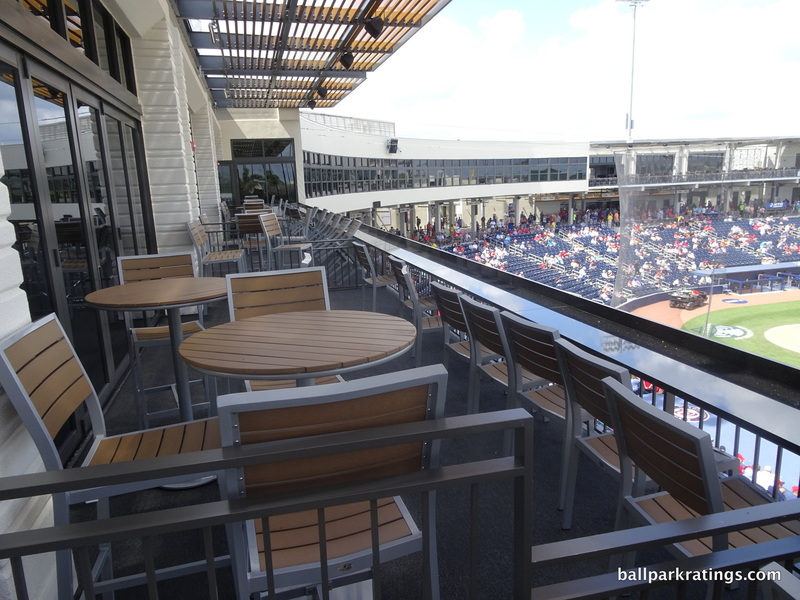 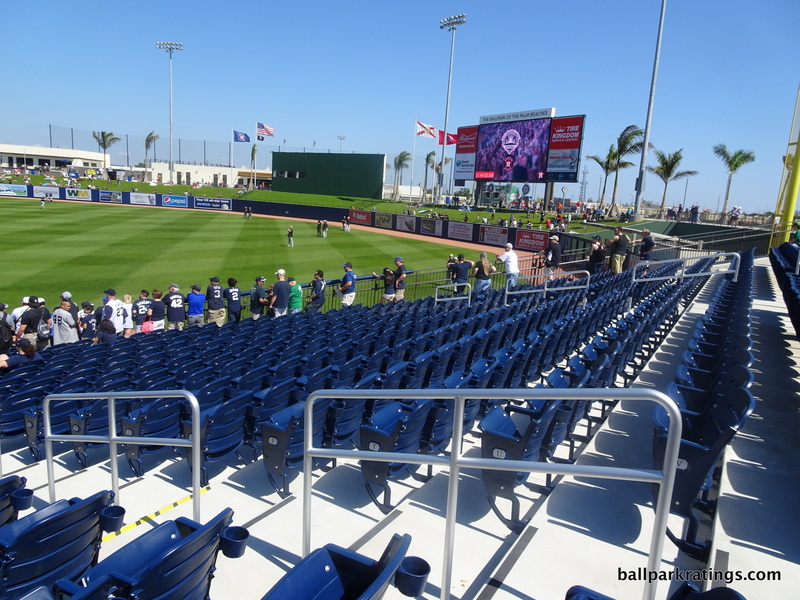 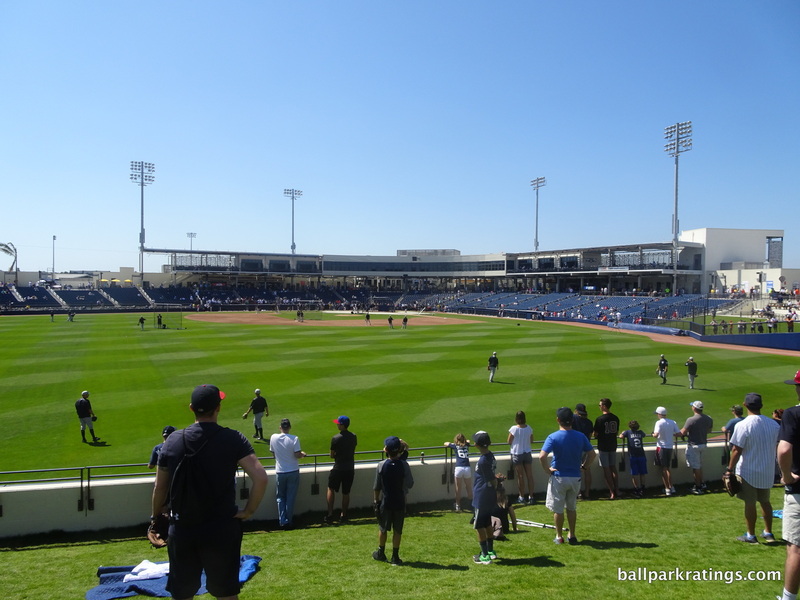 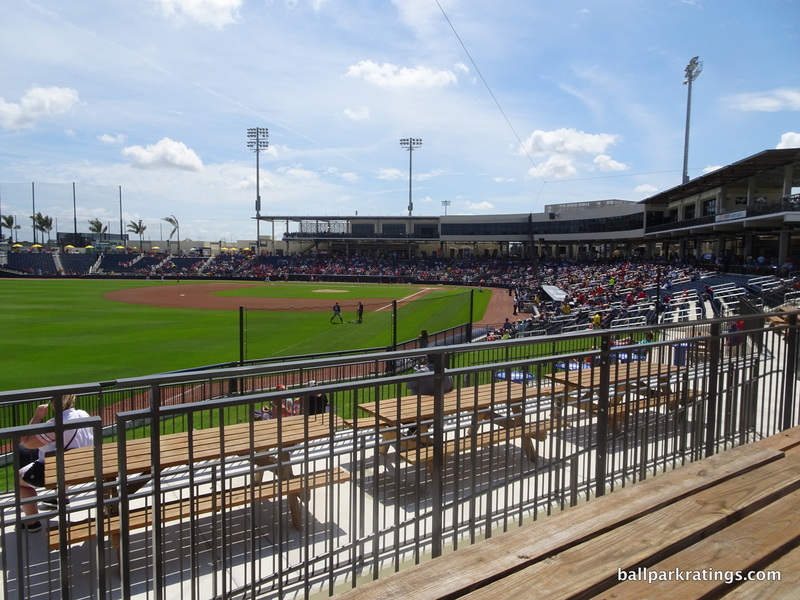 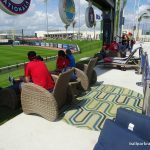 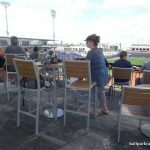 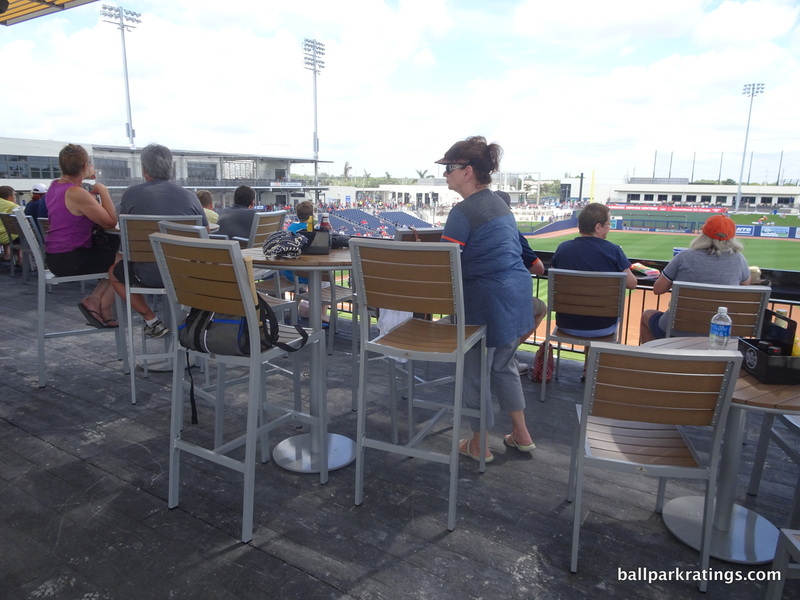 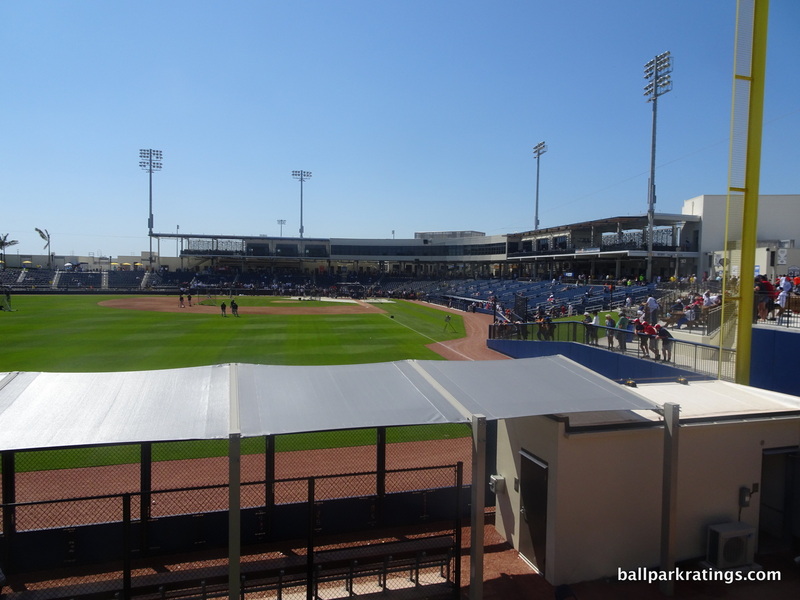 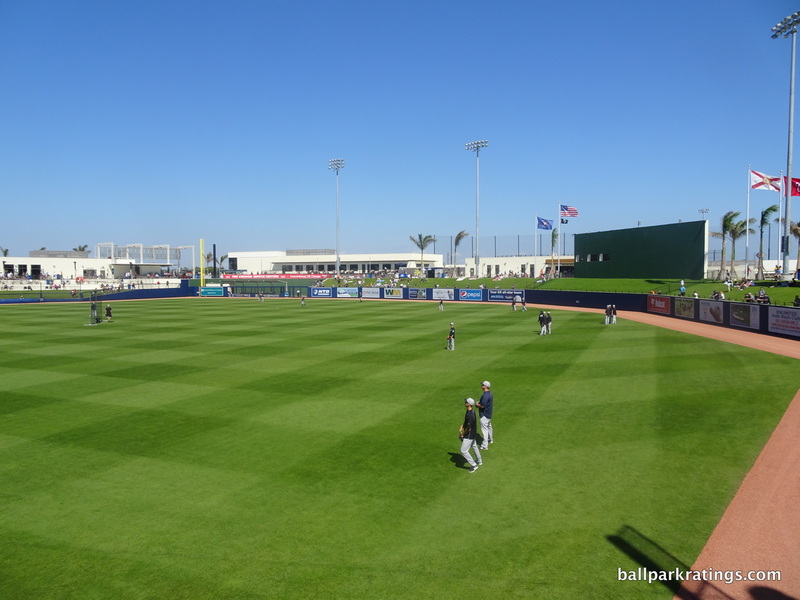 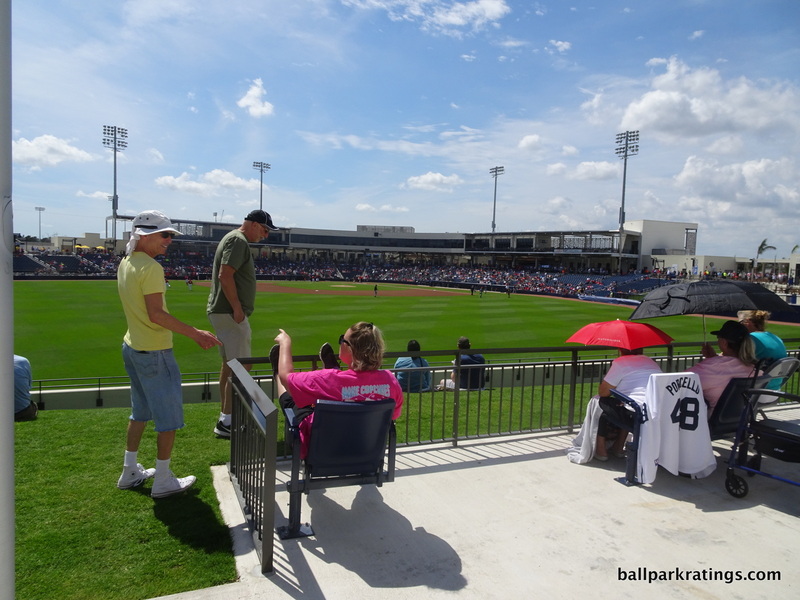 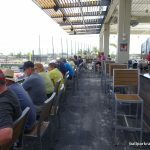 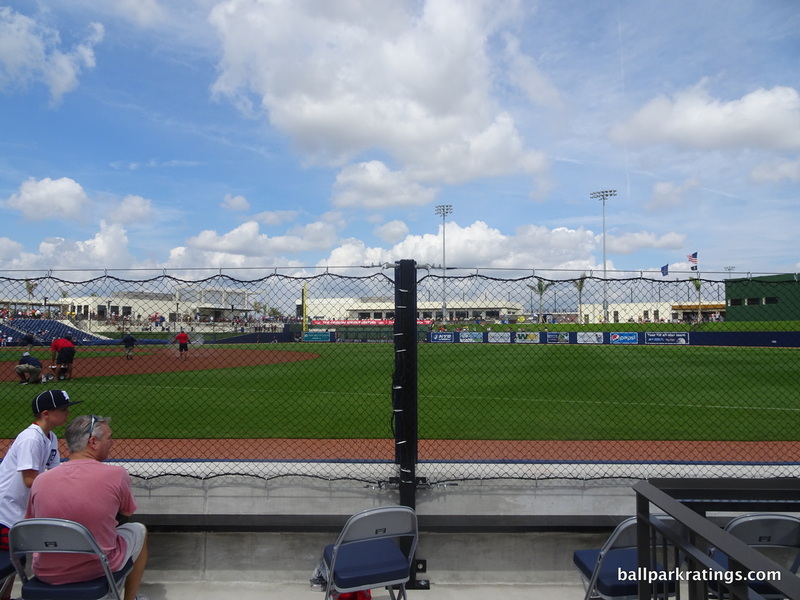 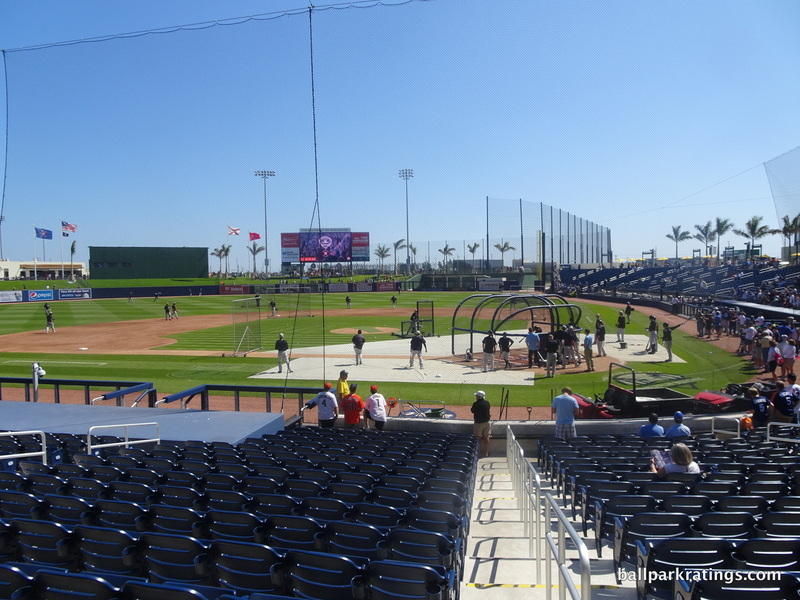 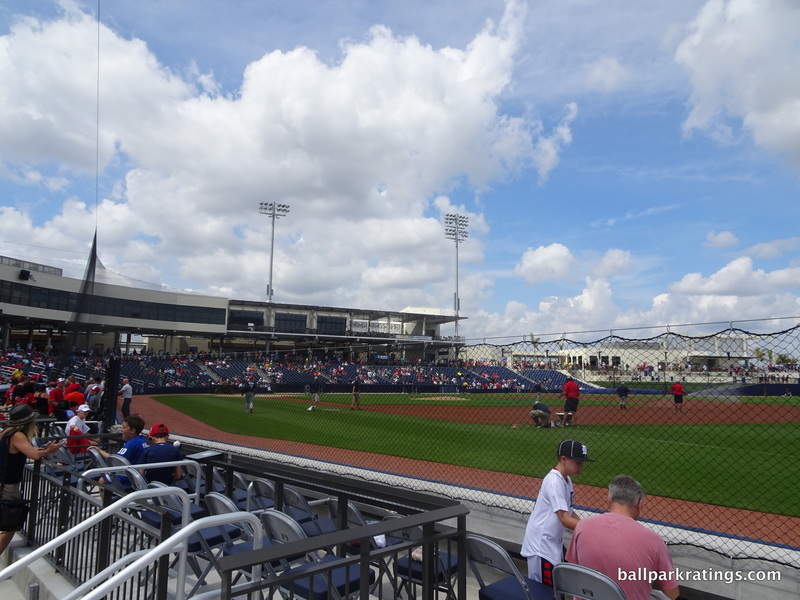 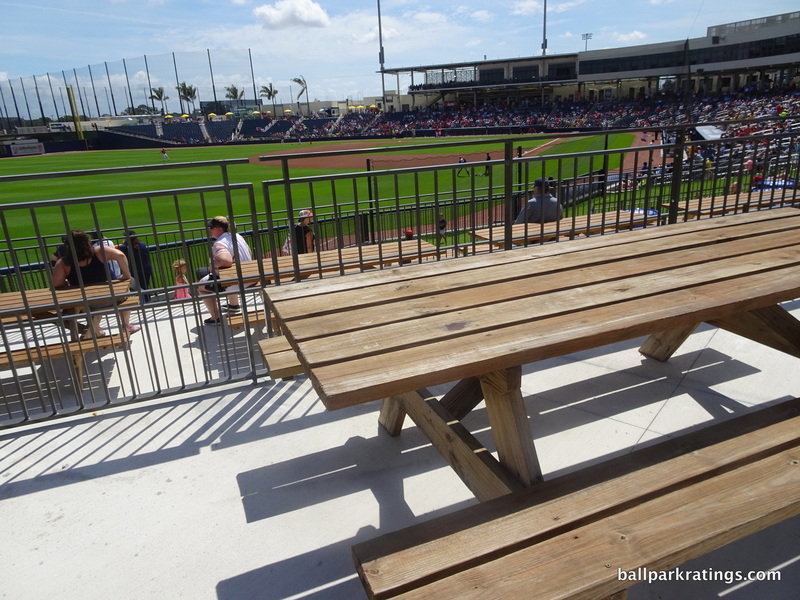 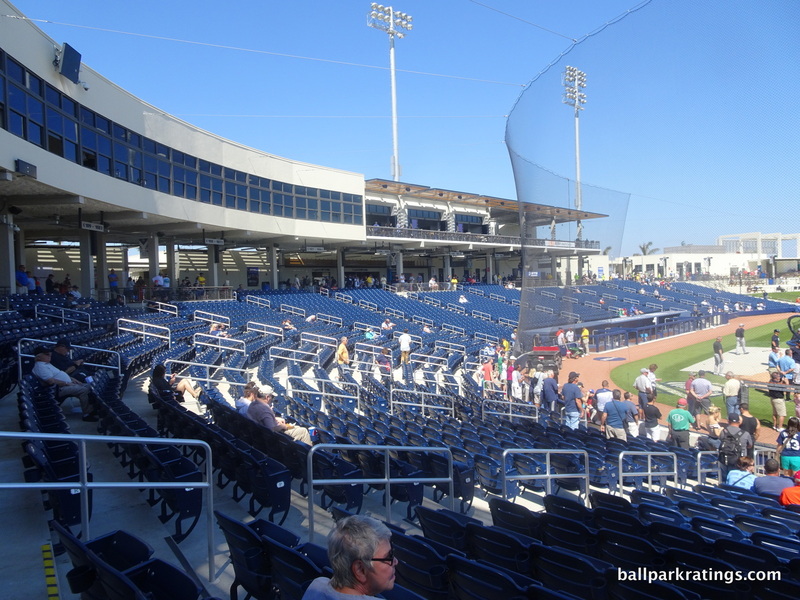 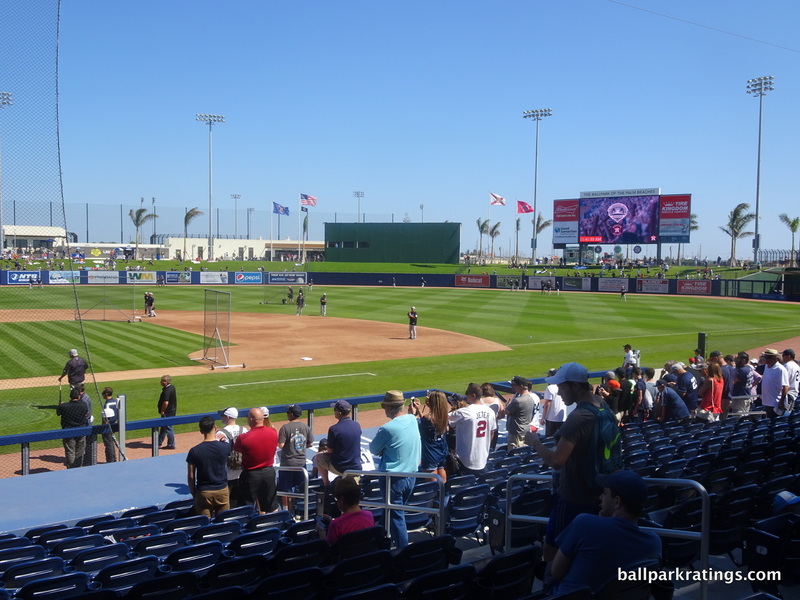 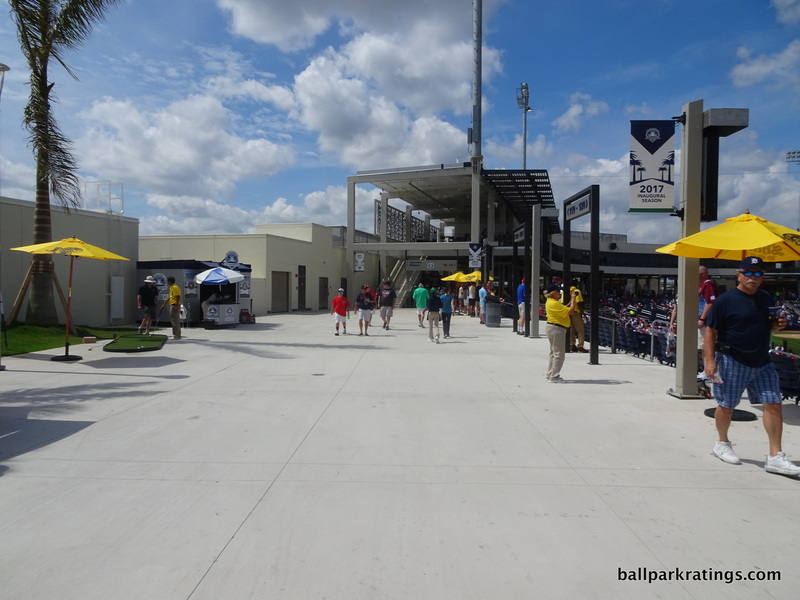 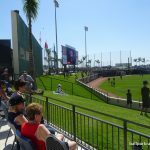 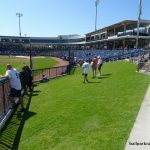 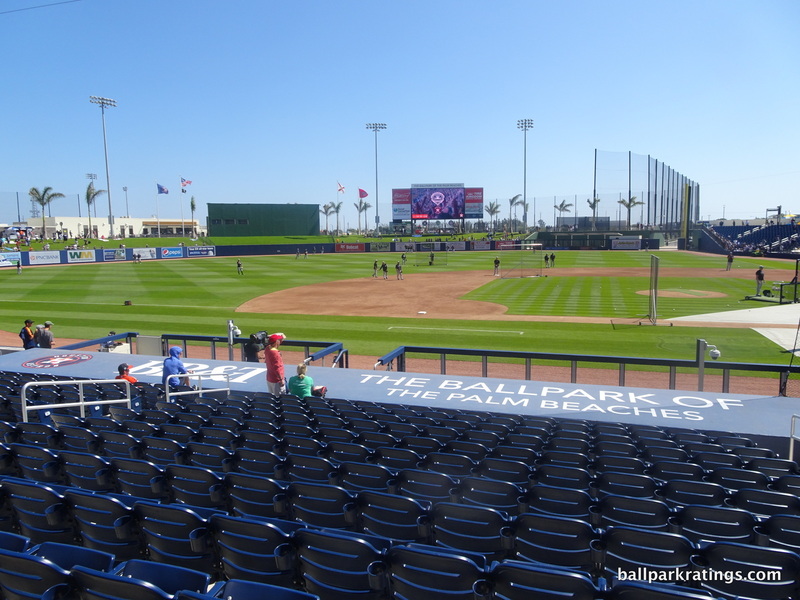 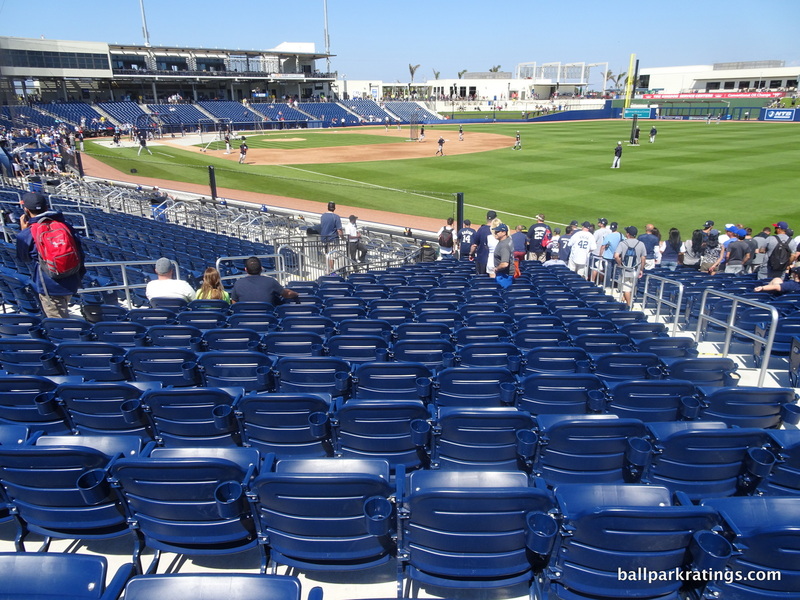 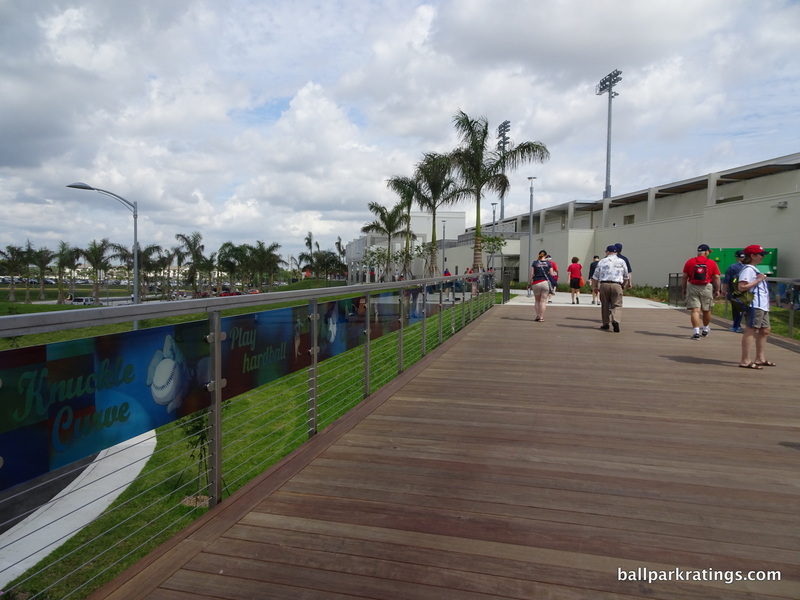 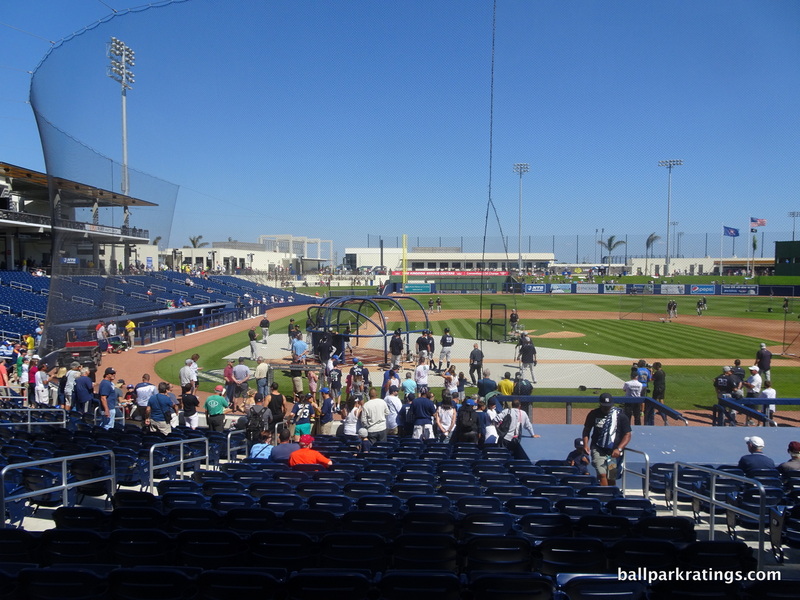 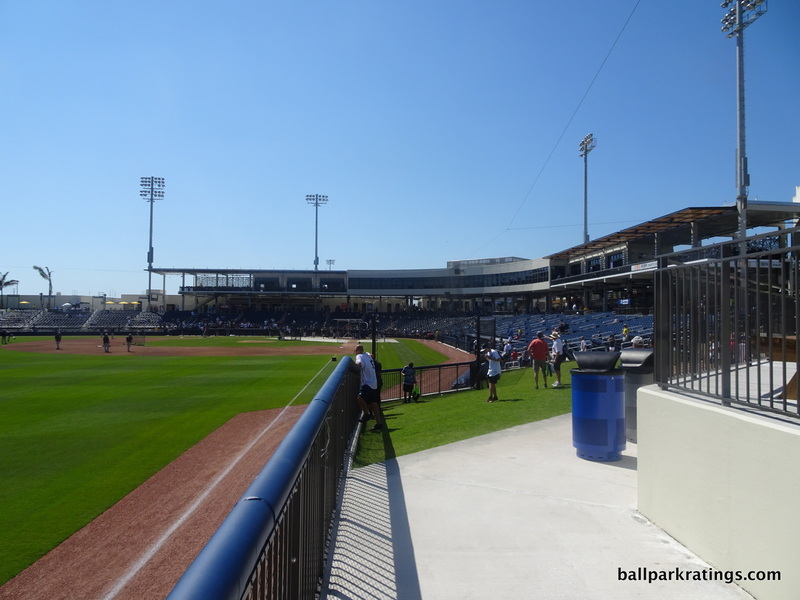 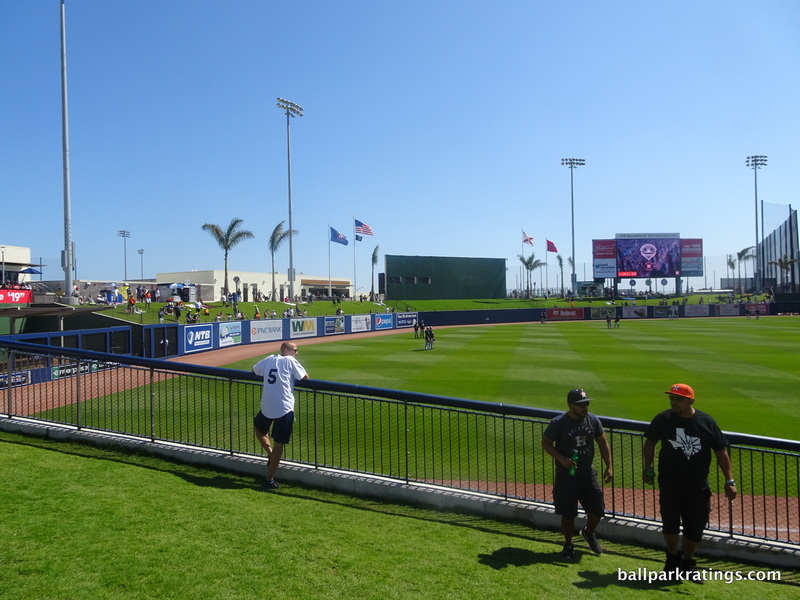 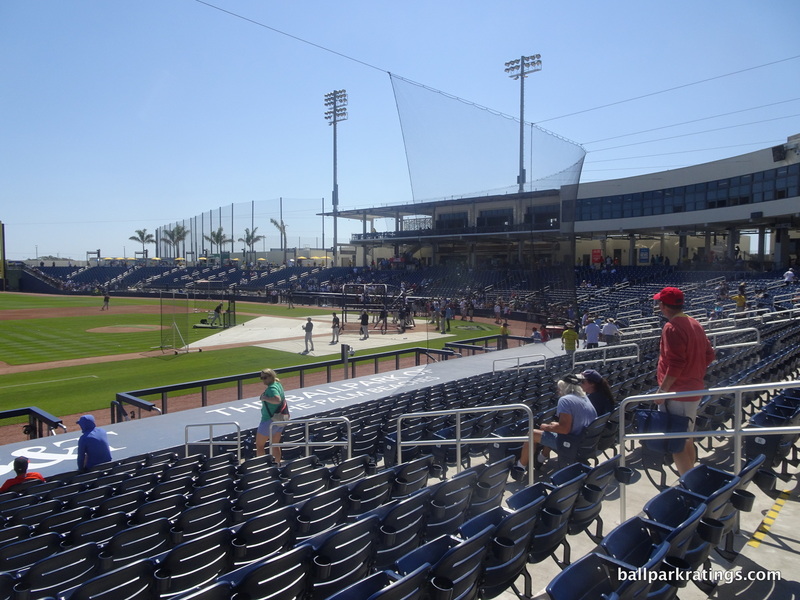 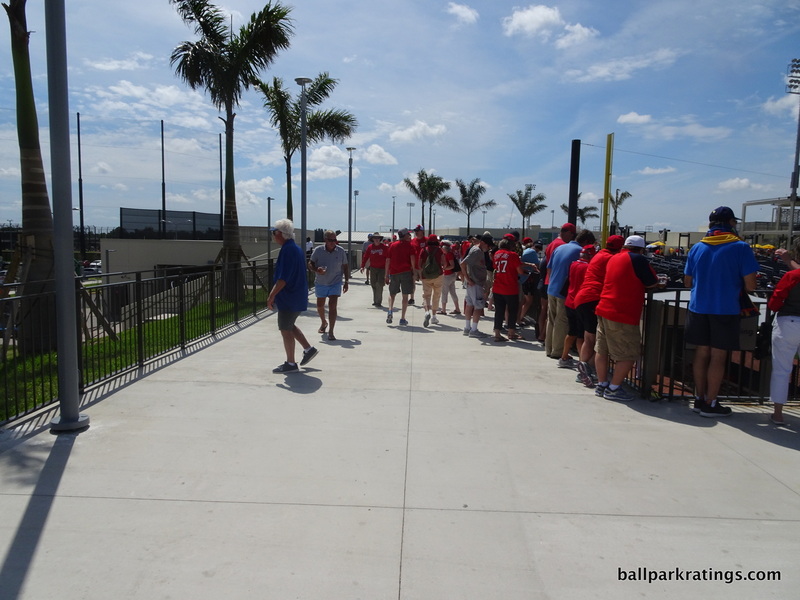 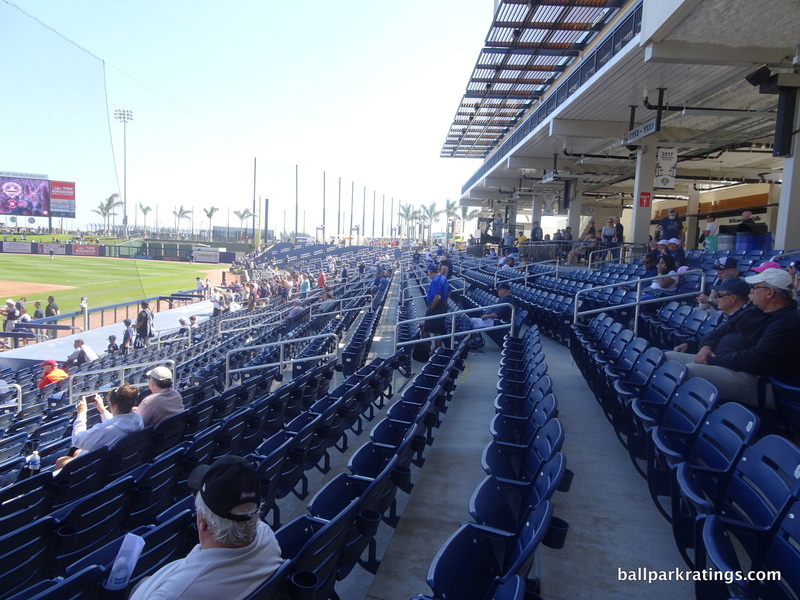 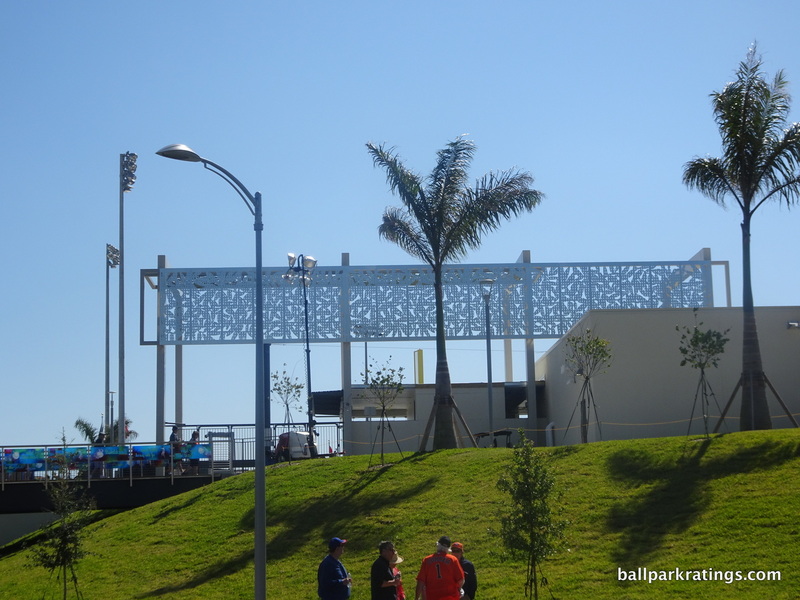 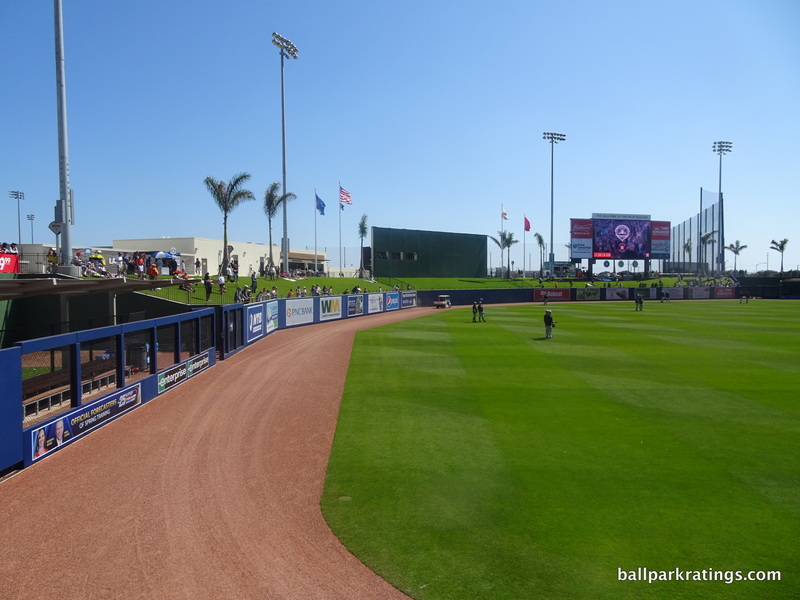 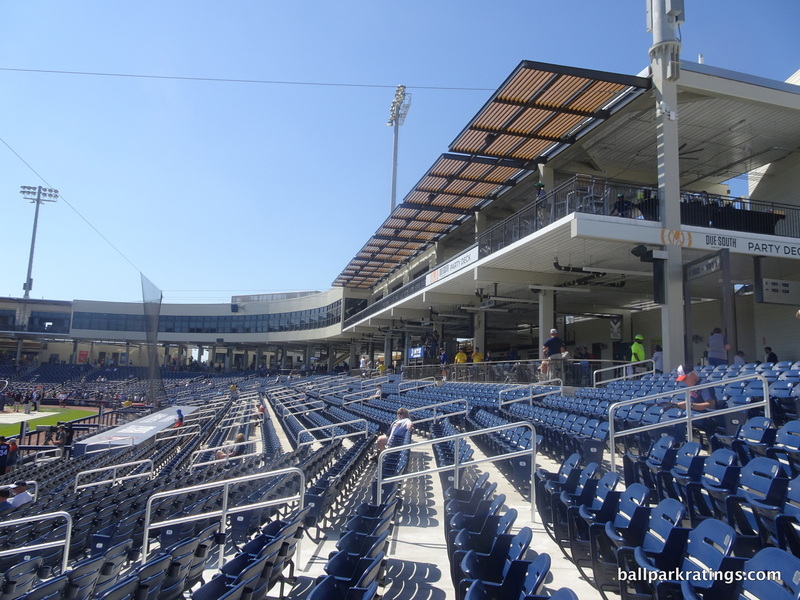 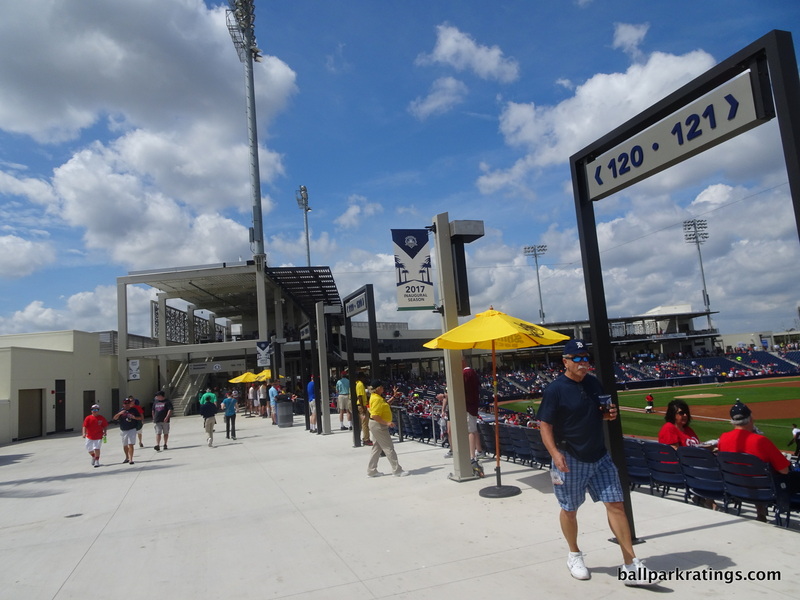 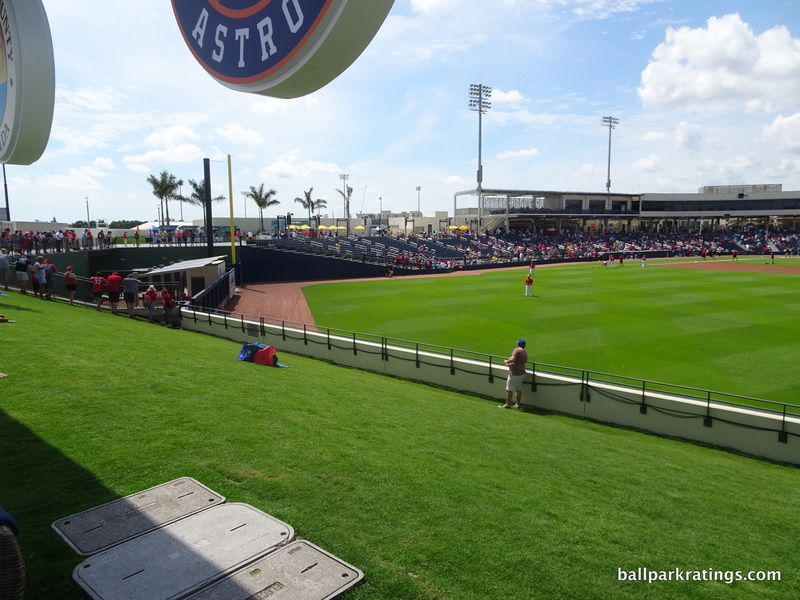 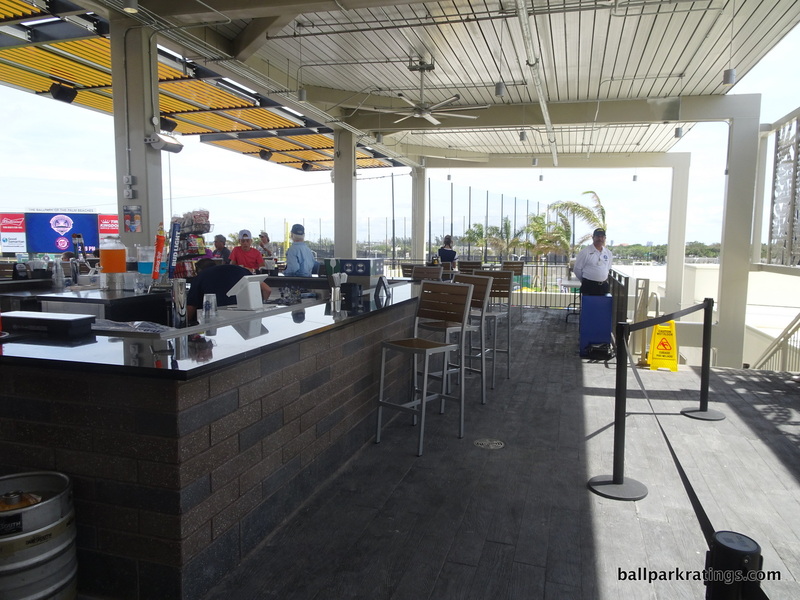 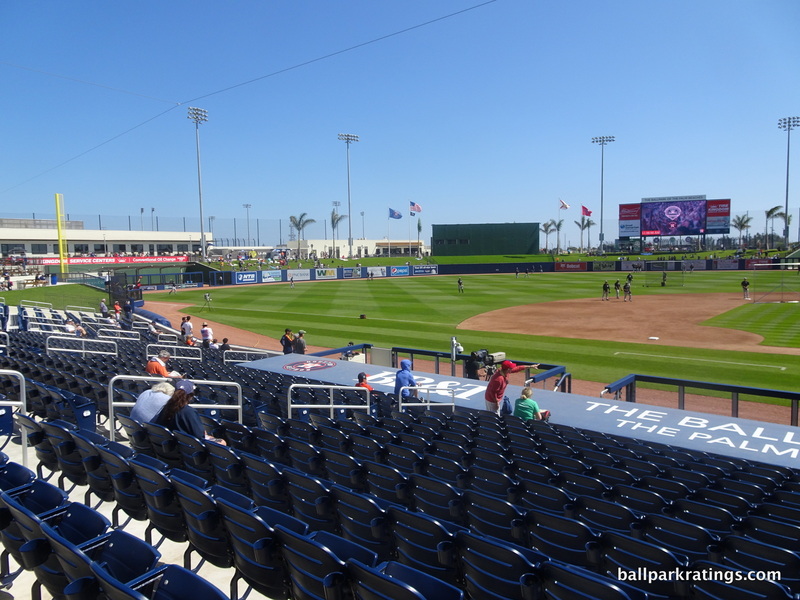 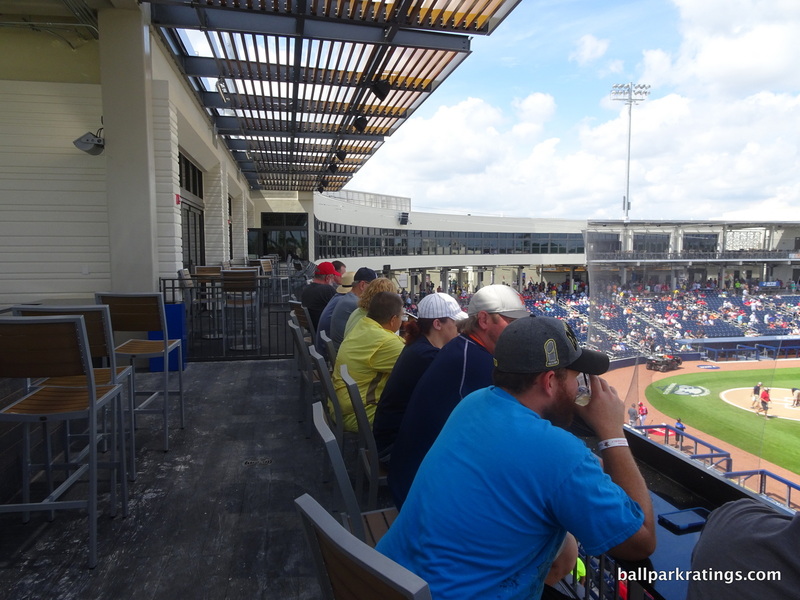 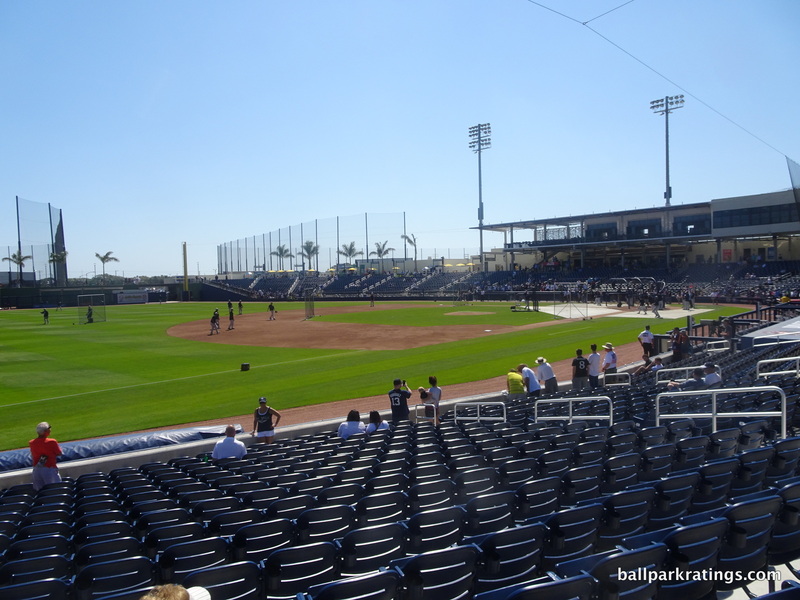 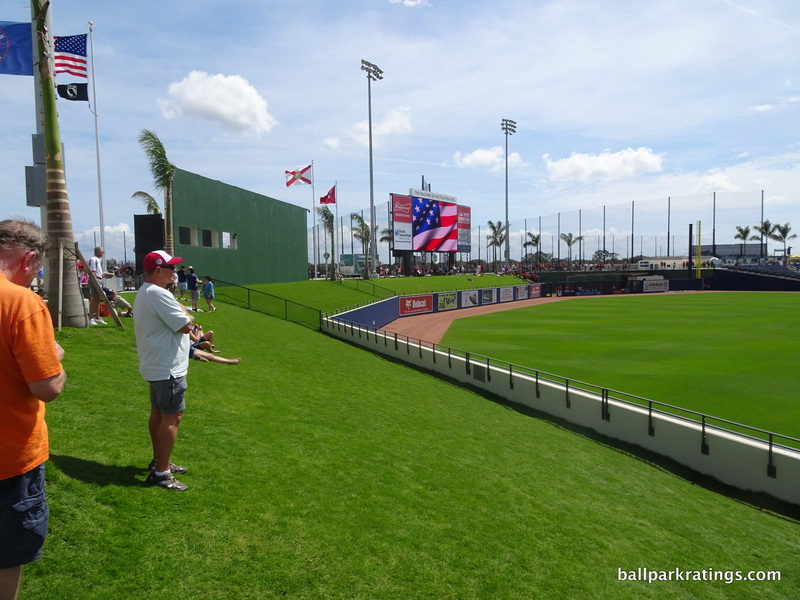 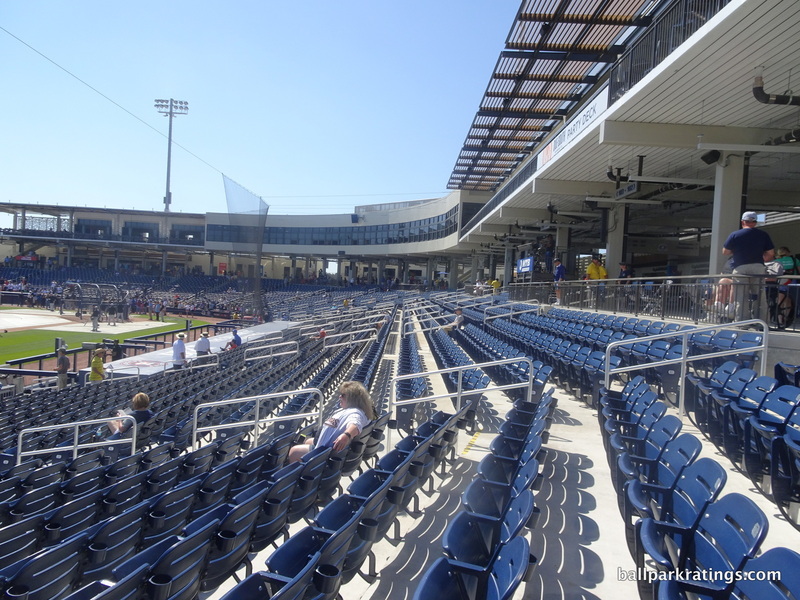 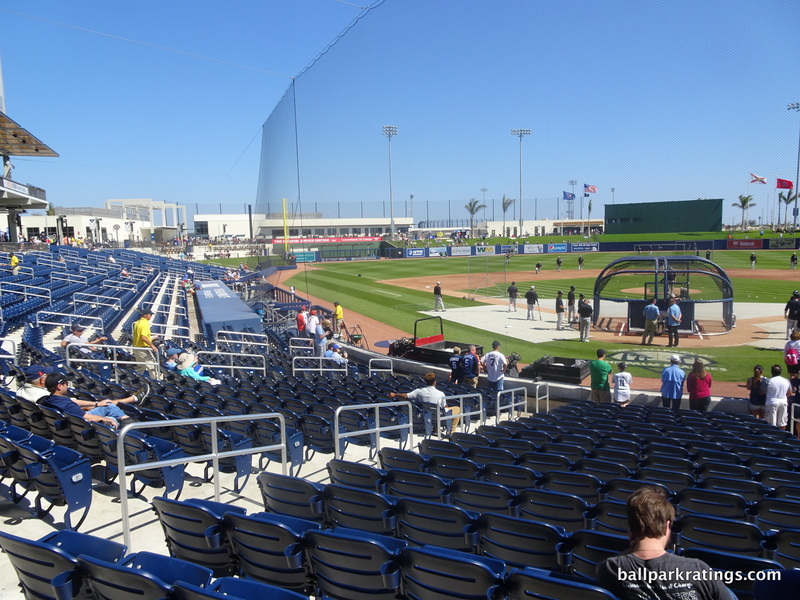 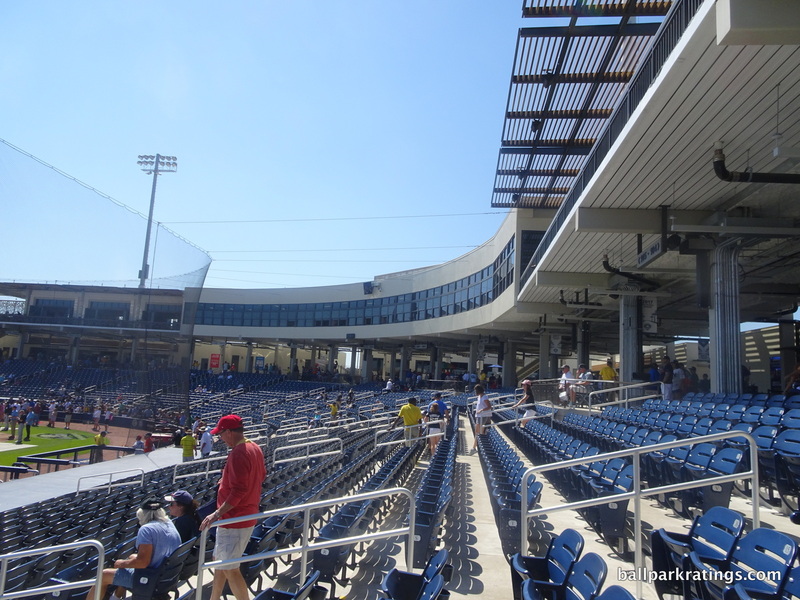 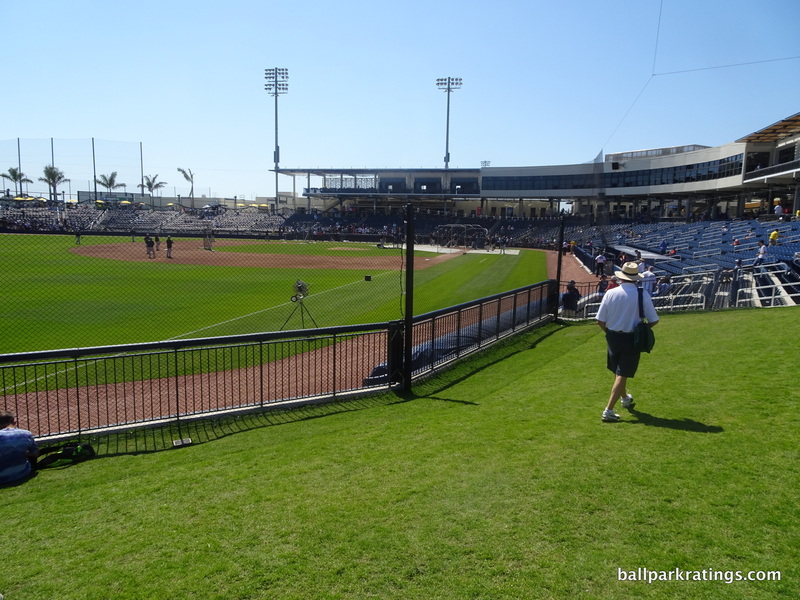 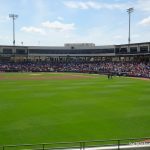 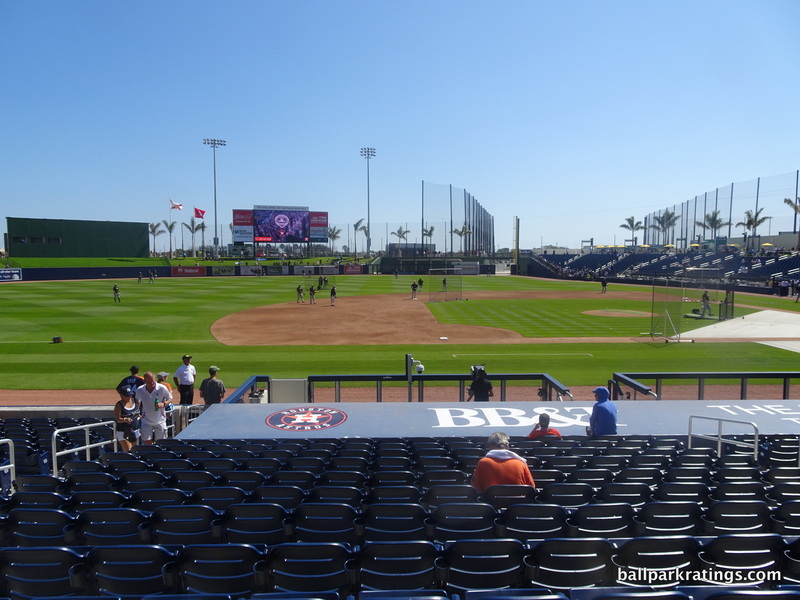 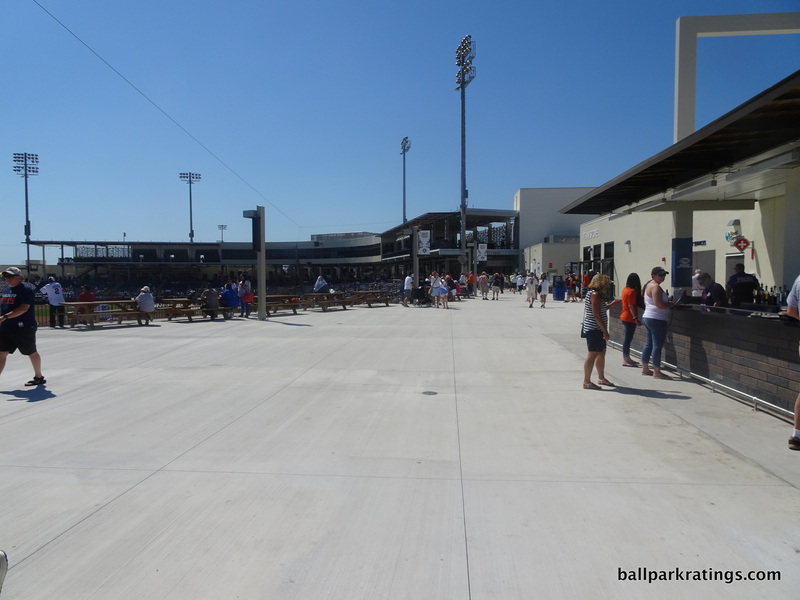 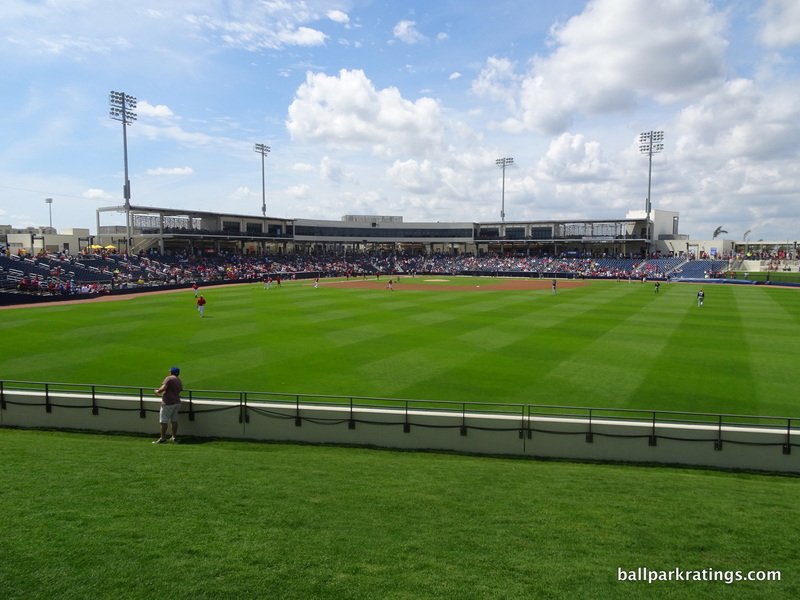 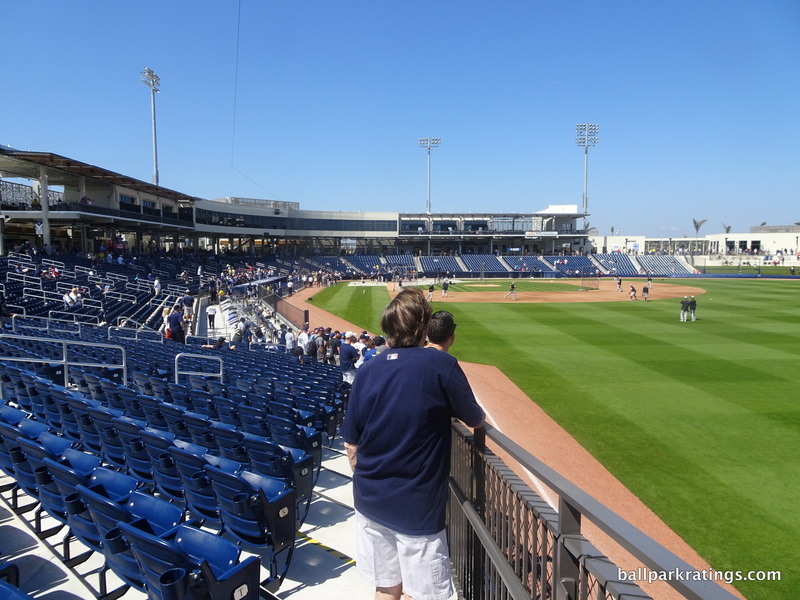 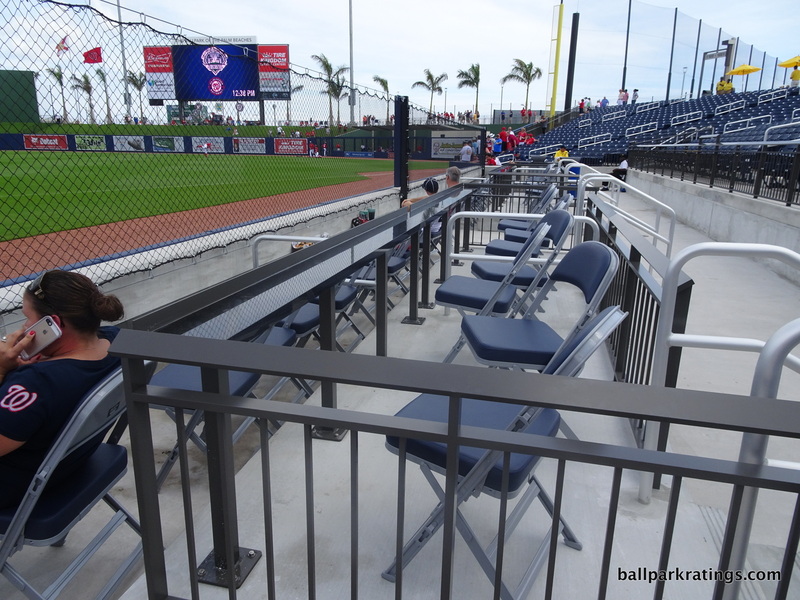 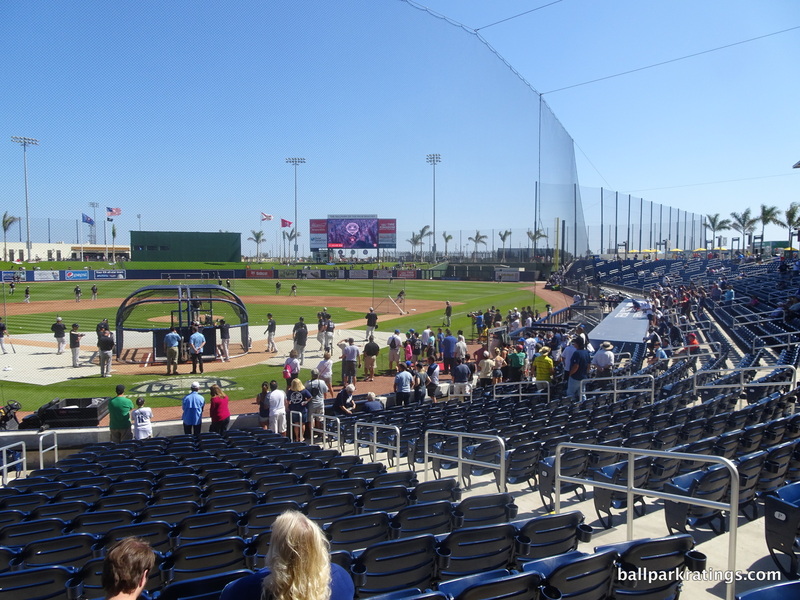 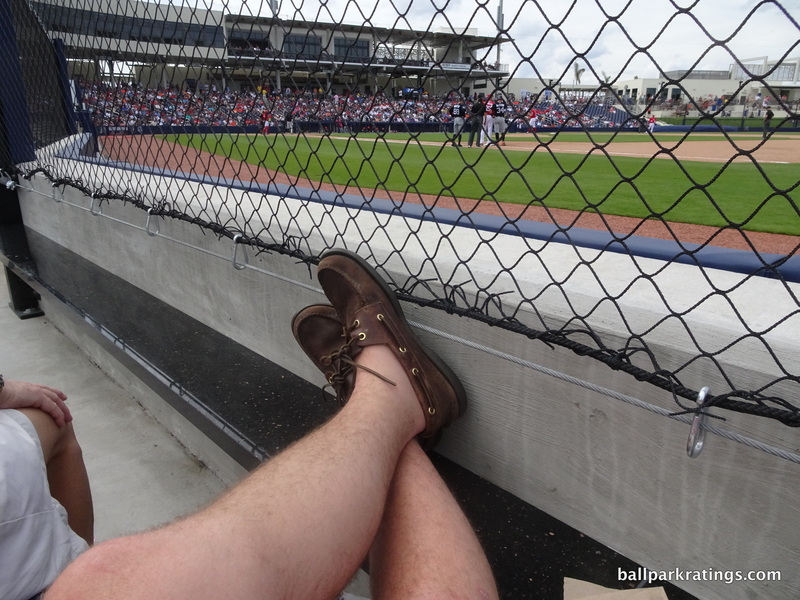 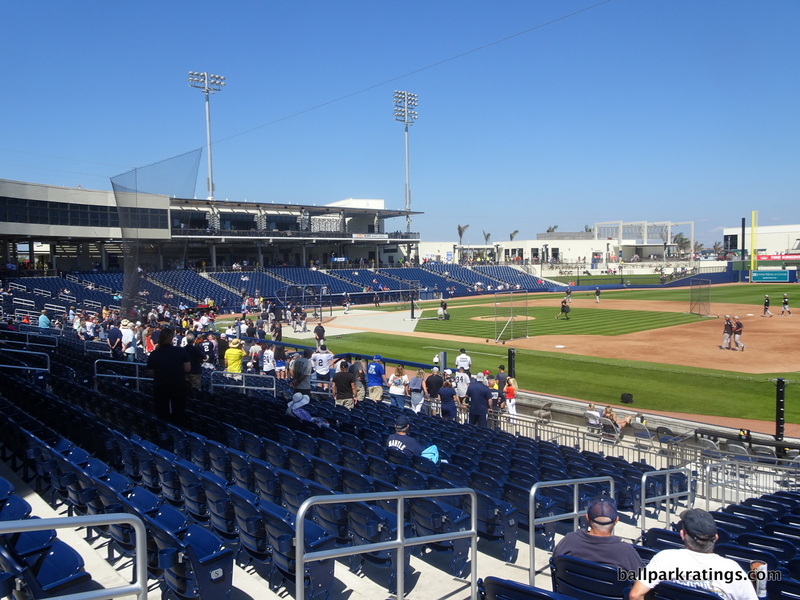 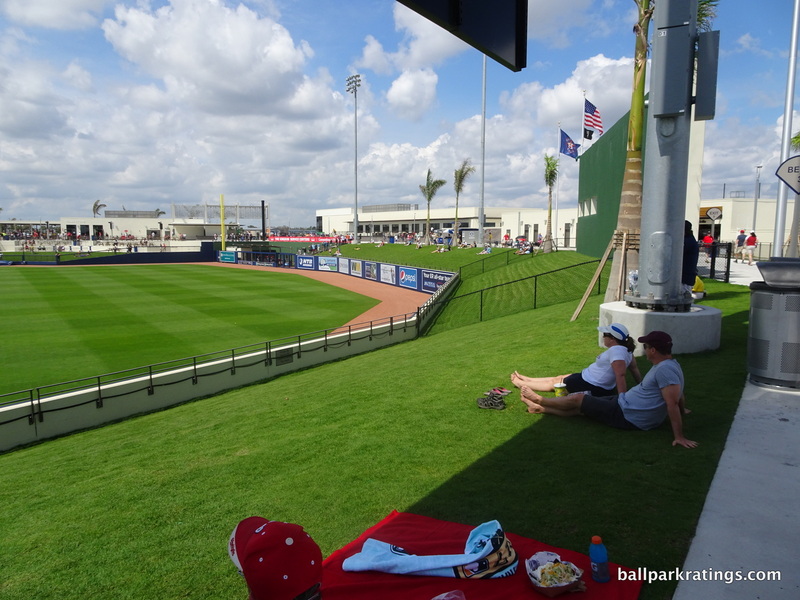 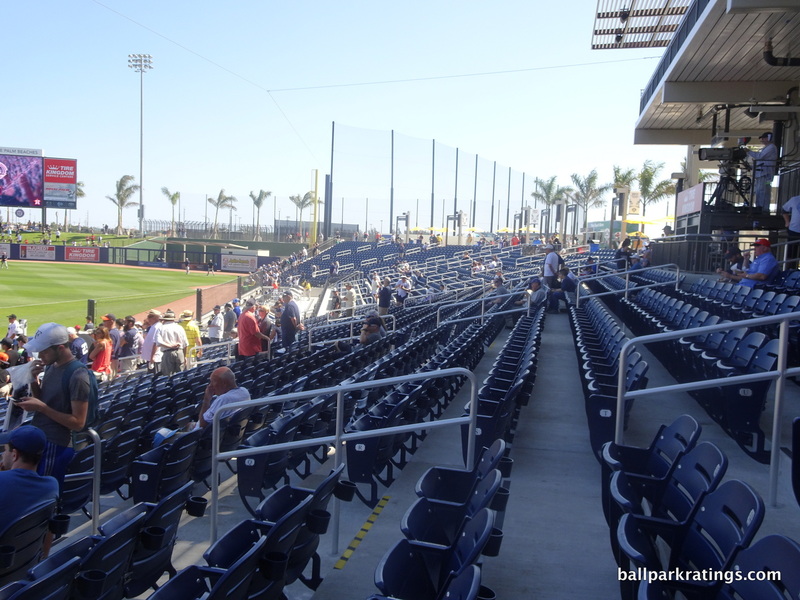 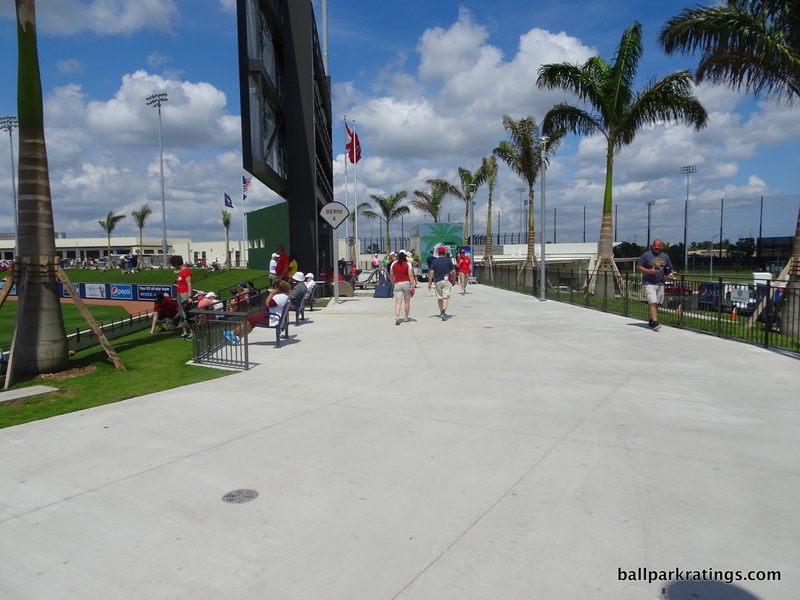 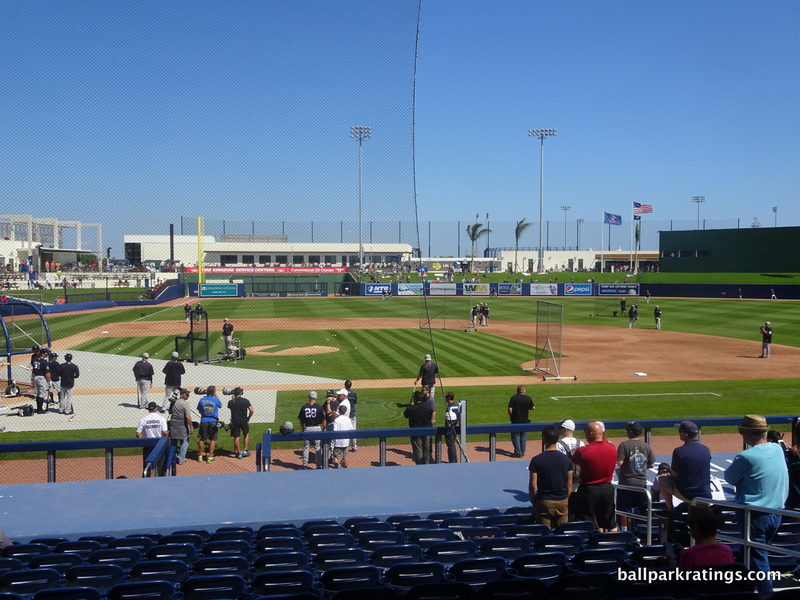 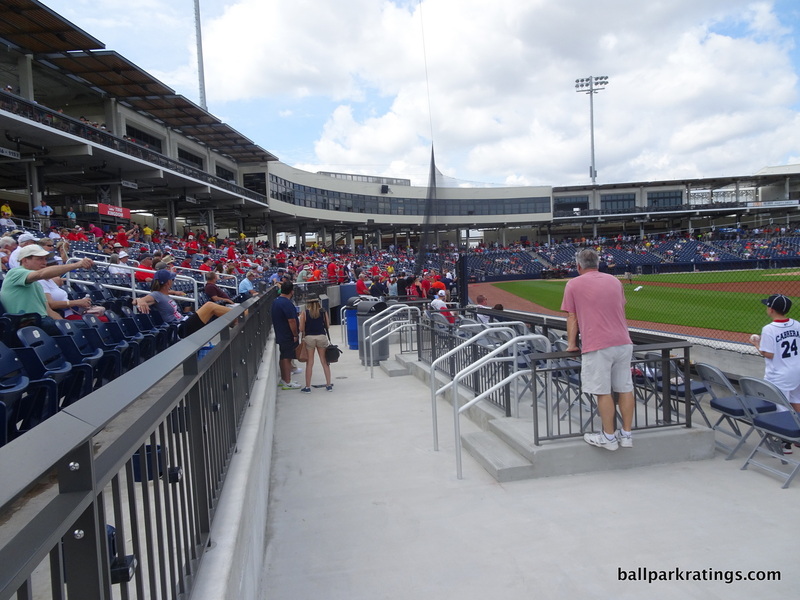 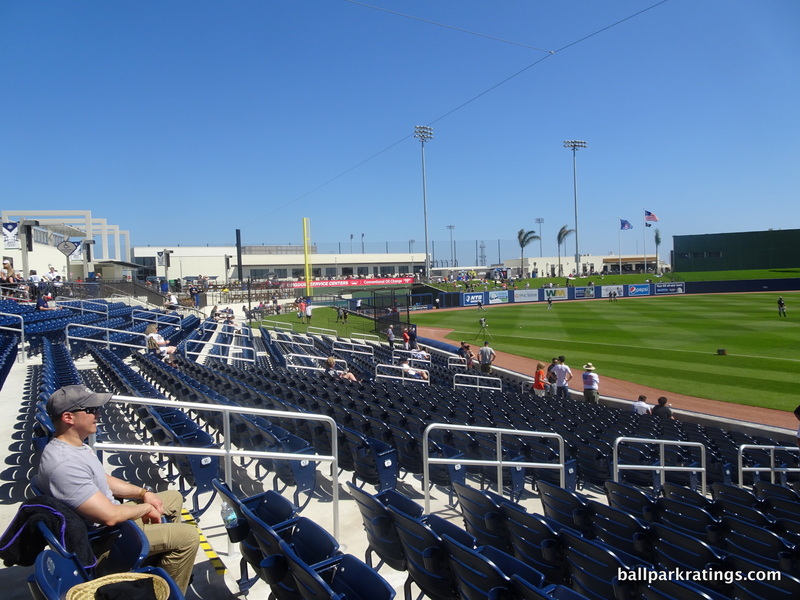 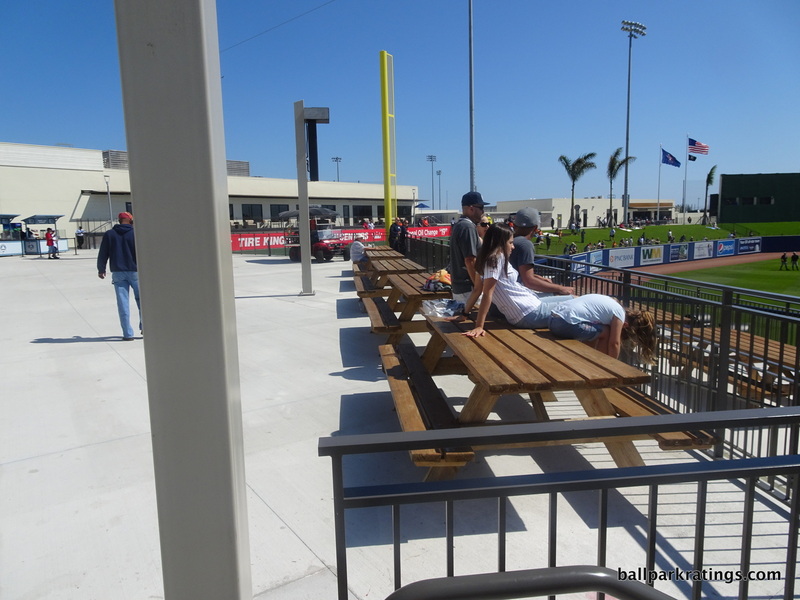 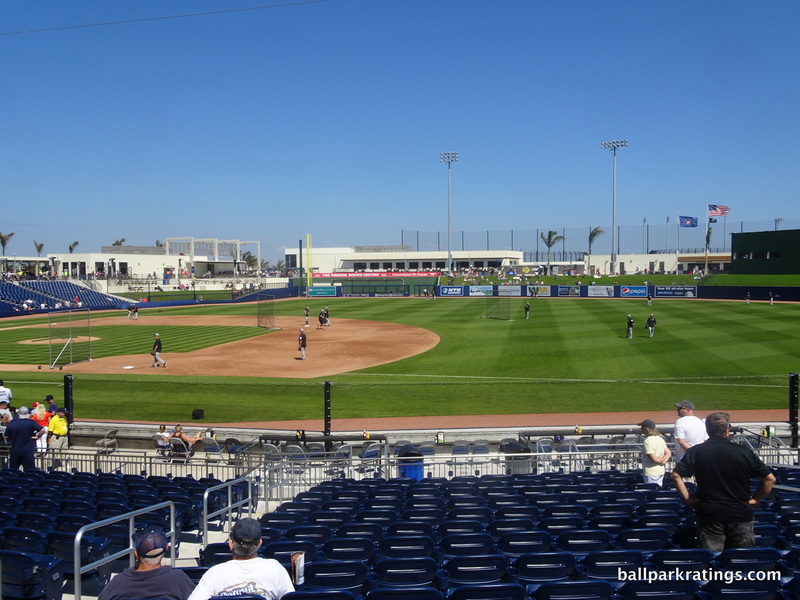 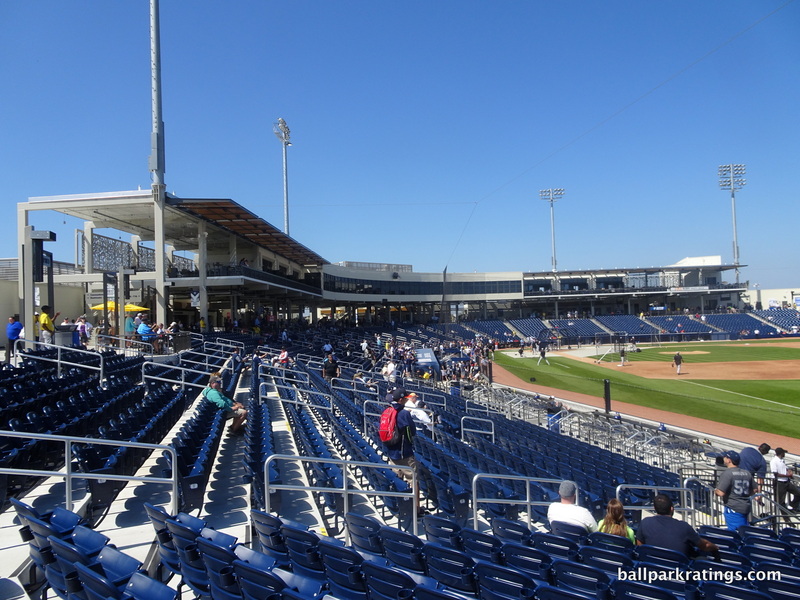 The Ballpark of the Palm Beaches is a good venue, but it doesn’t compare as well to other new or renovated spring training ballparks of the 2010s. 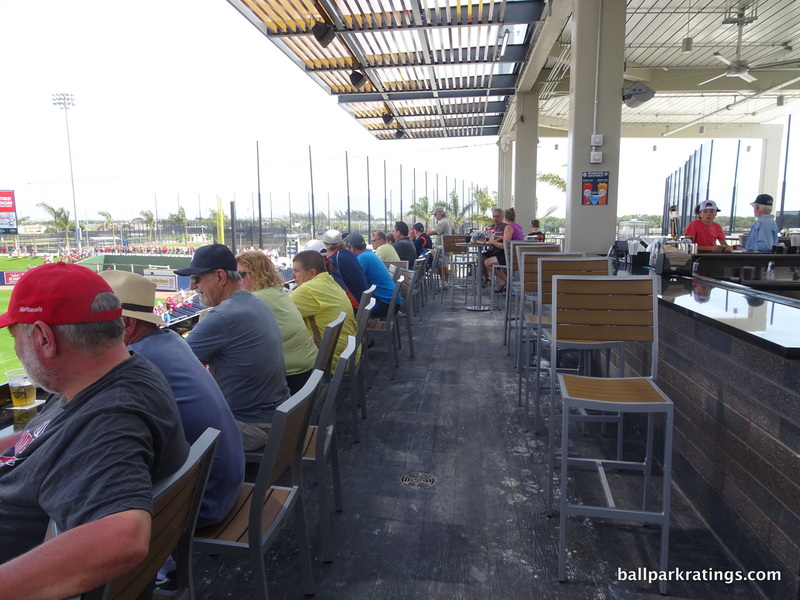 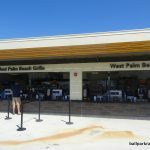 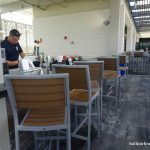 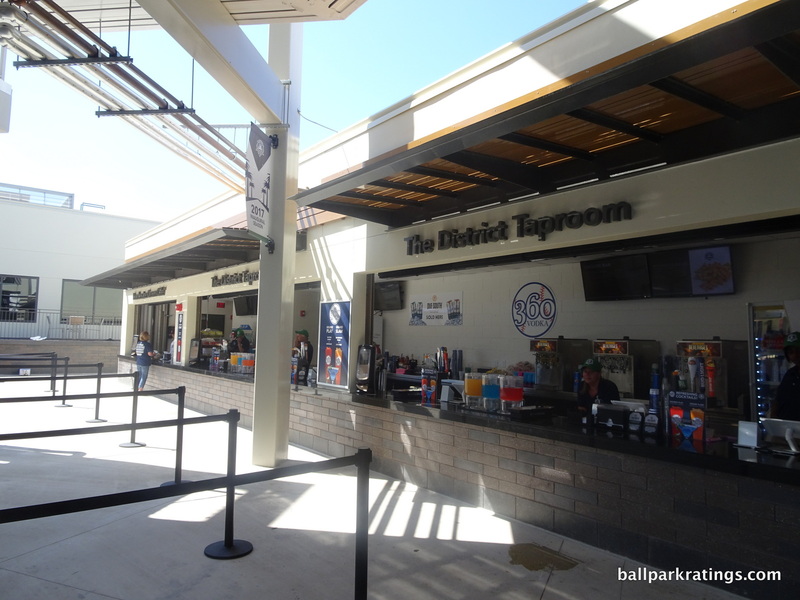 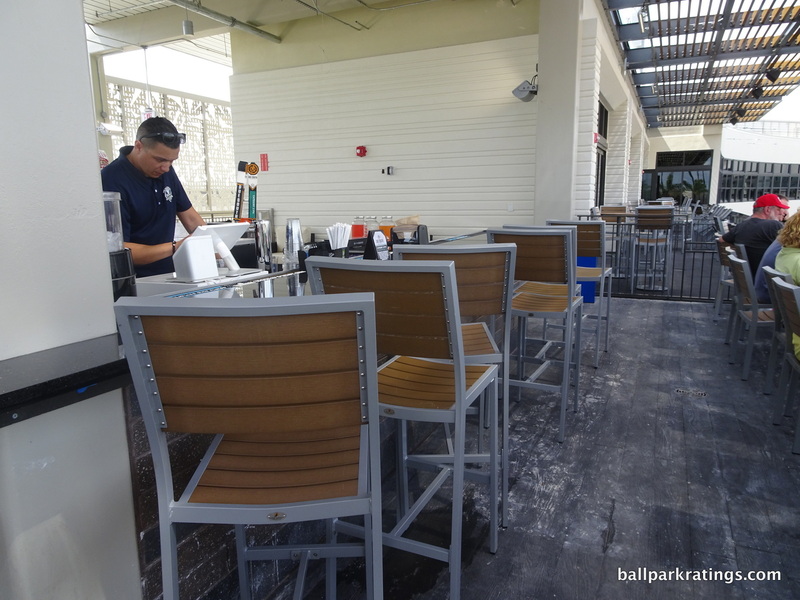 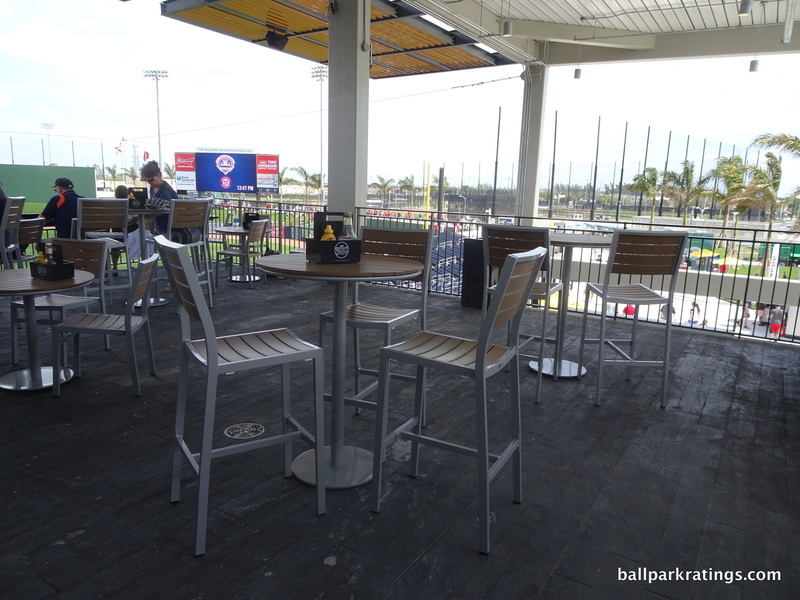 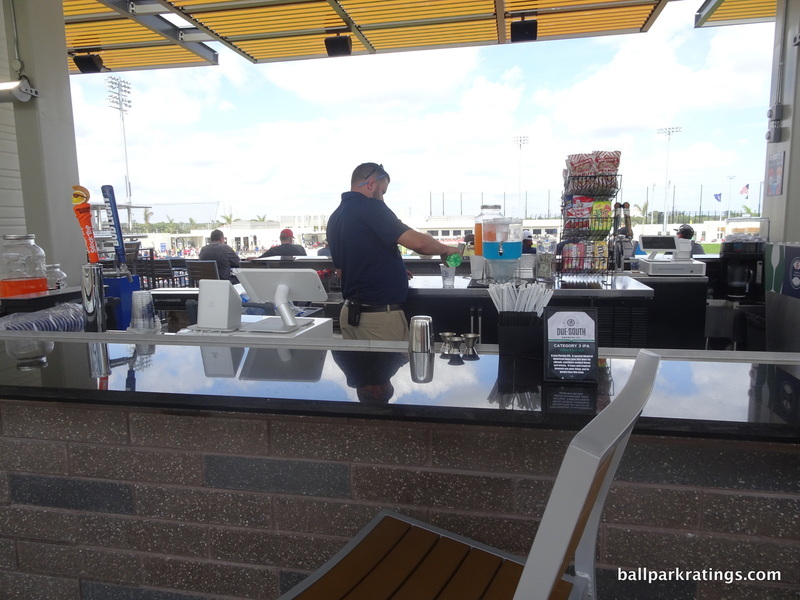 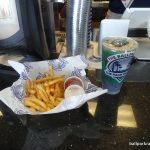 Located in a premier market, BPB’s setting isn’t great, but it gets a bit of a boost for bringing baseball back to West Palm Beach. 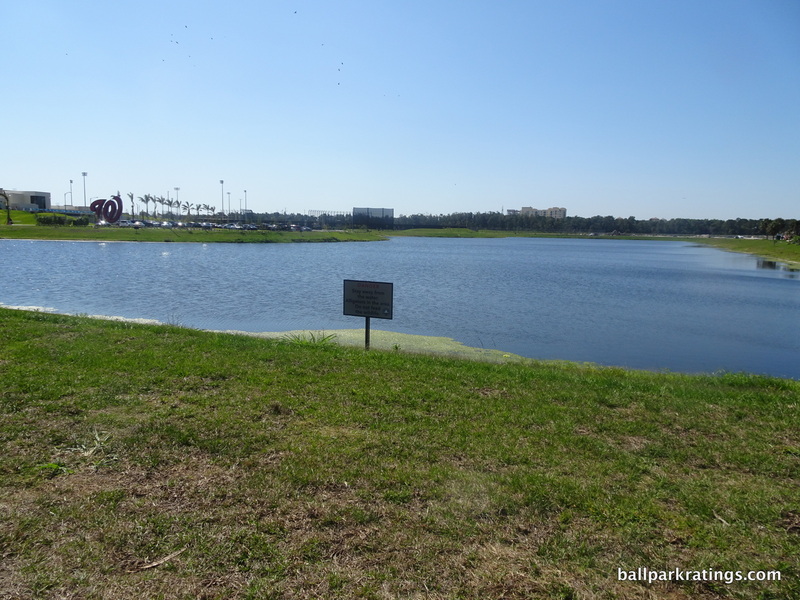 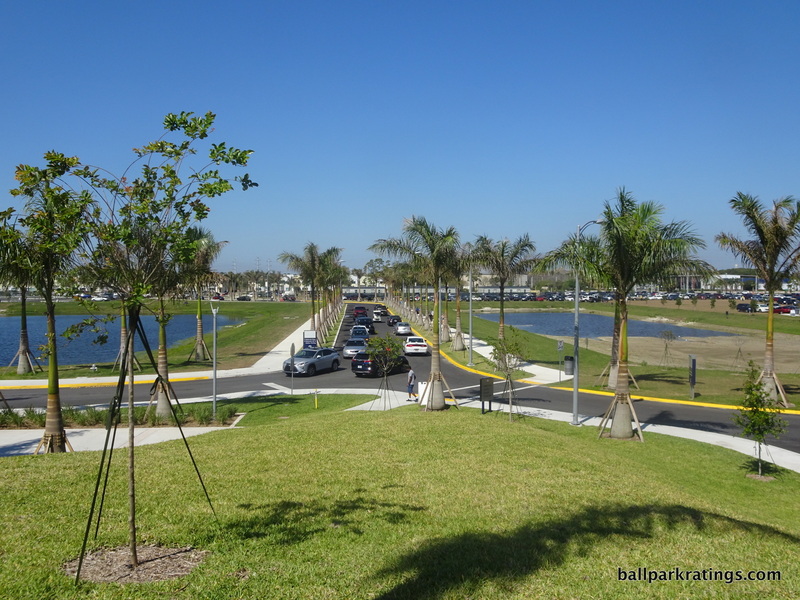 The complex feels pretty isolated within the area, relatively far from hotels, restaurants, and other attractions. 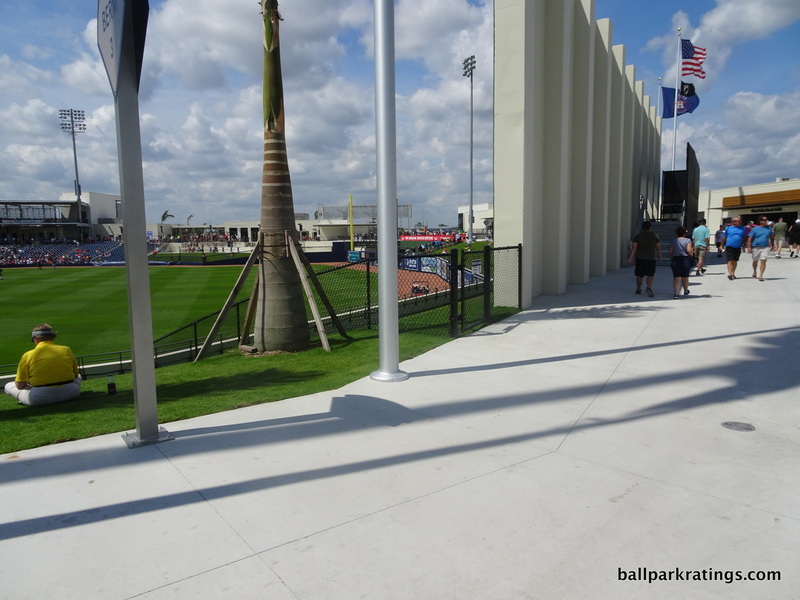 Architecturally and aesthetically, BPB is defined by a lack of ambition in the era of ballparks with ochre sandstone imported from India. 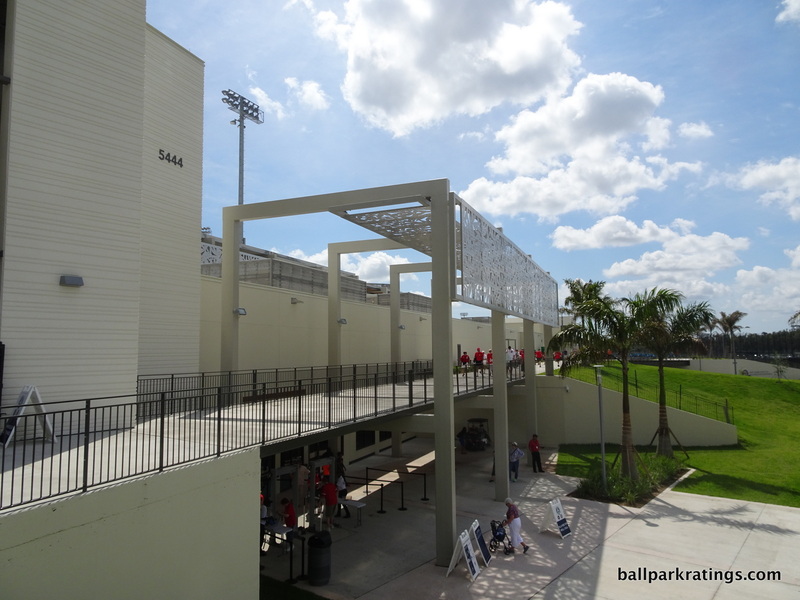 Anchored by a “grand staircase” on the third base side, the white concrete façade is stripped of the usual pomp and ornamentation. 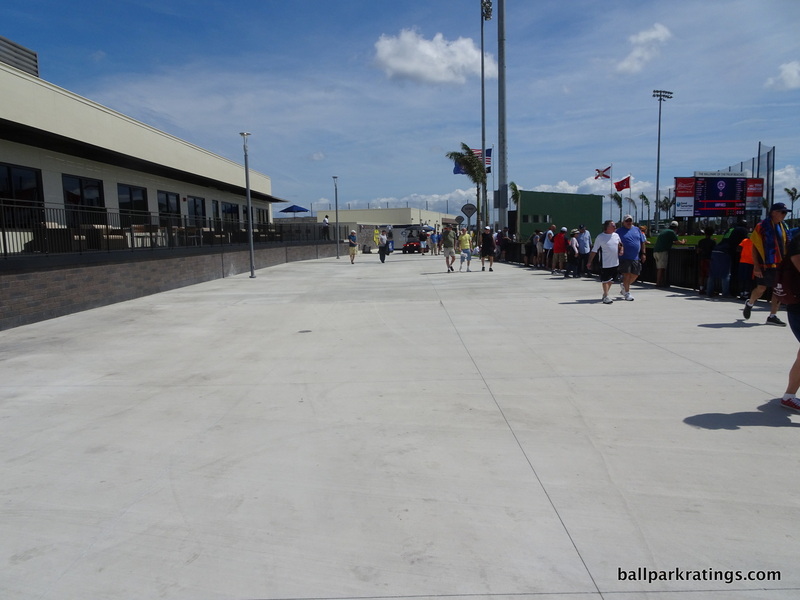 The first base side is restricted. 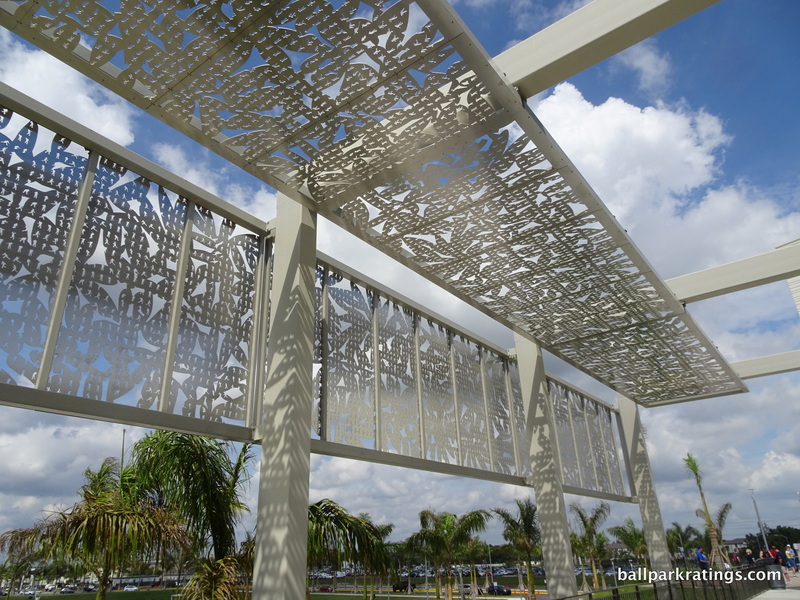 Bright spots include prime “selfie spots” in the form of large modelings of team logos, the unique steel silhouettes, and the colorful signs adorning the bridges. 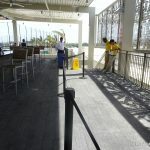 Perhaps I’m being a bit harsh here and the simple lines are deliberately minimalist. 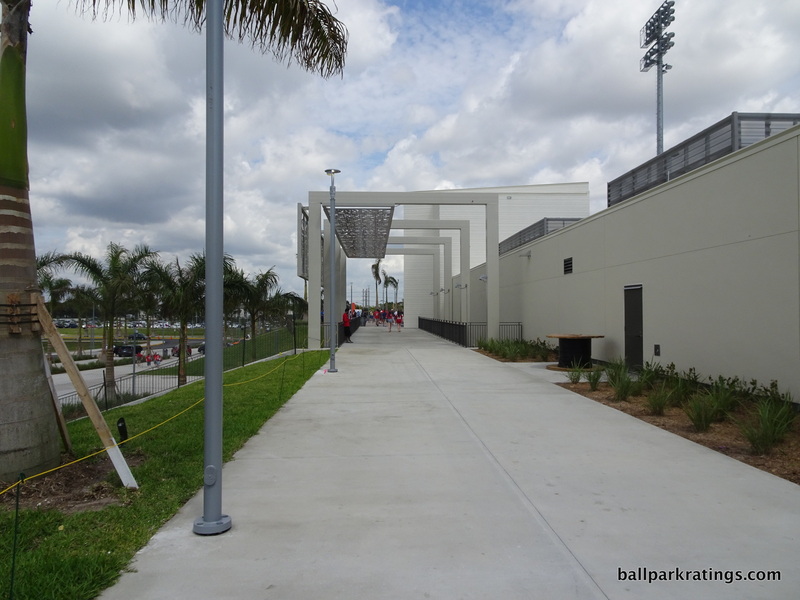 The exterior is growing on me. 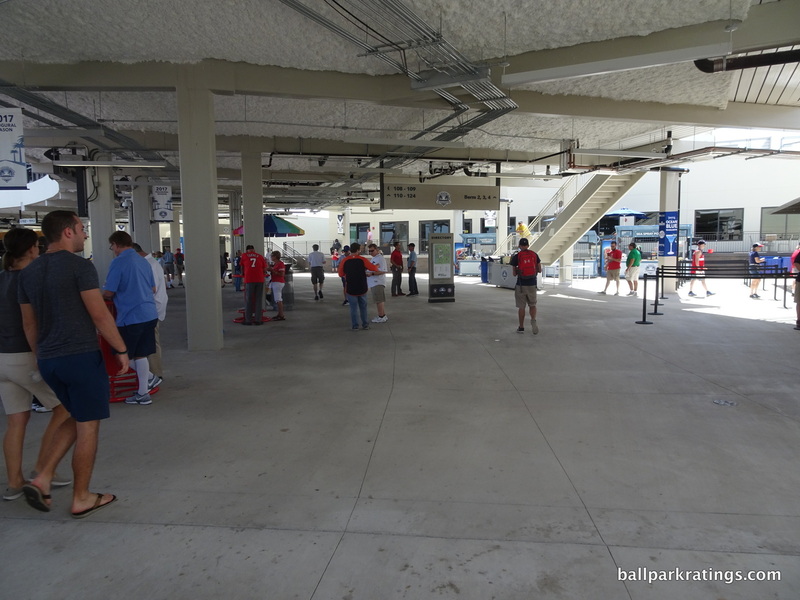 The interior aesthetics are certainly more generic, to the point where it’s difficult to say anything. 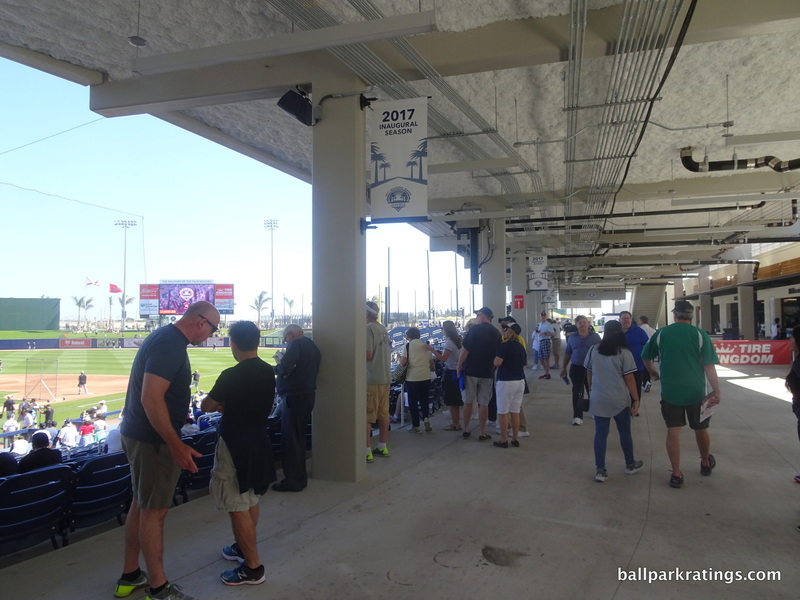 Again, if you were designing a spring ballpark, this is the starting point: an expansive outfield berm, an open concourse encircling the field, and a press box behind home plate flanked by suites and party decks. 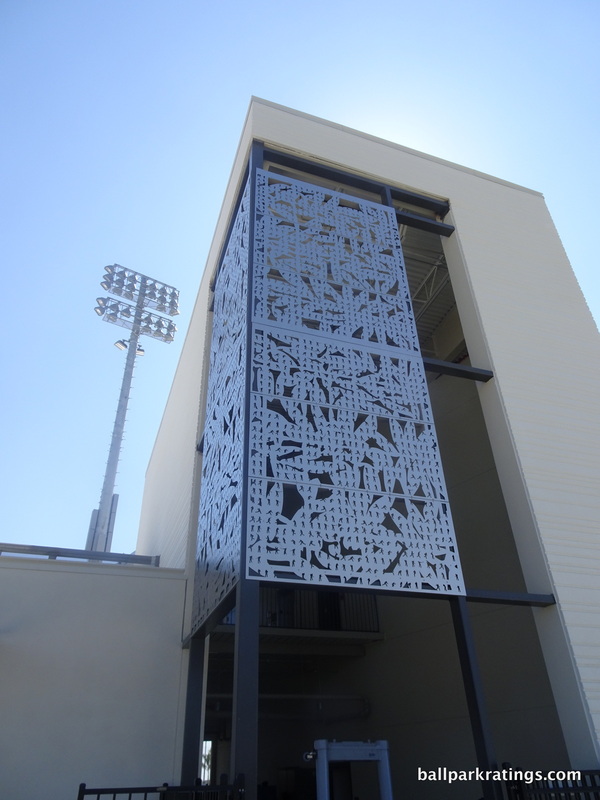 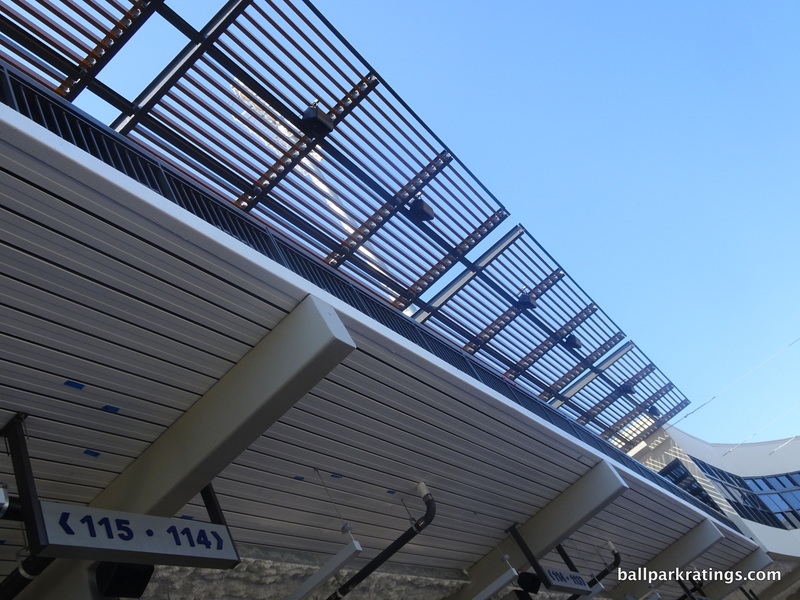 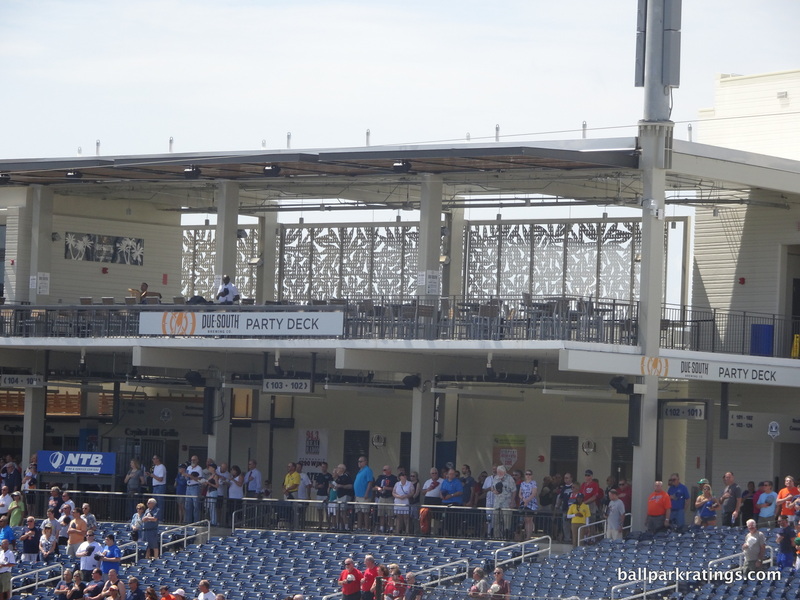 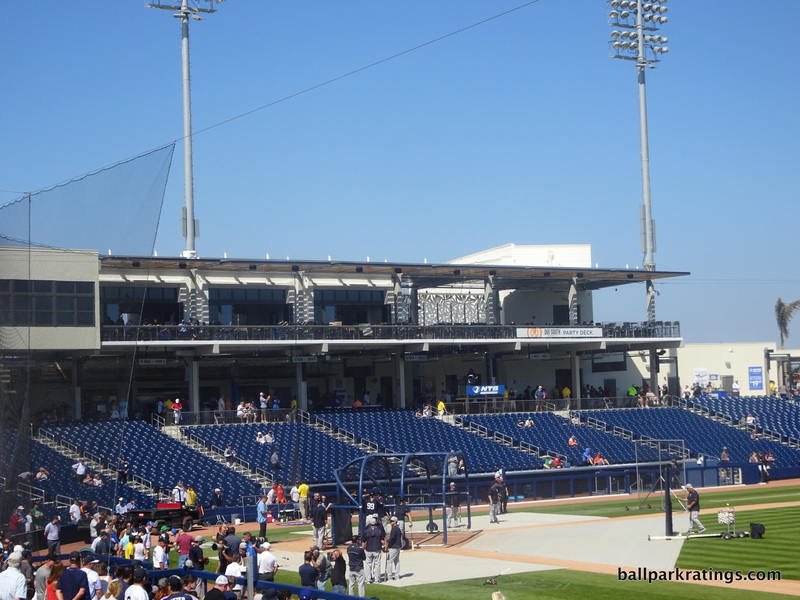 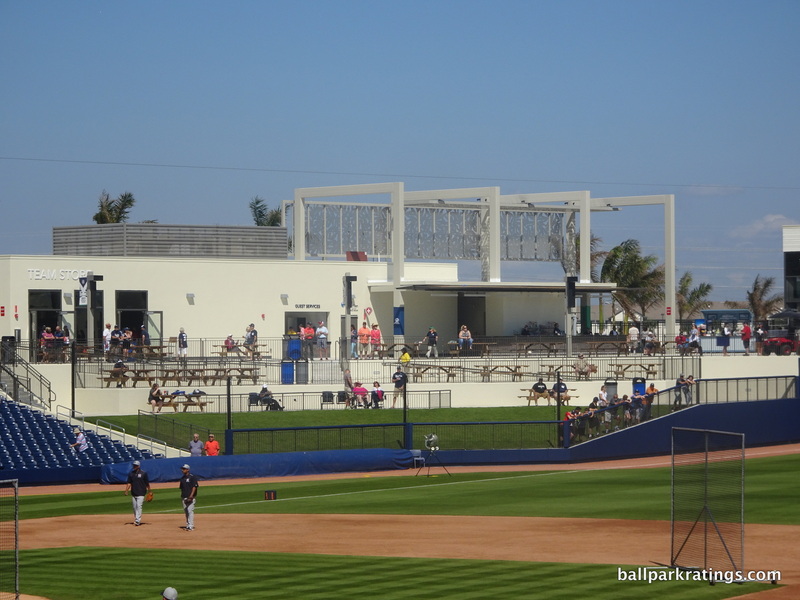 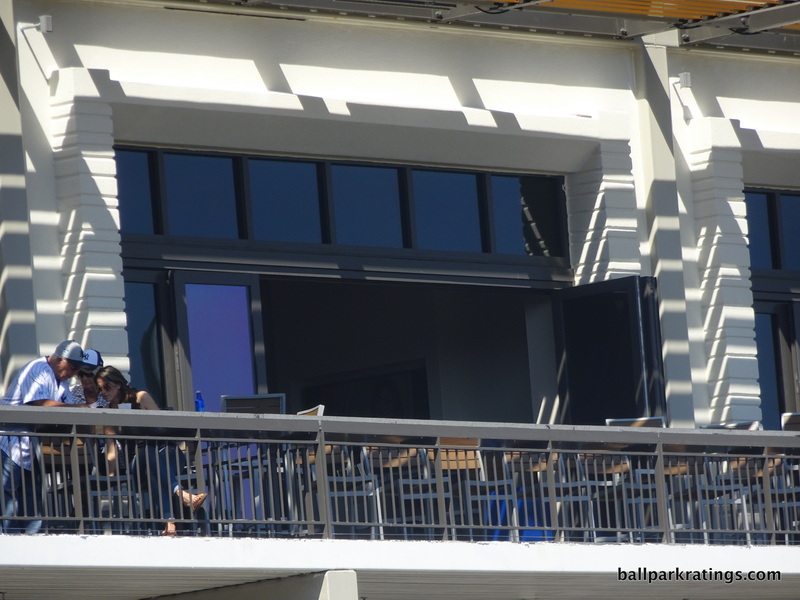 But BPB doesn’t go beyond that, and the press box and outfield clubhouse façade are especially spartan. 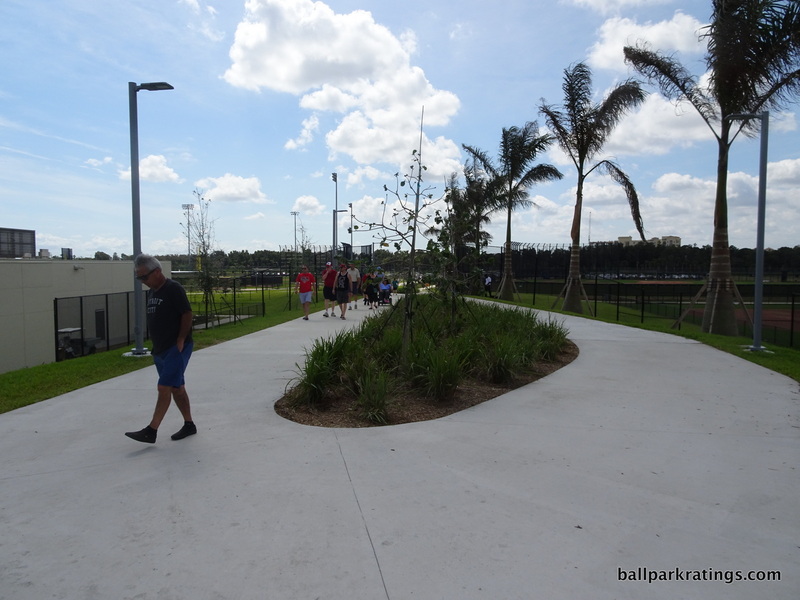 This looks like a park solely intended to be functional. 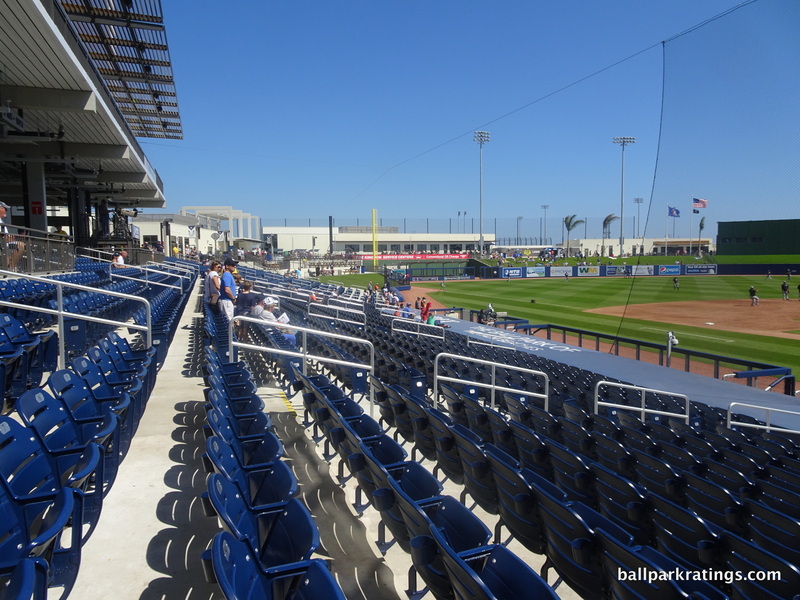 However, there’s a lot to be said for functionality, as BPB scores by far the best in Florida in this cumulative category and second in all of spring training. 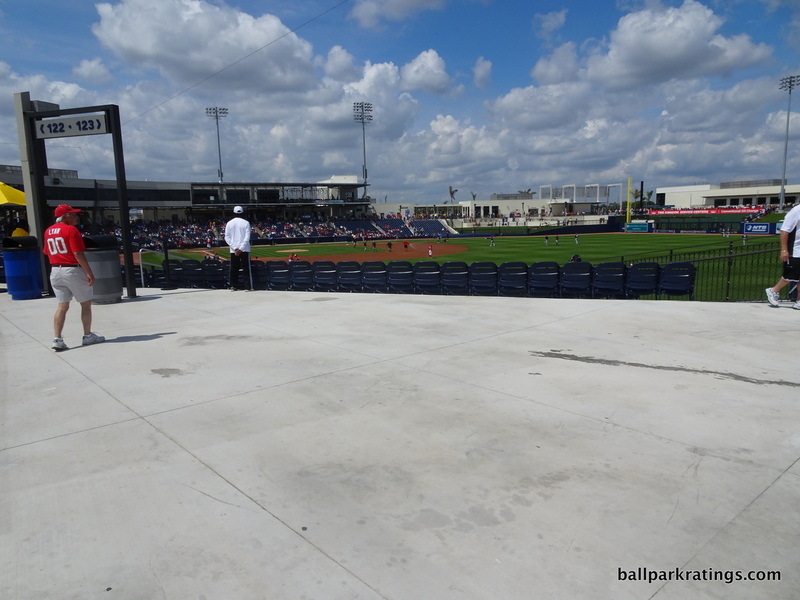 Minus some minor obstructions down low, the sightlines are superb, with all seats properly oriented toward the action. 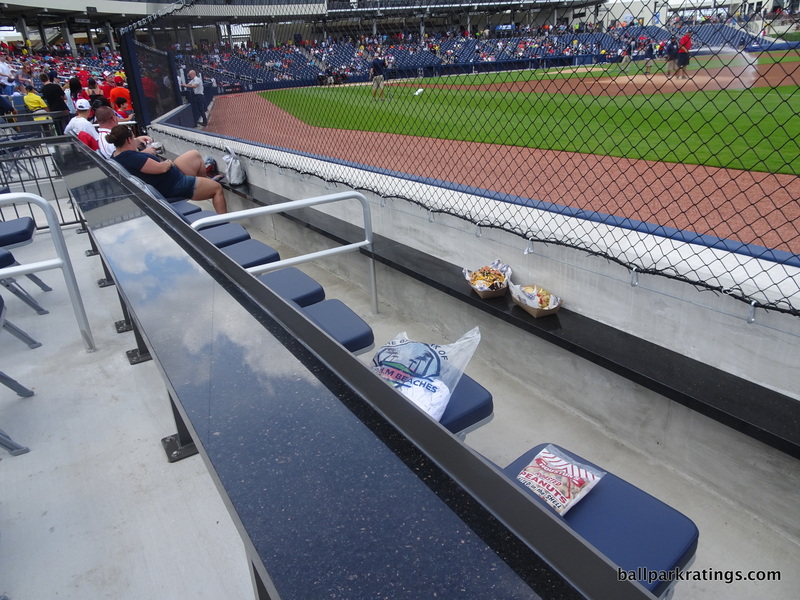 The seats themselves are noticeably wider (20 inches) and all have cupholders. 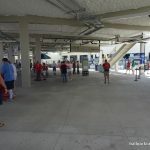 Despite being above street level, the open, 360-degree concourse is ample in space and sports great visibility of the field from almost every vantage point. 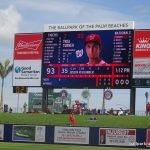 The state-of-the-art videoboard is fine as well, if not a tad on the small side compared to some of the other new ones. 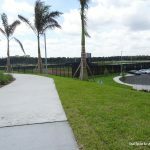 It’s all uncomplicatedly excellent. 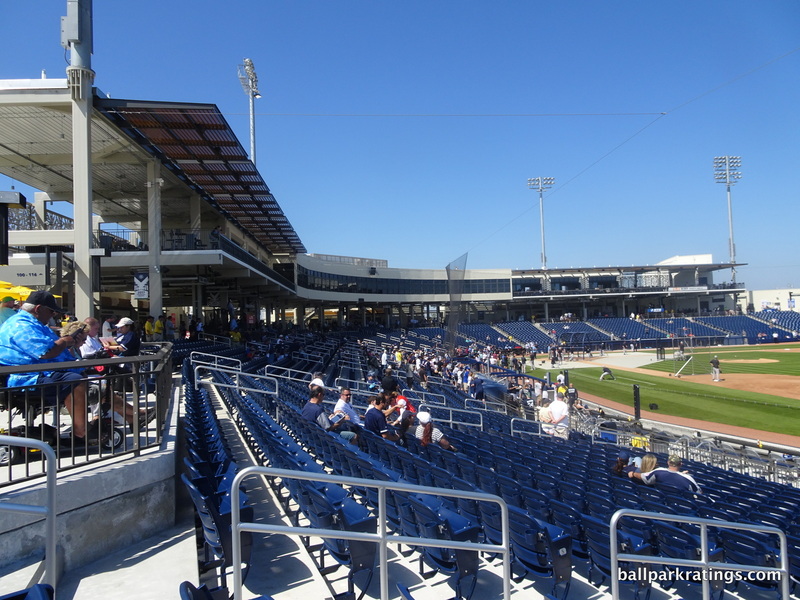 As is the problem with most shared complexes which inherently struggle to reflect the tenants, BPB fails in ballpark personality, but the flaw is exacerbated here due to the already generic design and poor attendance numbers. 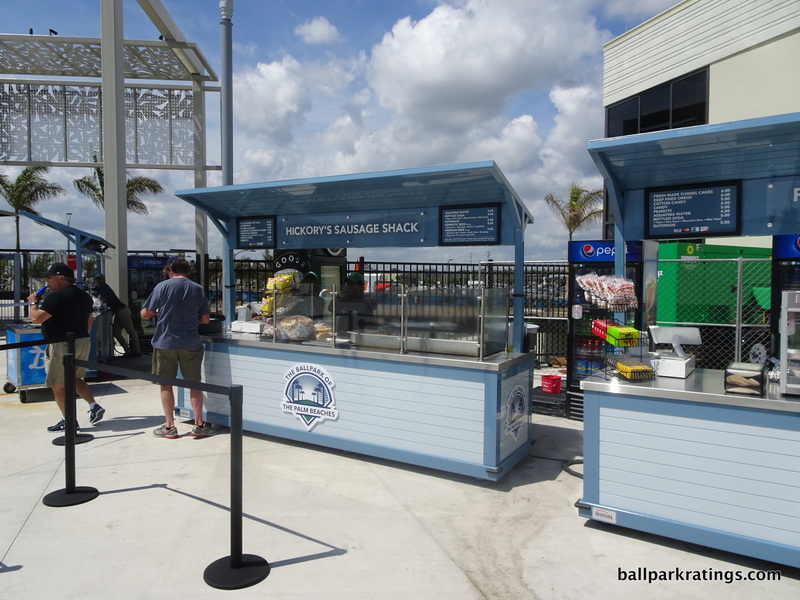 The few highlights include team branded concessions (i.e. 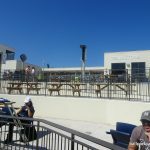 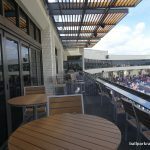 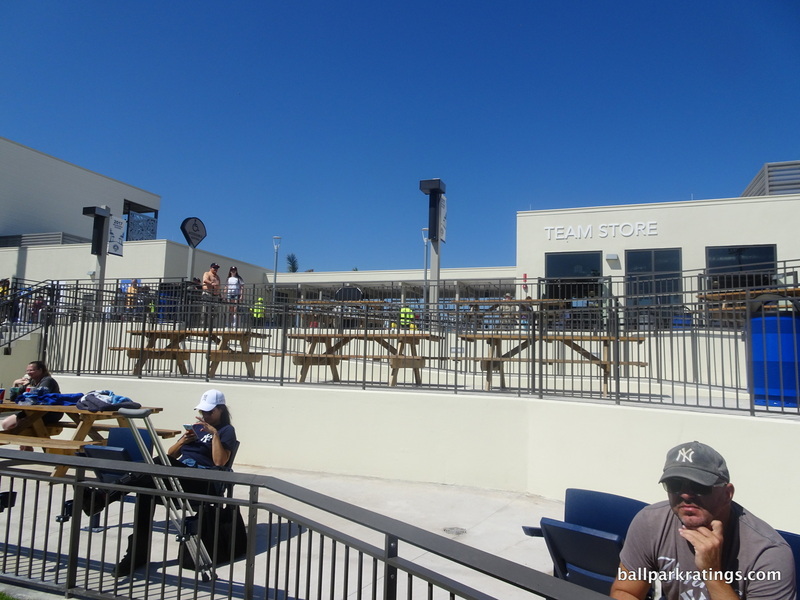 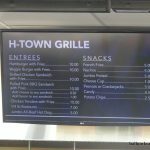 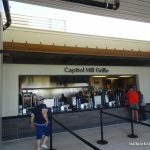 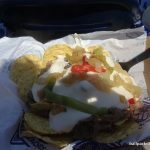 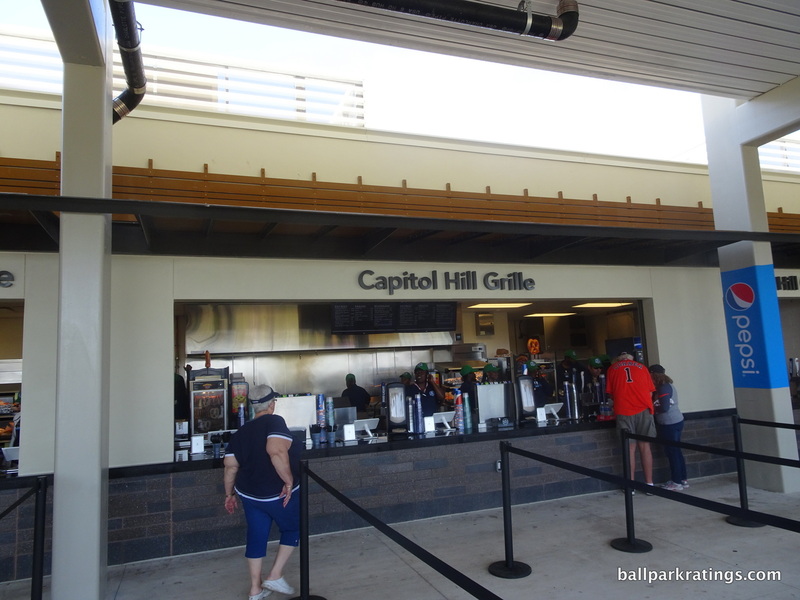 “Lone Star Cantina” and “Capitol Hill Grille”) and the Presidents’ Race for Nationals games. 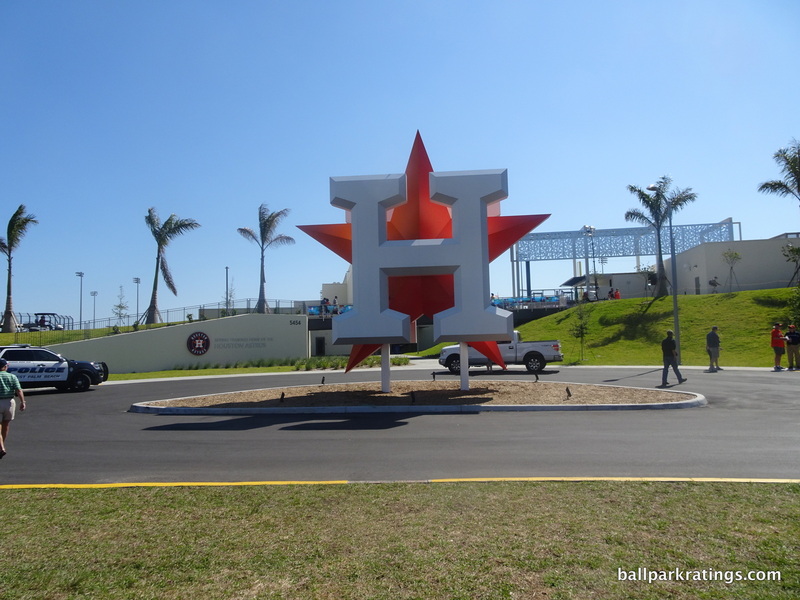 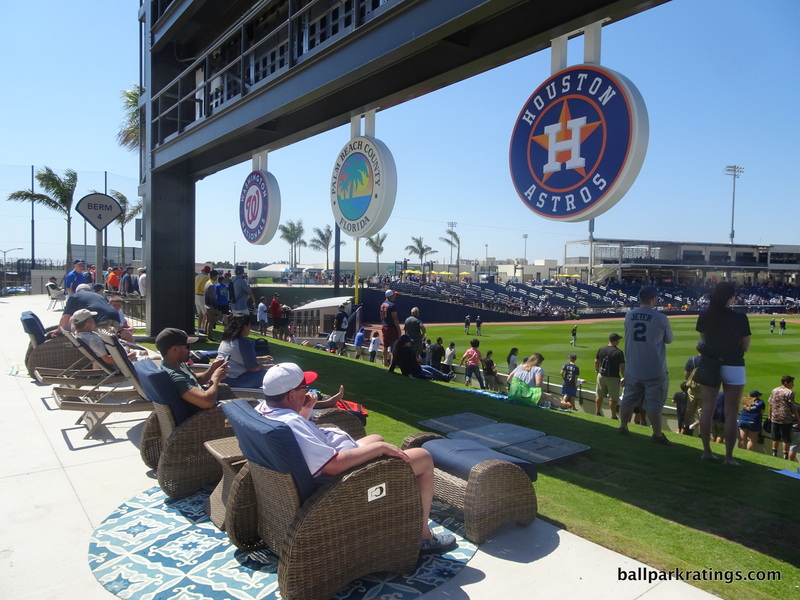 One additional bright spot: fan access to players is the best in Florida on the Astros side. 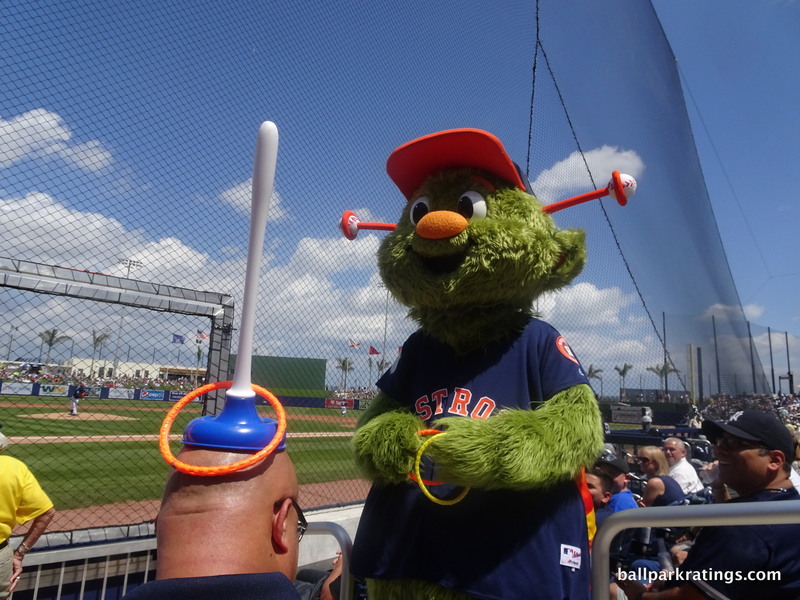 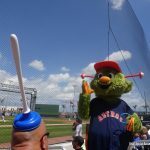 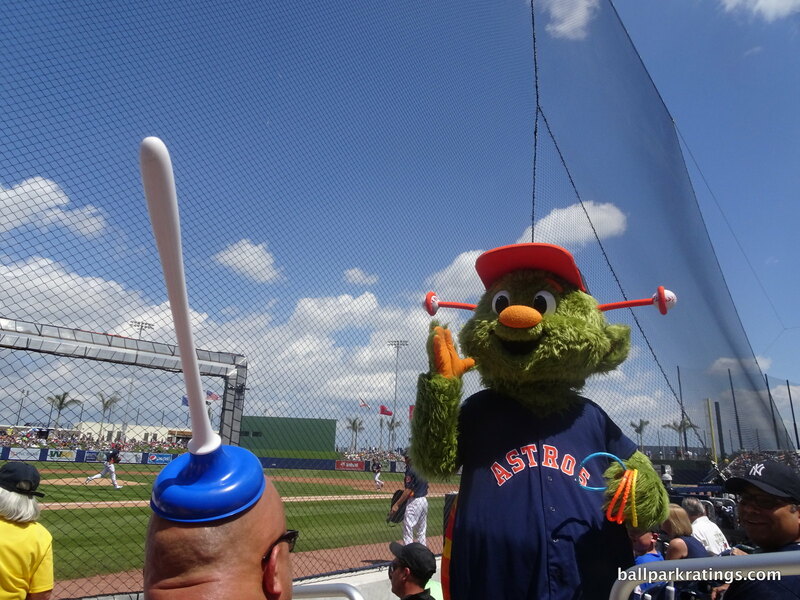 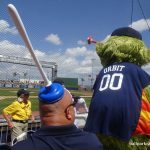 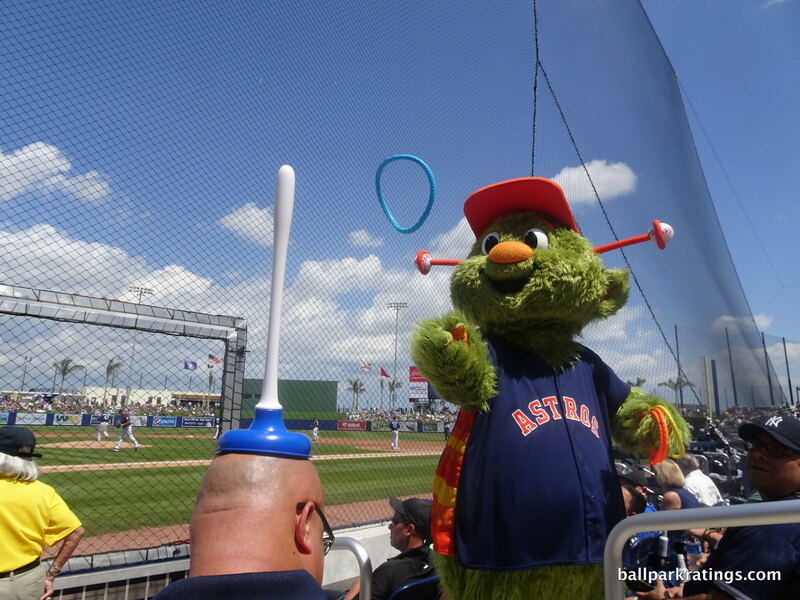 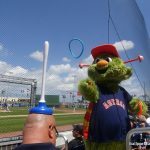 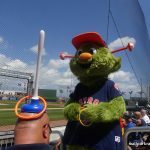 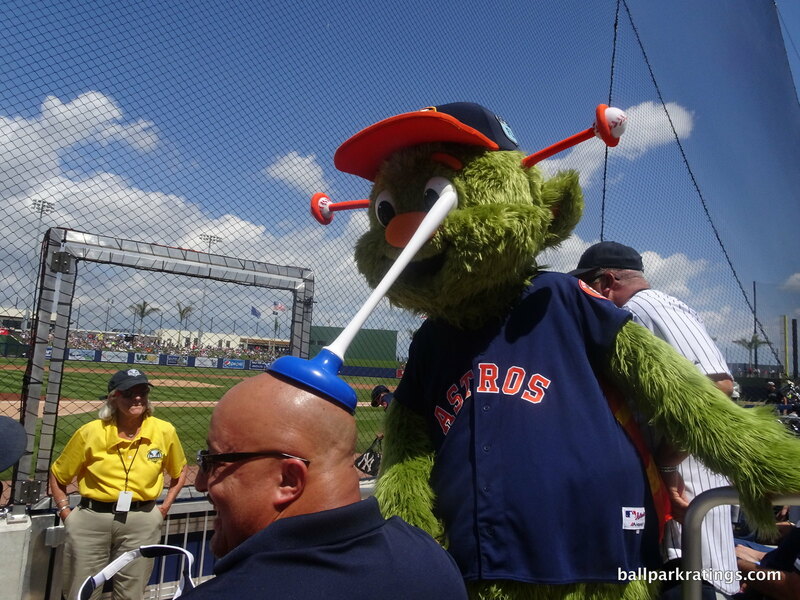 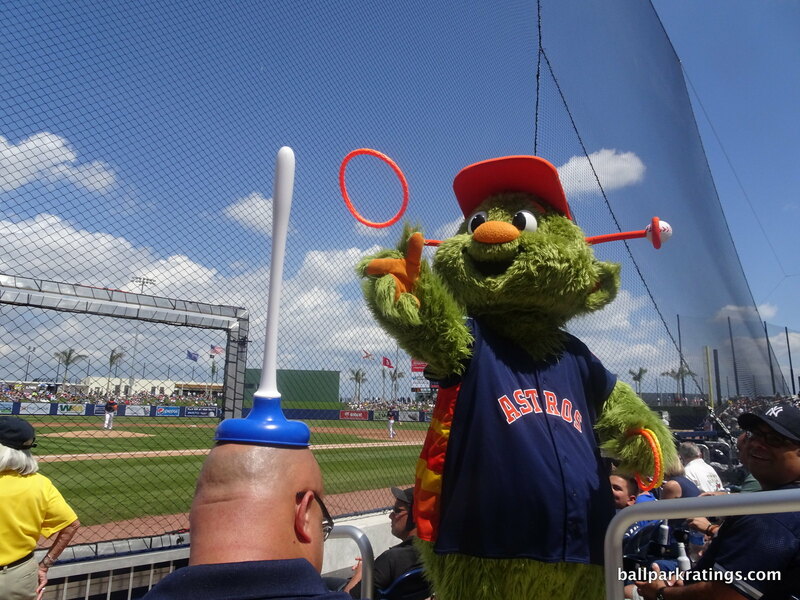 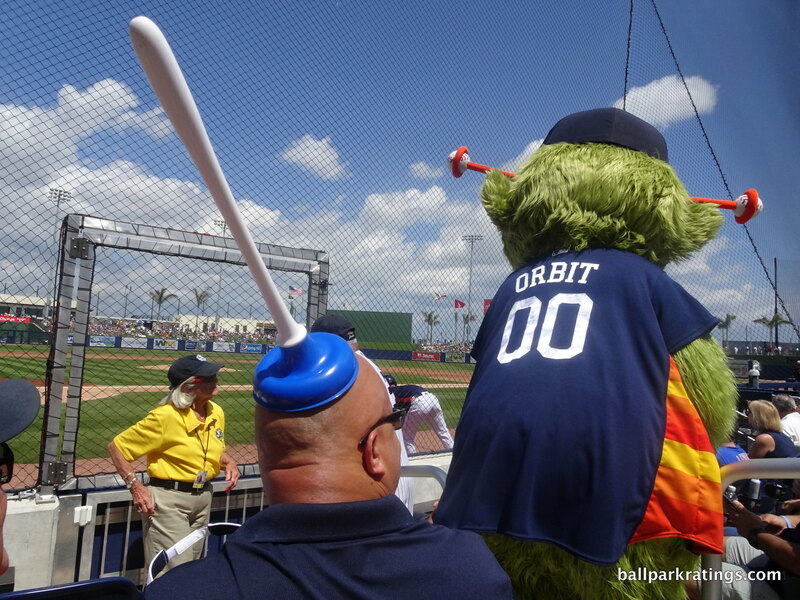 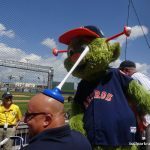 Orbit having fun with a fan. 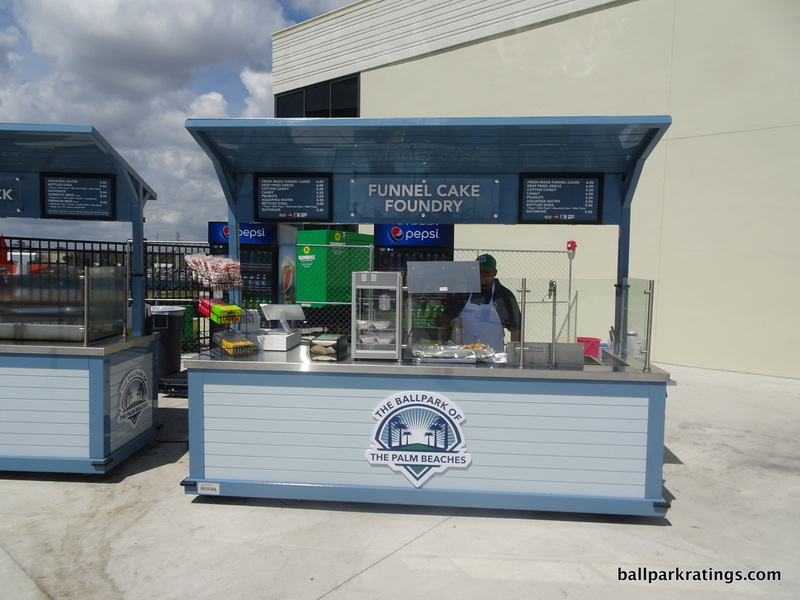 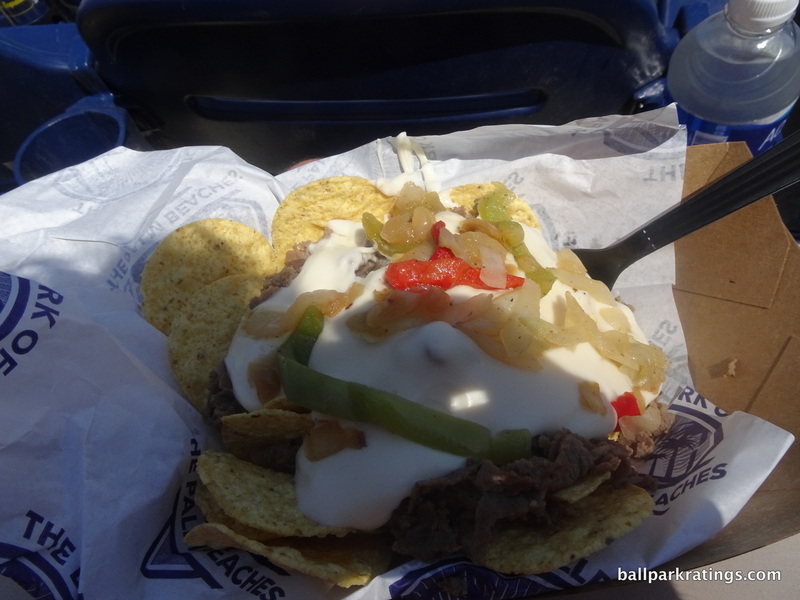 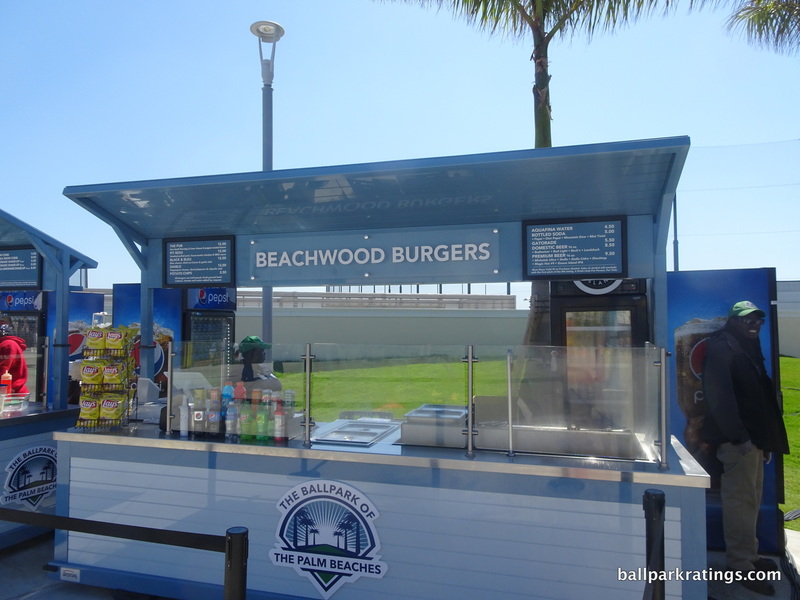 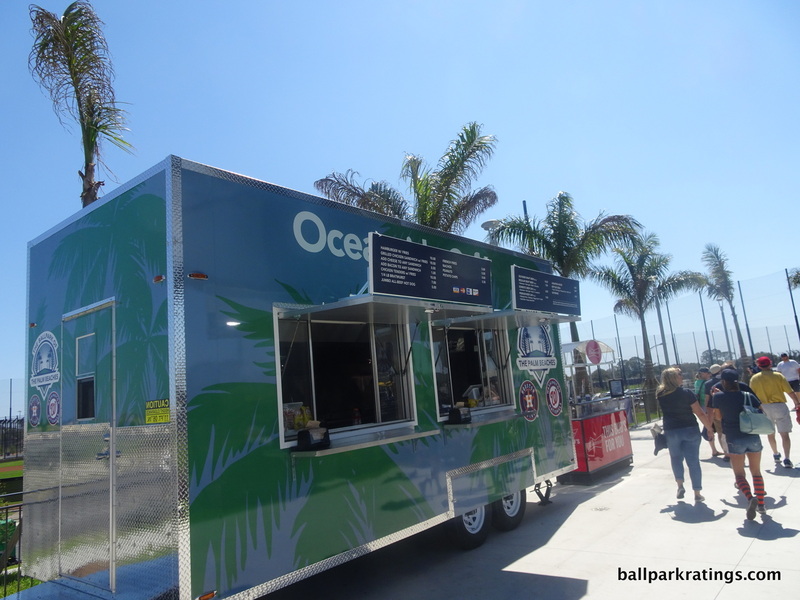 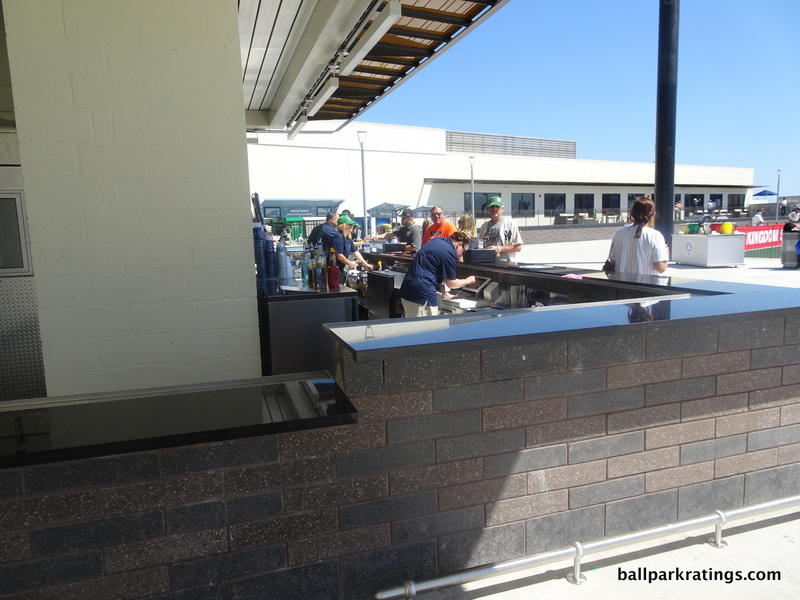 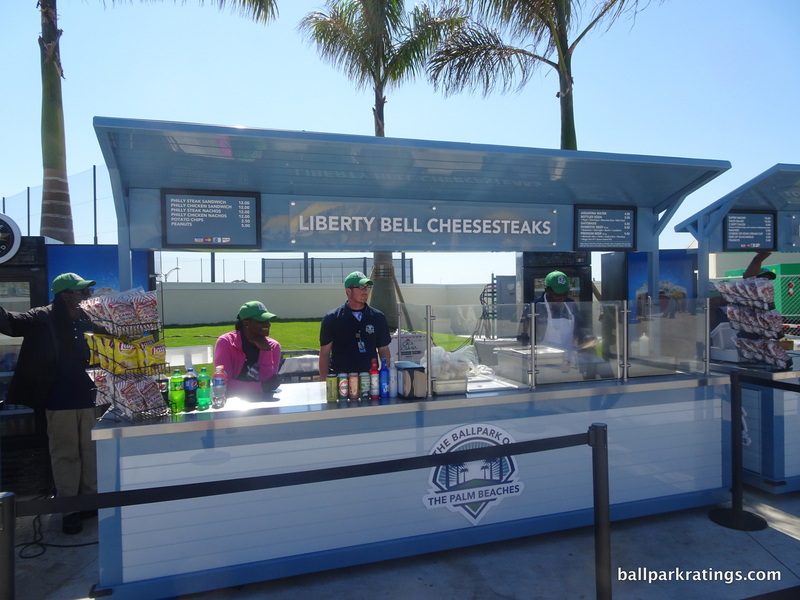 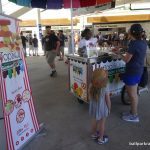 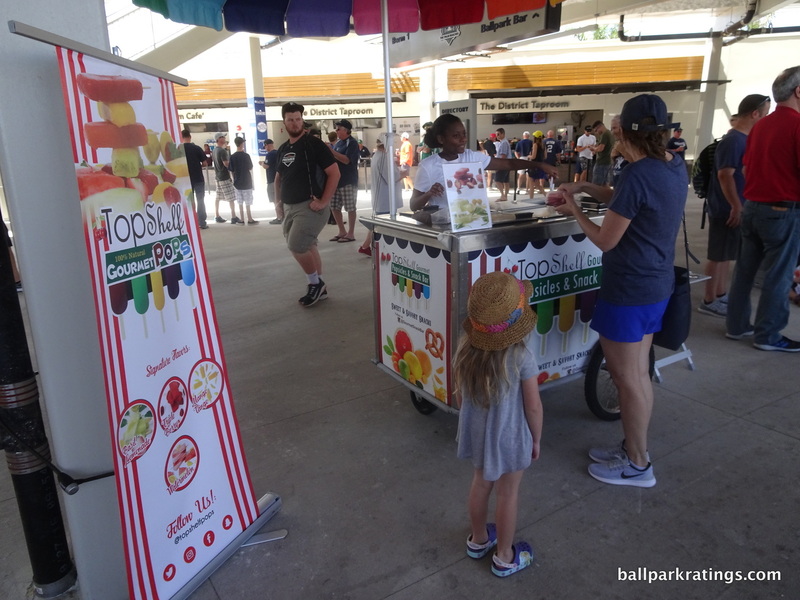 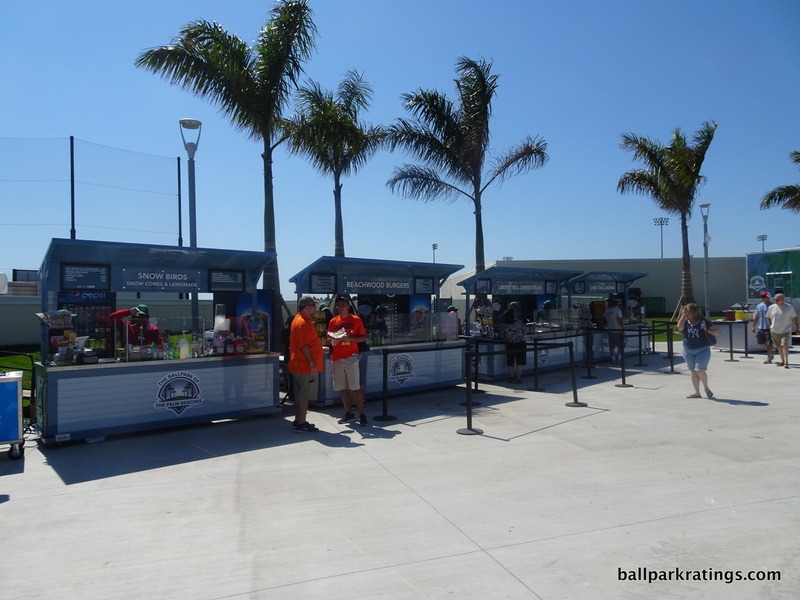 First off, the quality and variety of concessions is relatively lackluster, unacceptable for a new park. 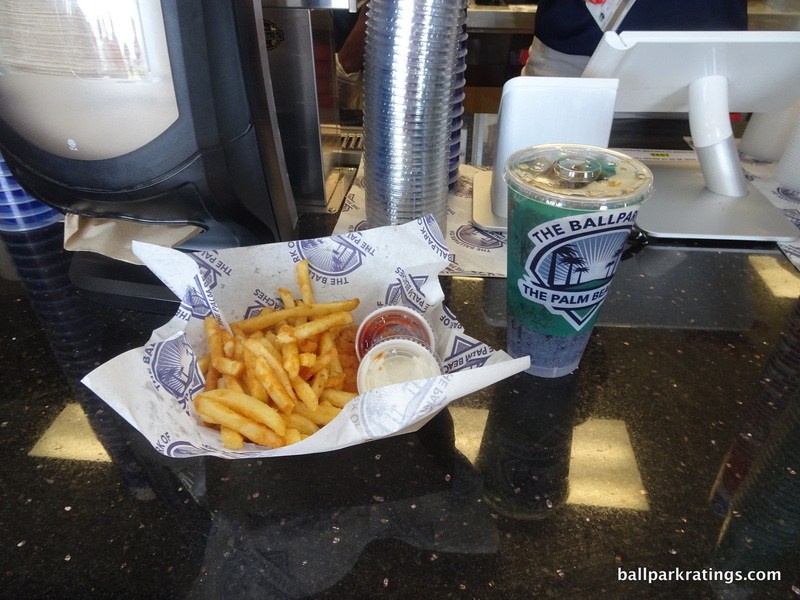 With the exception of some mediocre Mexican food, we mostly just have the basics here. 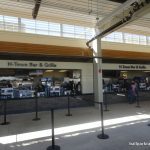 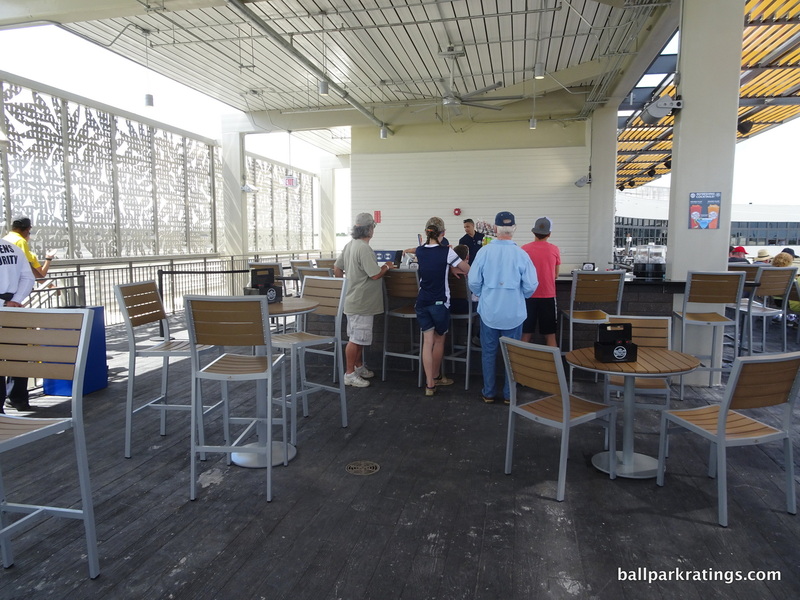 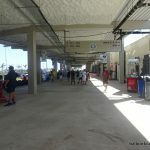 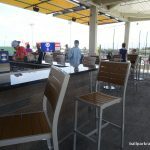 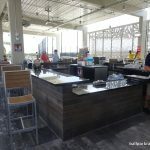 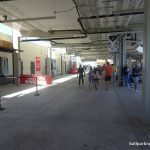 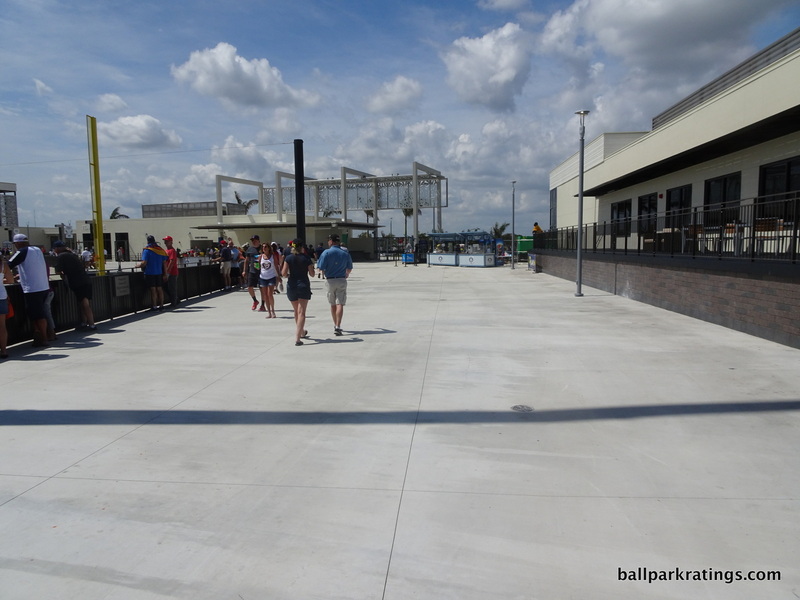 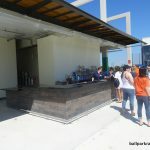 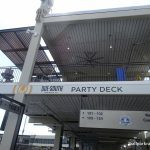 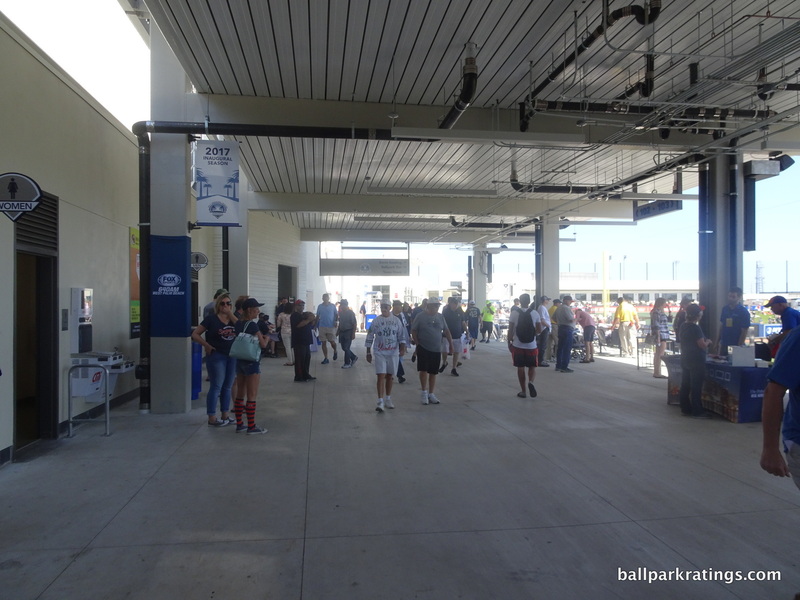 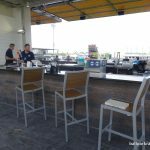 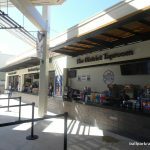 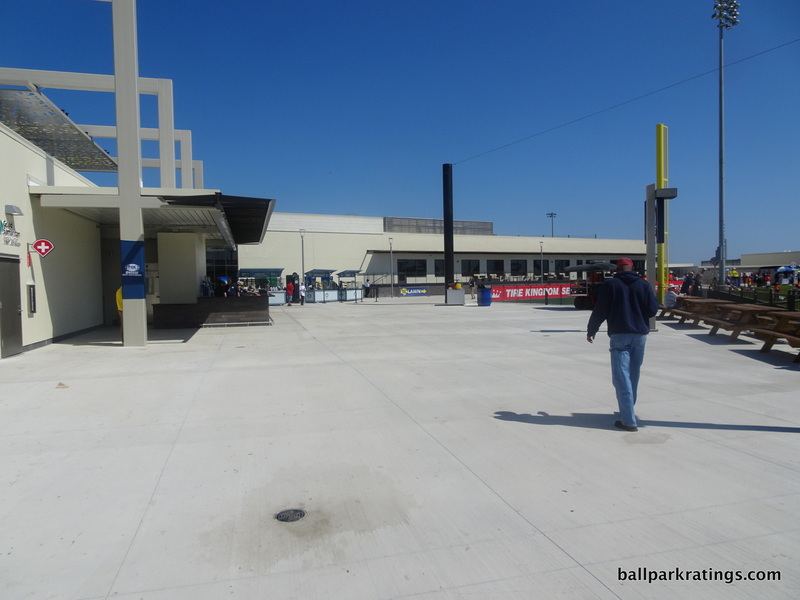 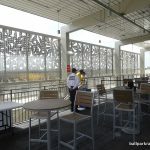 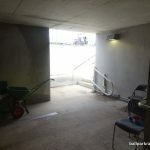 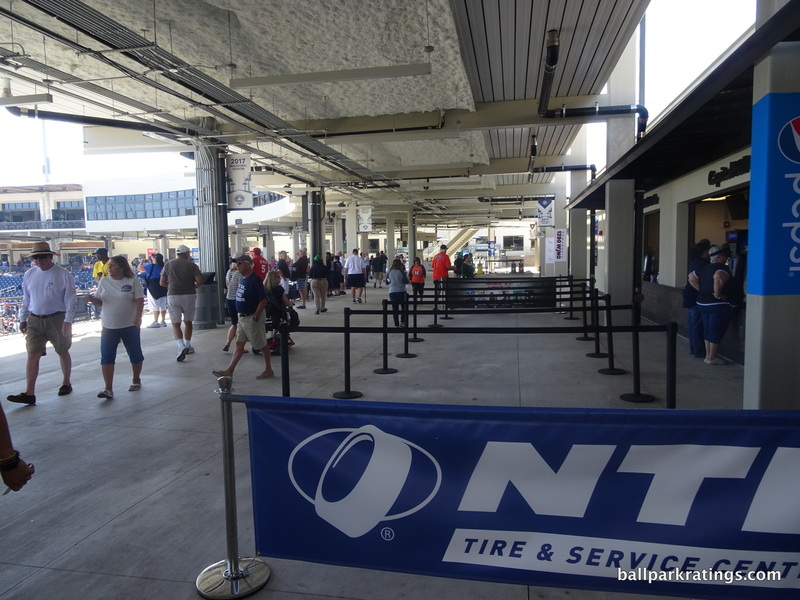 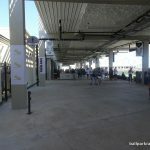 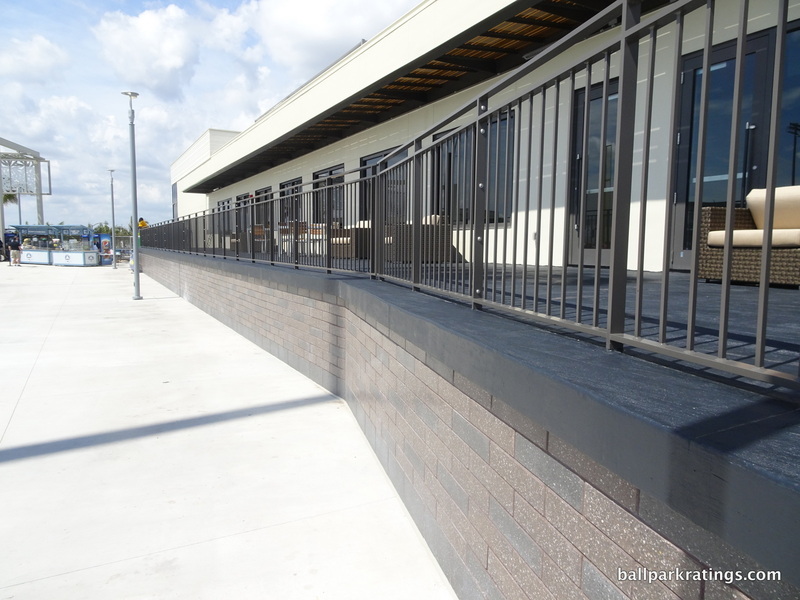 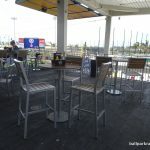 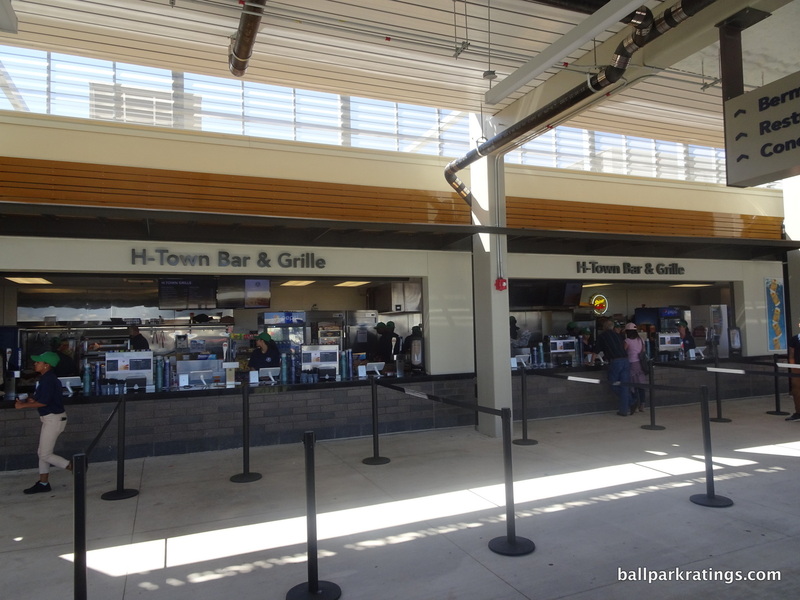 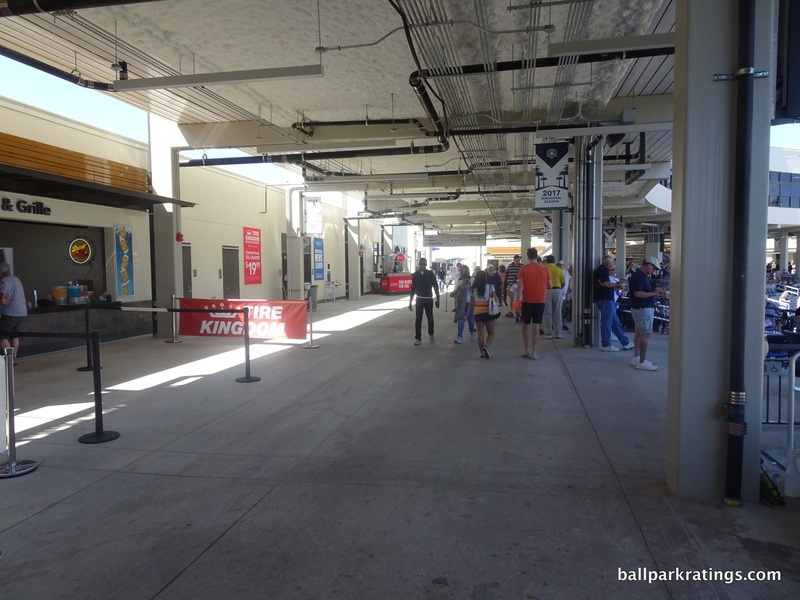 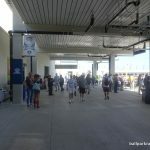 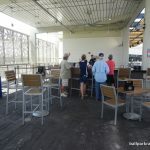 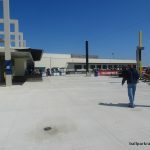 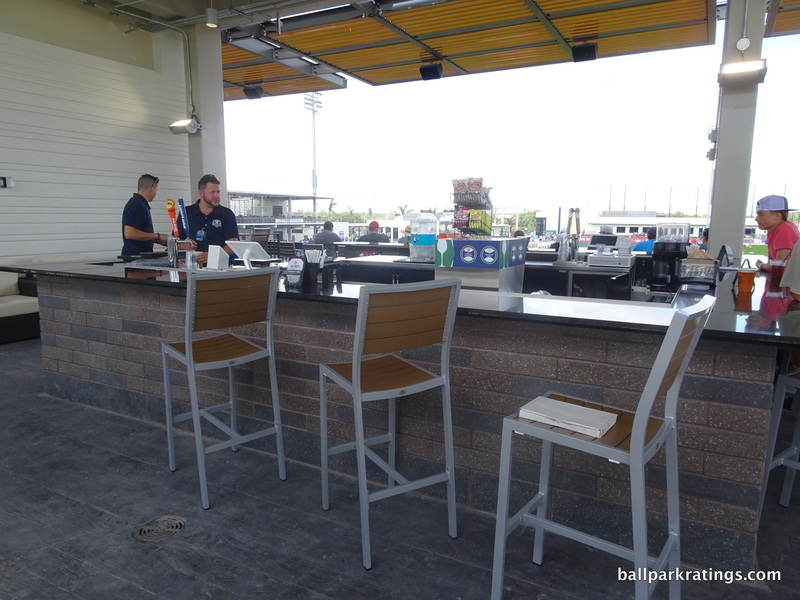 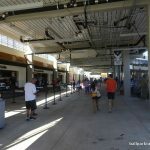 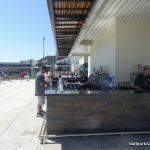 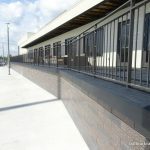 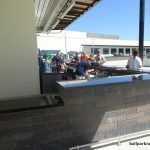 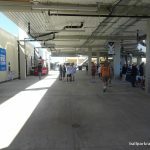 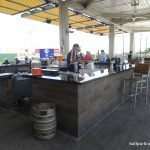 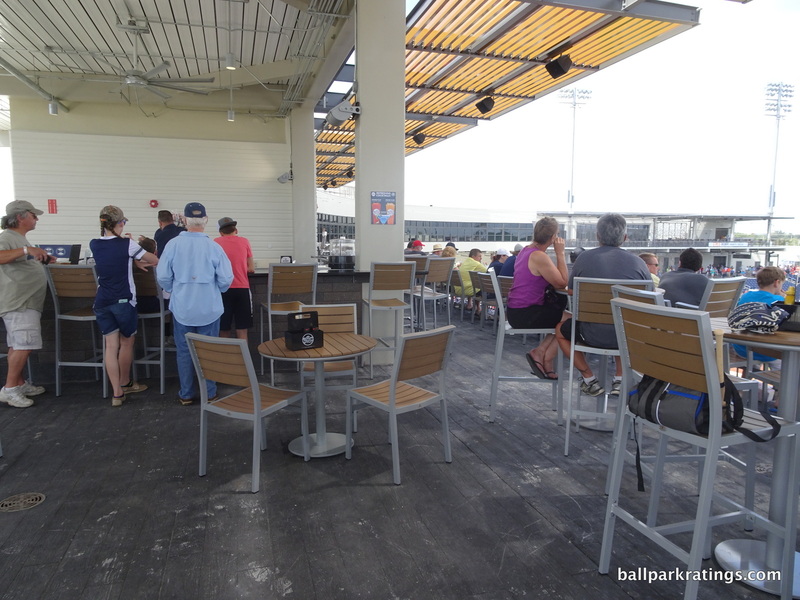 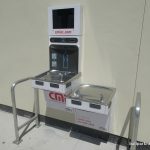 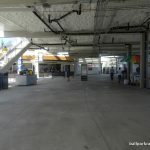 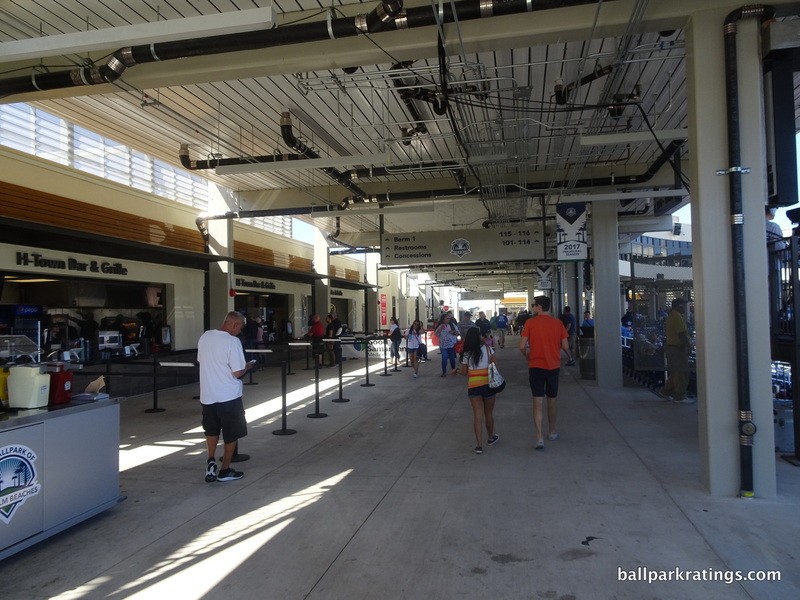 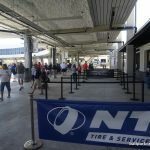 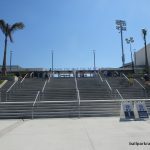 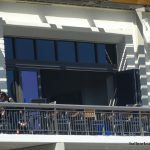 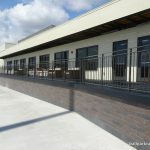 Even more troubling is the lack of social spaces, bars, and sitting areas accessible to all fans, as this isn’t one of those places with areas to “hang out” on the concourse. 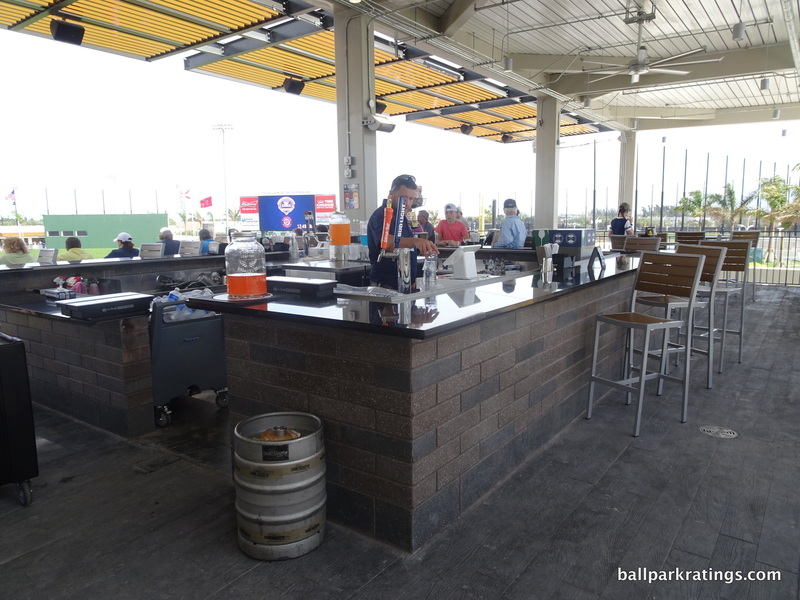 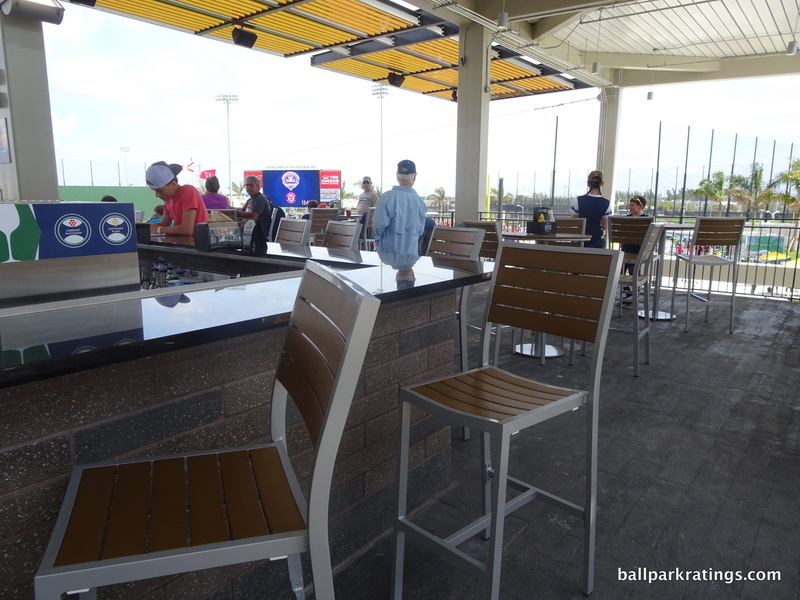 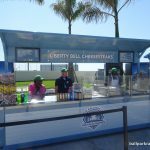 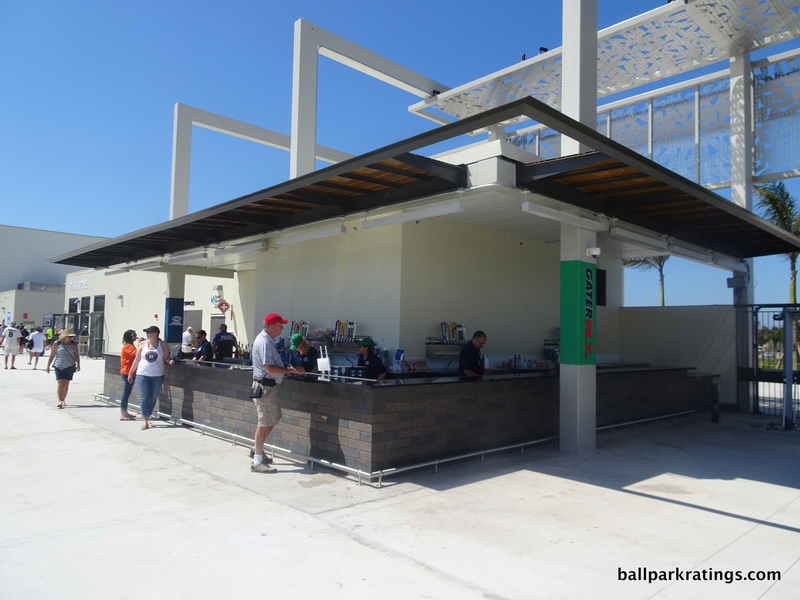 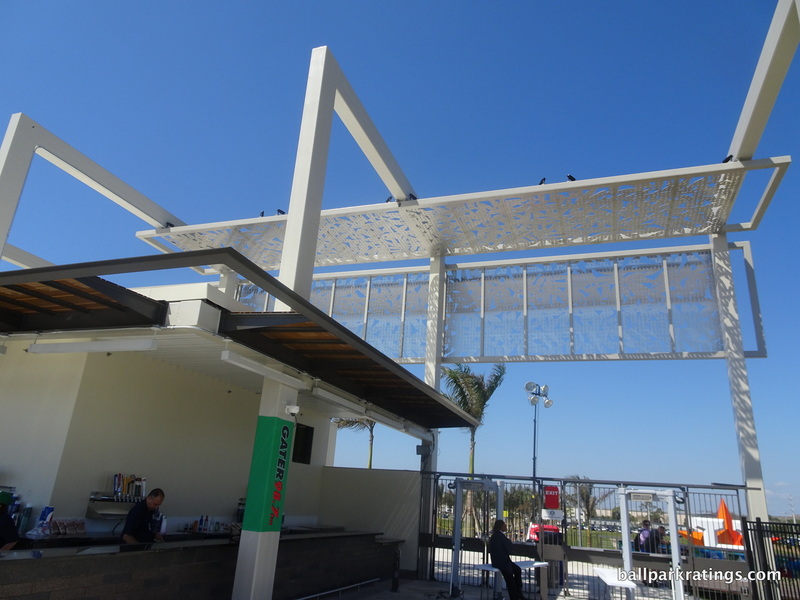 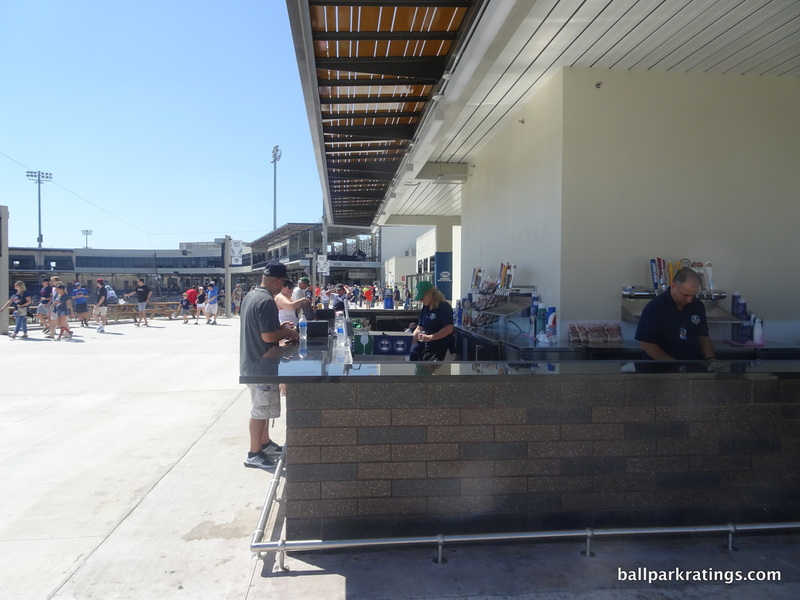 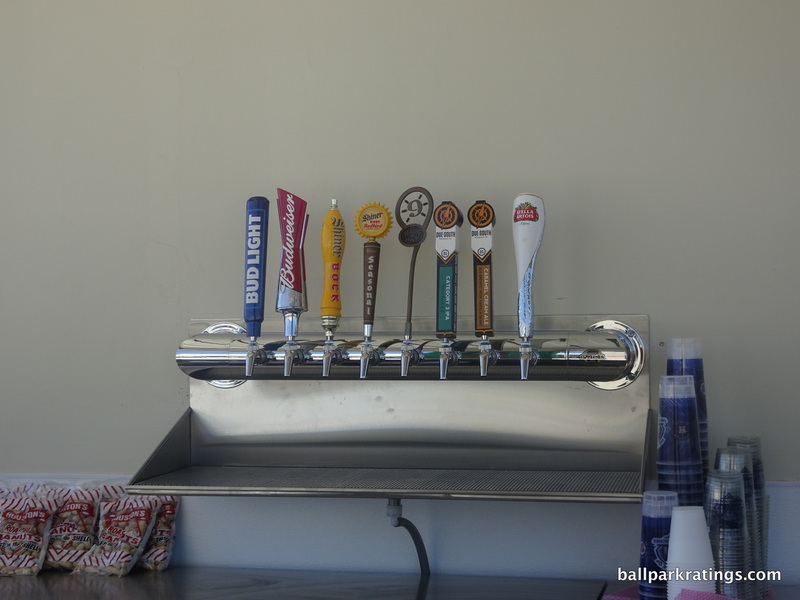 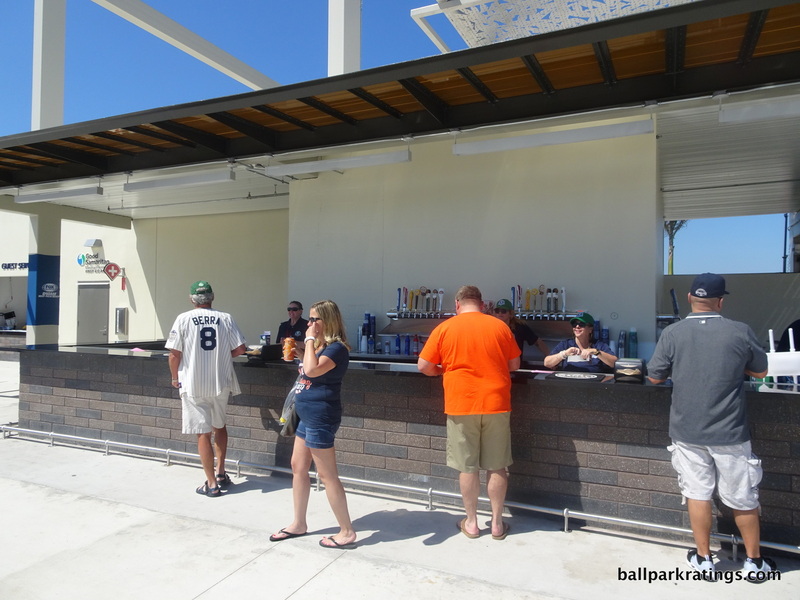 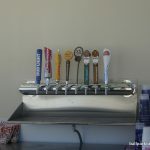 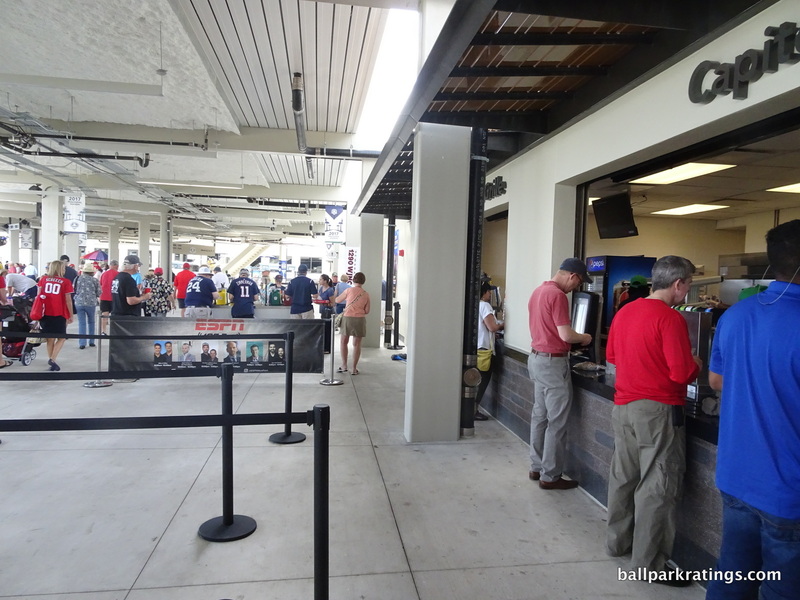 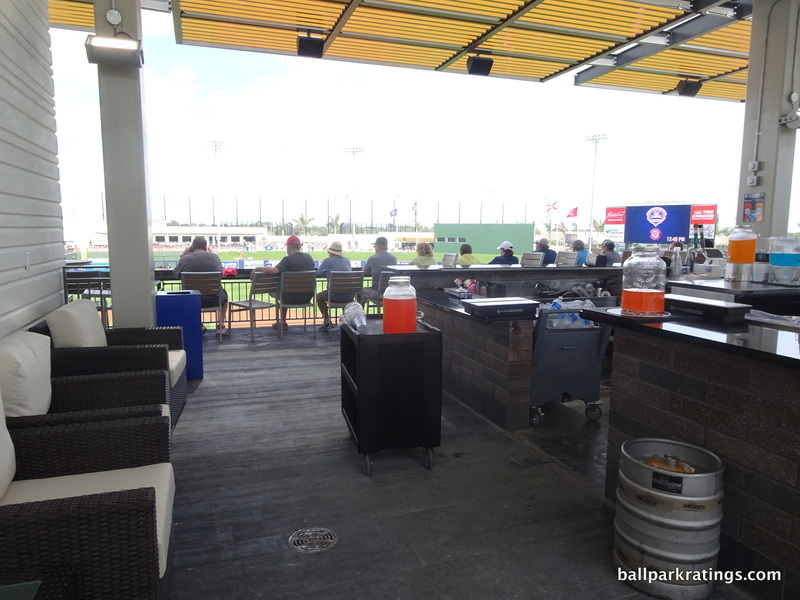 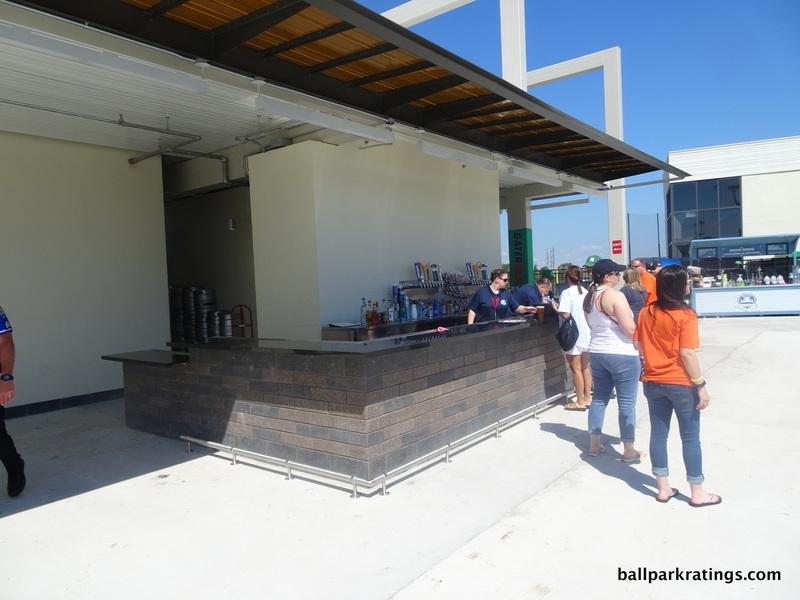 Exhibit A: the “Left Field Bar,”which just functions as an alcohol concession stand. 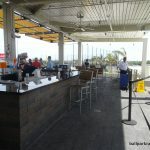 Compare this to the well-designed destination bars which function as bona fide social spaces throughout Florida (Here is a typical one. 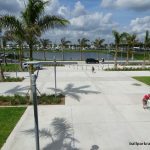 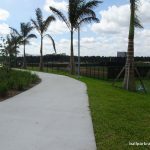 Another 5 parks or so have something similar). 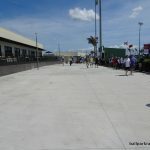 Very poor. 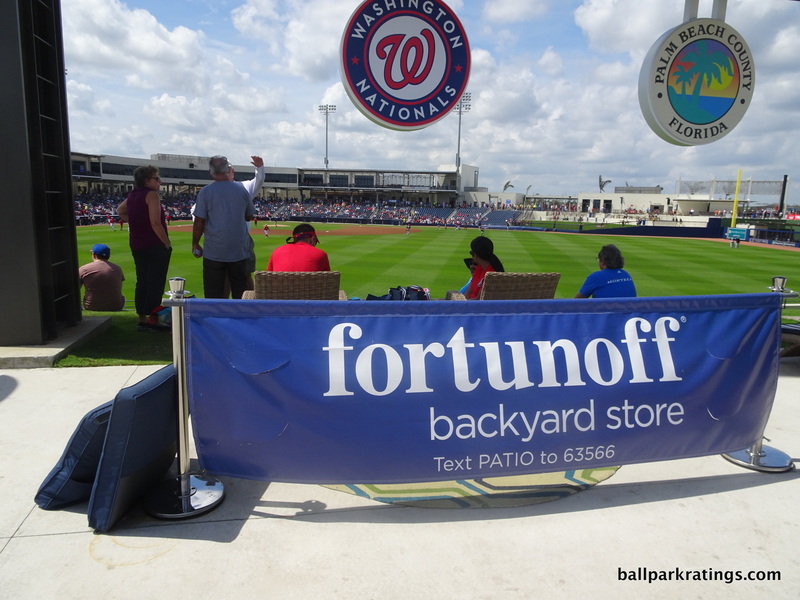 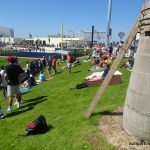 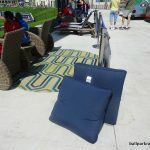 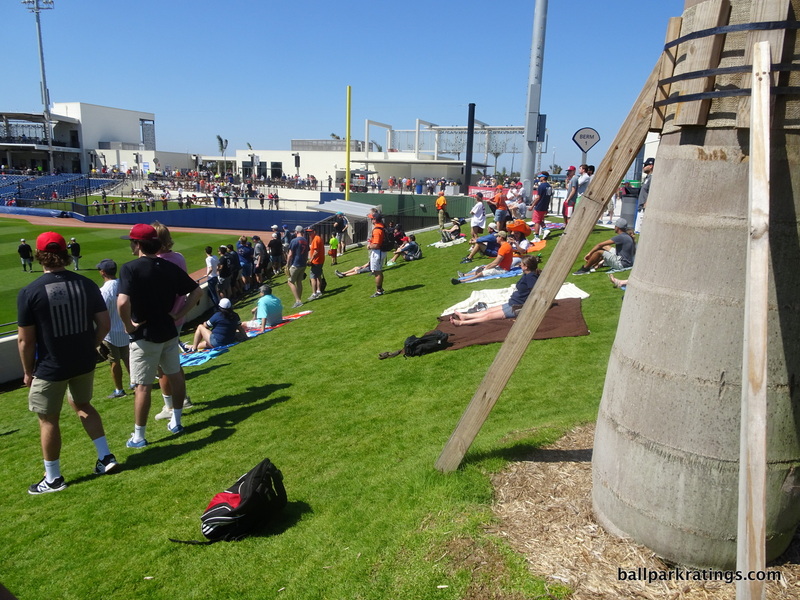 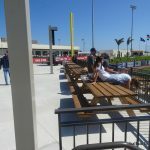 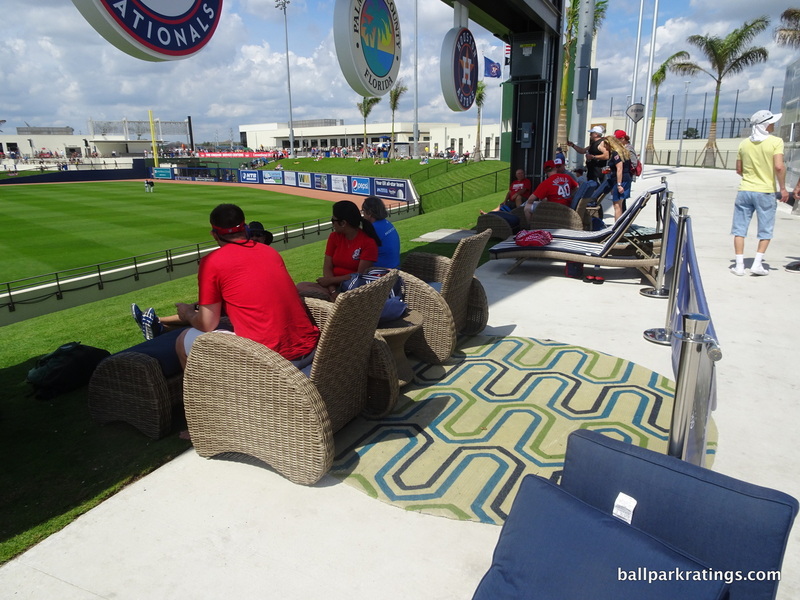 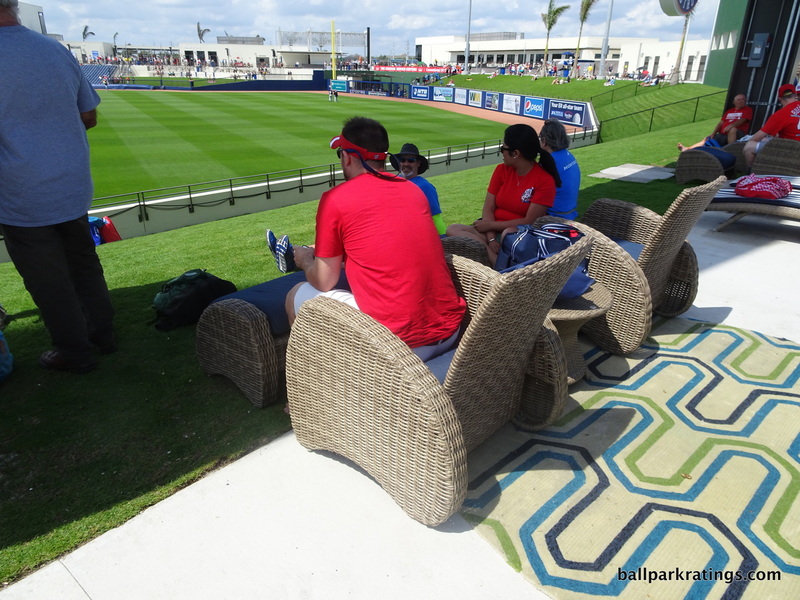 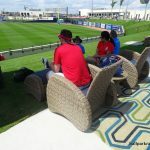 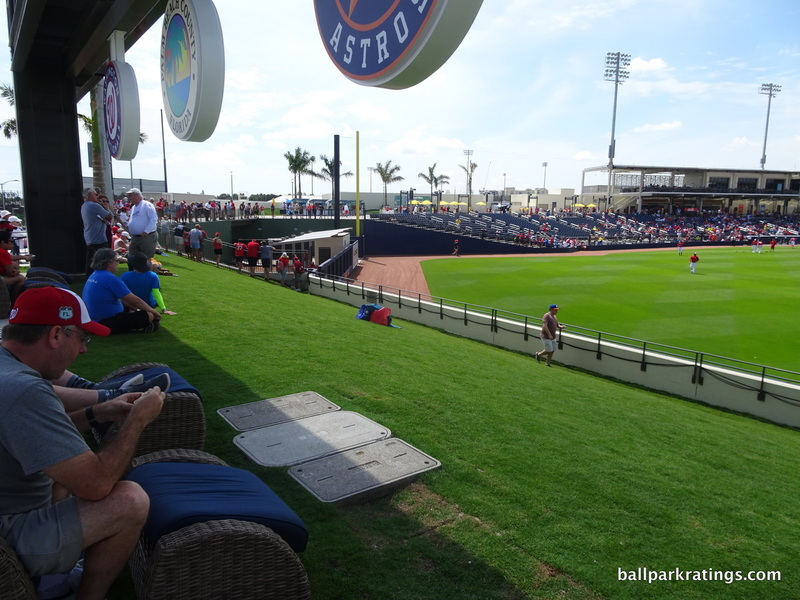 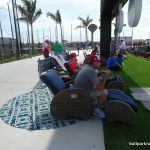 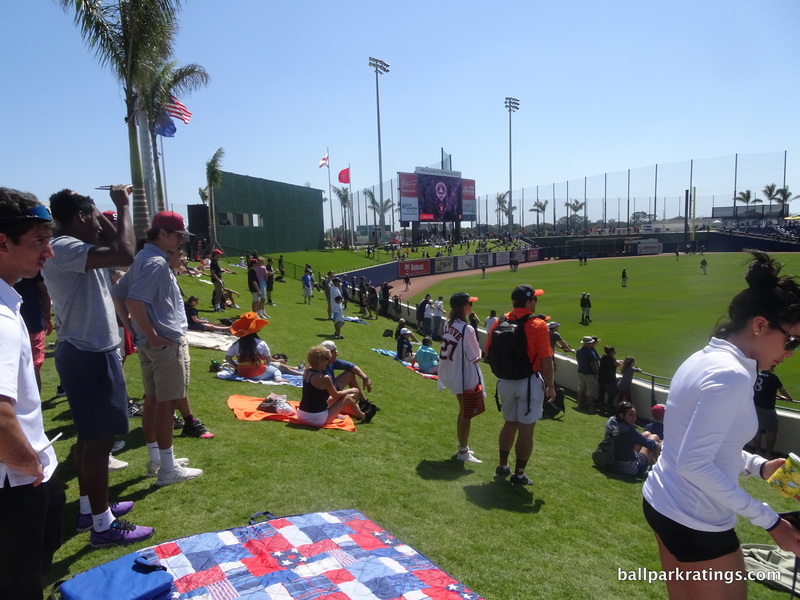 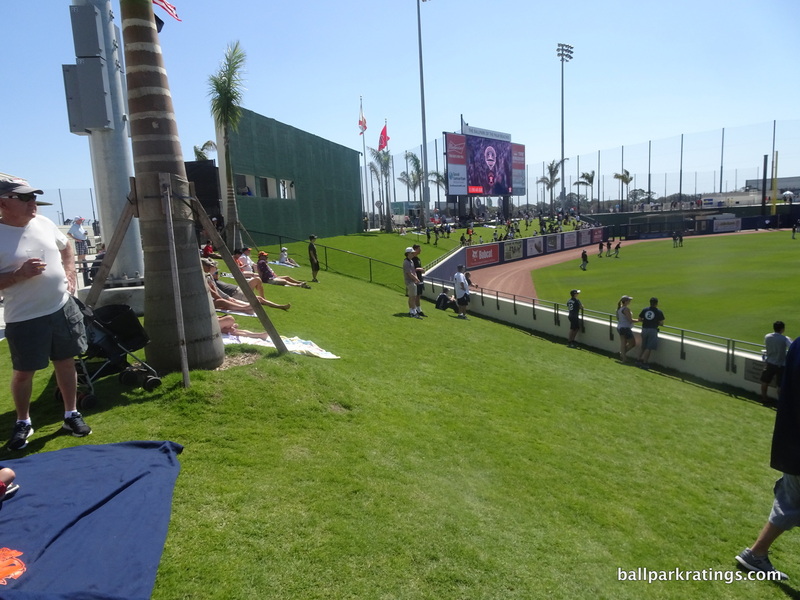 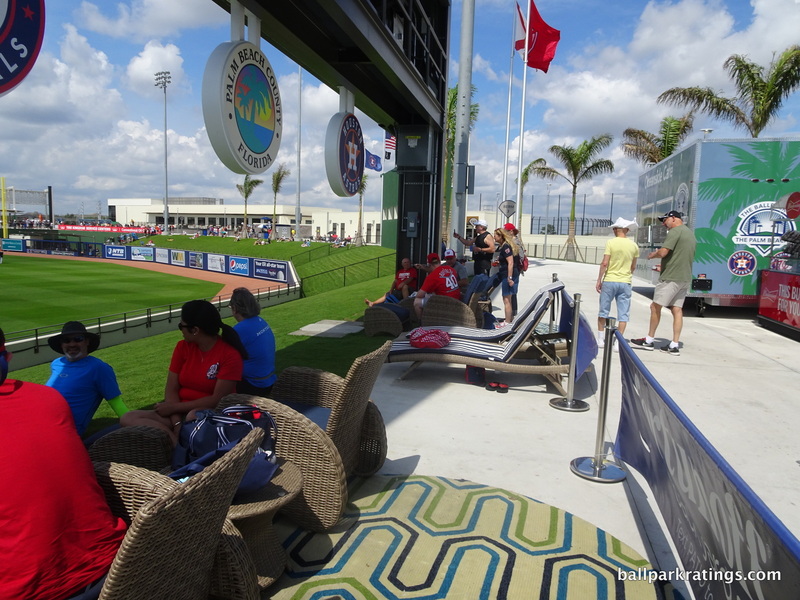 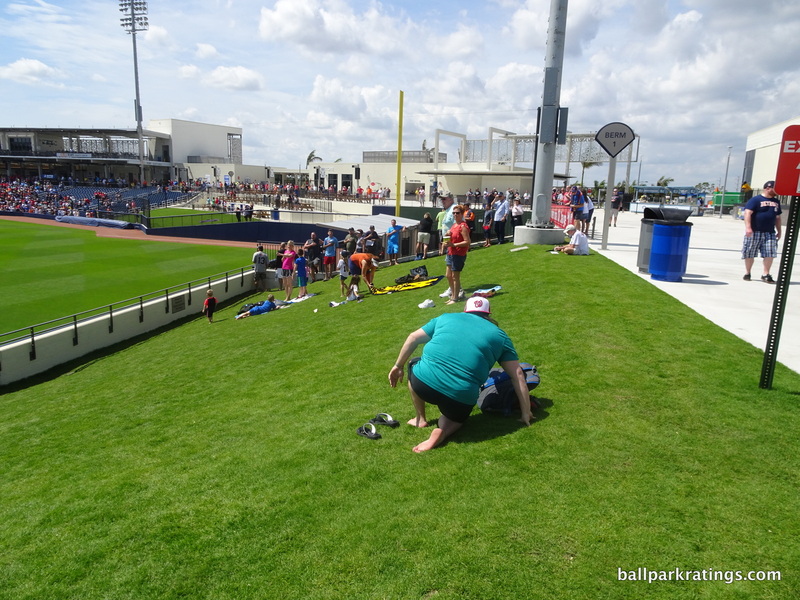 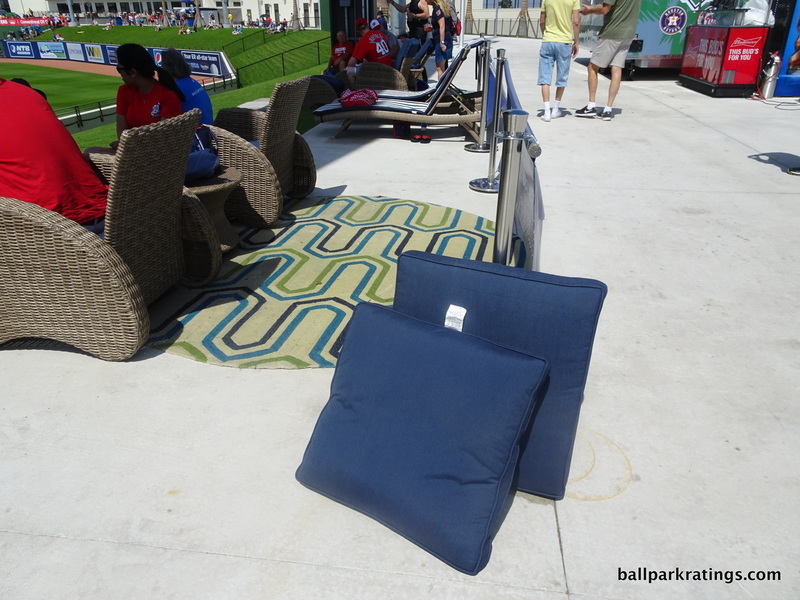 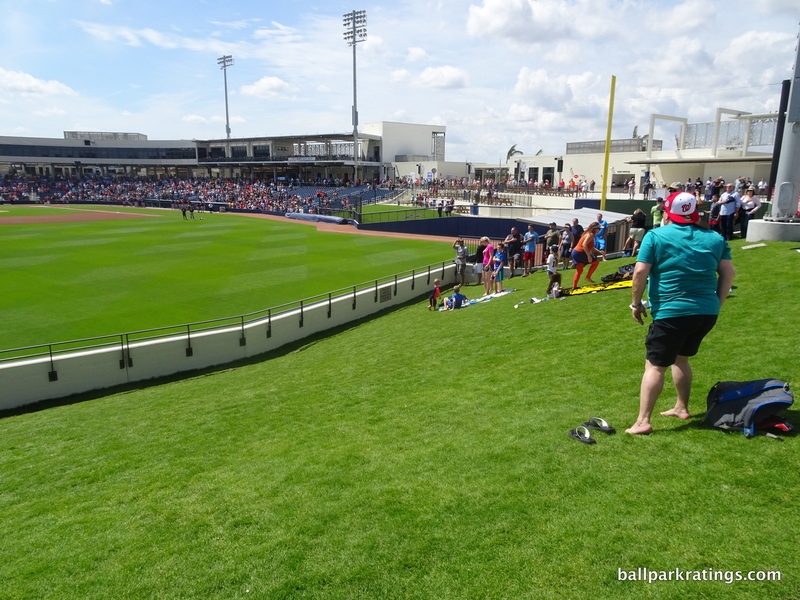 A sparse number of beach-style lounge chairs in the outfield is the one bright spot, as there aren’t any other sitting areas accessible to all fans. 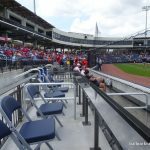 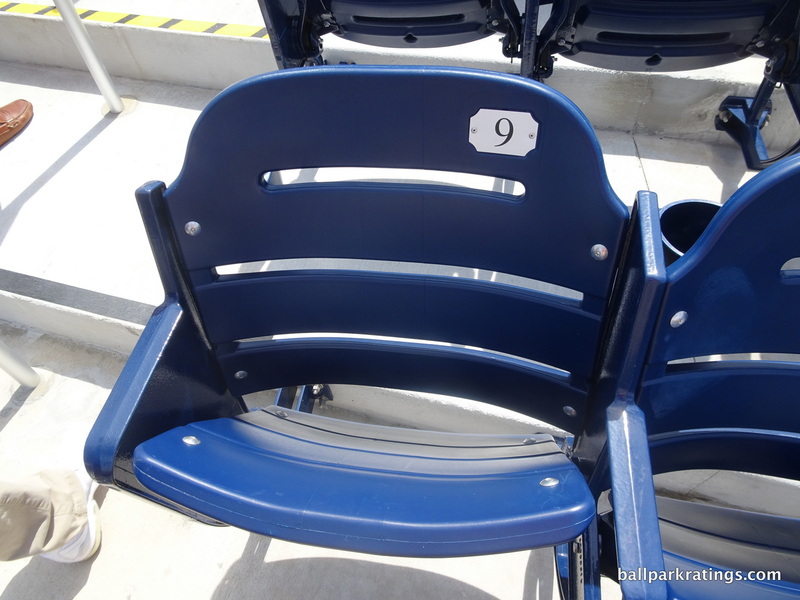 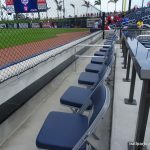 The unique seating options and premium areas are above-average, but not outstanding. 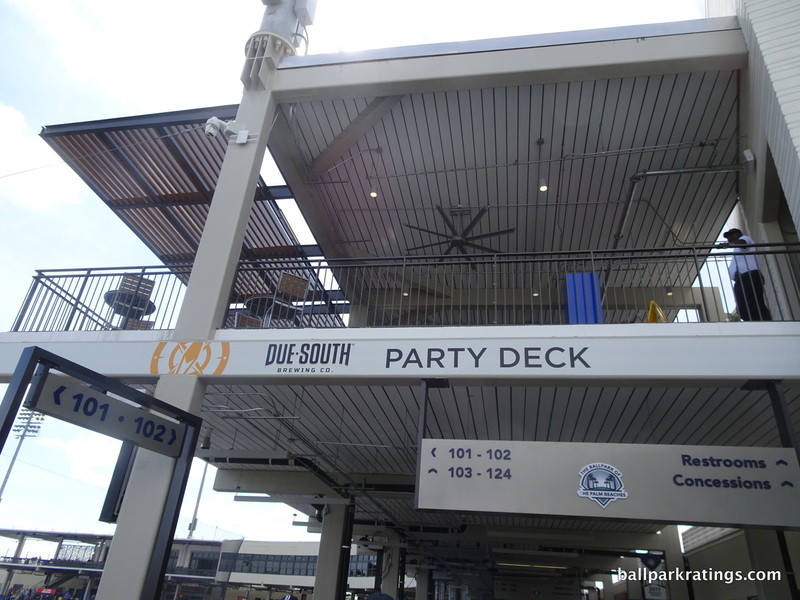 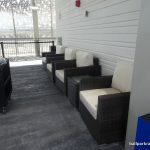 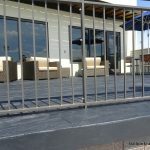 The six suites and two private party decks are well-appointed, and quite unique with their flexible, bar-style seating arrangement. 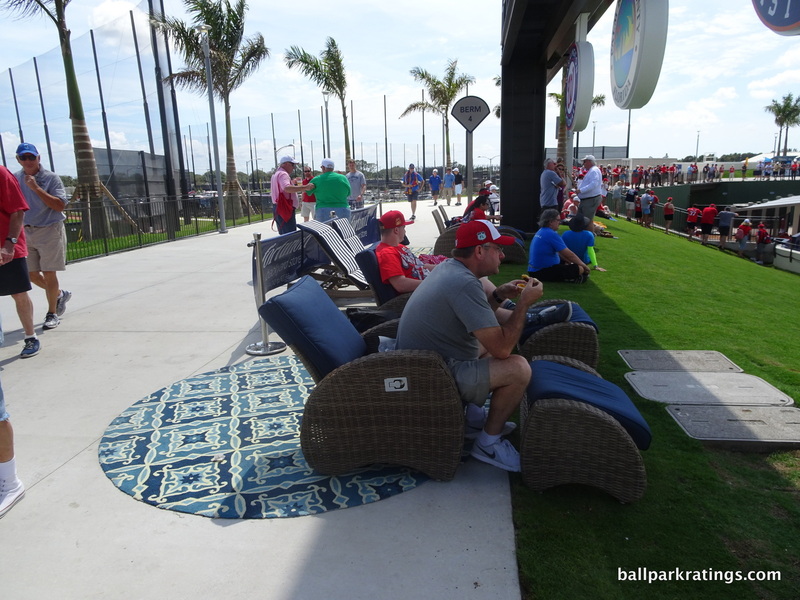 There’s a new all-inclusive picnic area in the left field corner. 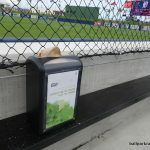 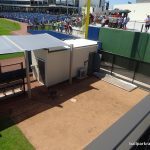 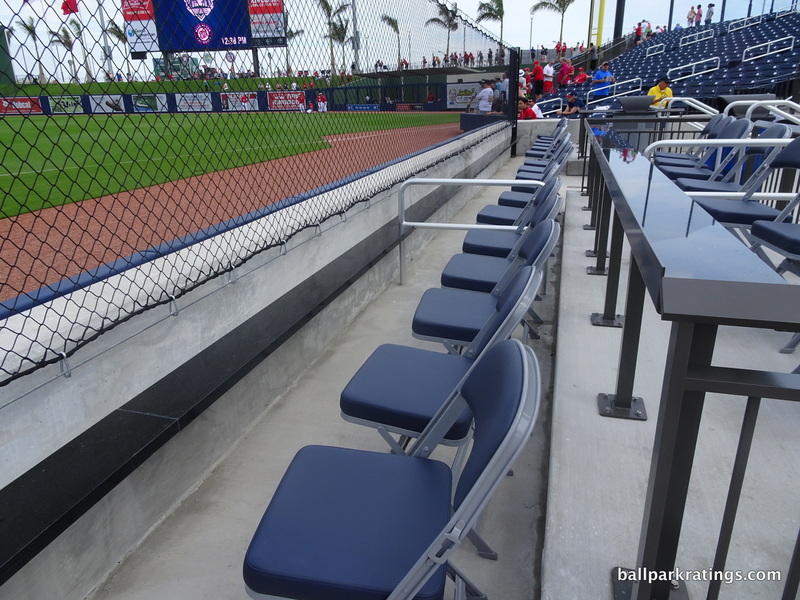 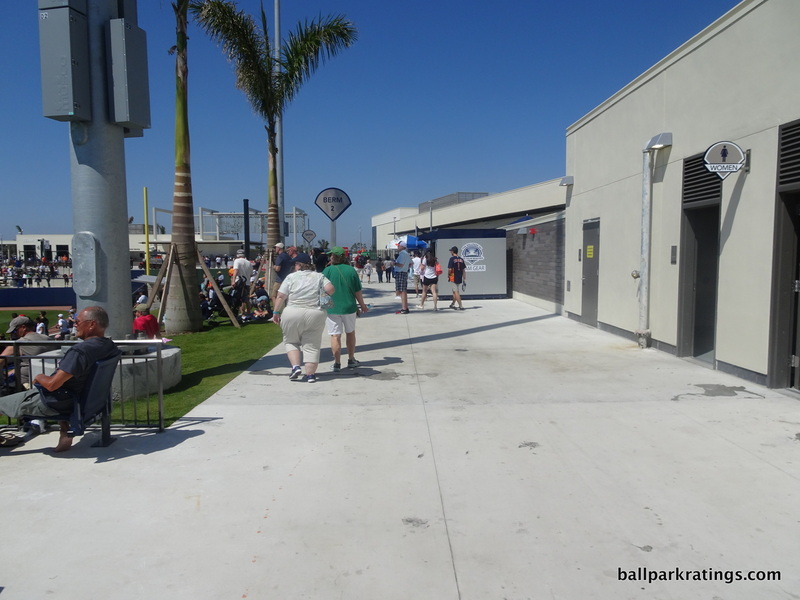 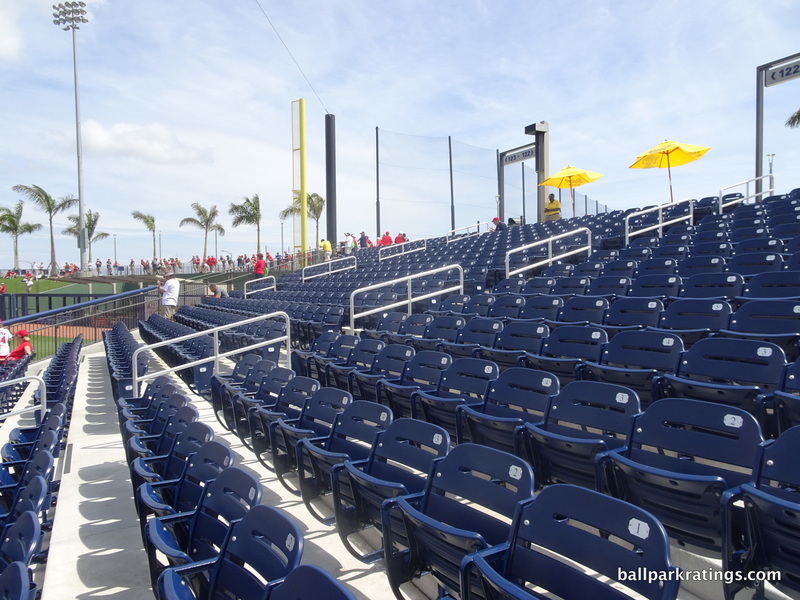 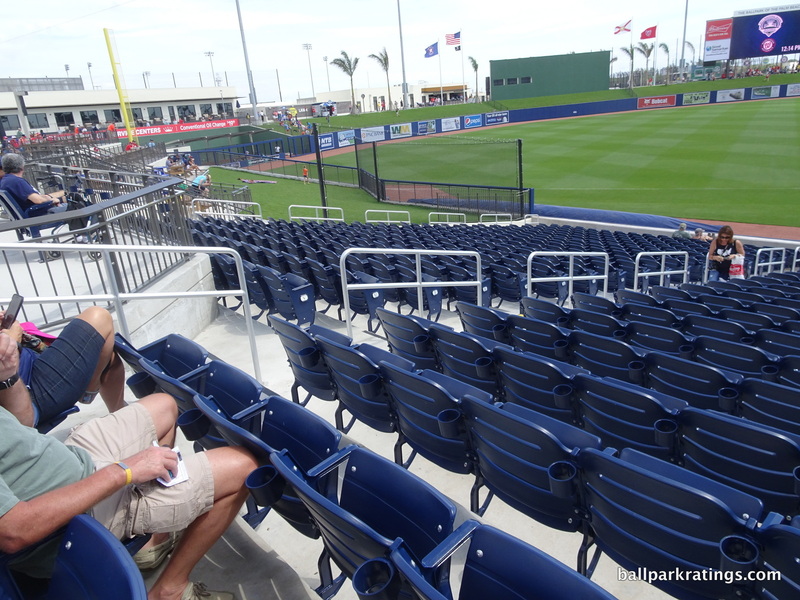 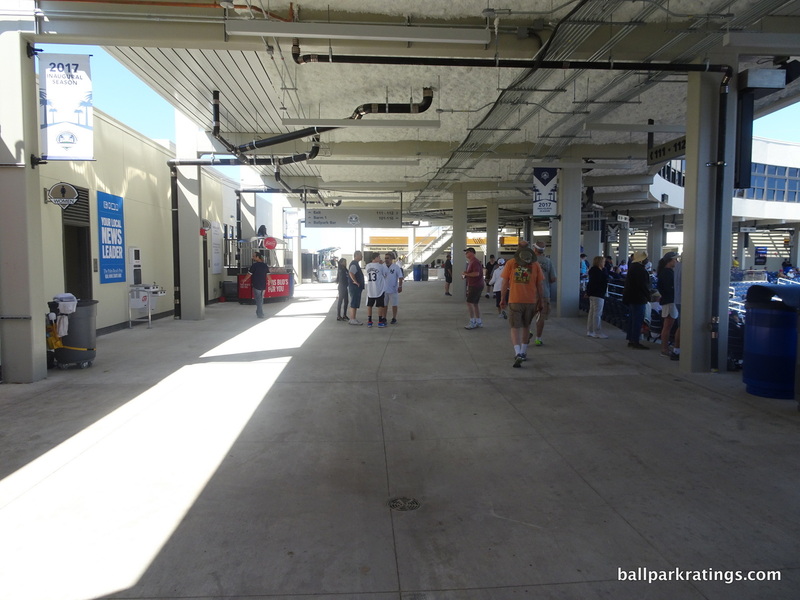 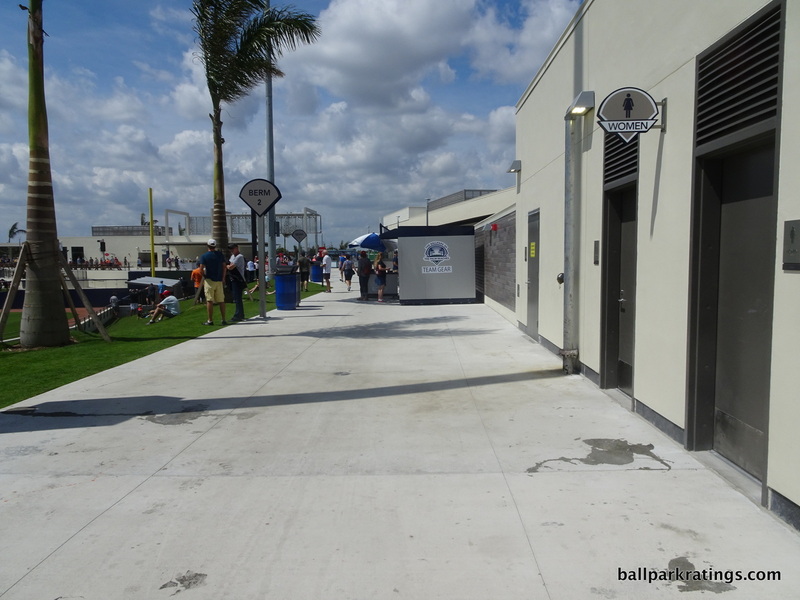 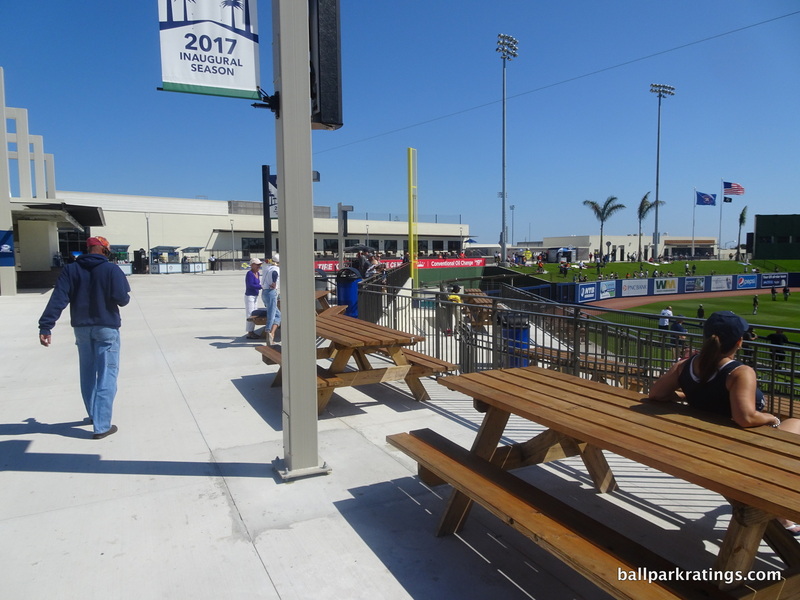 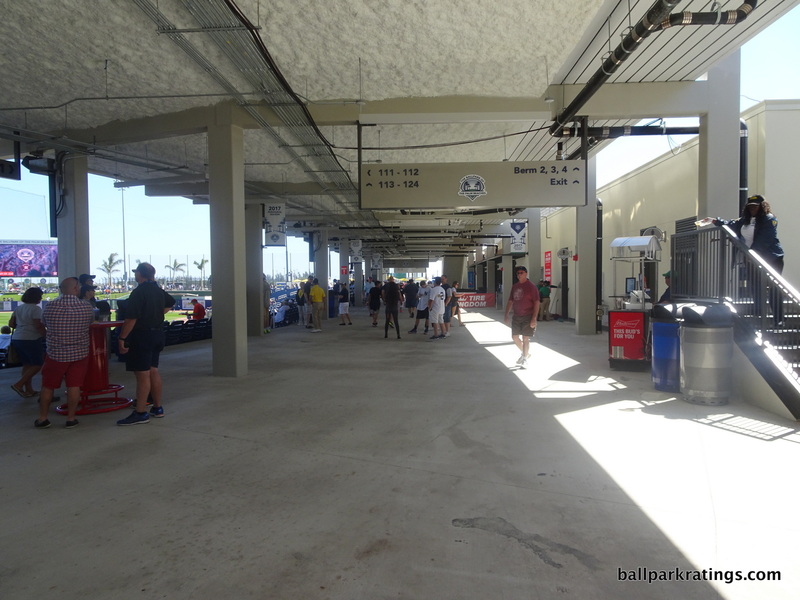 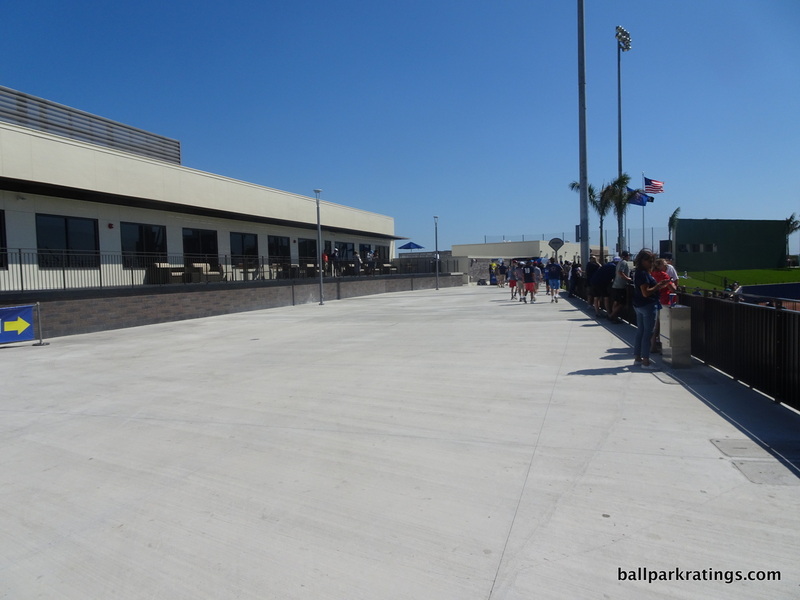 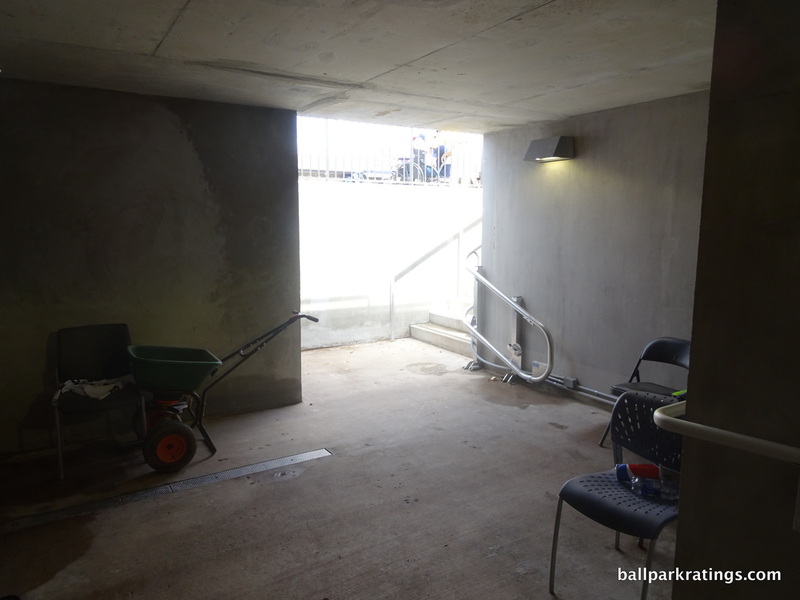 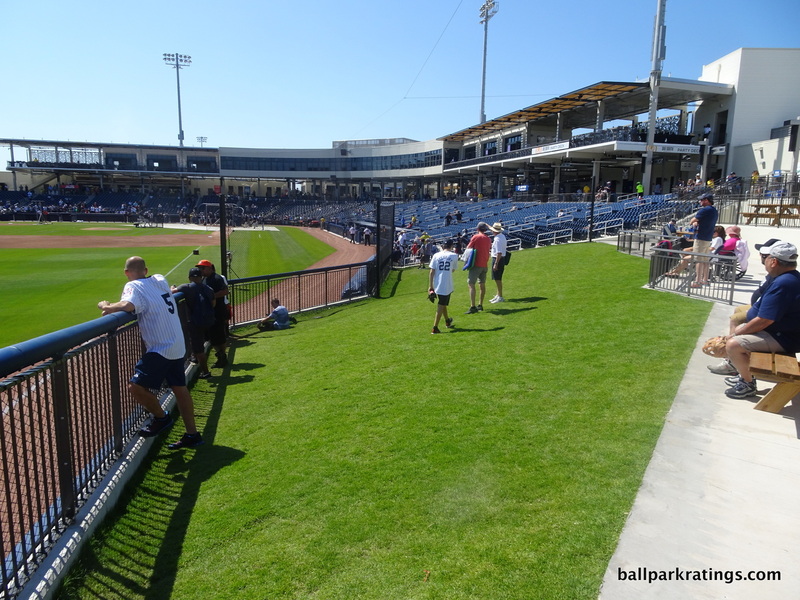 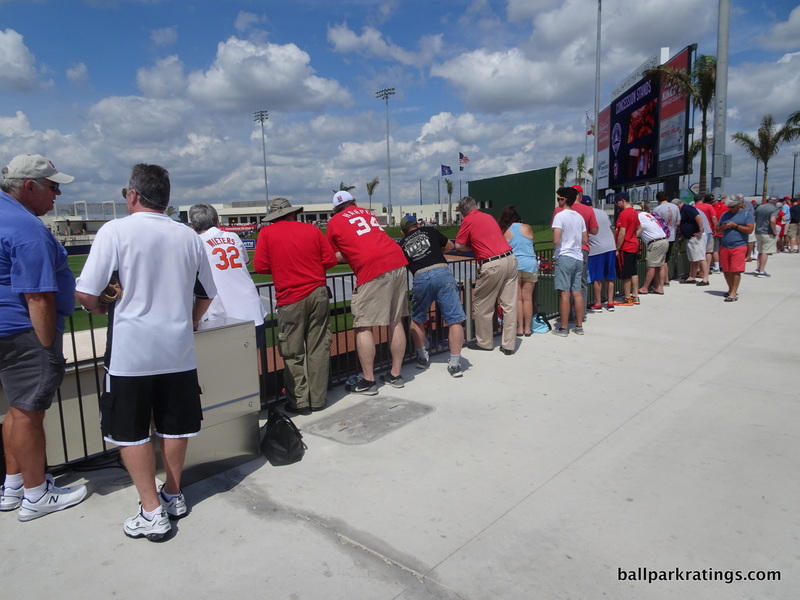 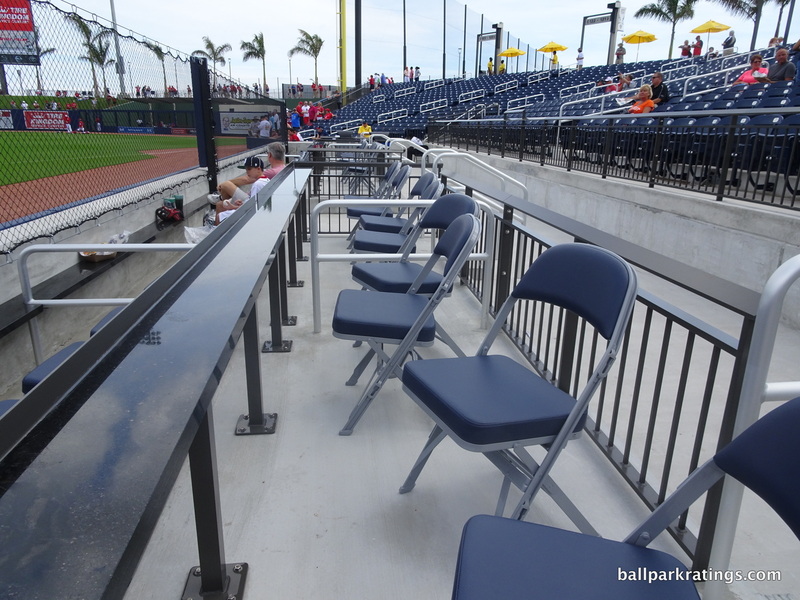 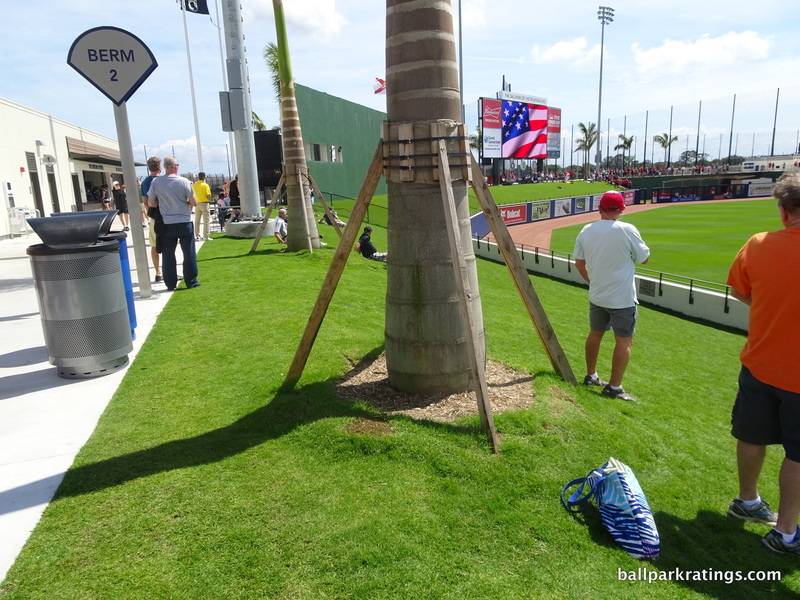 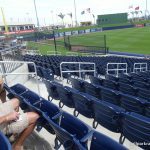 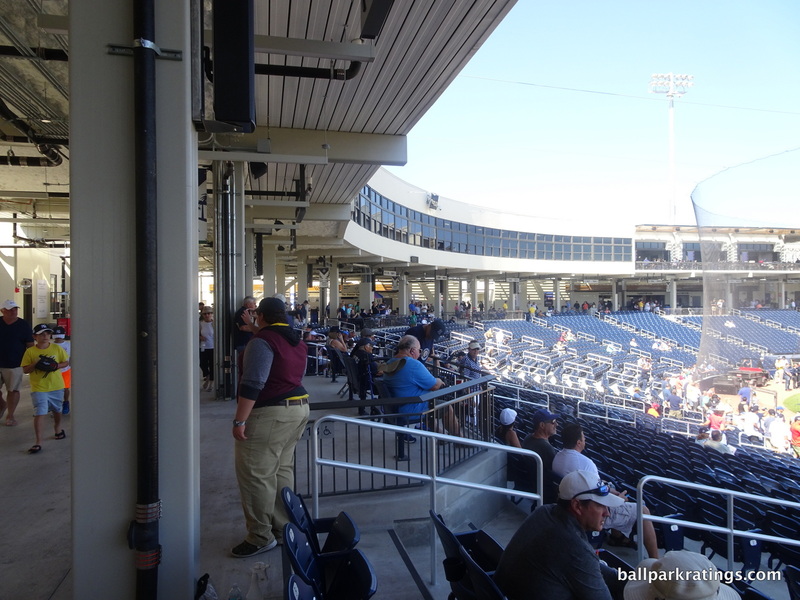 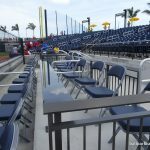 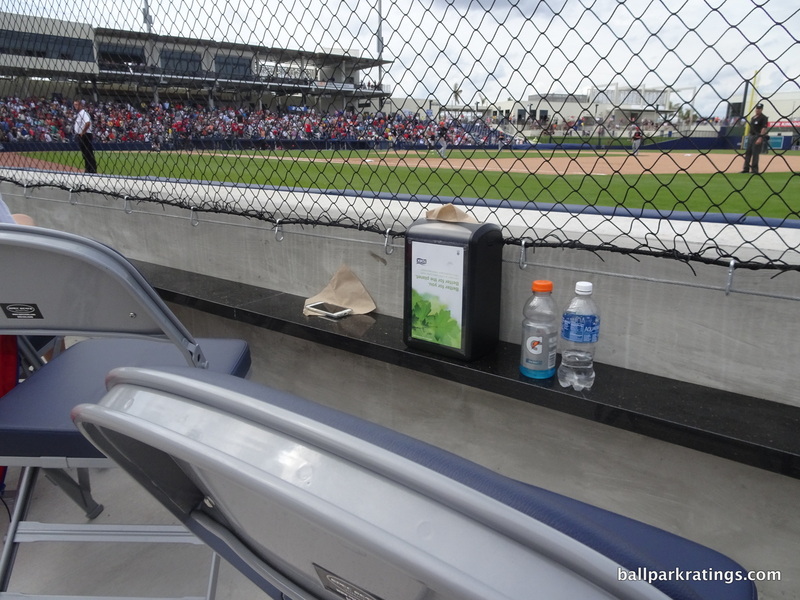 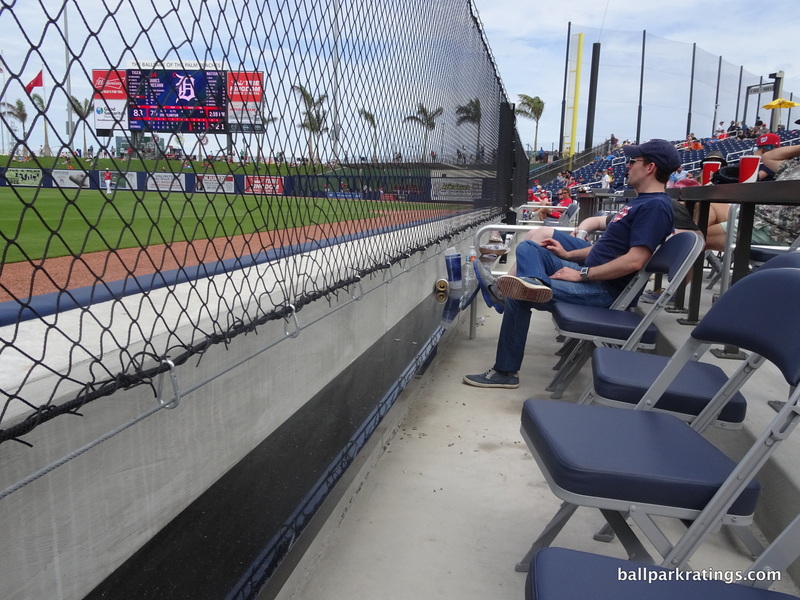 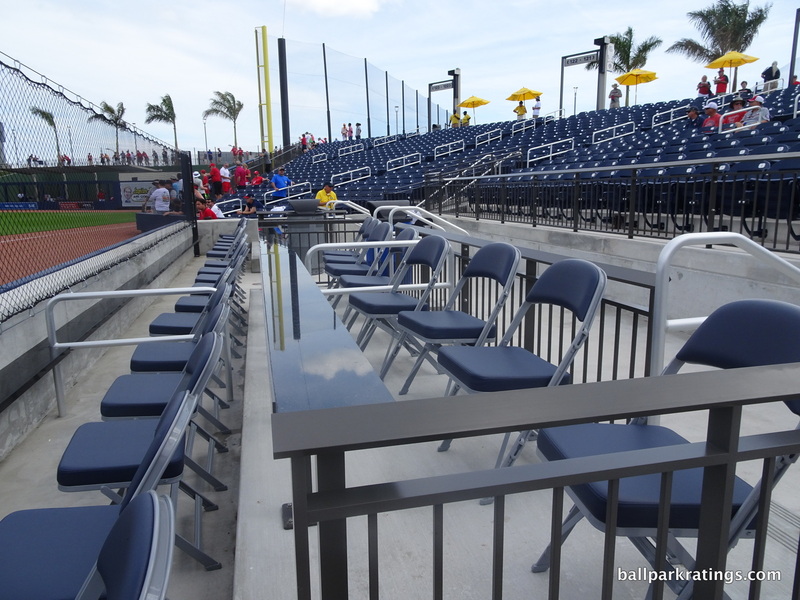 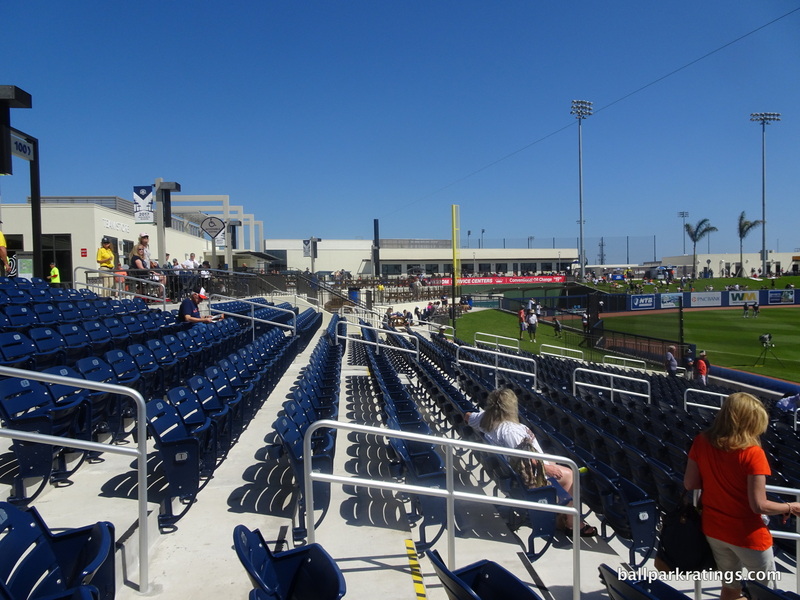 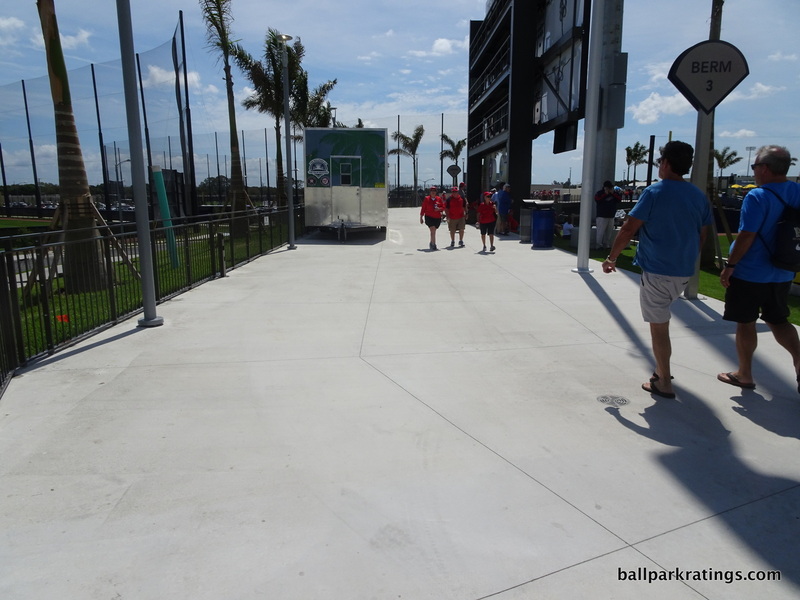 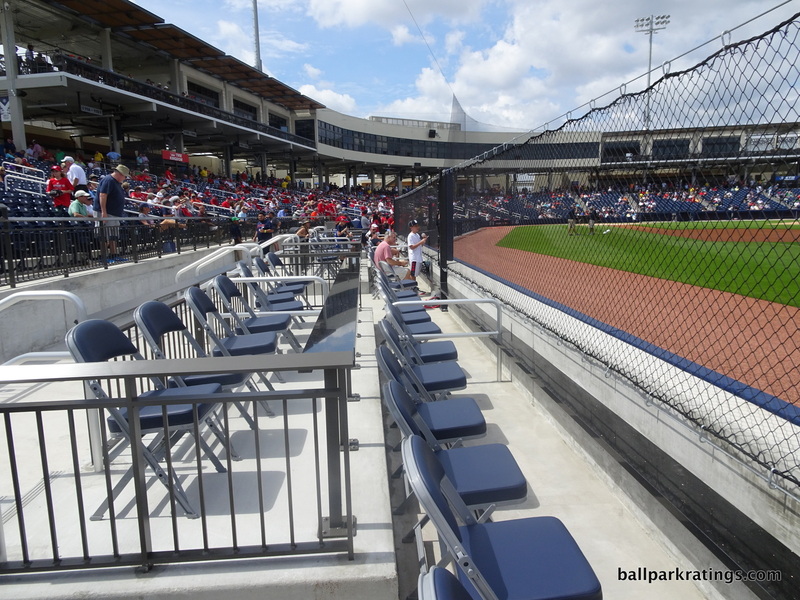 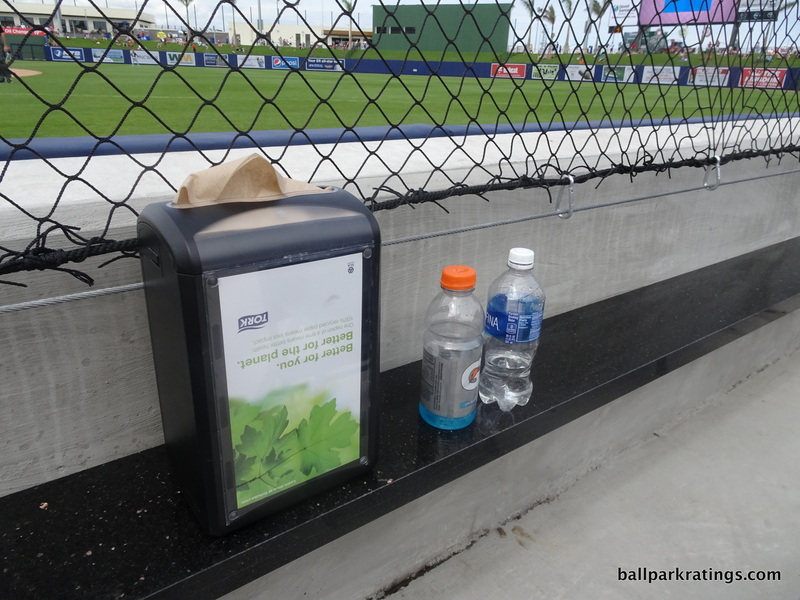 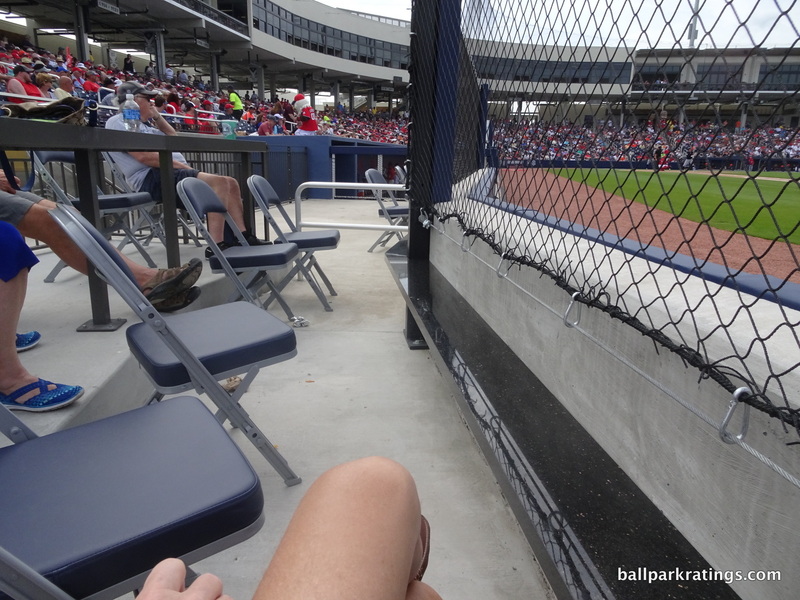 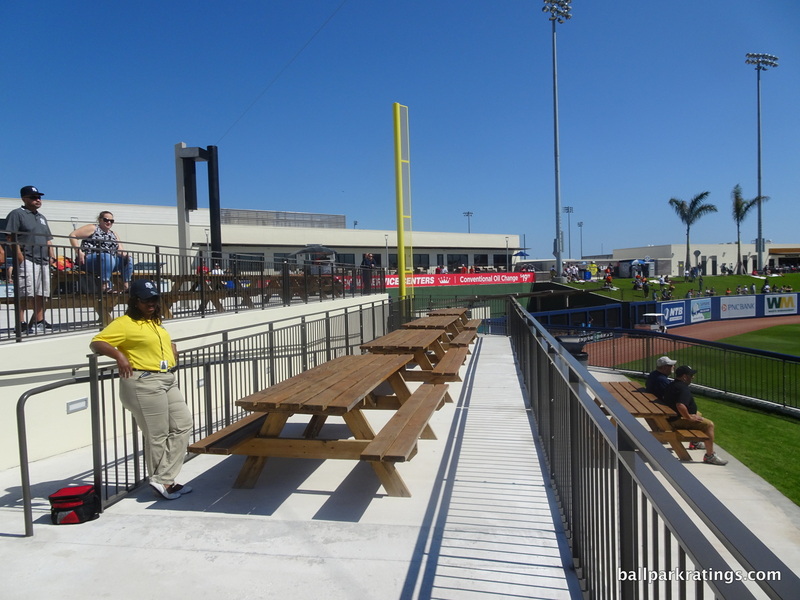 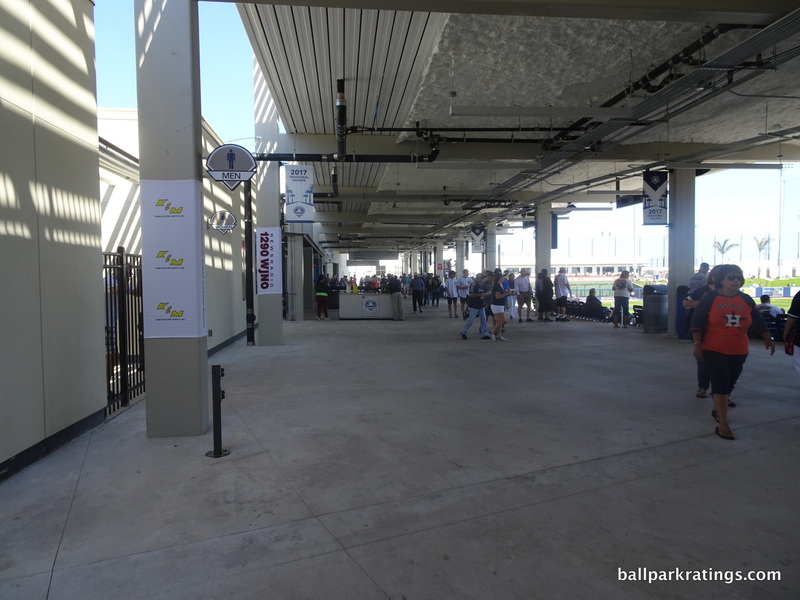 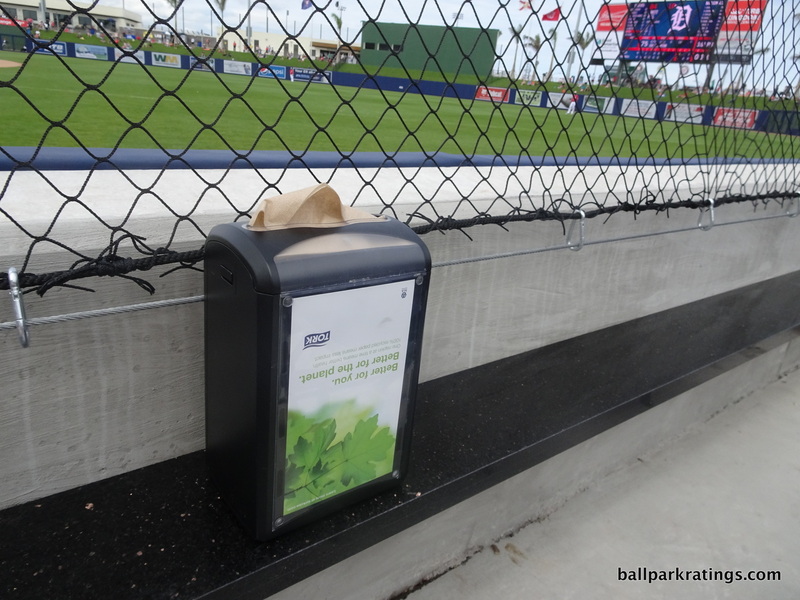 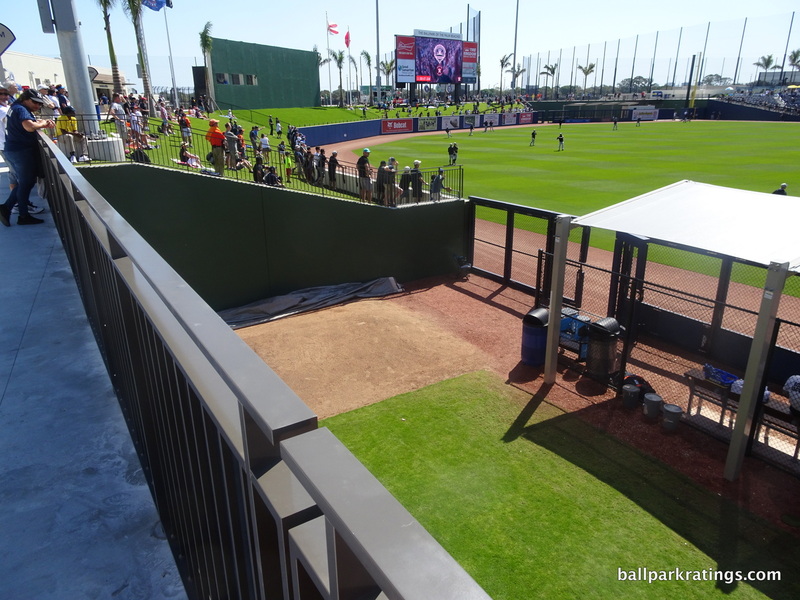 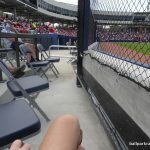 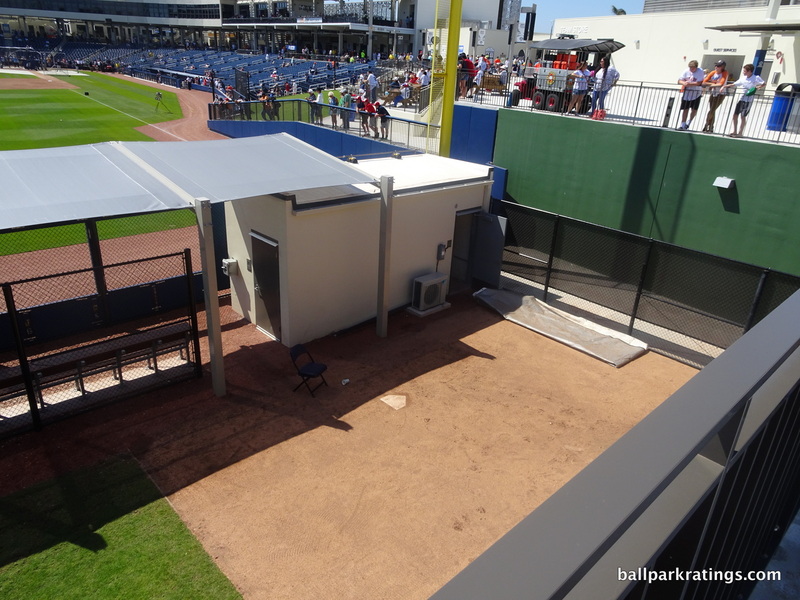 The clearly delineated “Field Boxes” in the first two rows along the first base line are a first in spring training and a clever use of space that might have existed anyway for handicapped seating. 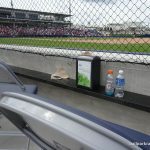 The boxes consist of moveable, padded folding chairs with drink rails. 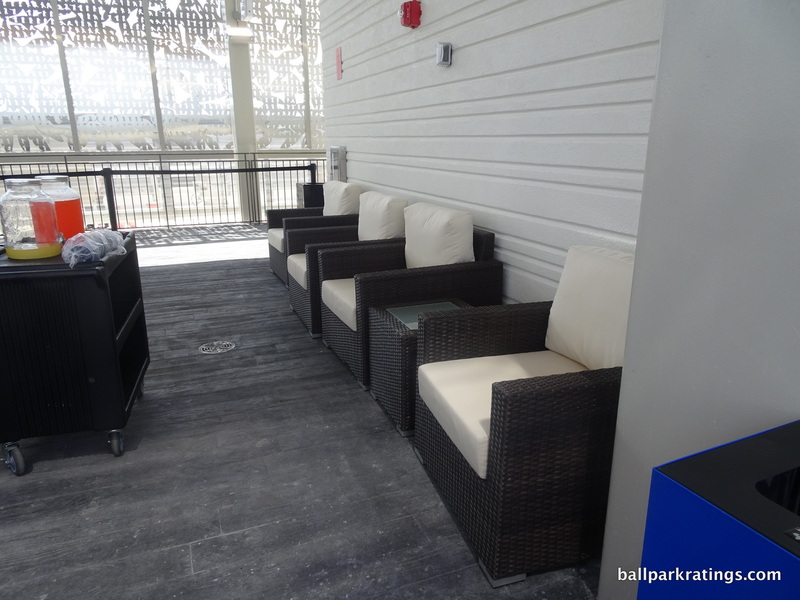 Paired with in-seat service, it’s a spacious and comfortable seating arrangement. 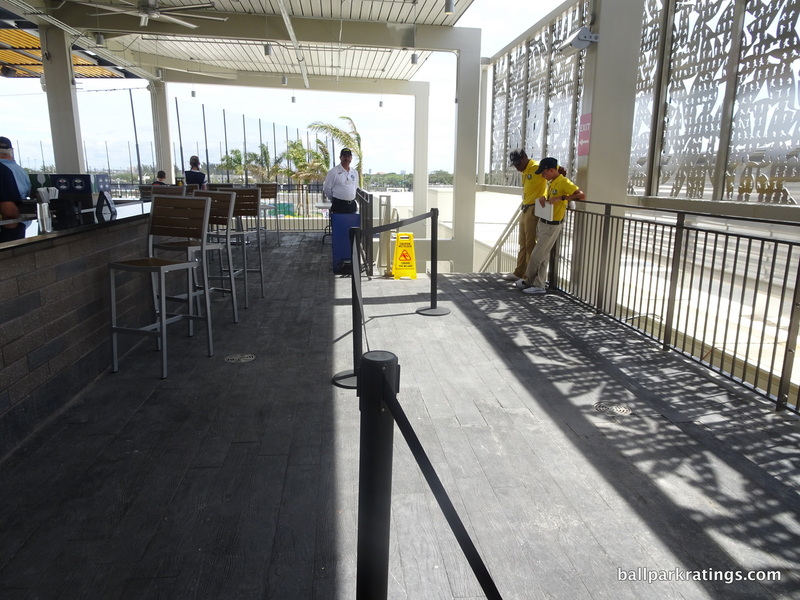 Finally, BPB lacks a kids’ area. 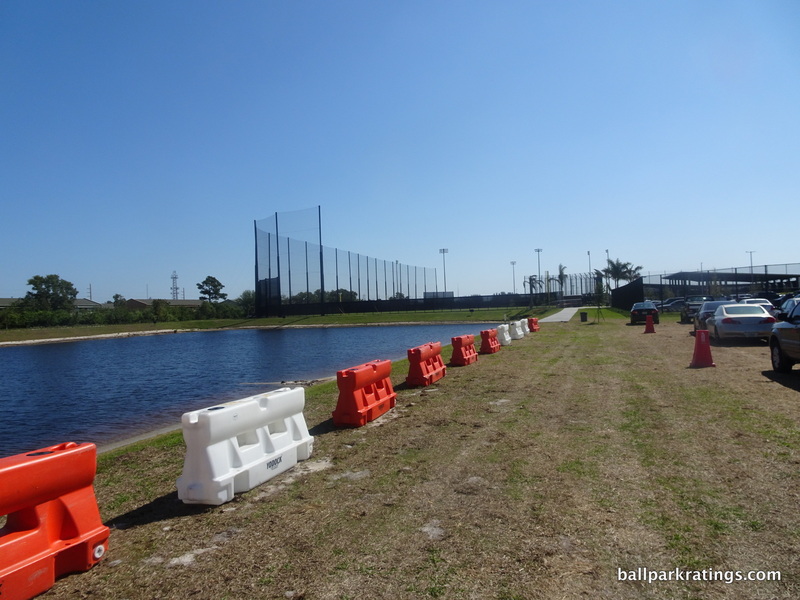 Obviously minor, but unusual and again unacceptable for a new park. 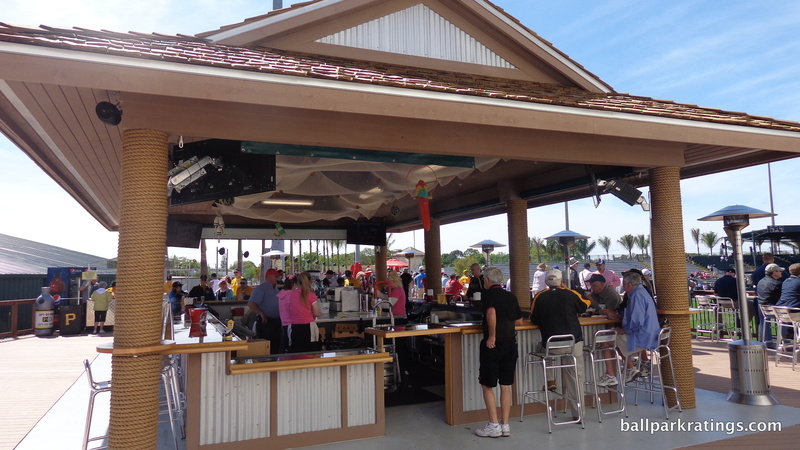 In sum, BPB is almost exceeding functional, but wholly uninspiring and completely forgettable. 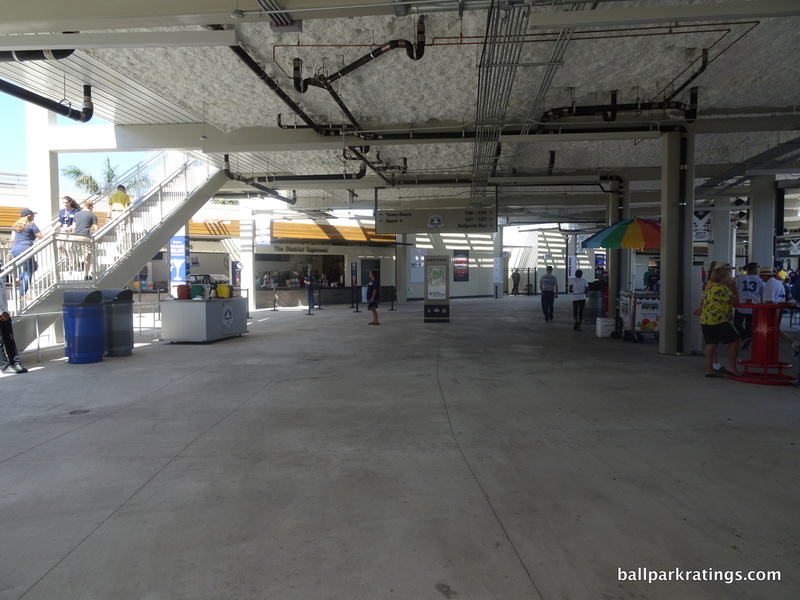 I hear a lot about rushed construction factoring into the relatively underwhelming experience, but that doesn’t explain the lack of aesthetic vision or subpar amenities that ultimately define a park that should have been much better from the fans’ perspective.